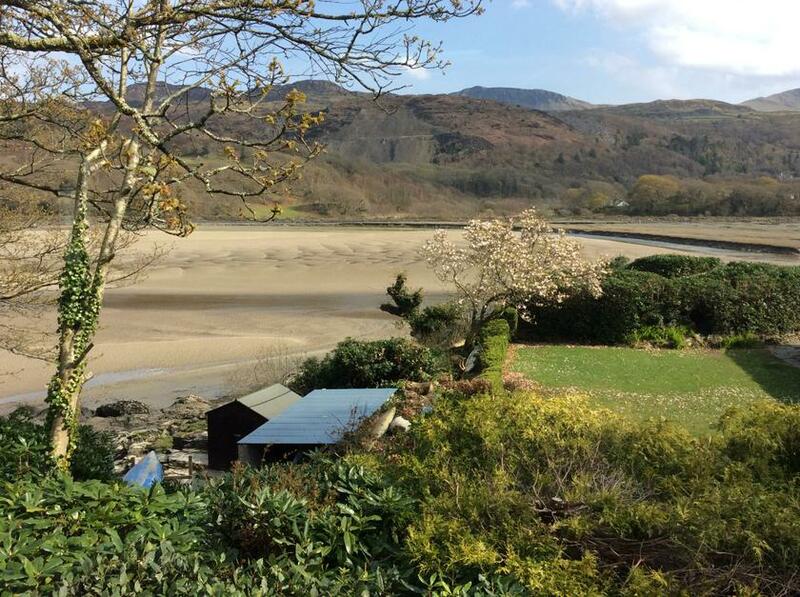 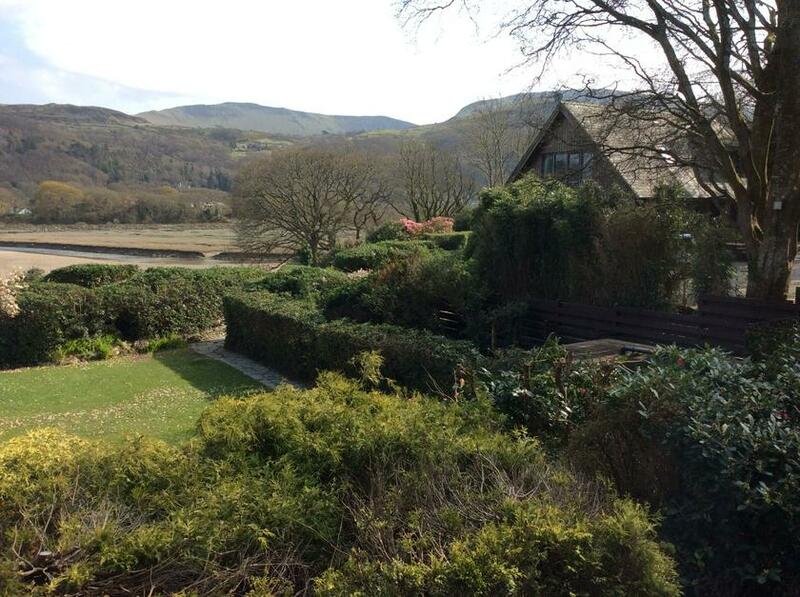 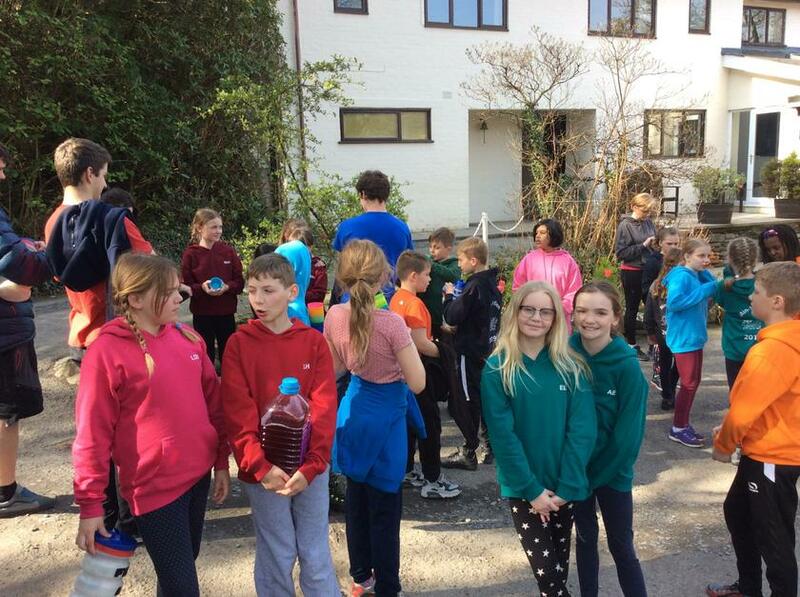 After what appeared to be a short journey, we all arrived safely to glorious sunshine at our home for the next few days. 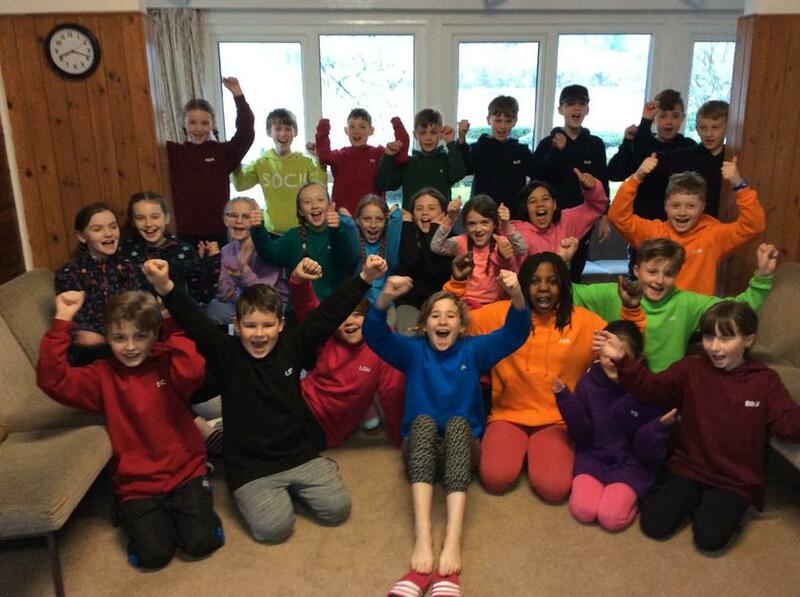 We were all excited about our rooms and who we would be sharing with. 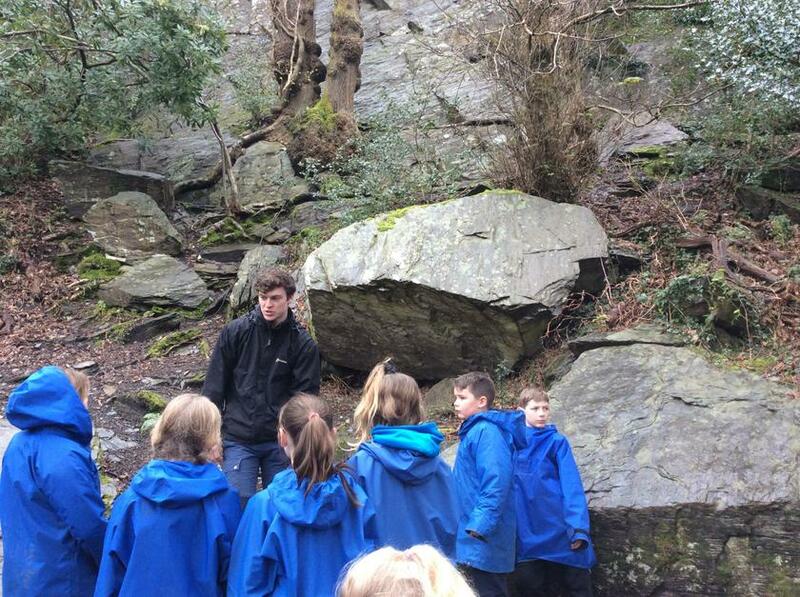 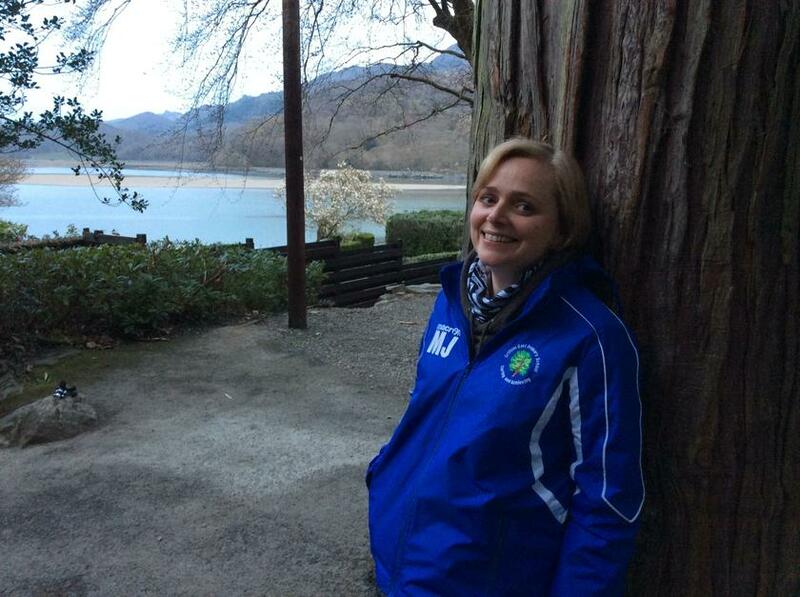 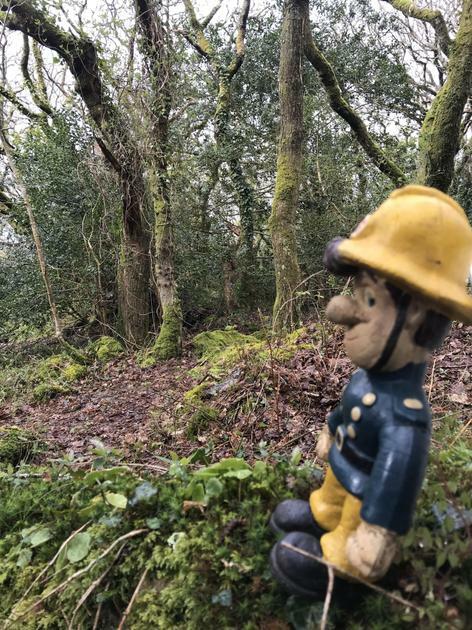 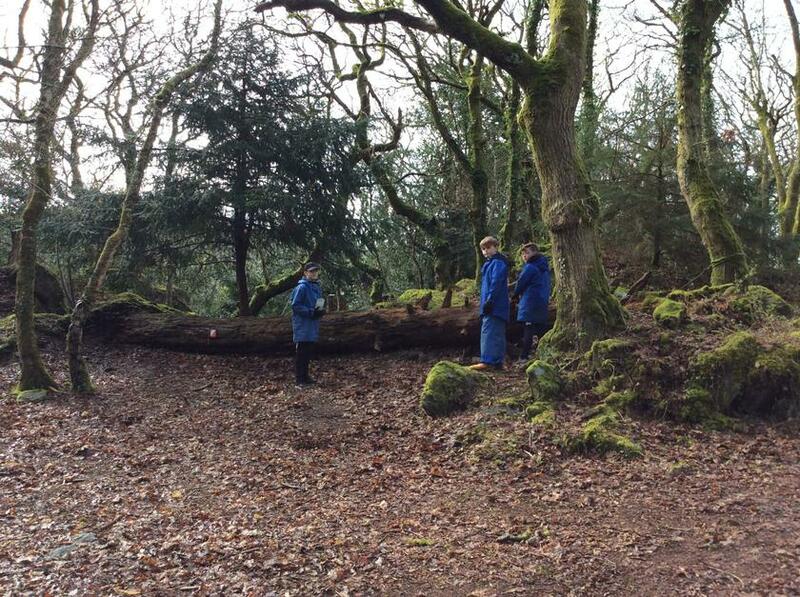 Out into the grounds we began with a safety talk and tour of these beautiful surroundings. 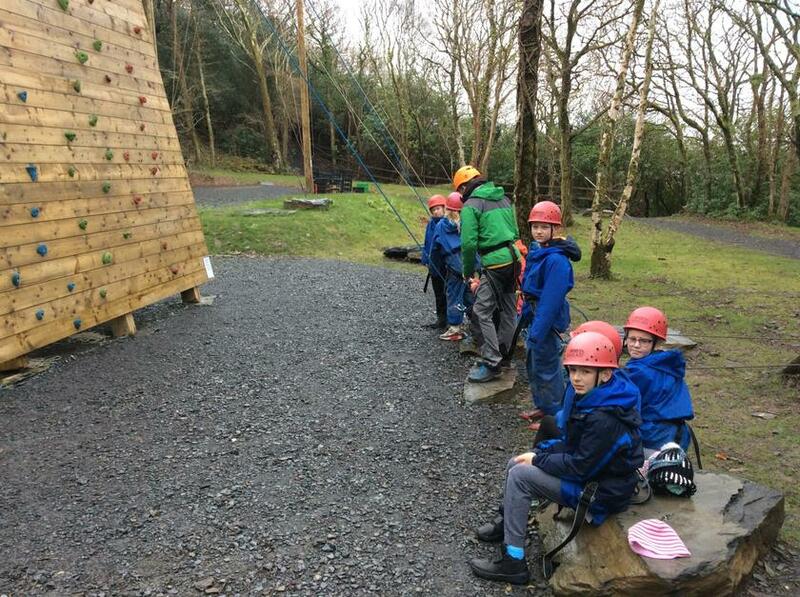 Once back in our rooms we were soon off on our first activity. 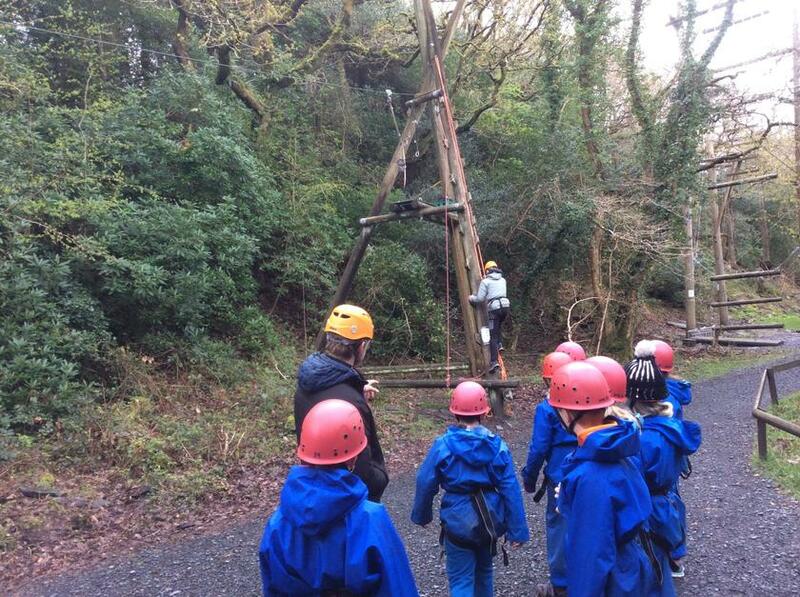 Dependent upon which group we were in decided which part of the carousel of activities we would be doing first. 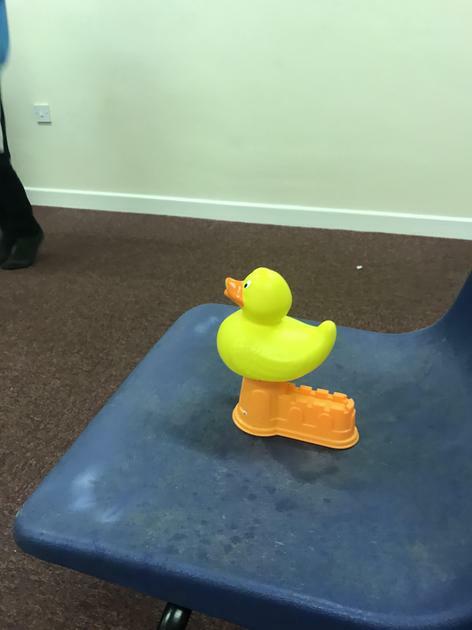 Our evening event was soon upon us. 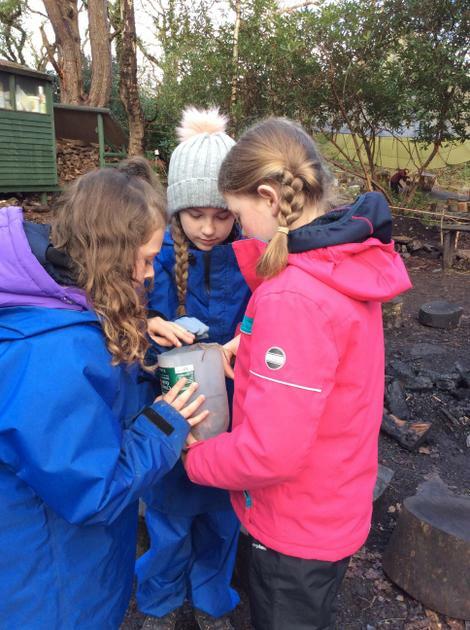 Using torches we played a fun game involving buying and selling haggis and then having to return to base without being caught by our teachers. 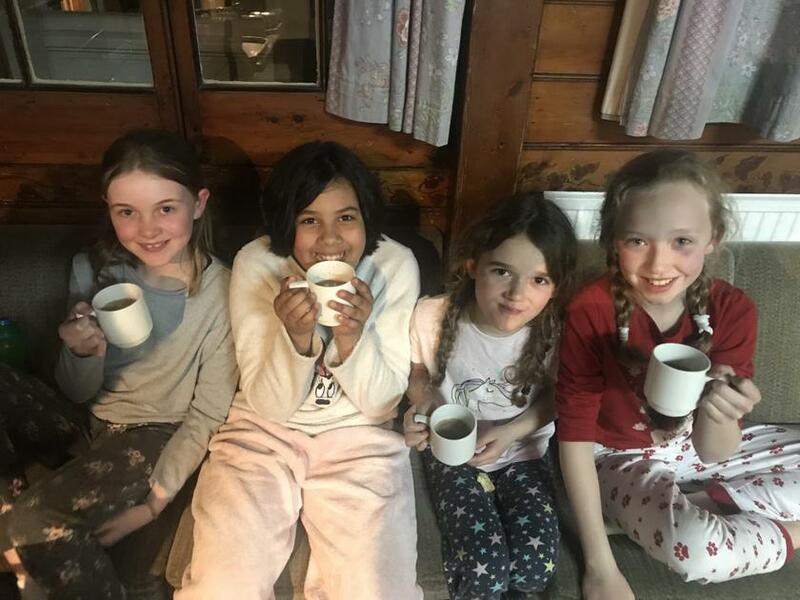 Light soon faded and we made our way inside for the closing epilogue and hot chocolate before settling down for bedtime. 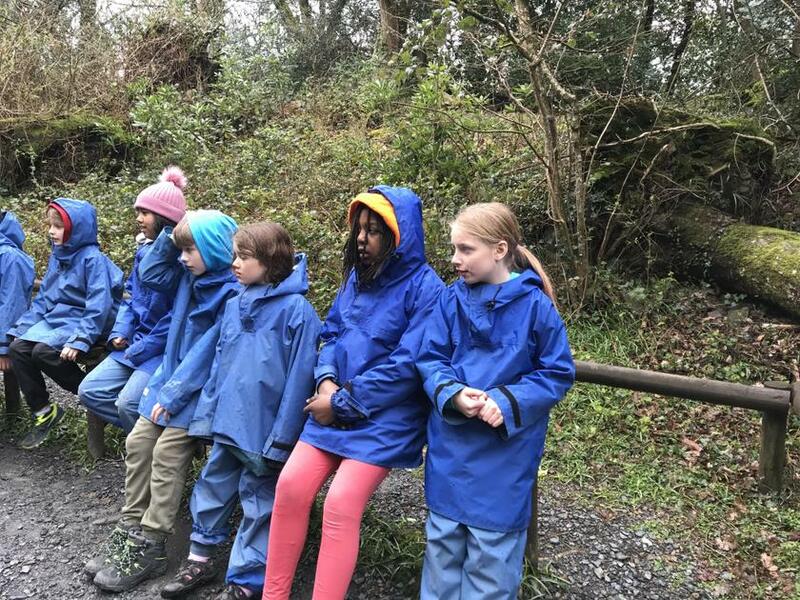 Throughout the night rain had lashed down while we all slept. 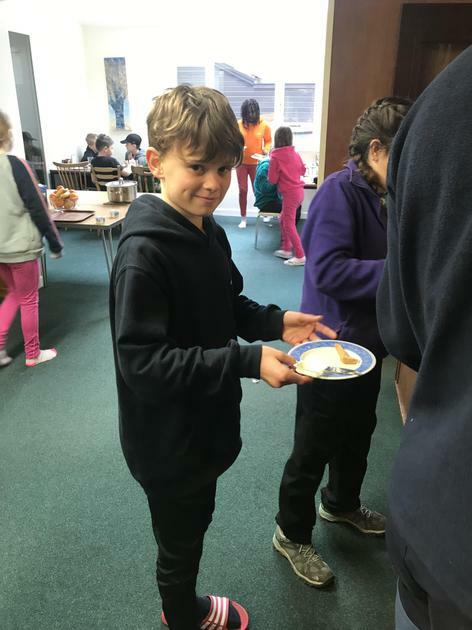 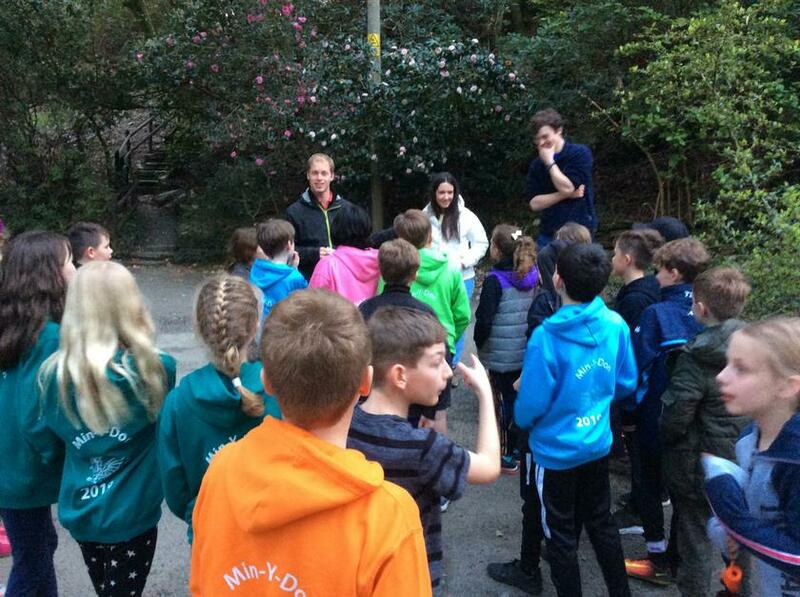 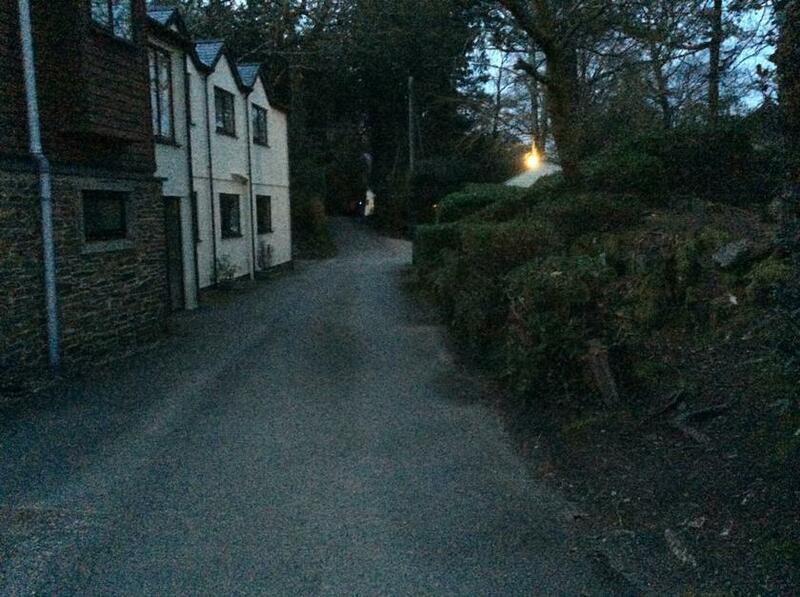 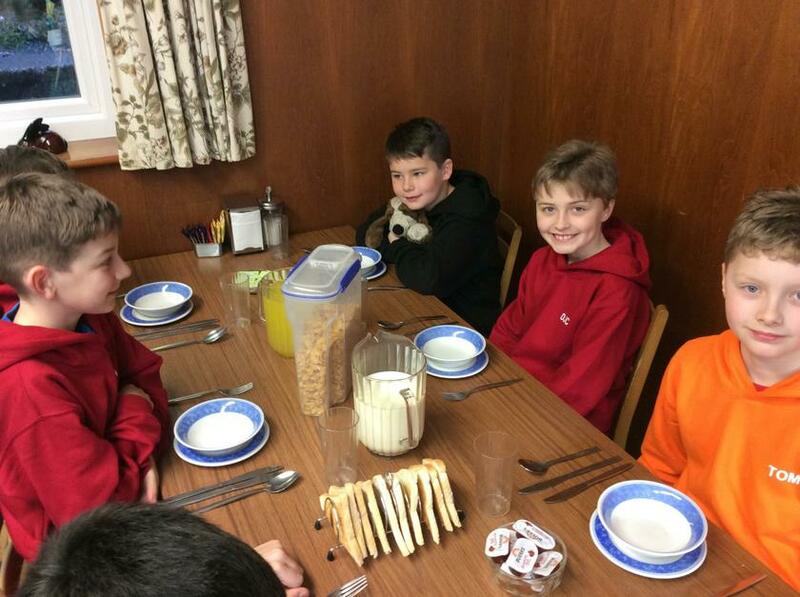 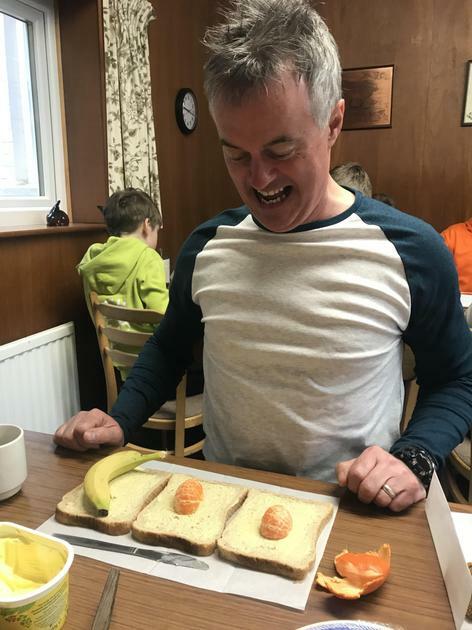 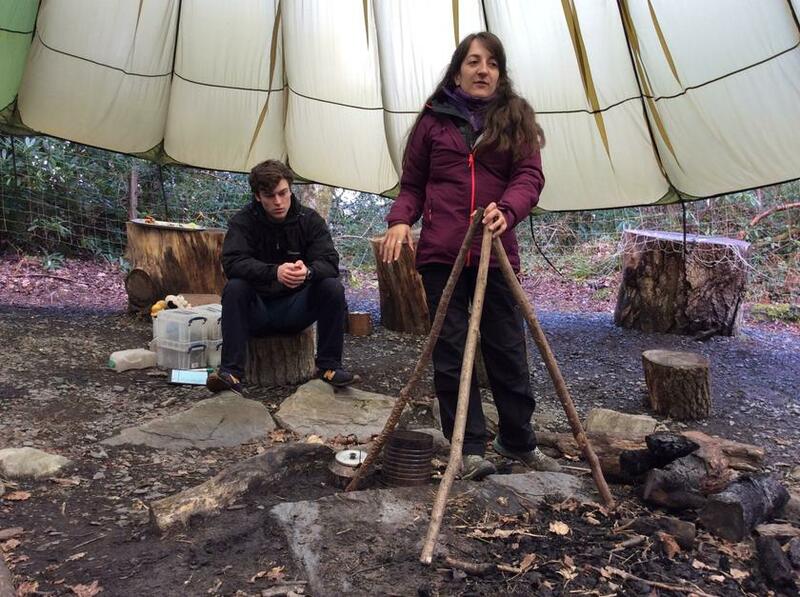 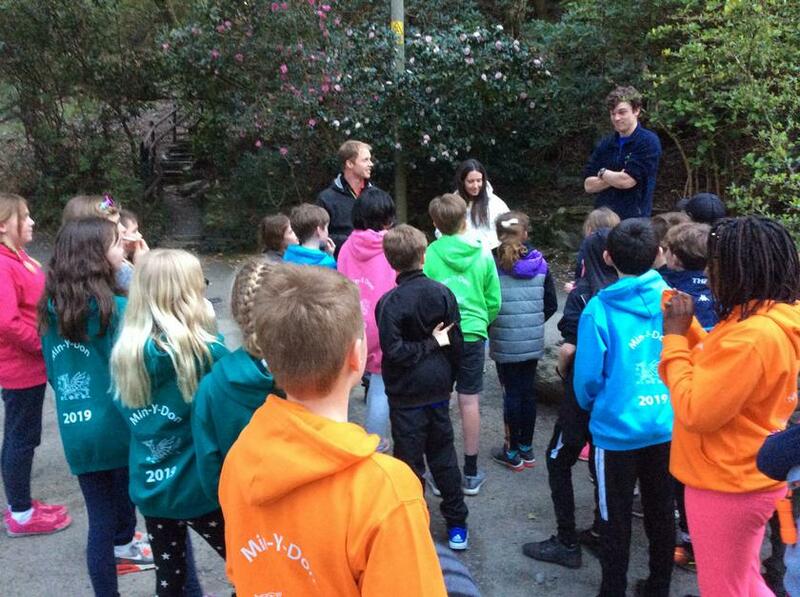 A new day of challenges awaited us once we had been greeted with cereal, fruit, toast and a delicious cooked breakfast. 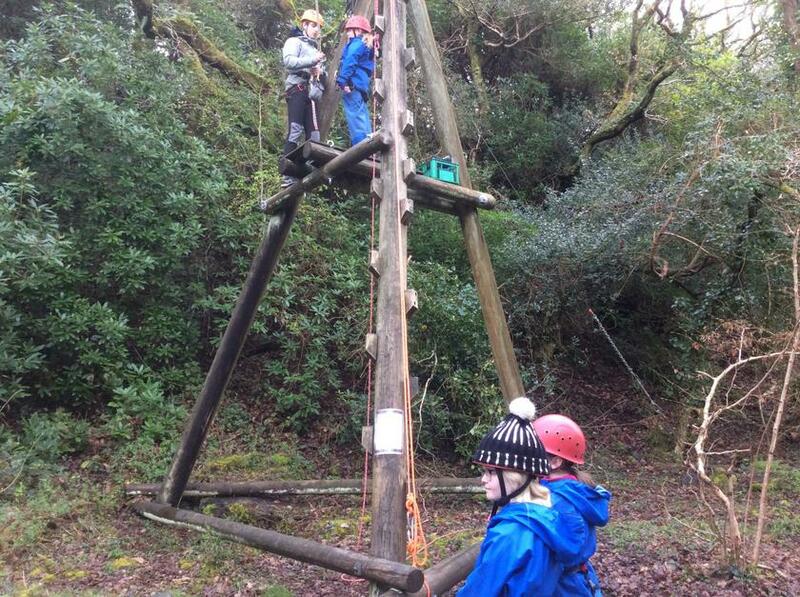 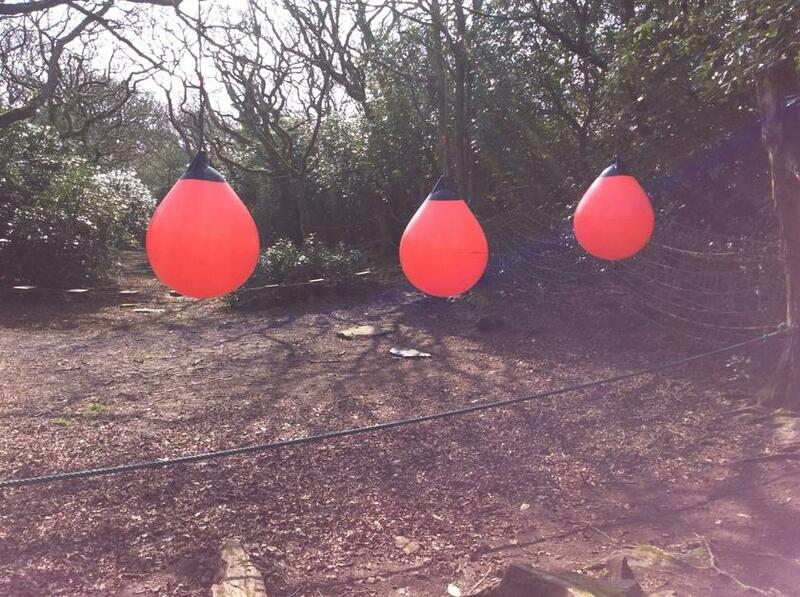 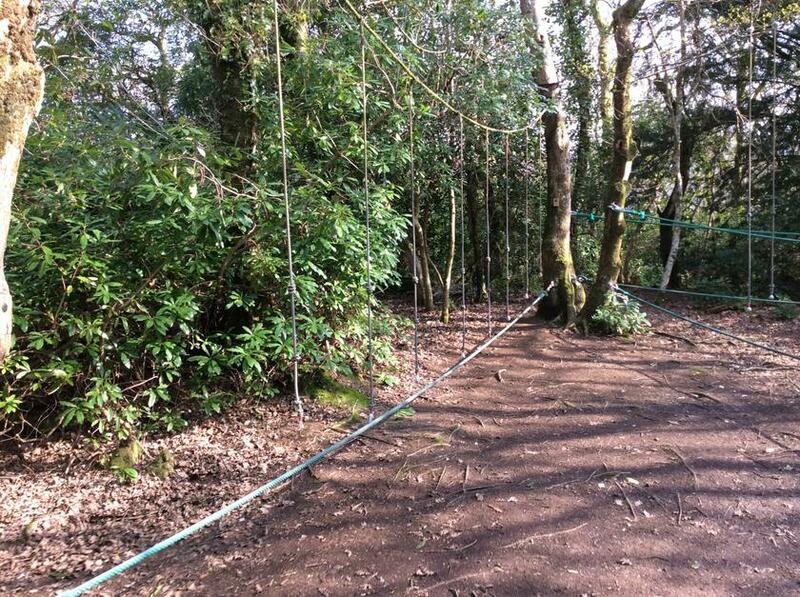 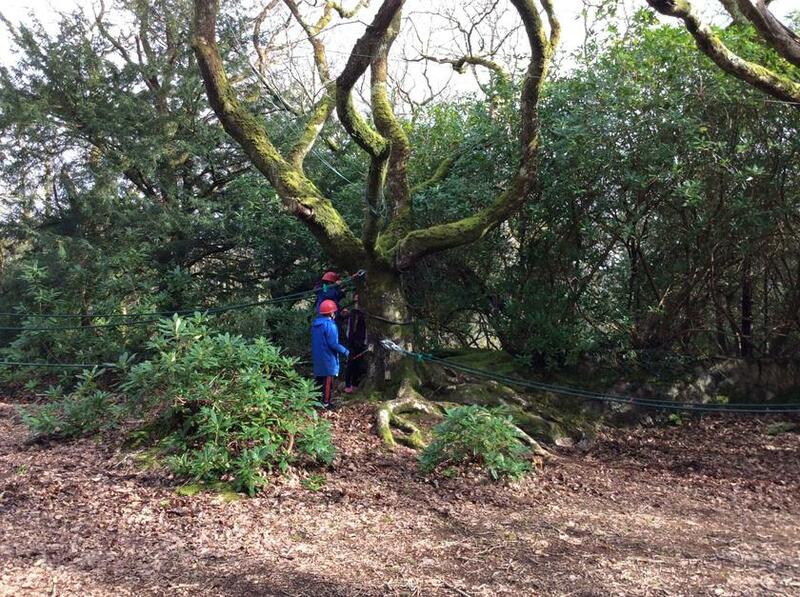 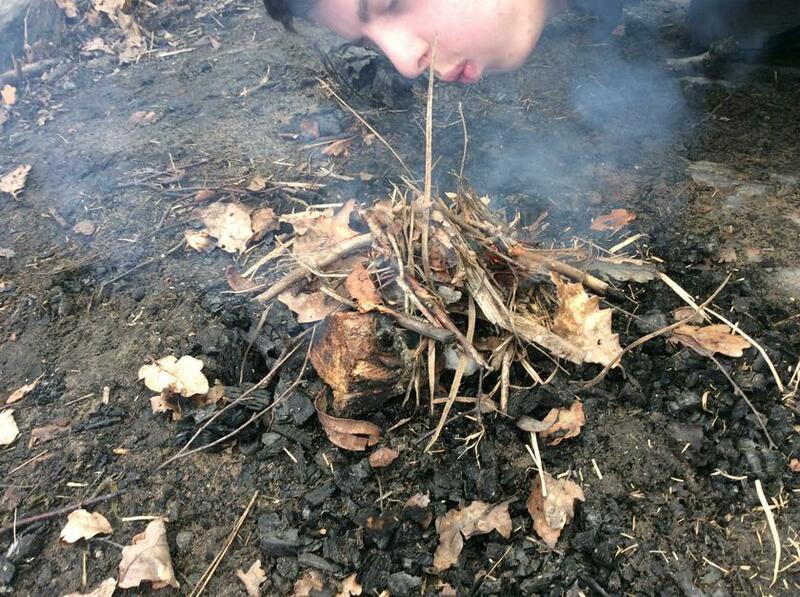 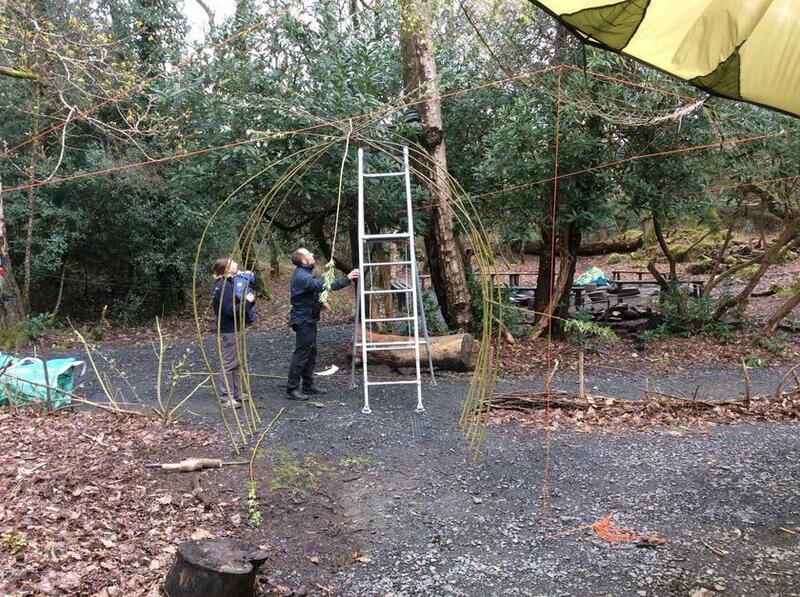 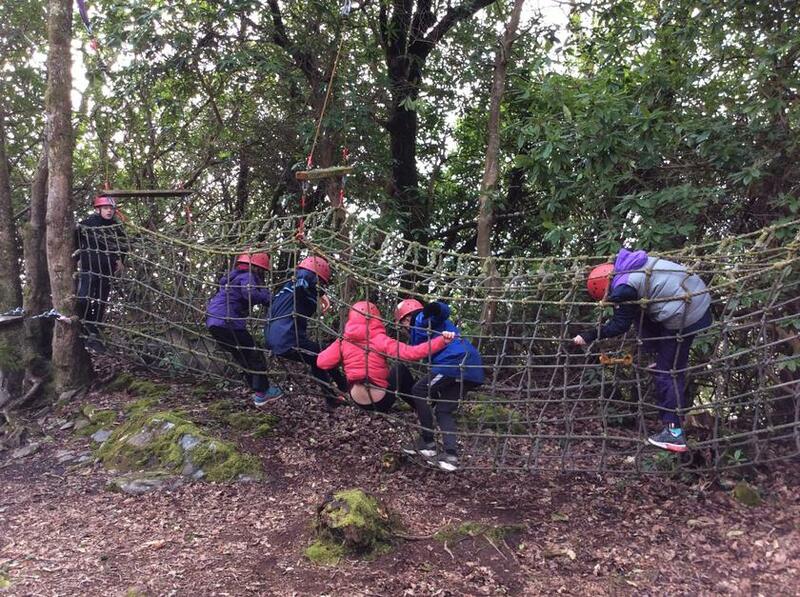 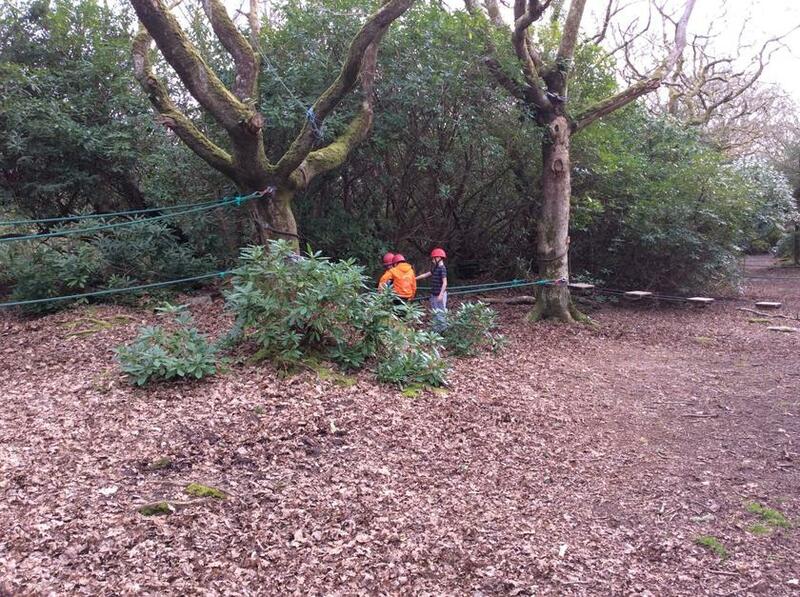 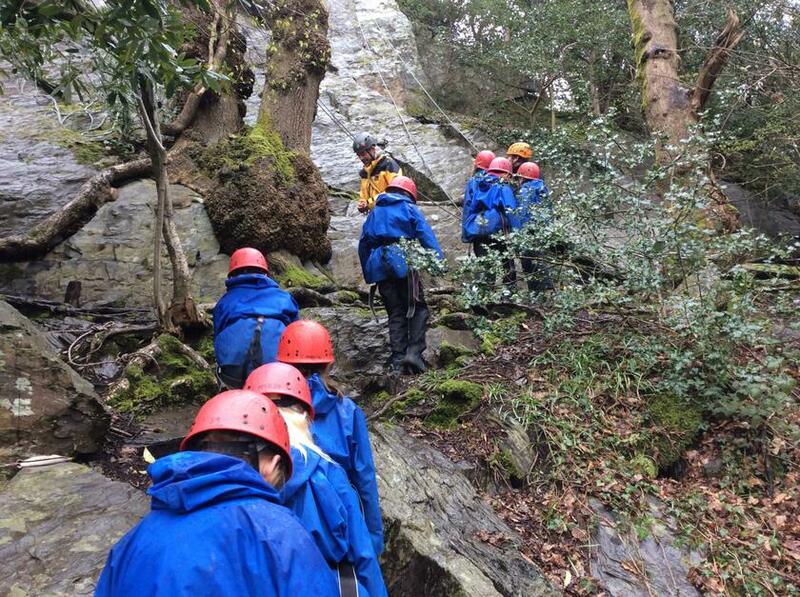 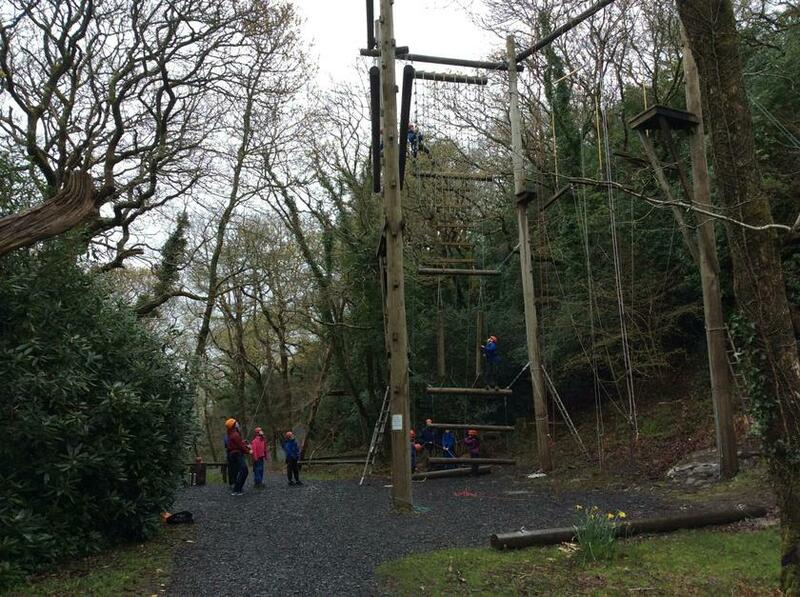 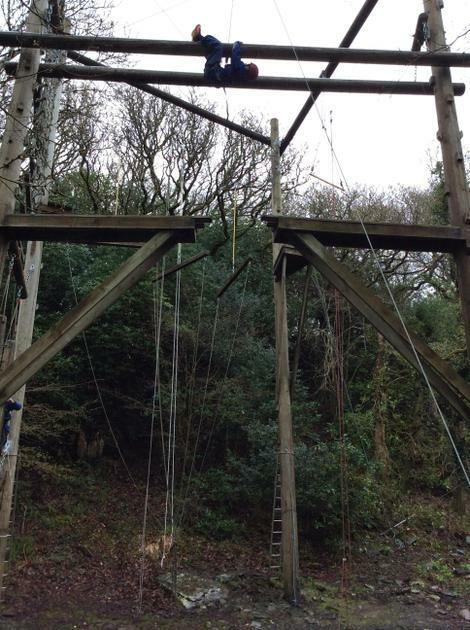 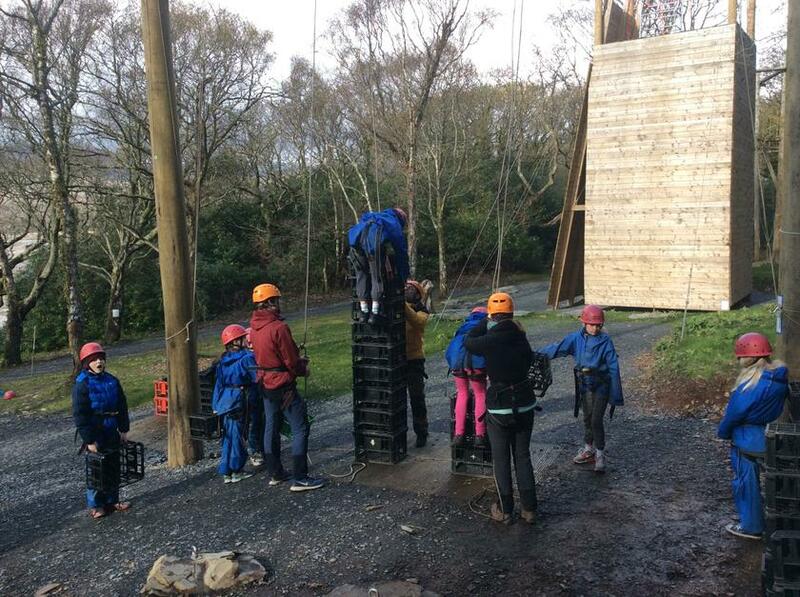 Our first activity would bring with it challenges, team work and the need to persevere. 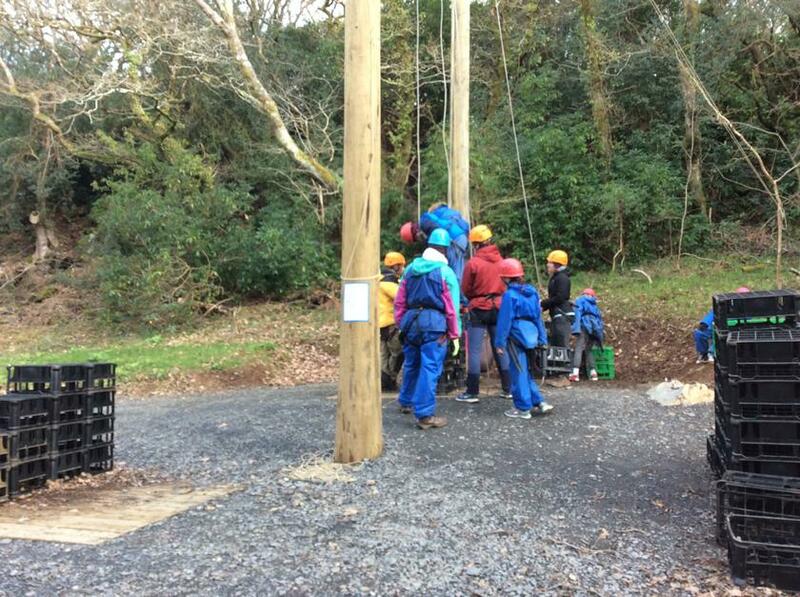 Each group has its turn on the carousel of activities. 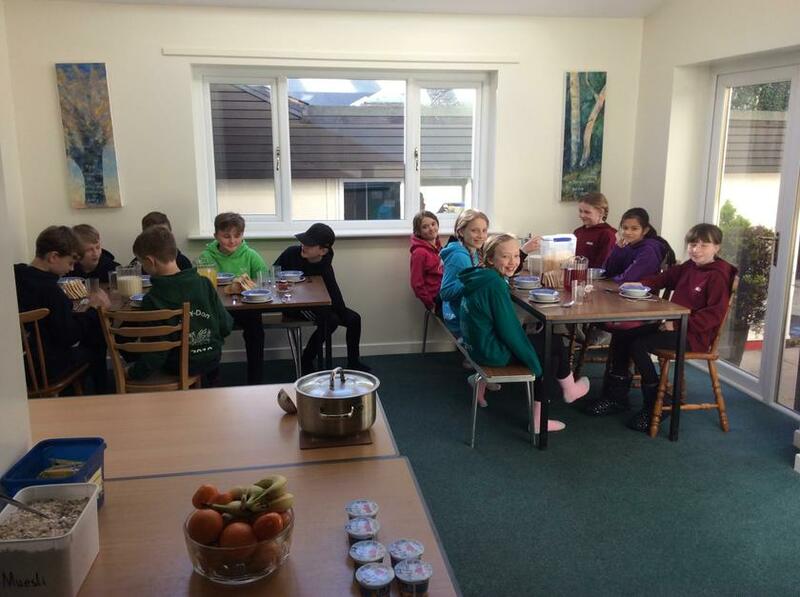 Lunchtime soon arrived and time for everyone to get together and eat the lunch they had prepared earlier whilst at breakfast. 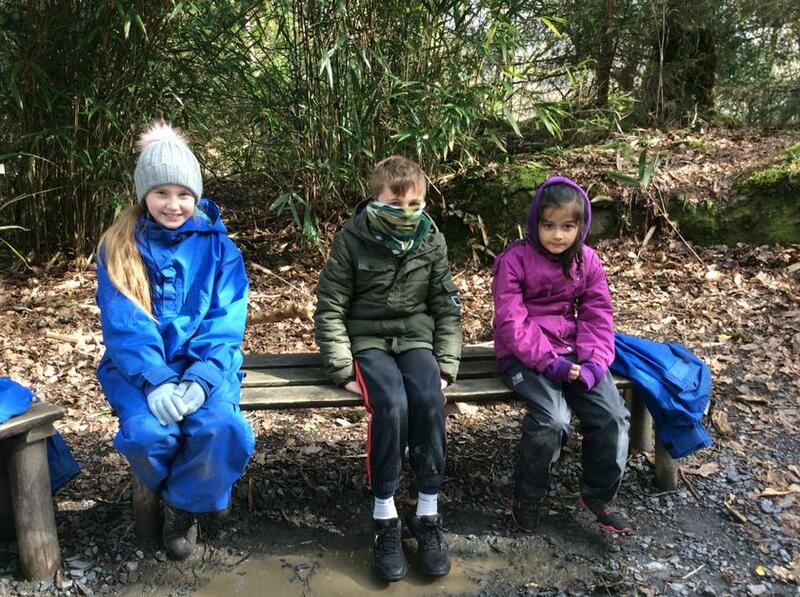 Feeling refreshed we split up in the afternoon for our activity. 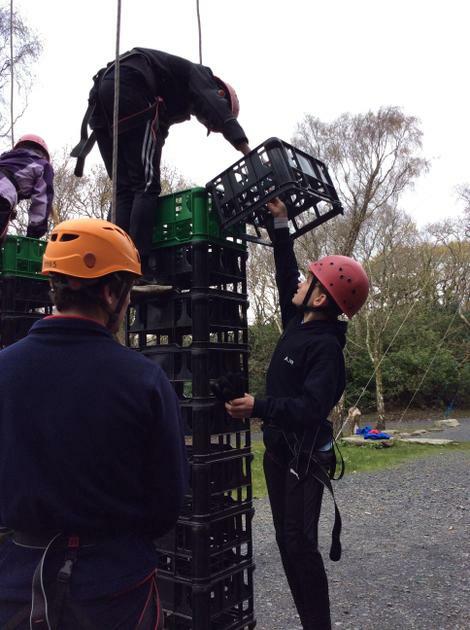 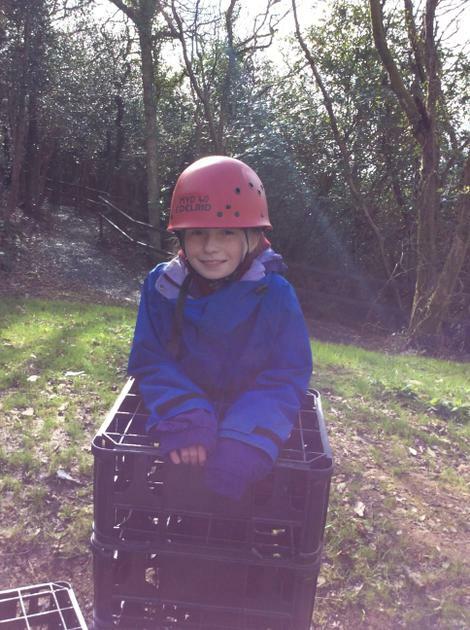 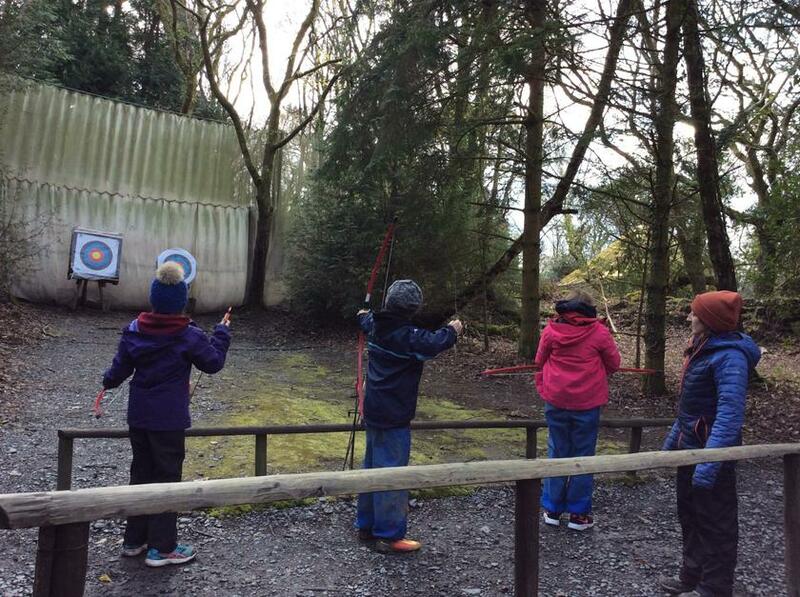 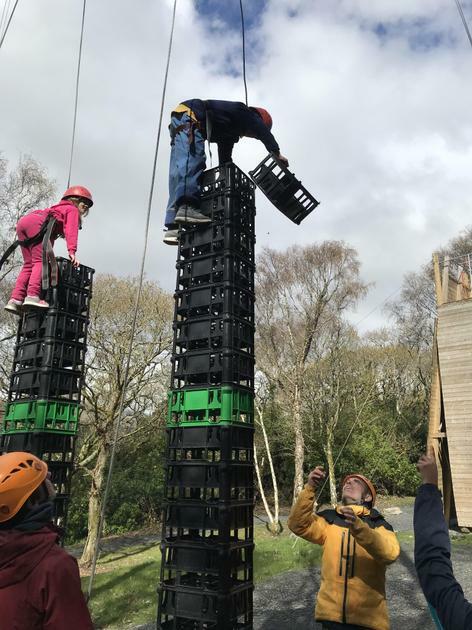 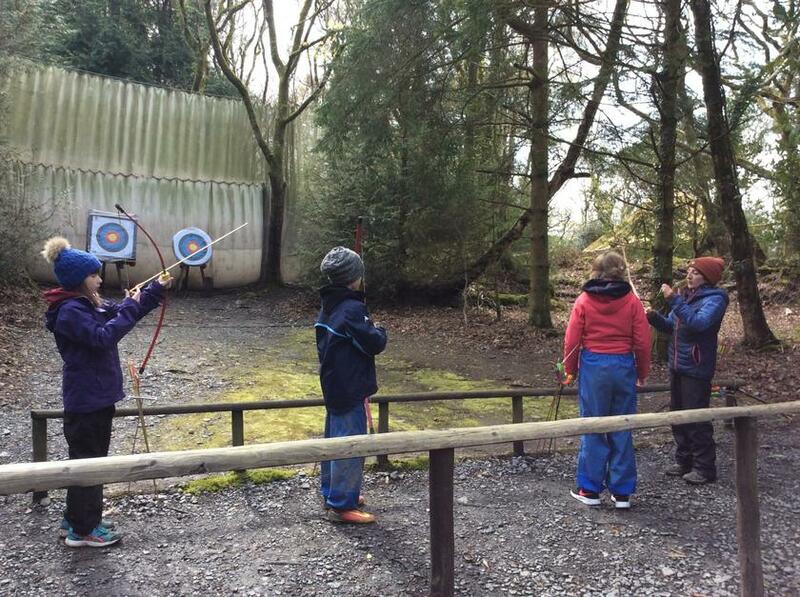 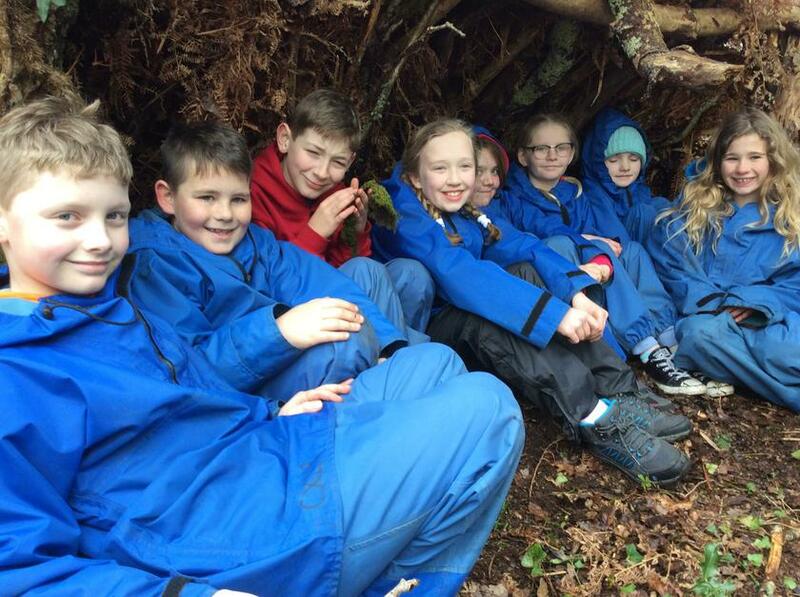 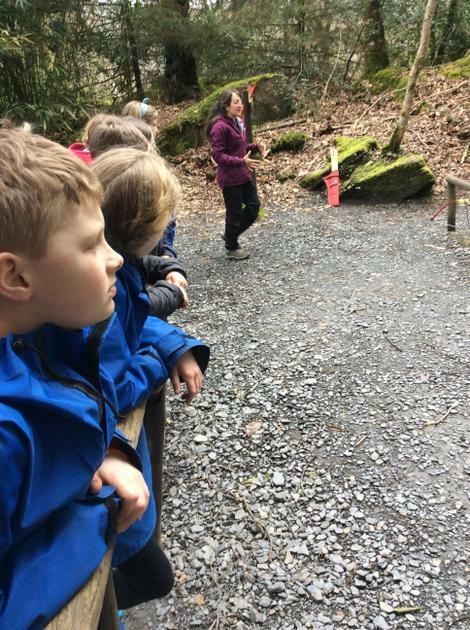 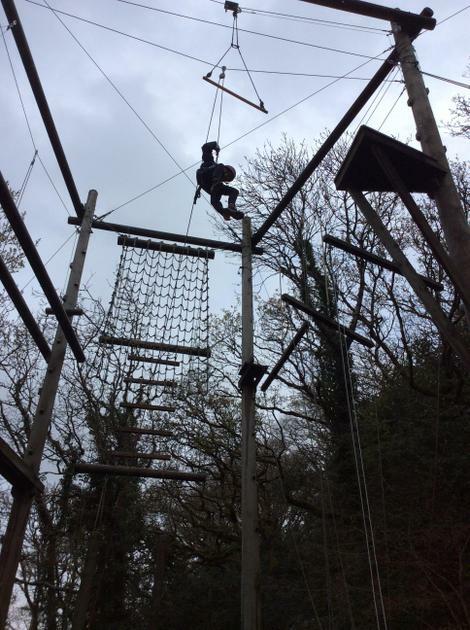 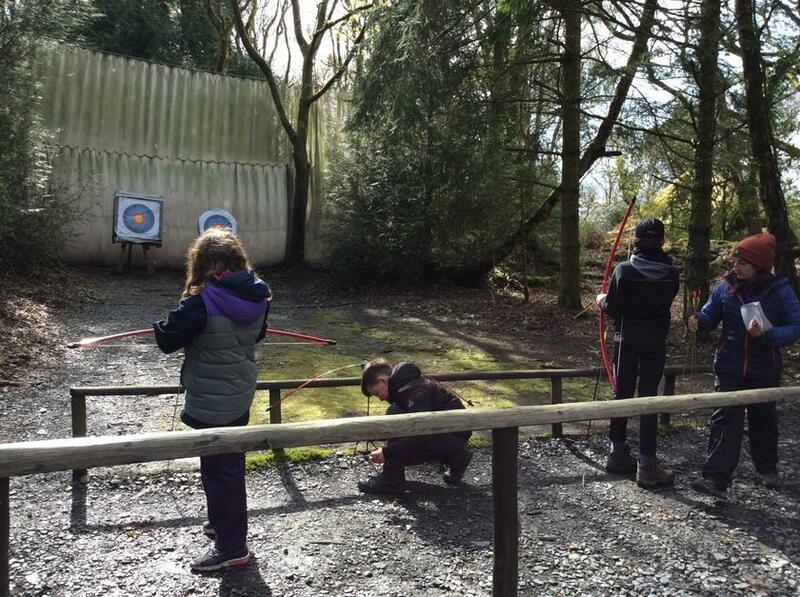 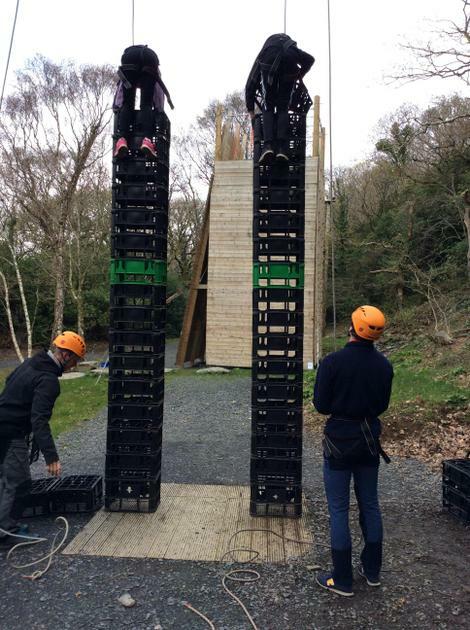 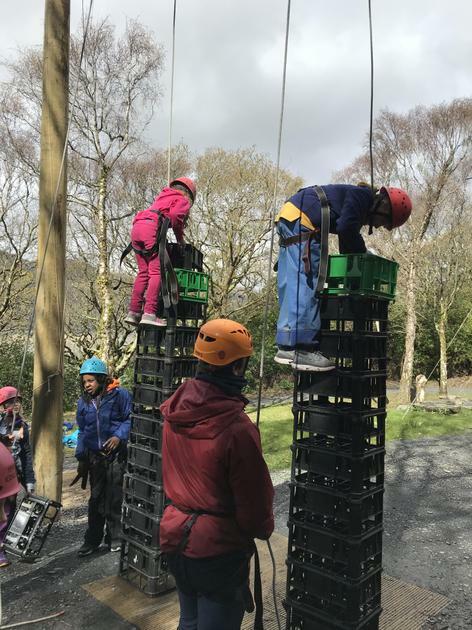 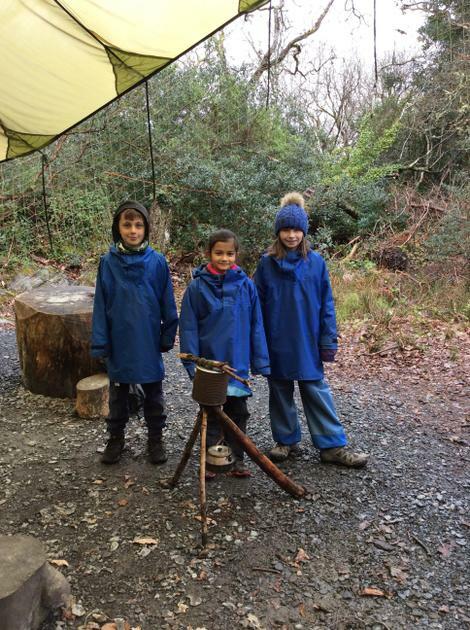 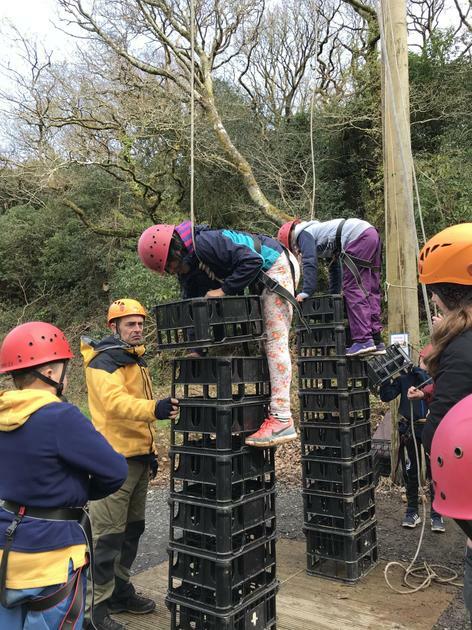 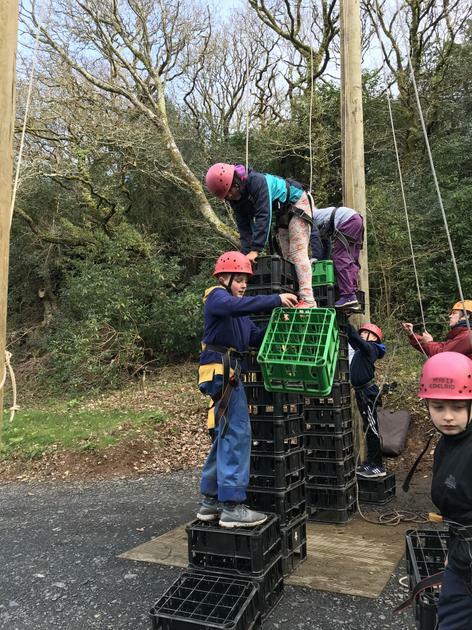 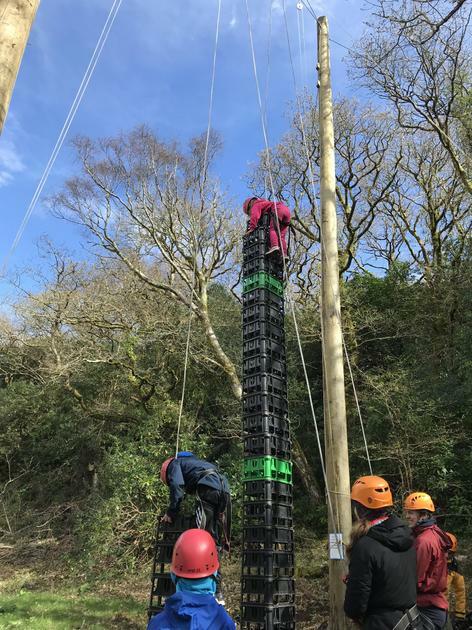 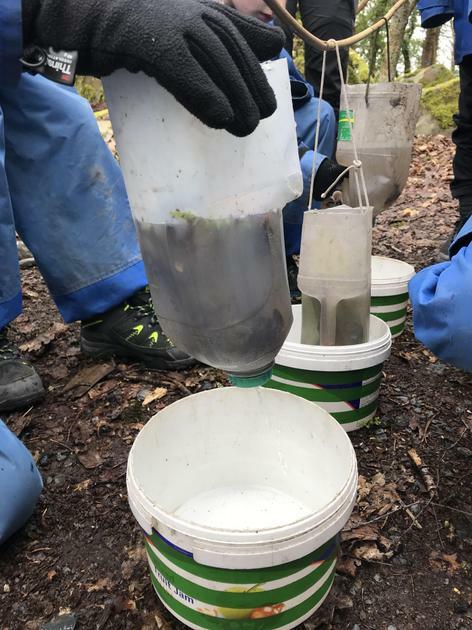 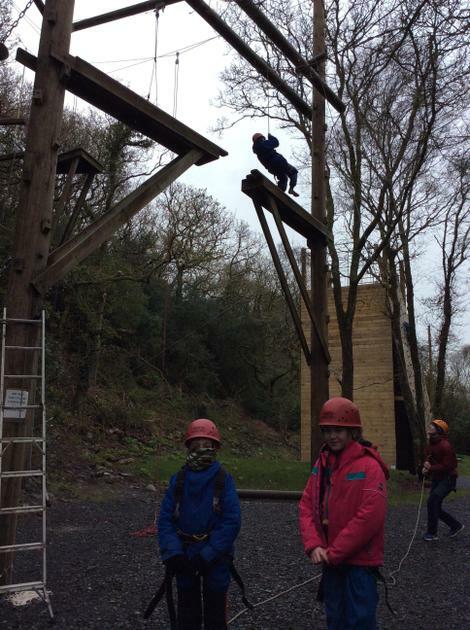 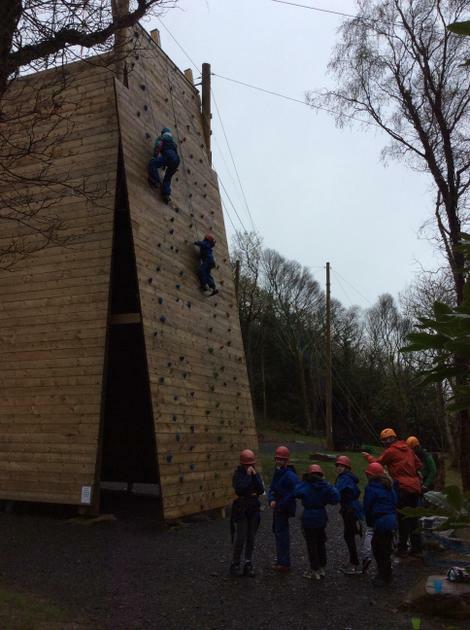 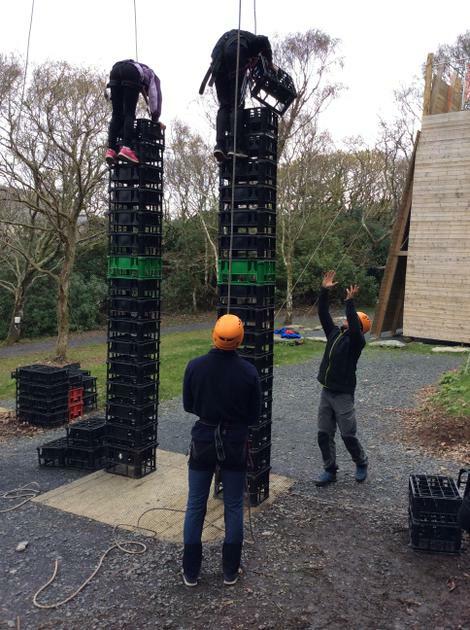 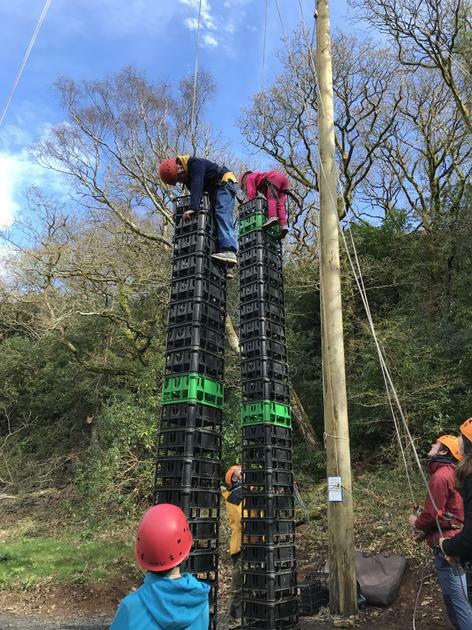 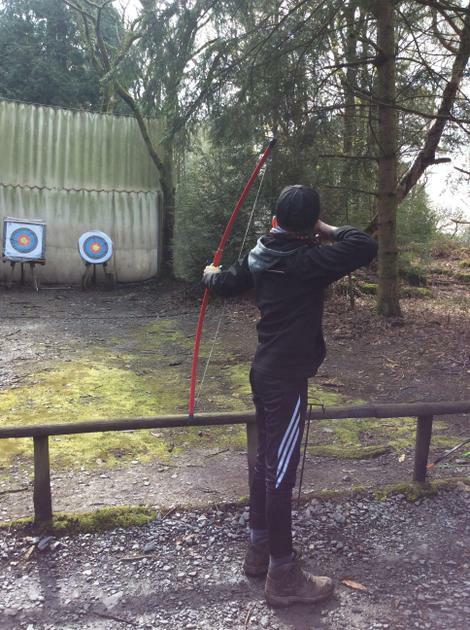 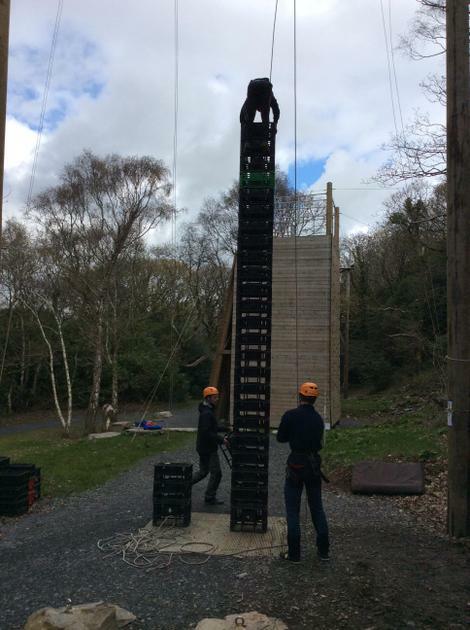 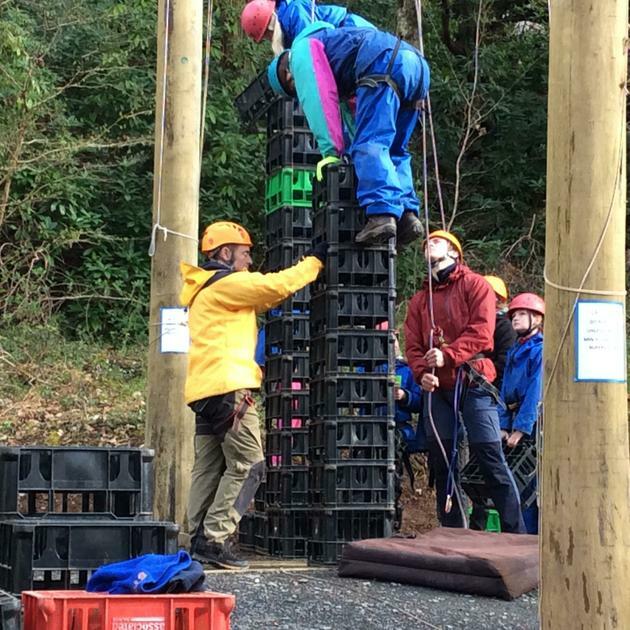 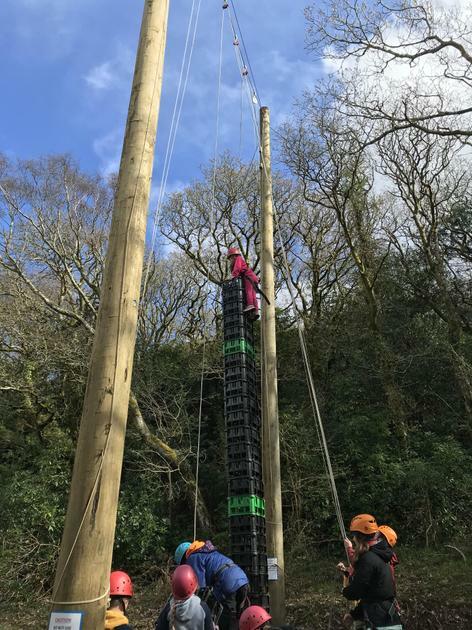 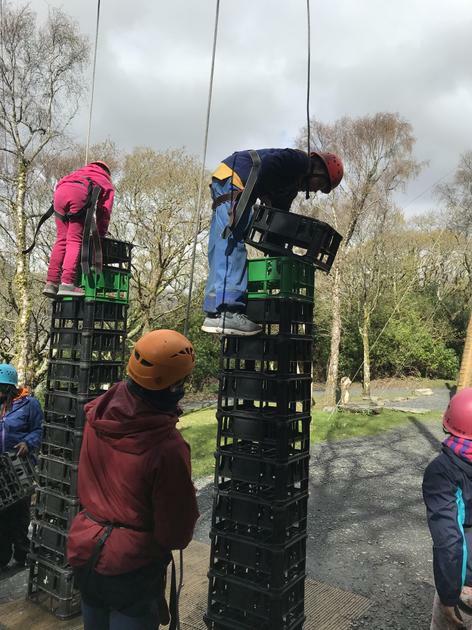 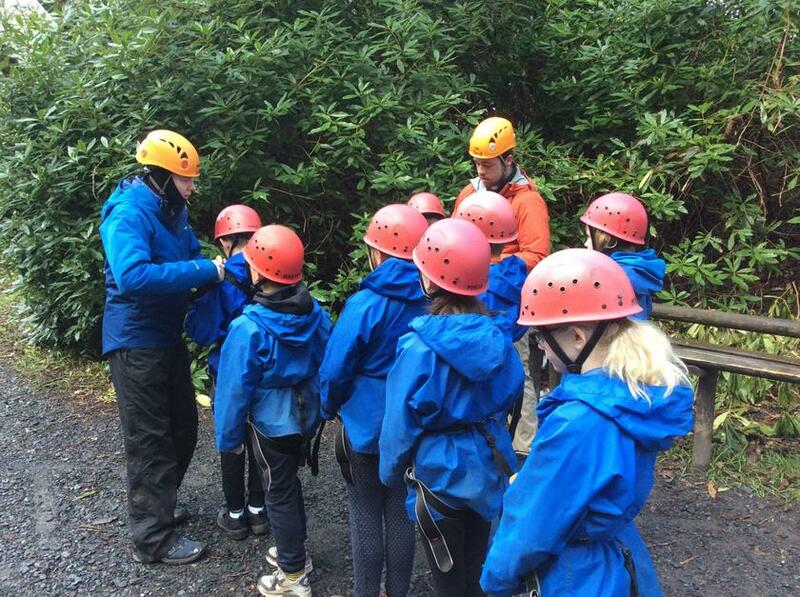 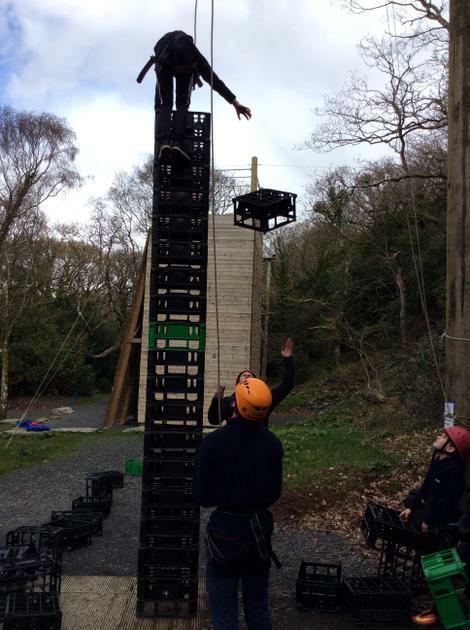 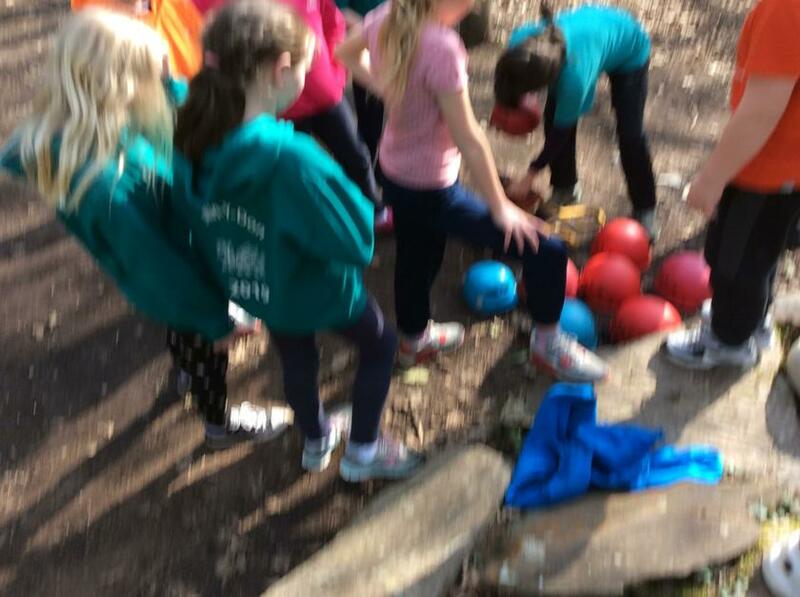 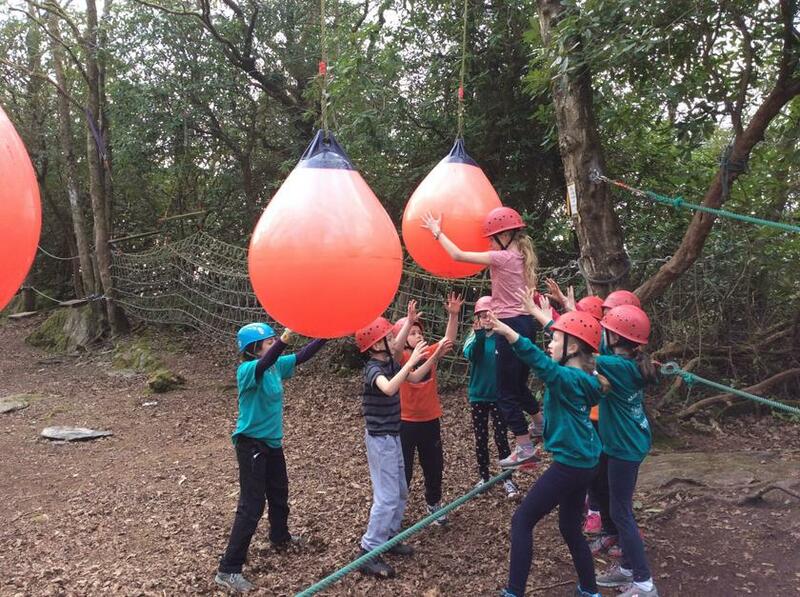 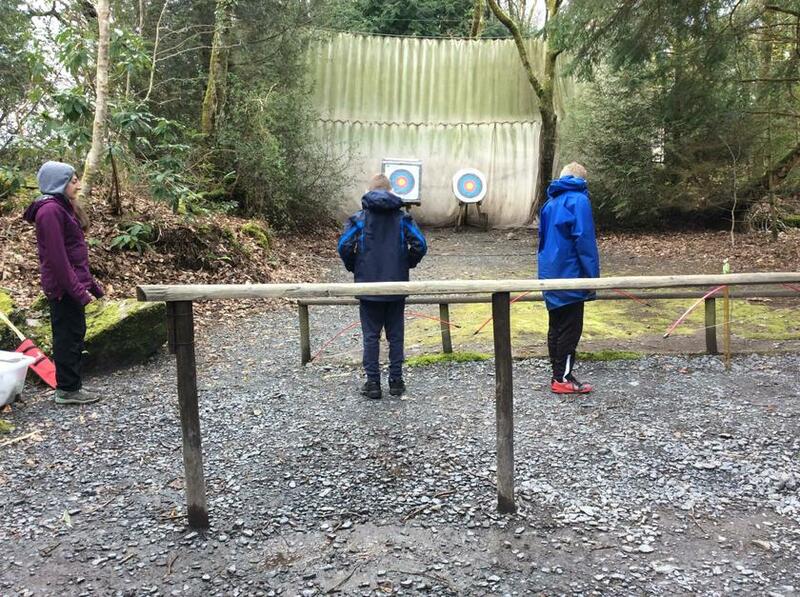 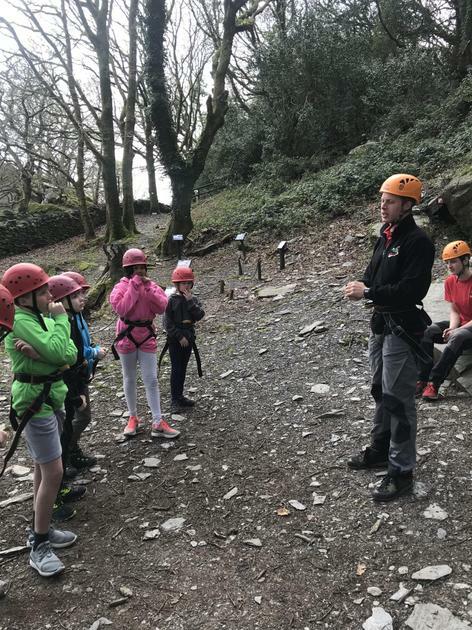 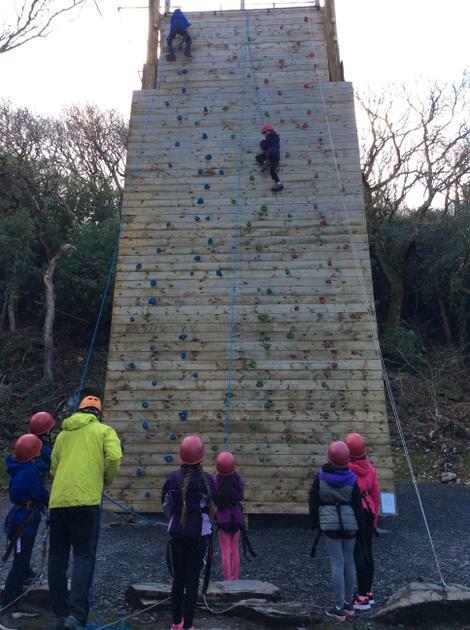 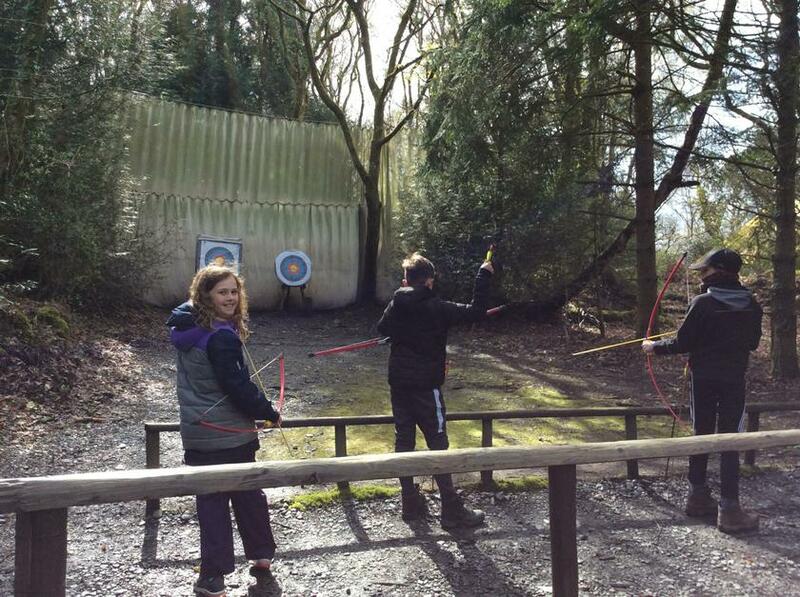 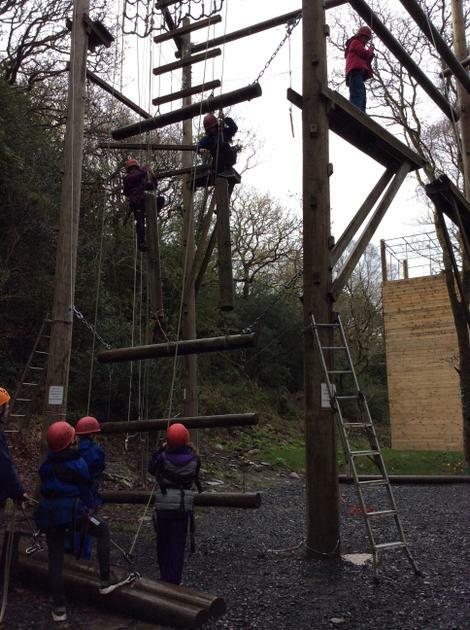 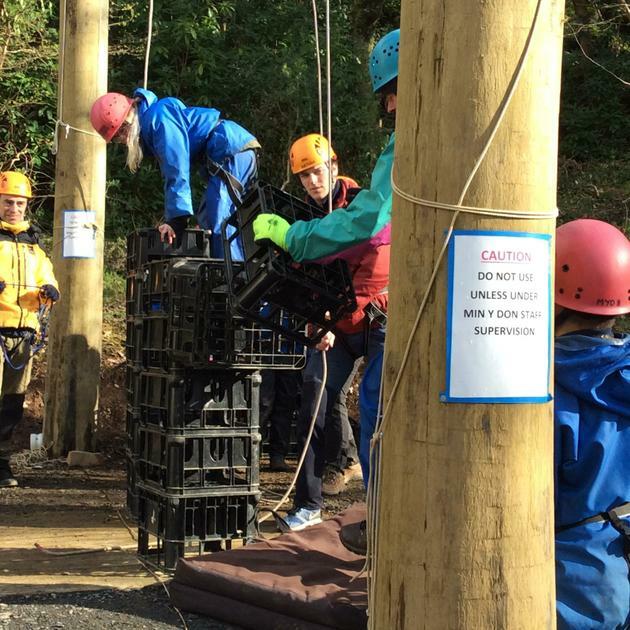 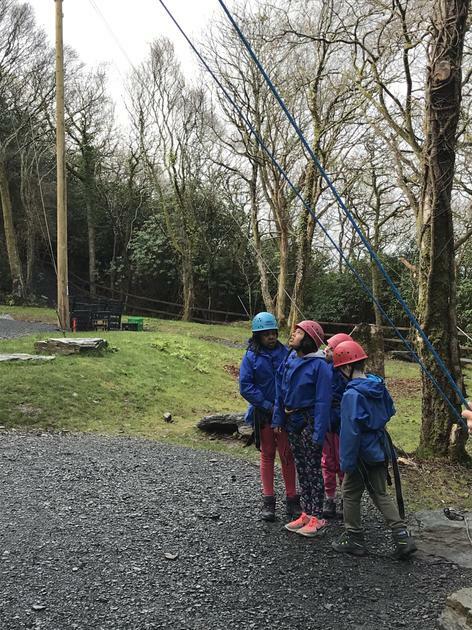 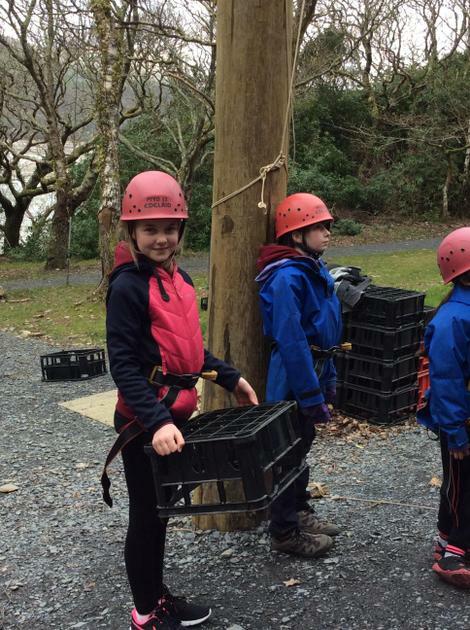 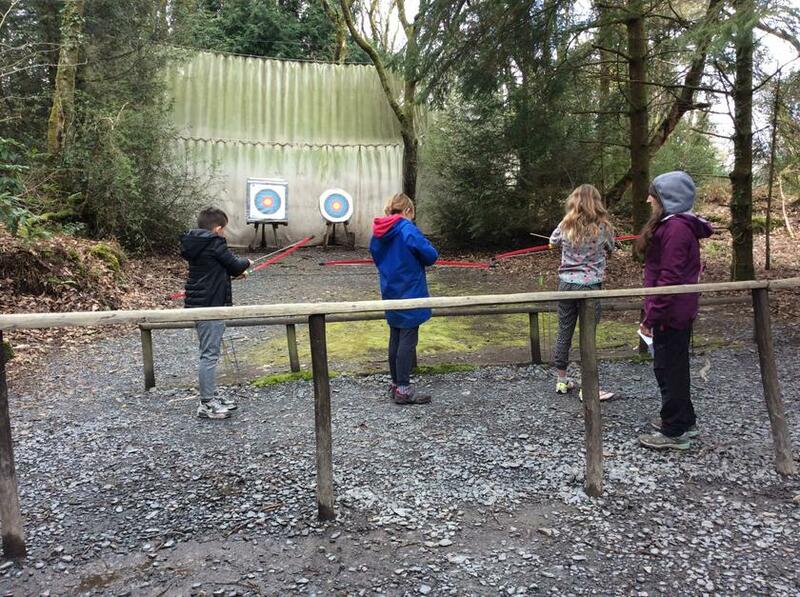 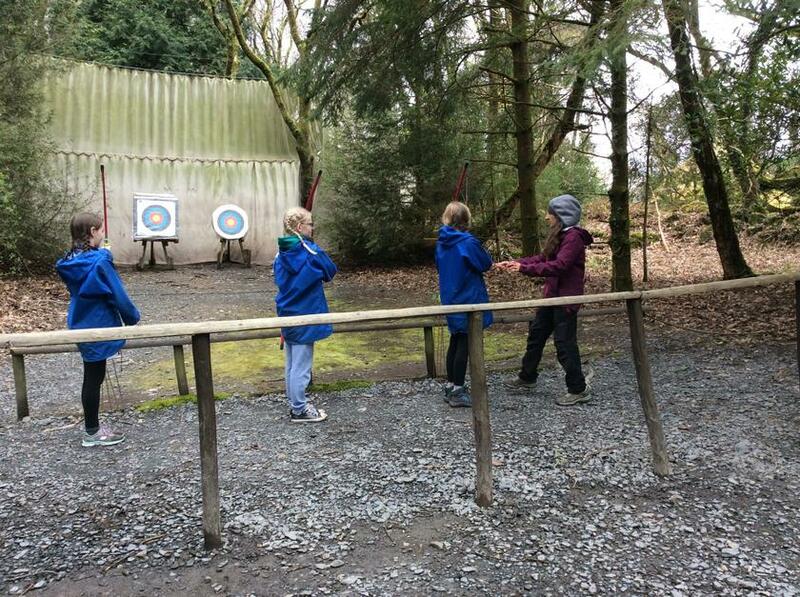 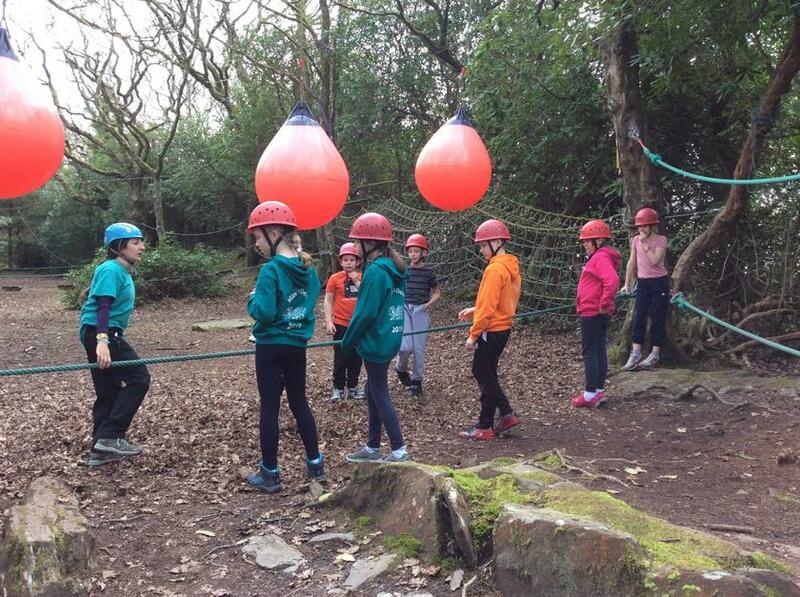 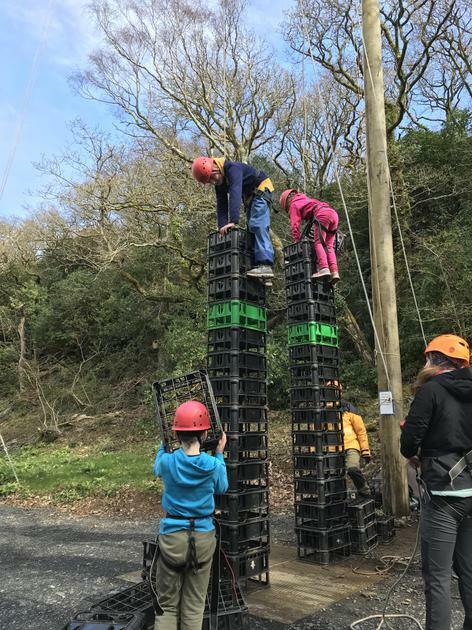 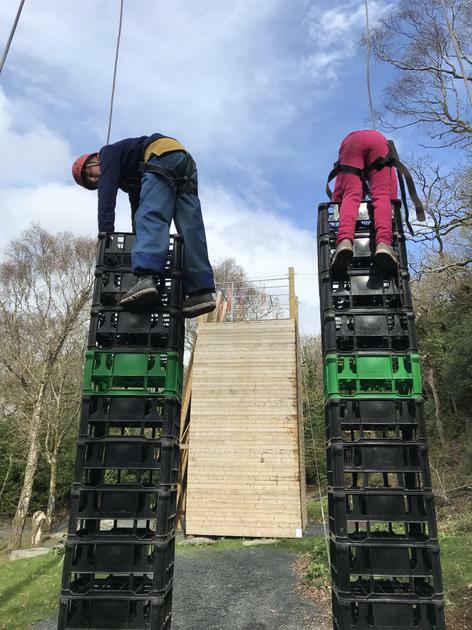 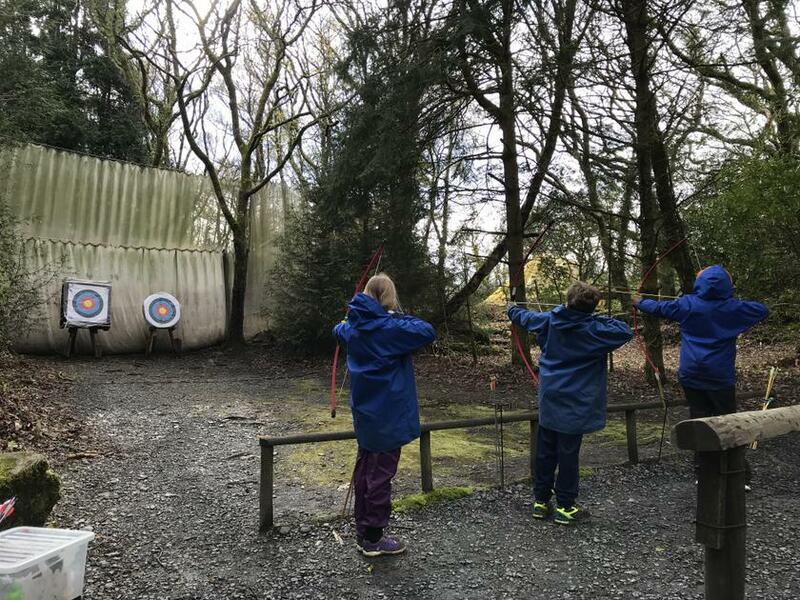 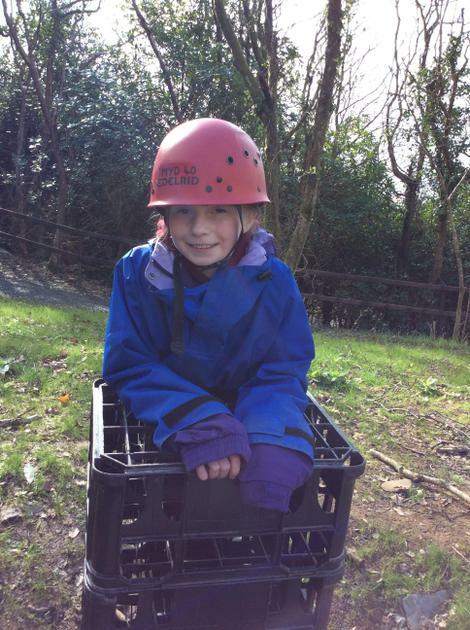 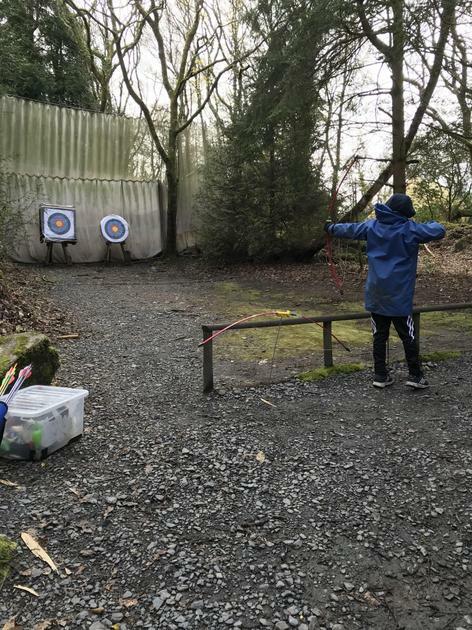 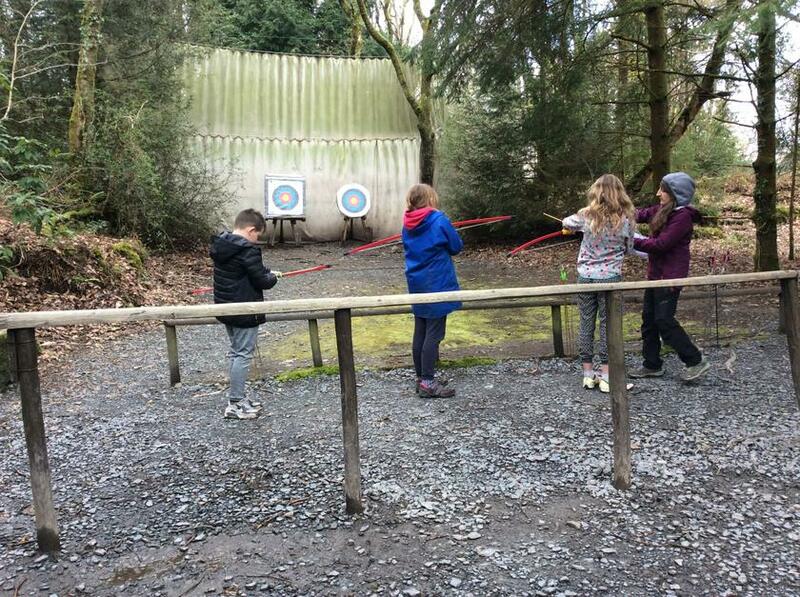 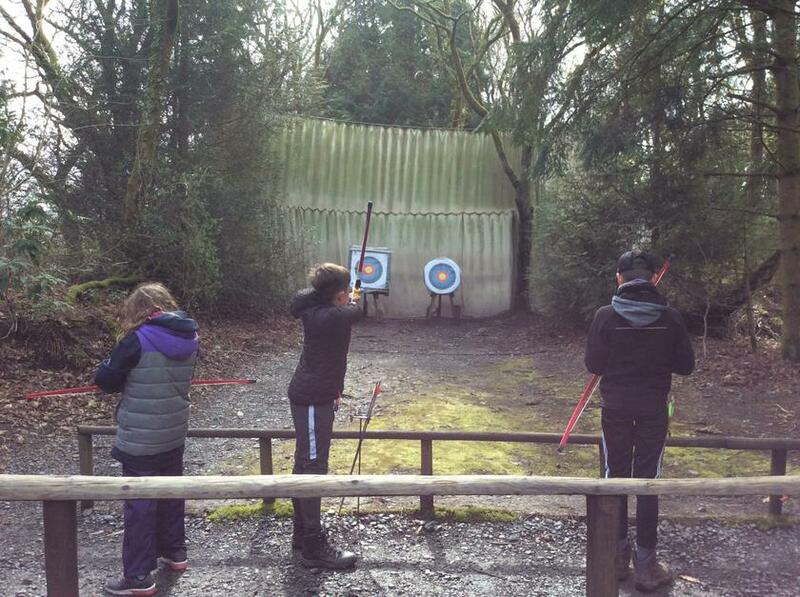 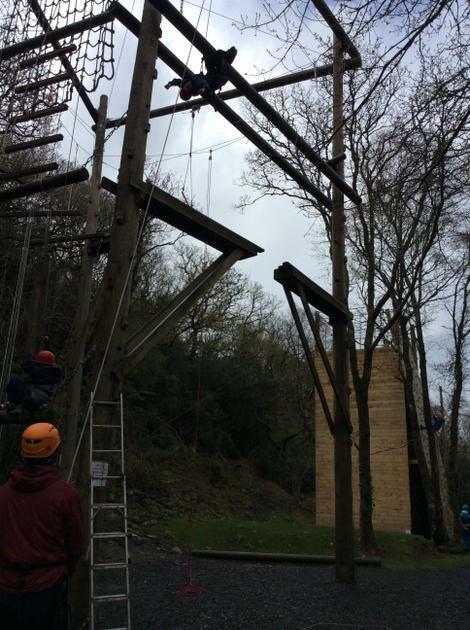 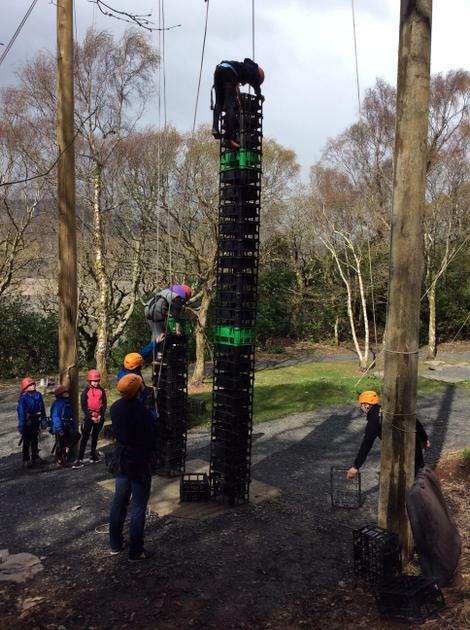 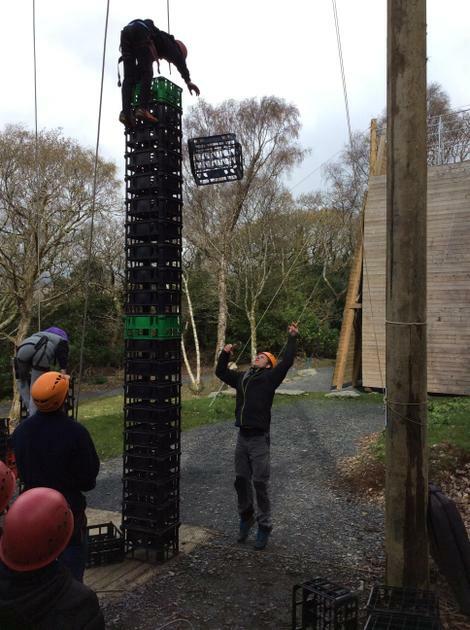 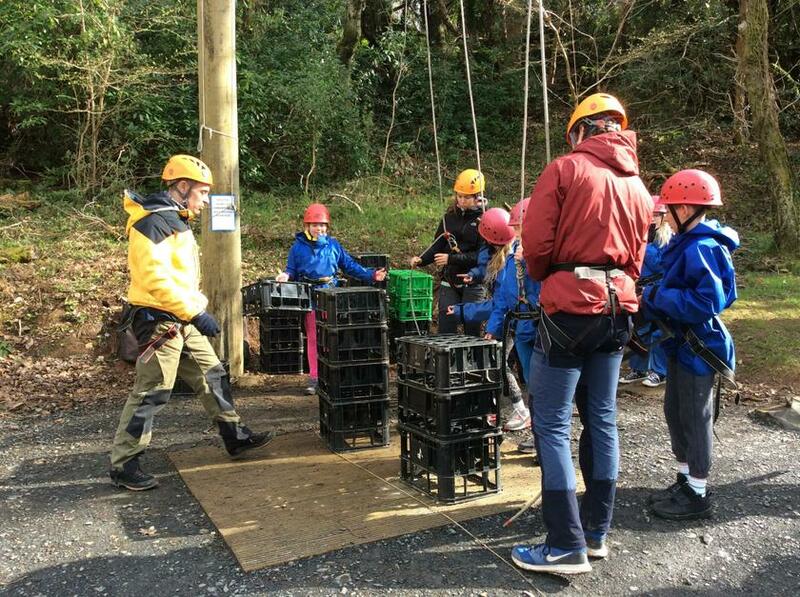 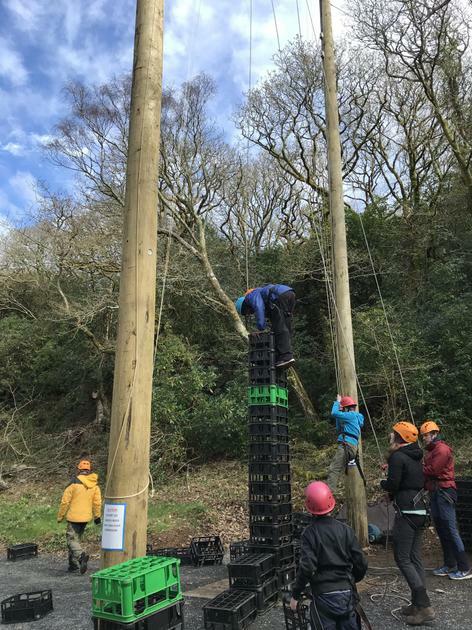 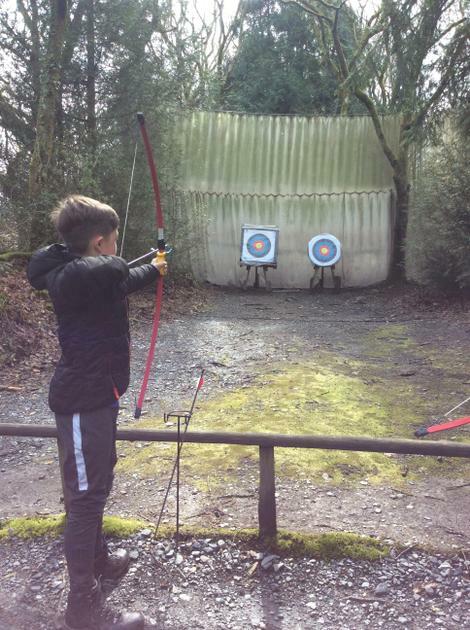 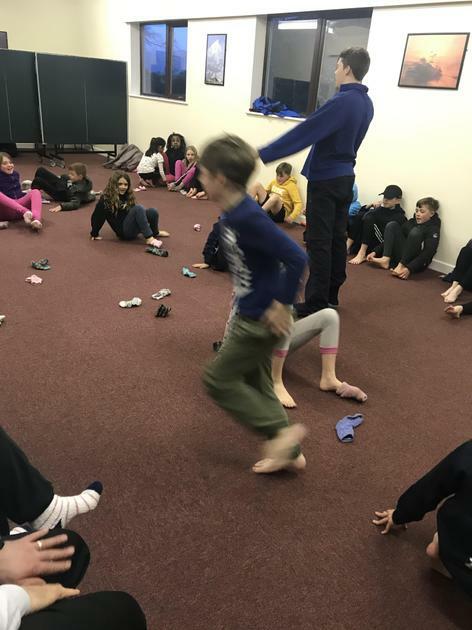 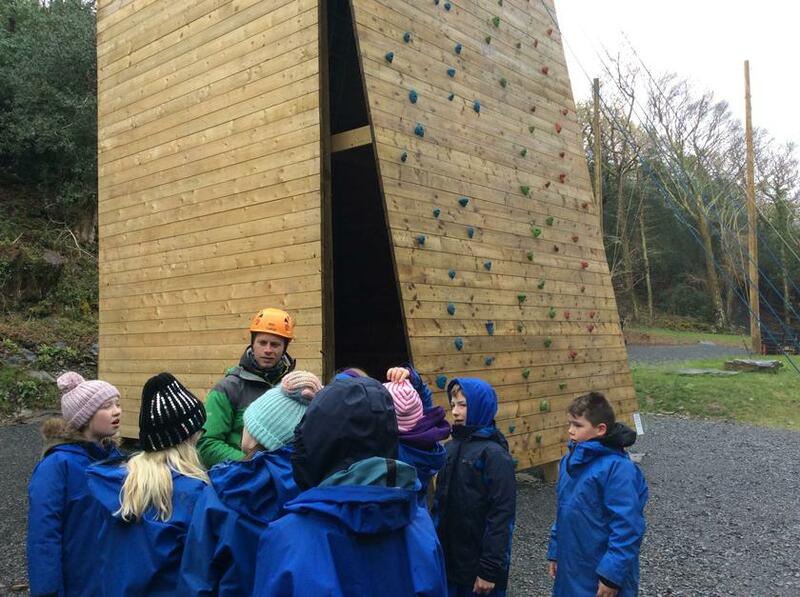 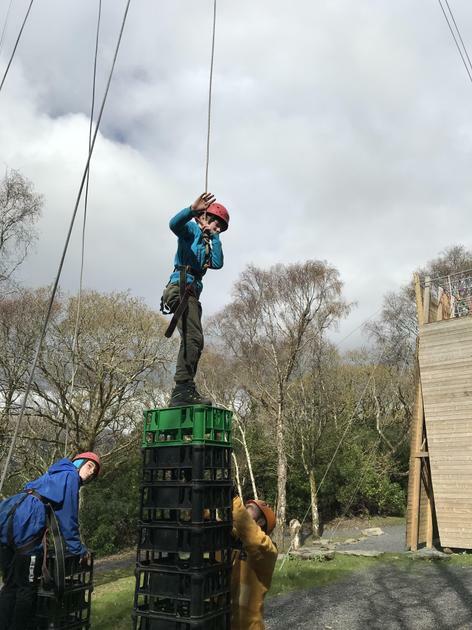 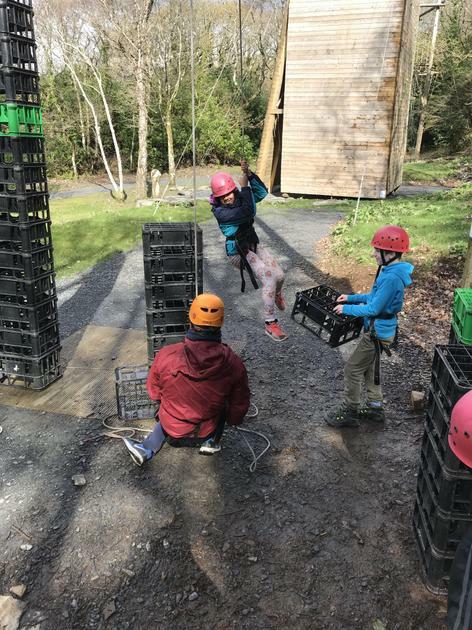 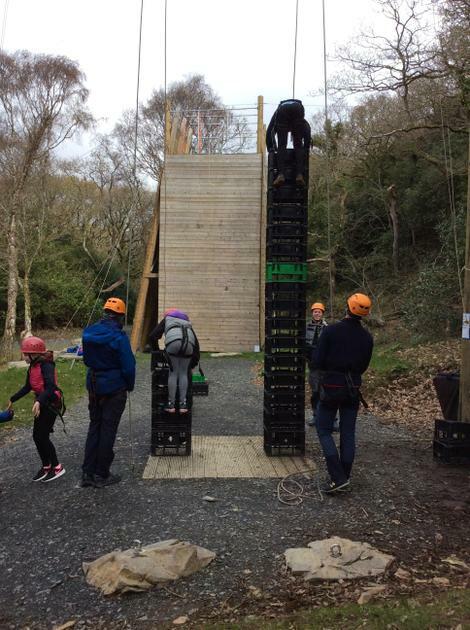 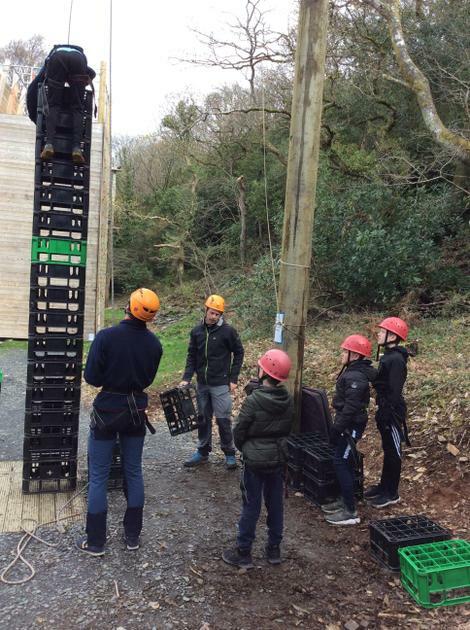 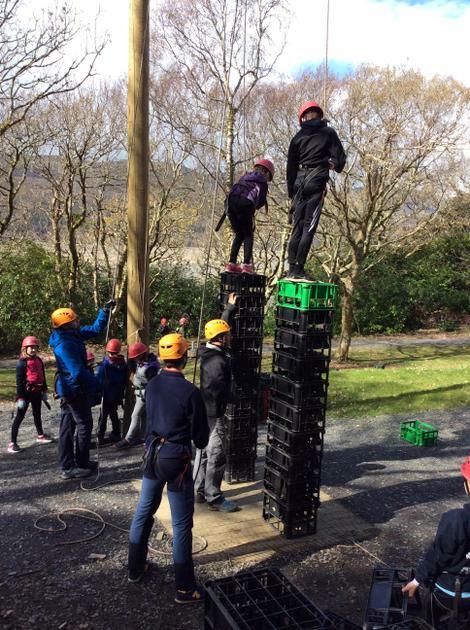 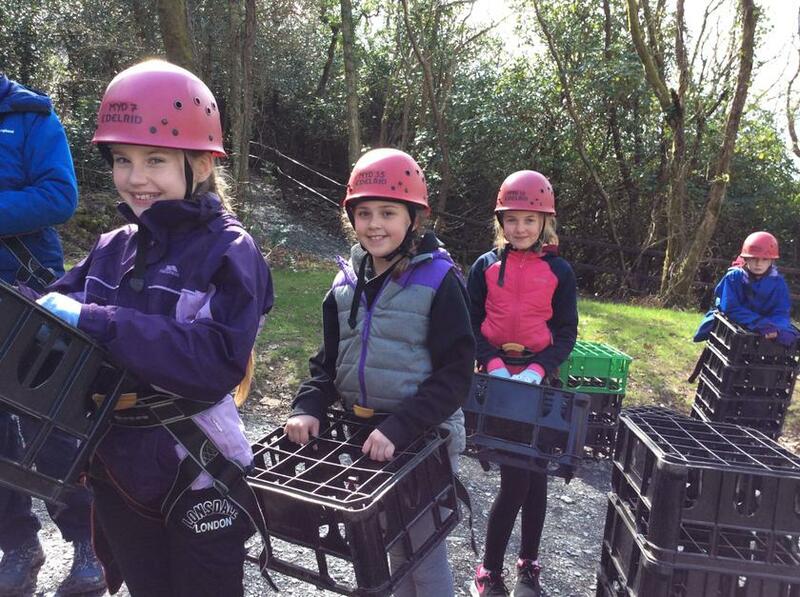 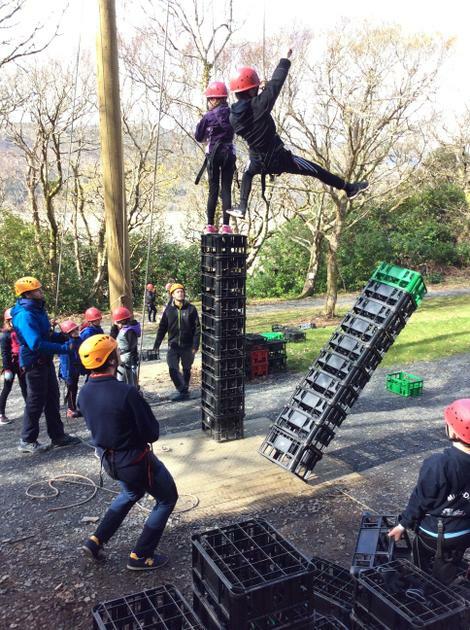 Splashing in kayaks, shooting in archery and climbing the crates we all developed new skills and were attacked by a short burst of hailstones. 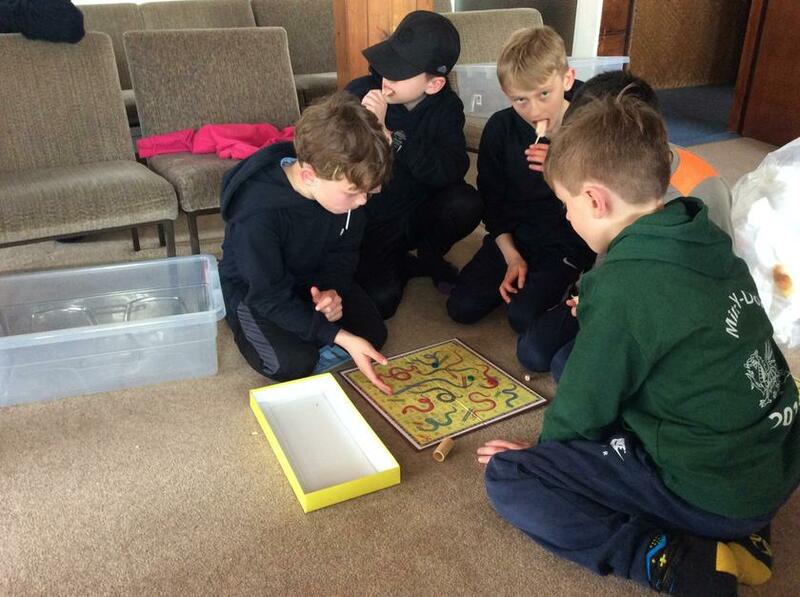 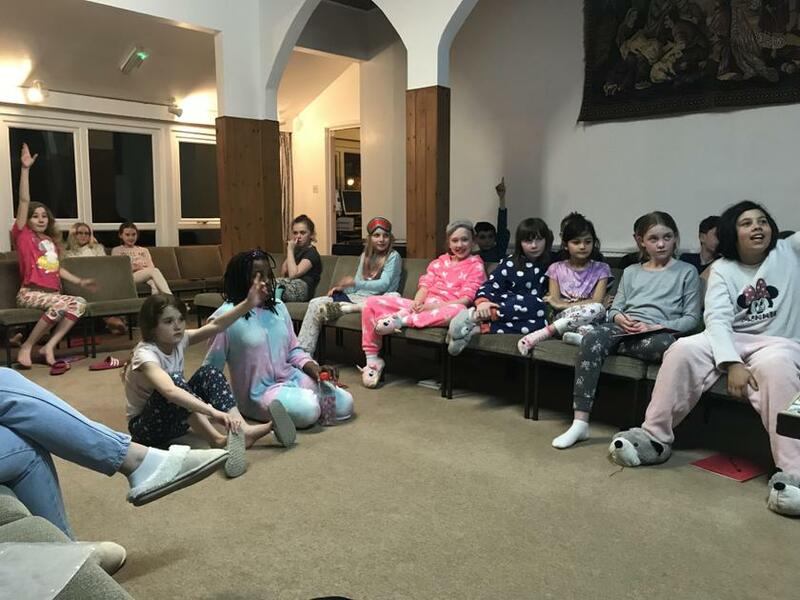 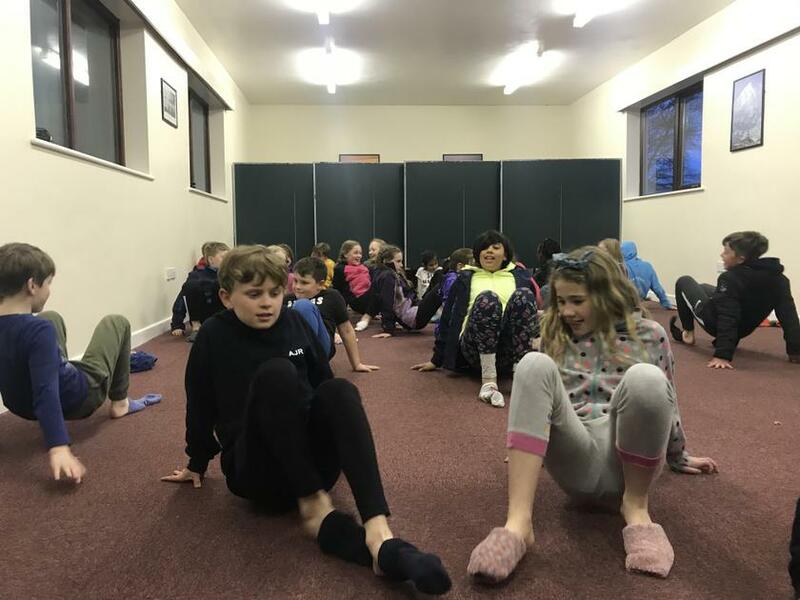 As the afternoon progressed we gathered for more team games before having time in our rooms to change, shower and be ready for a well earned evening meal. 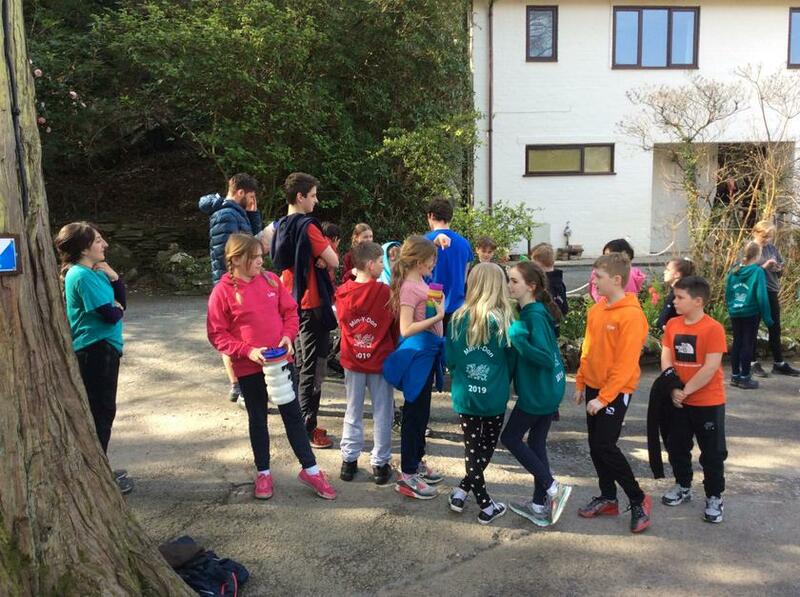 As light faded we ran around outside playing a game of catch the flag. 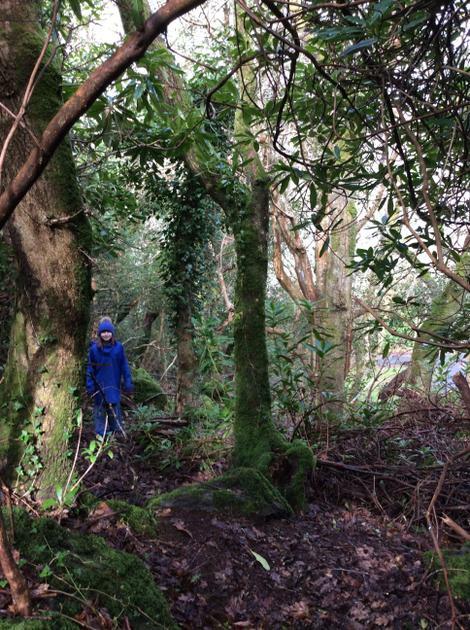 Not easy amongst all the undergrowth to find 3 small hidden flags. 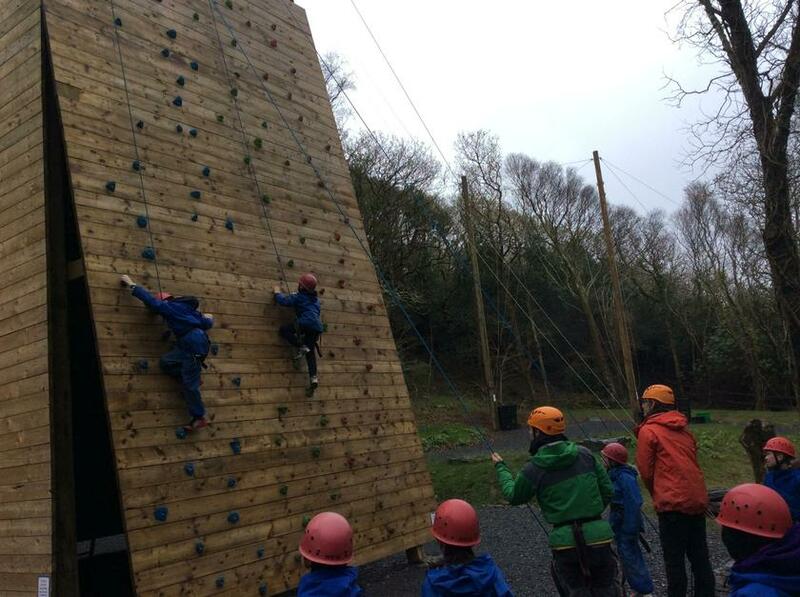 Despite the cold weather we played and had fun and were soon back inside for hot chocolate, epilogue and bed time. 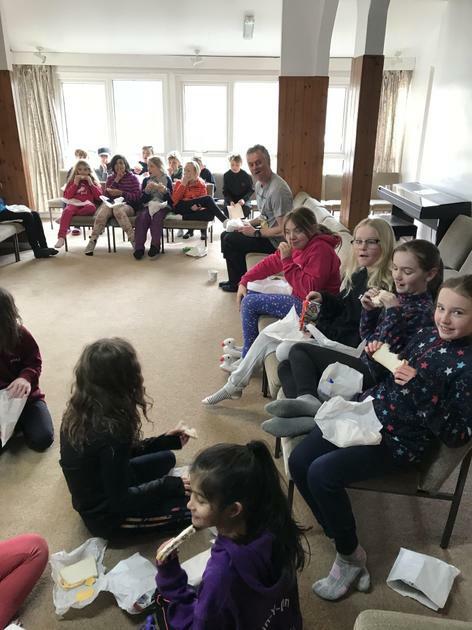 Following a good night’s sleep we were all soon up and about preparing ourselves for the new and exciting challenges that today would pose. 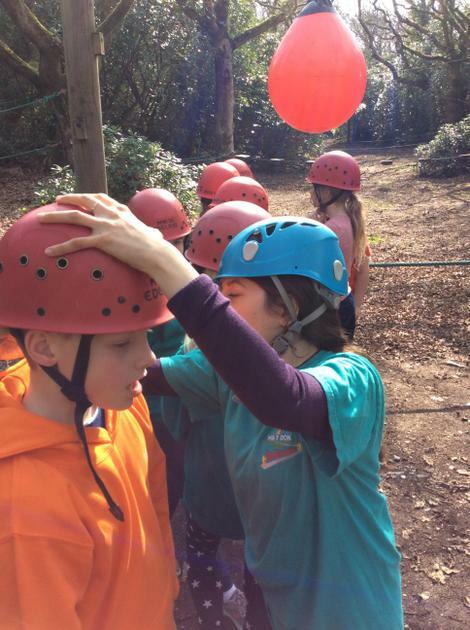 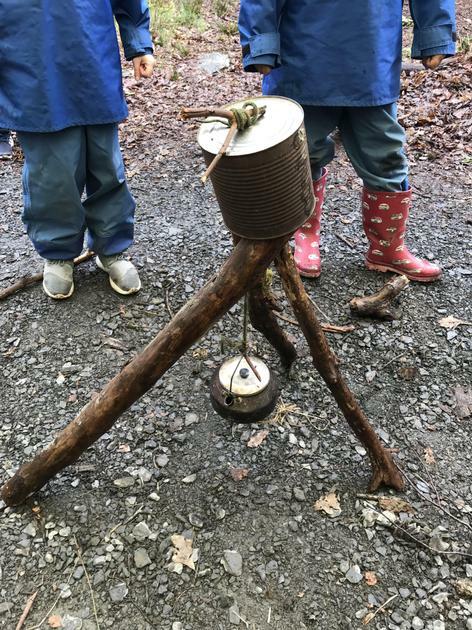 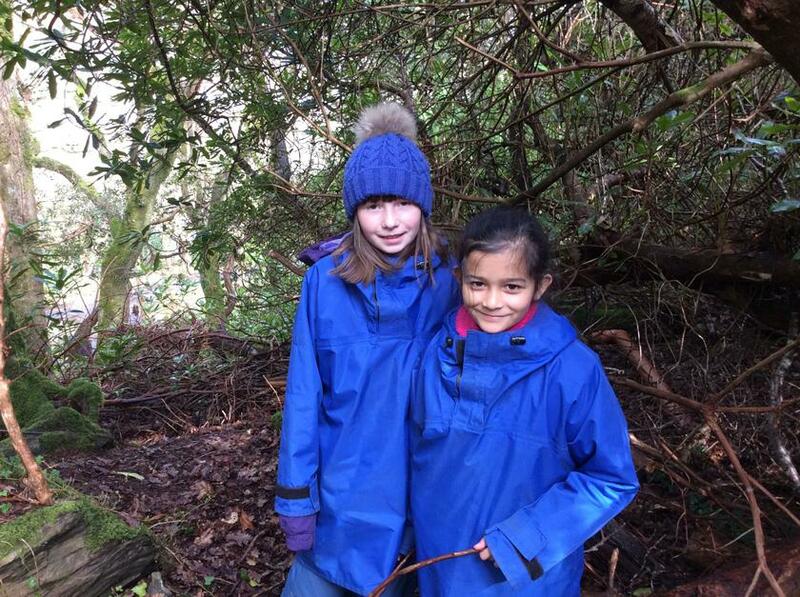 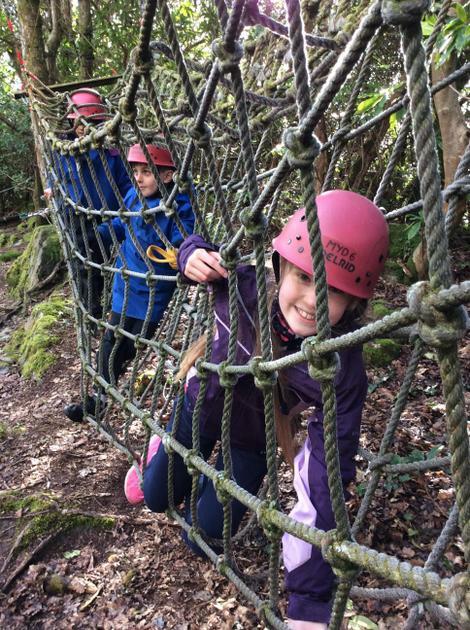 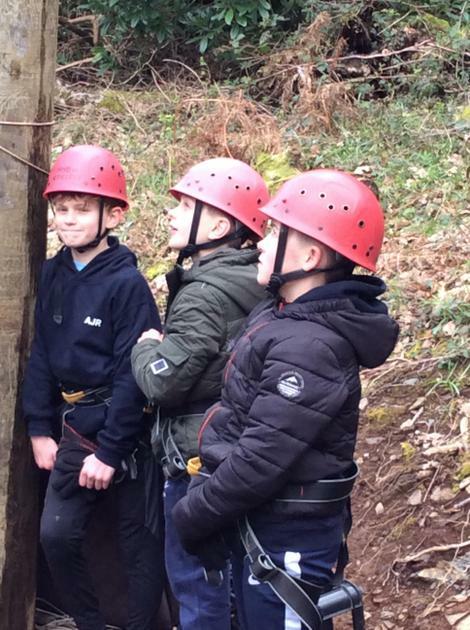 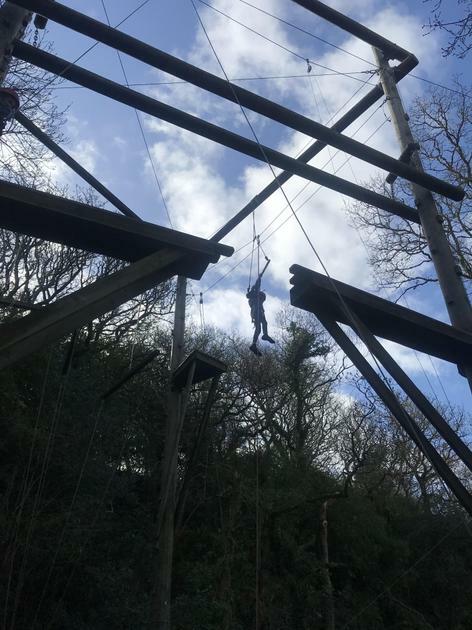 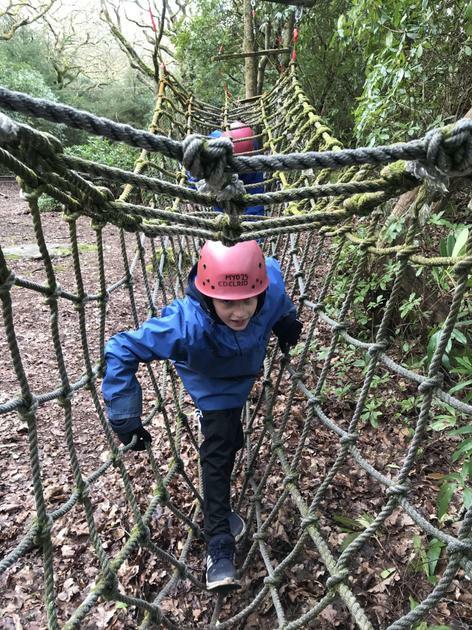 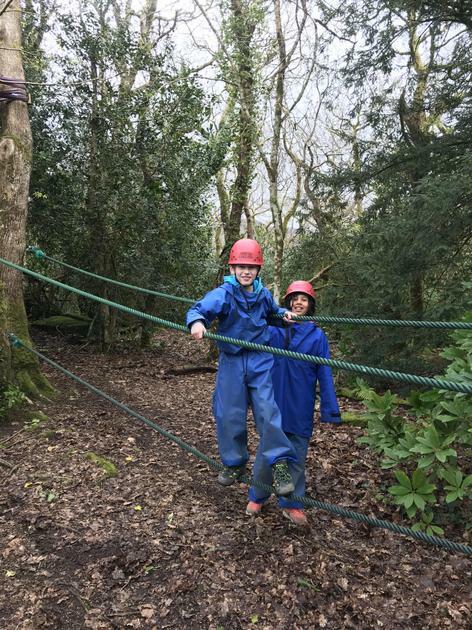 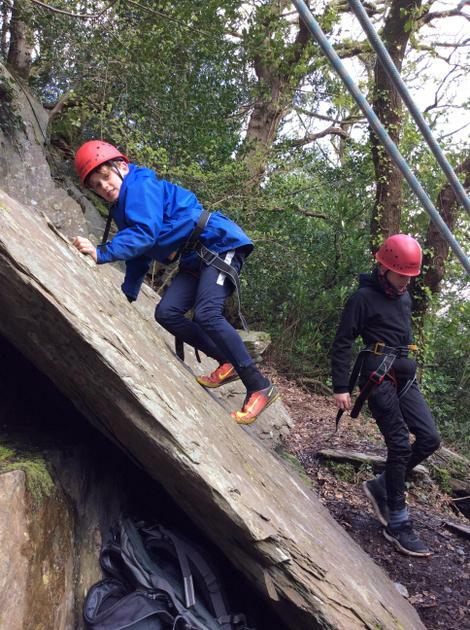 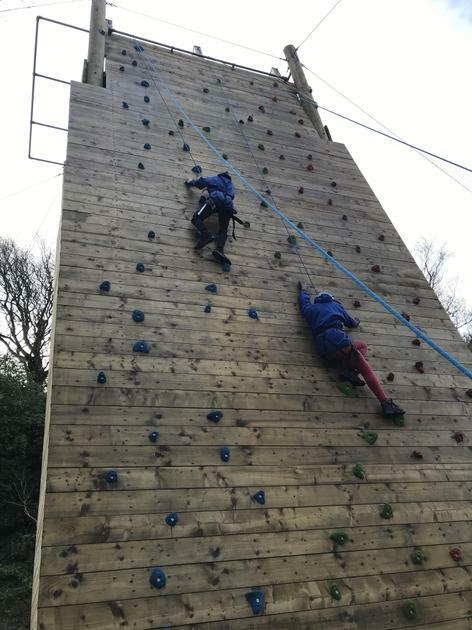 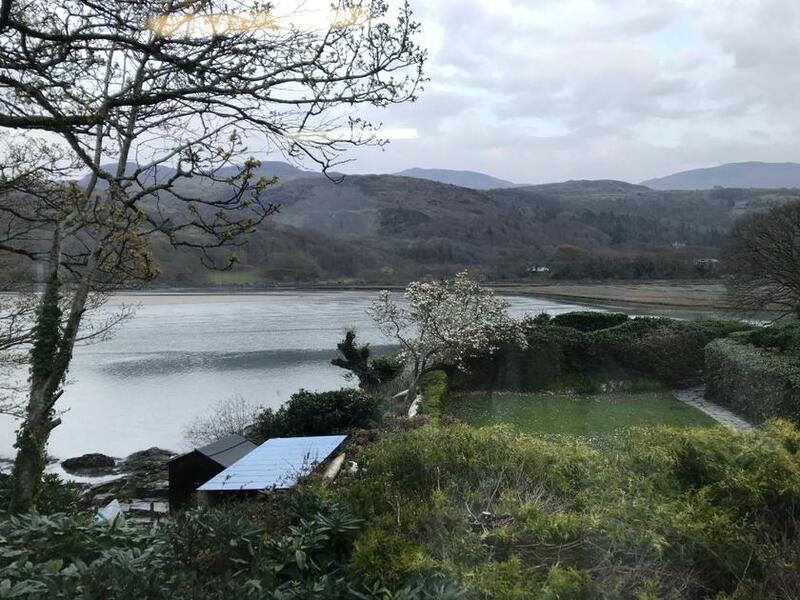 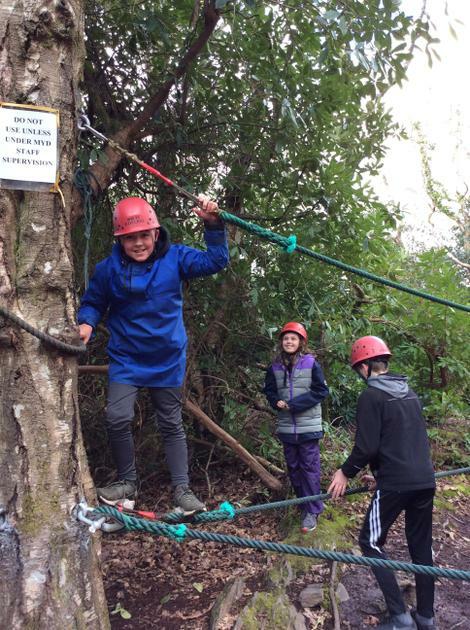 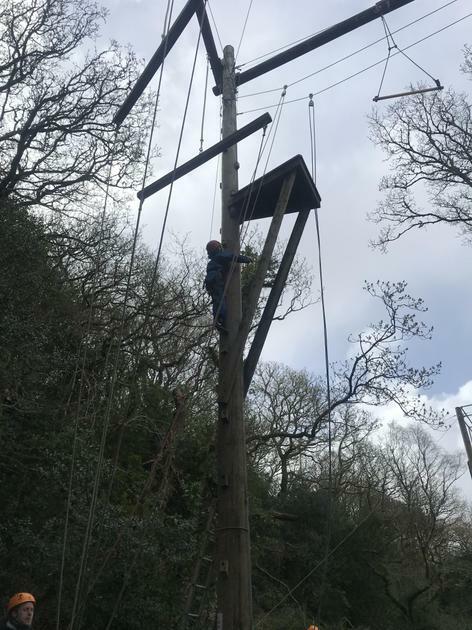 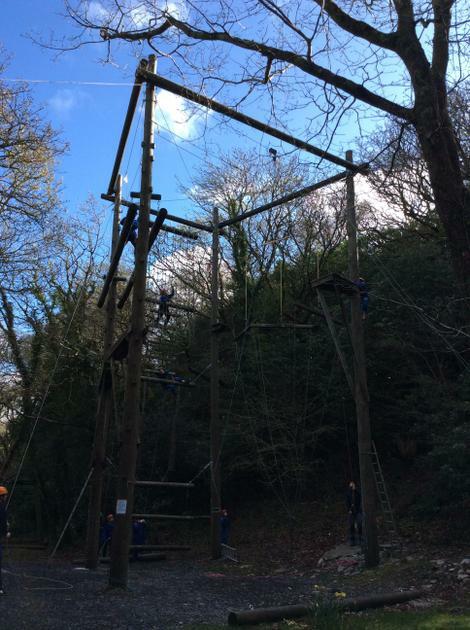 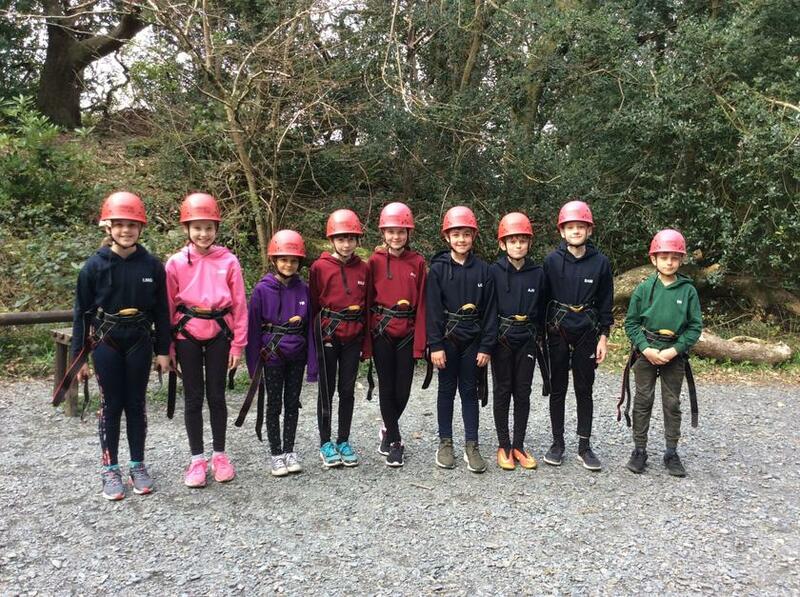 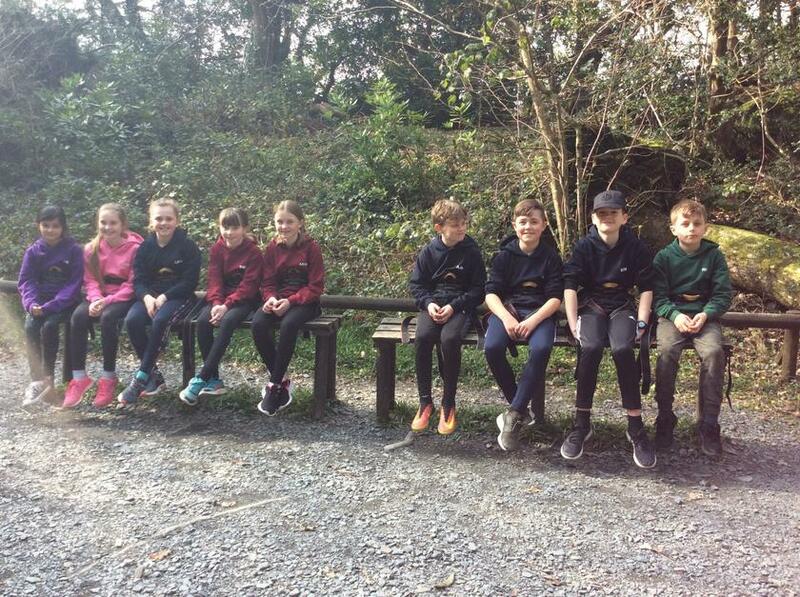 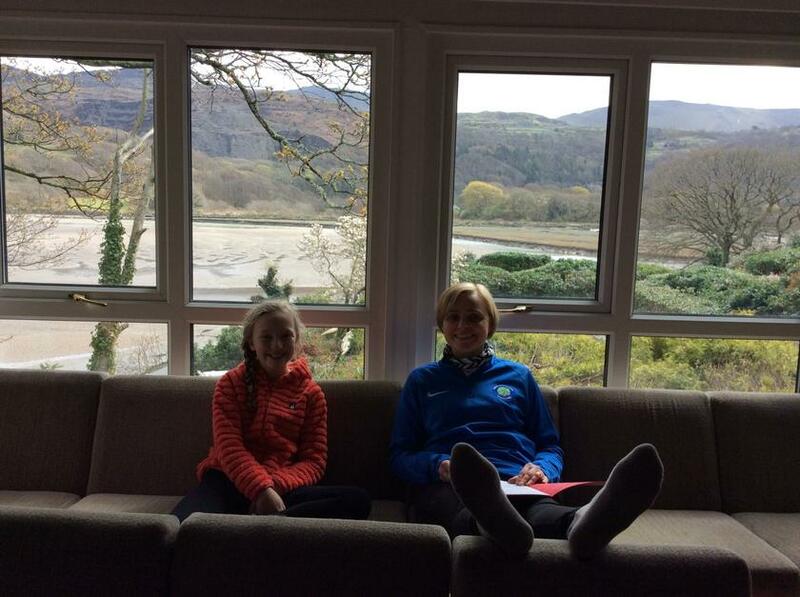 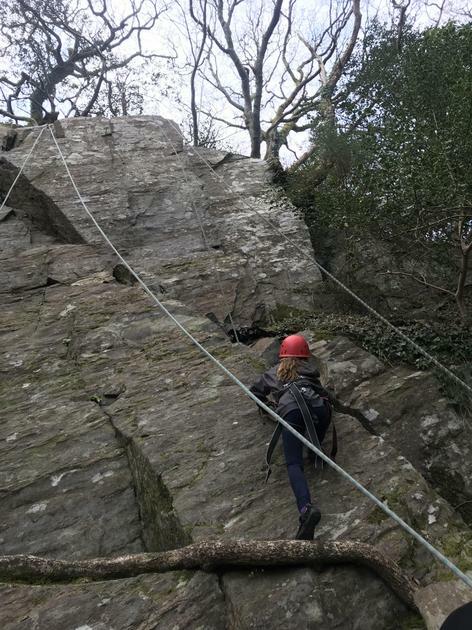 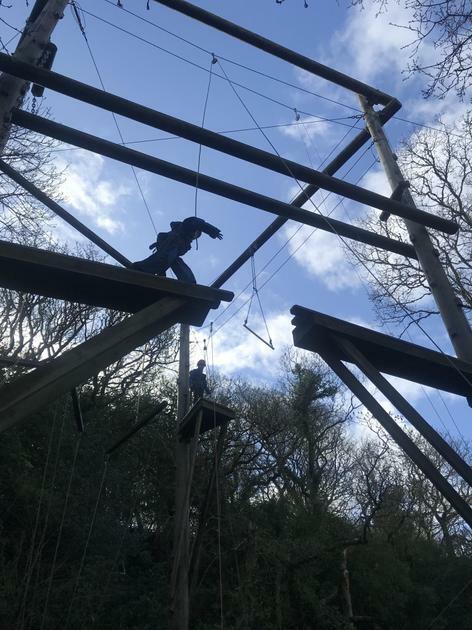 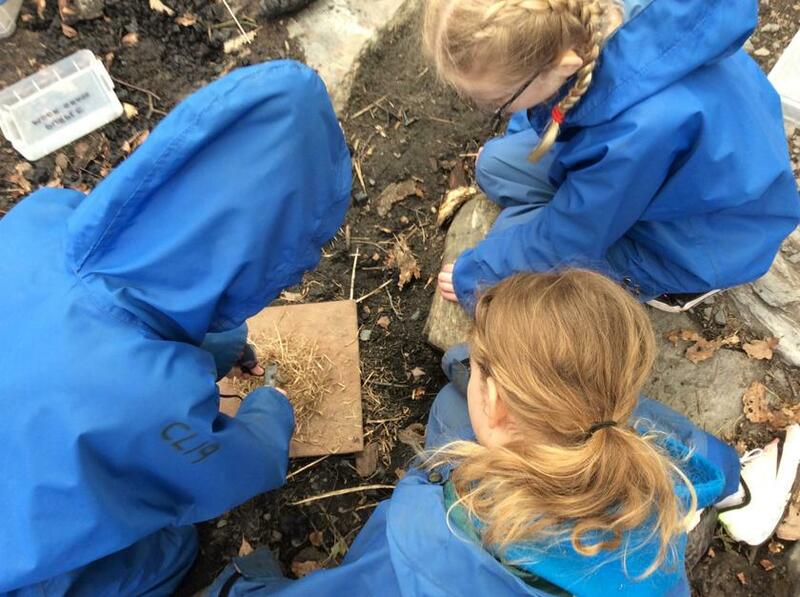 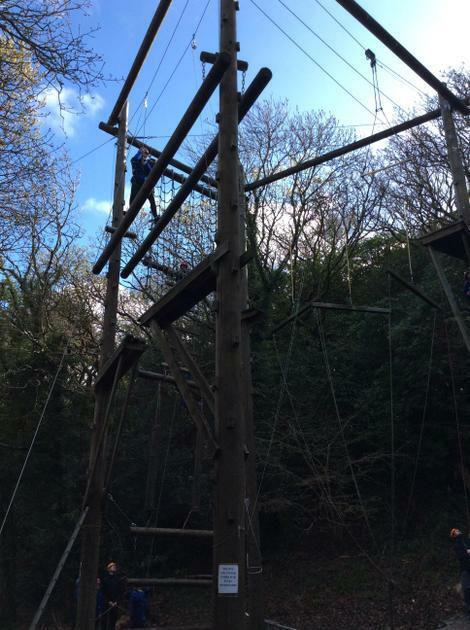 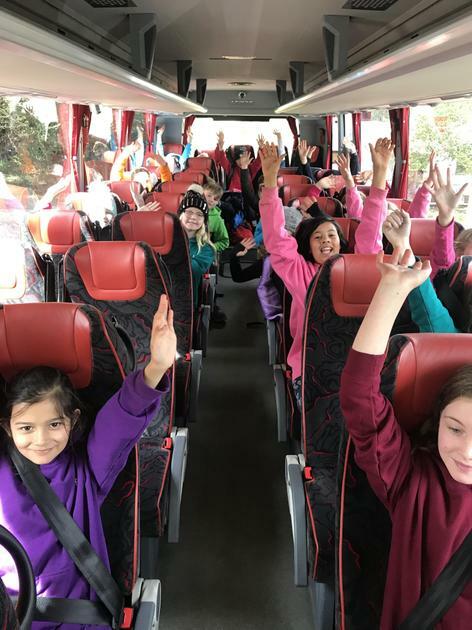 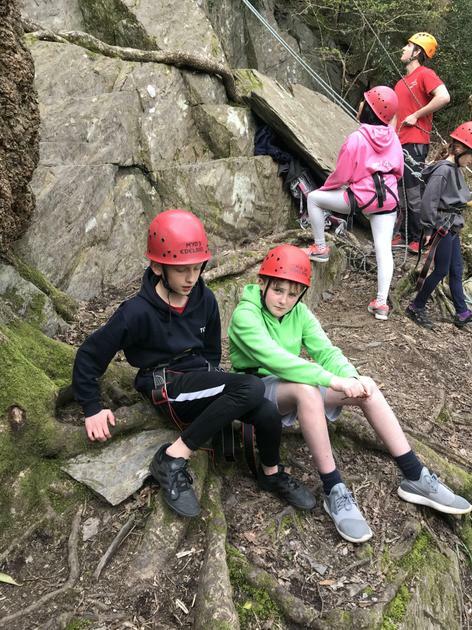 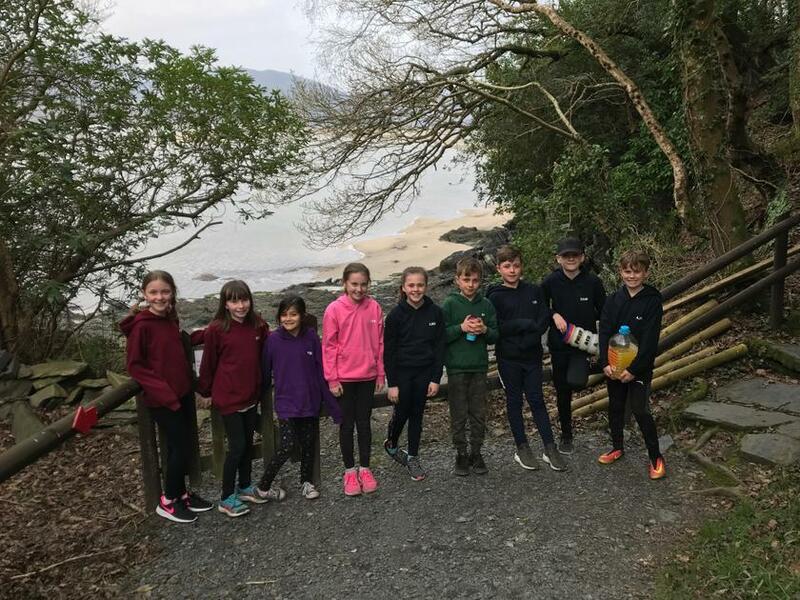 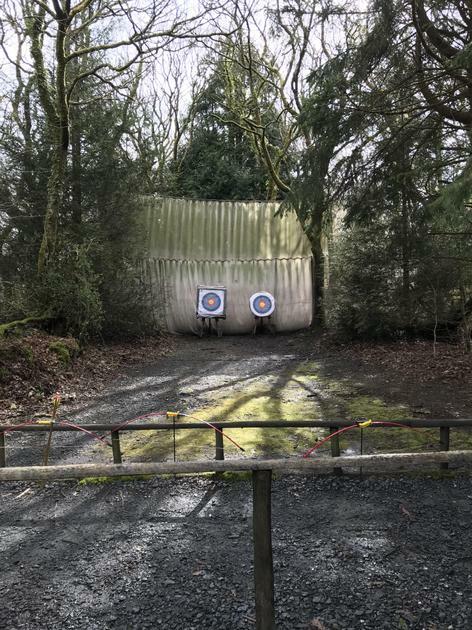 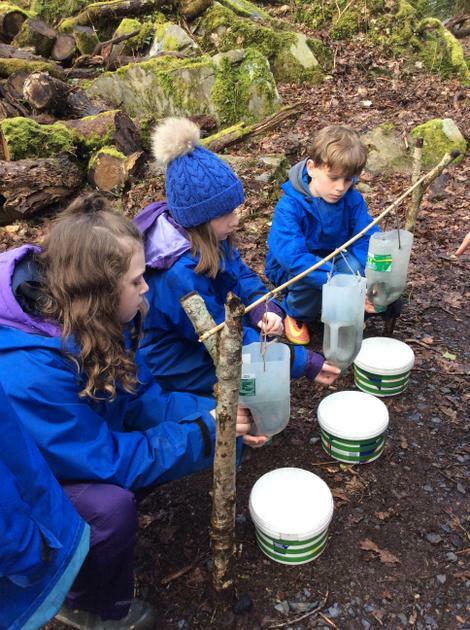 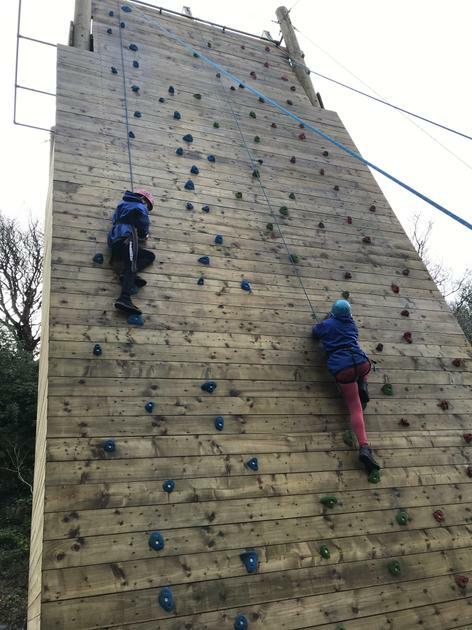 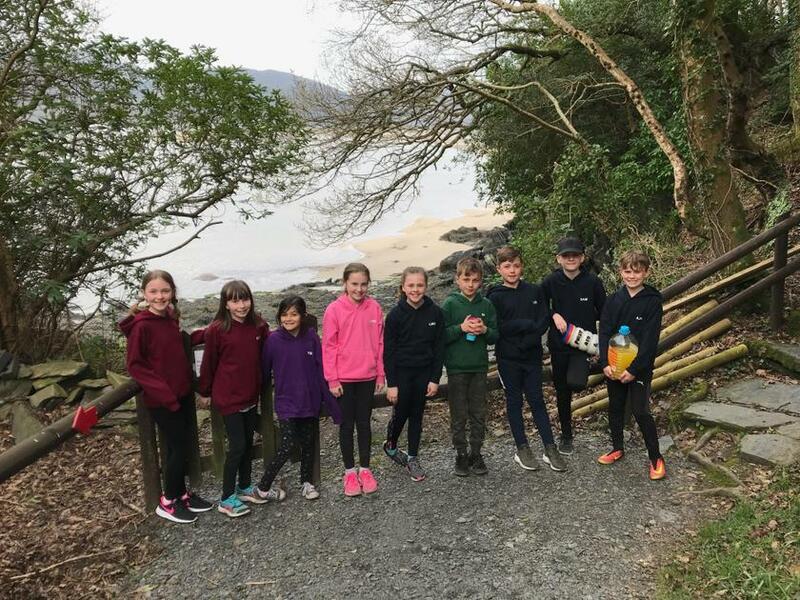 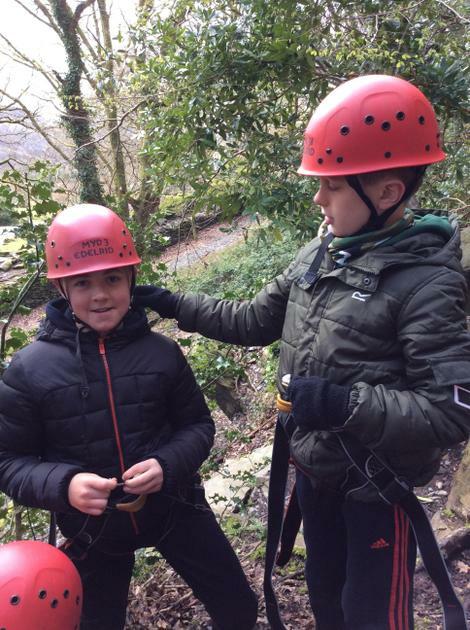 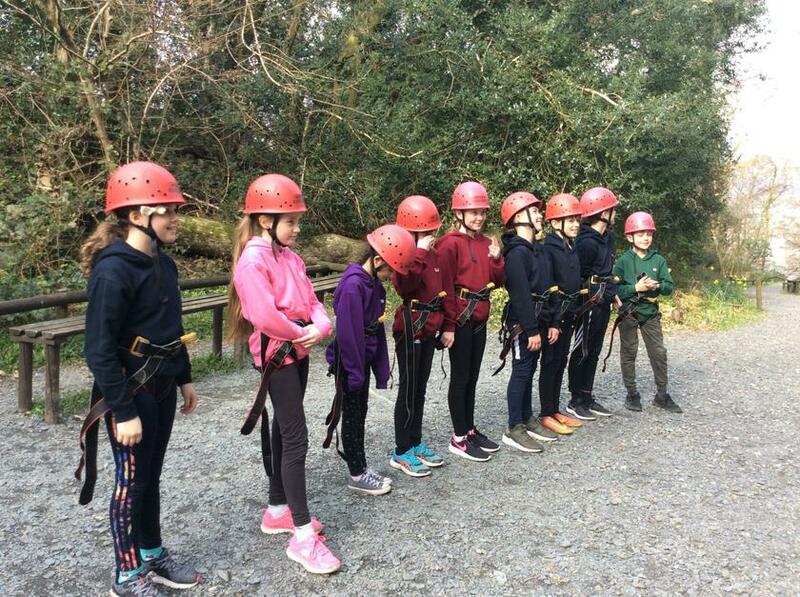 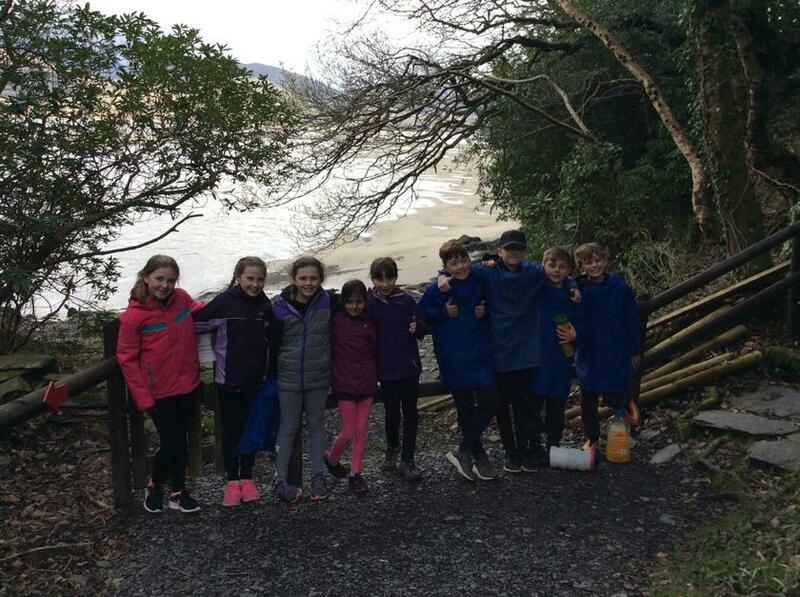 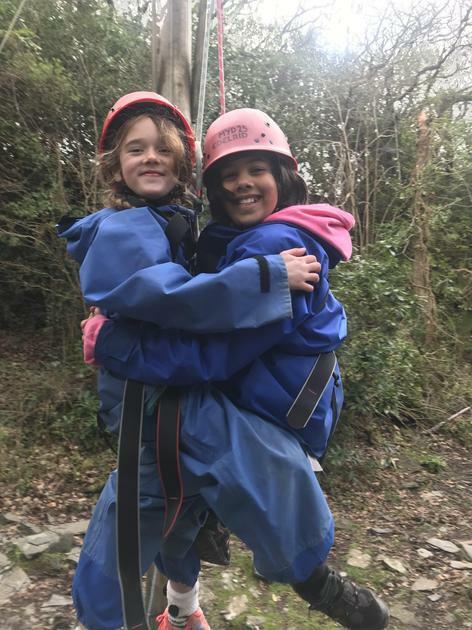 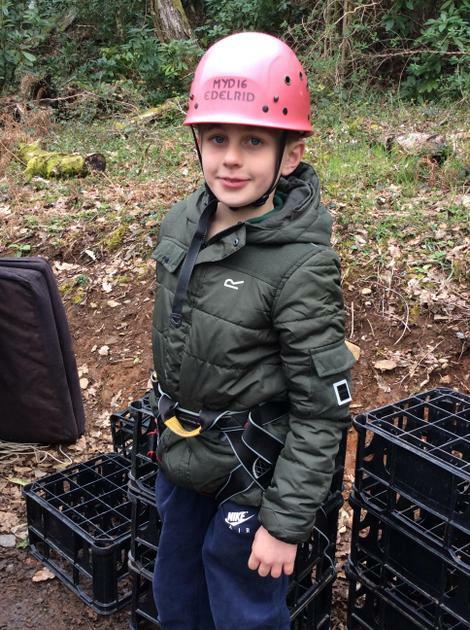 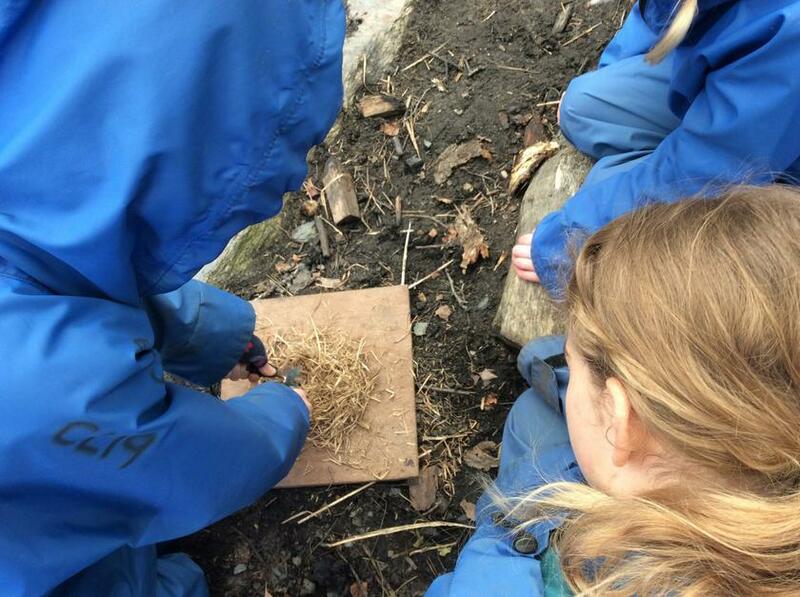 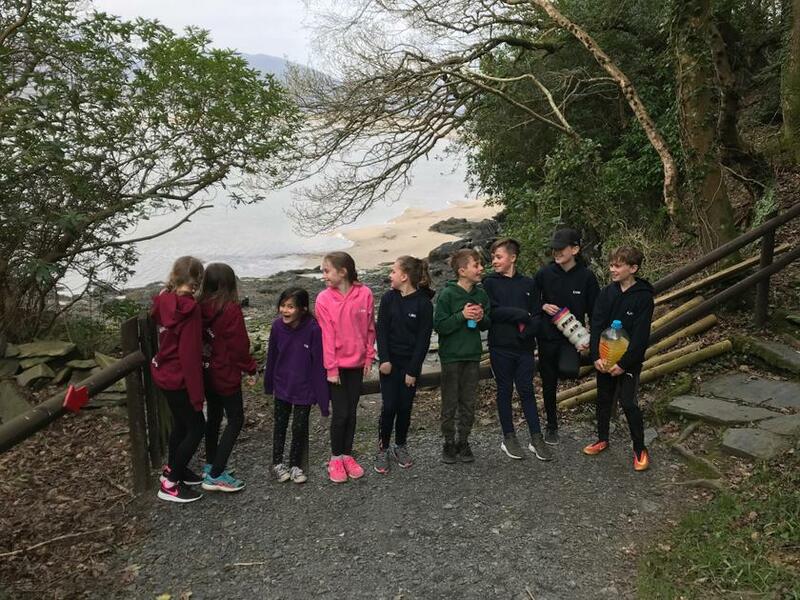 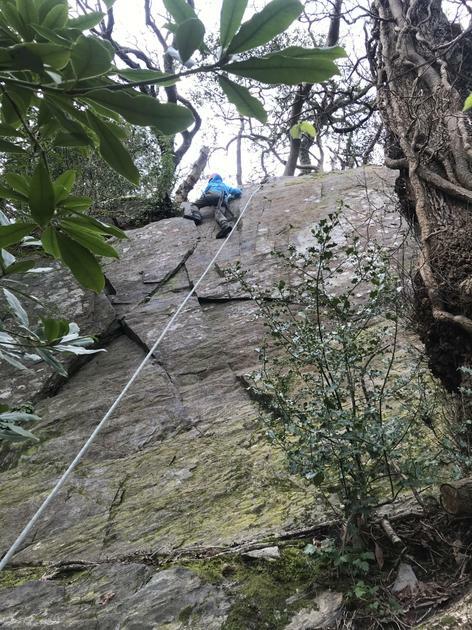 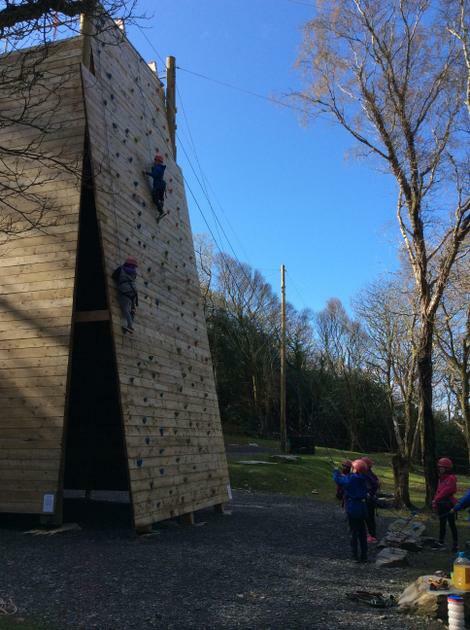 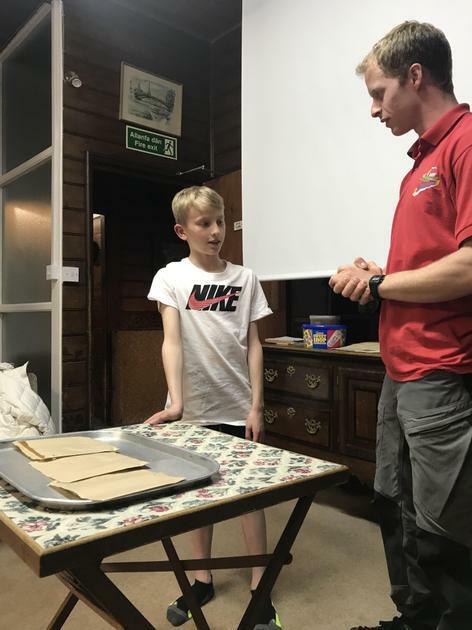 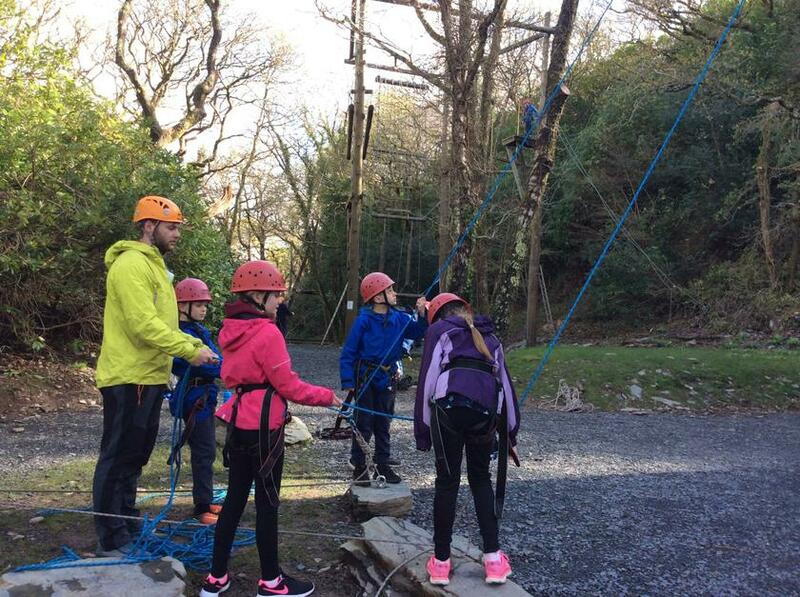 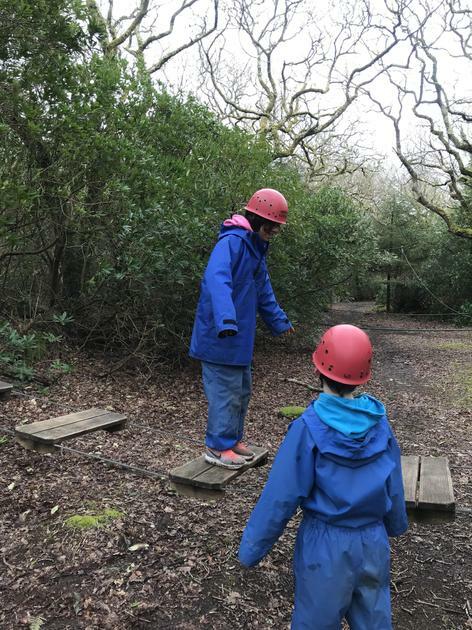 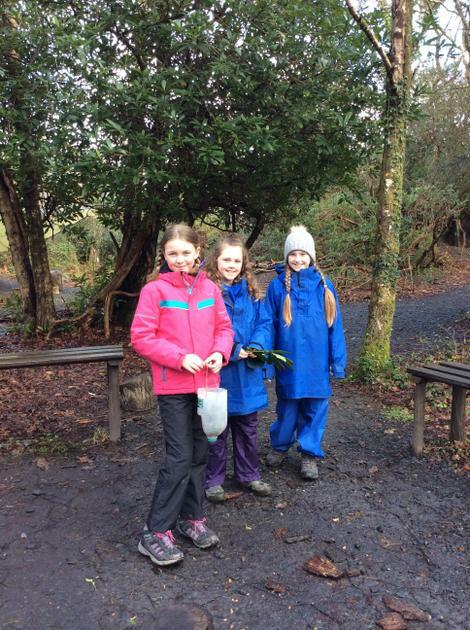 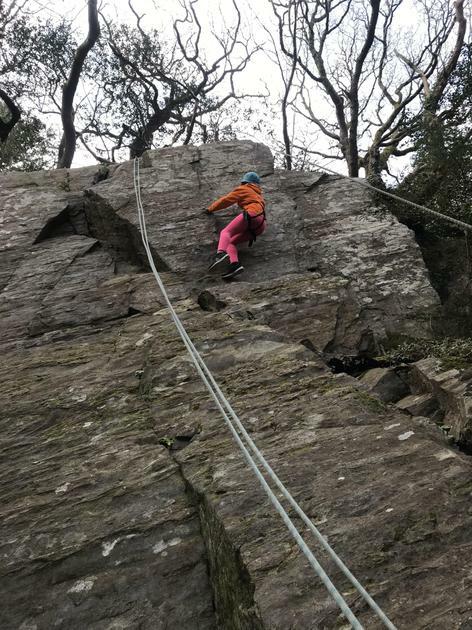 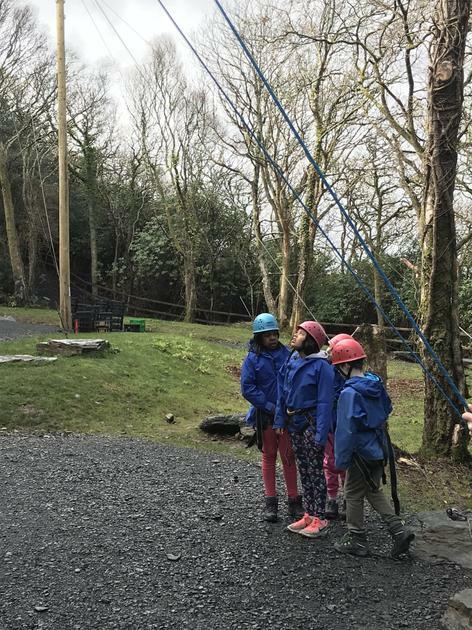 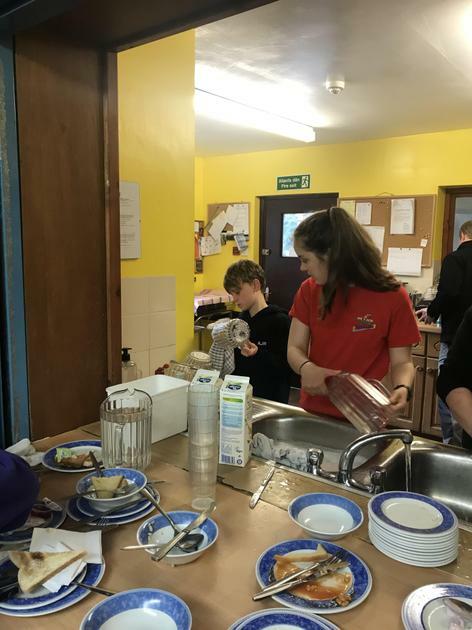 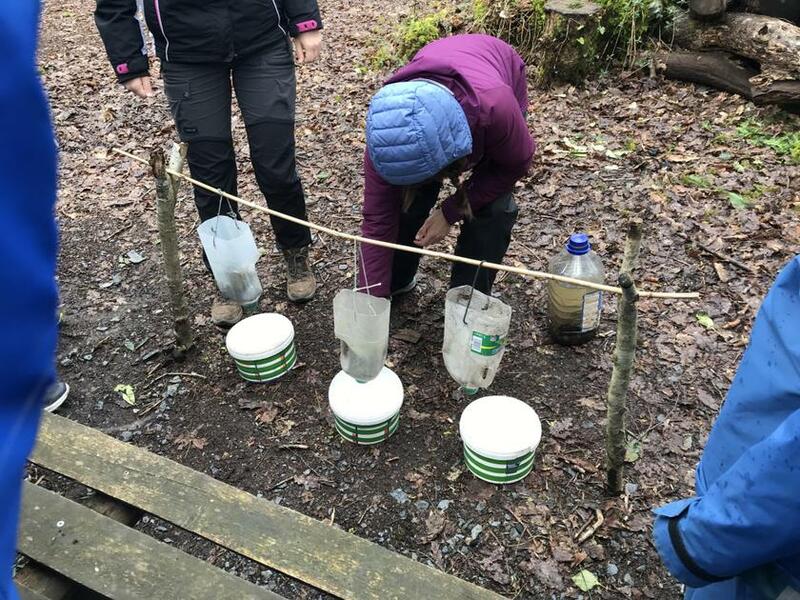 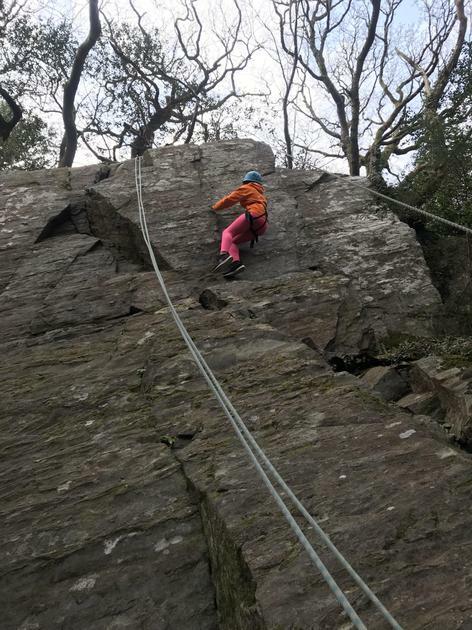 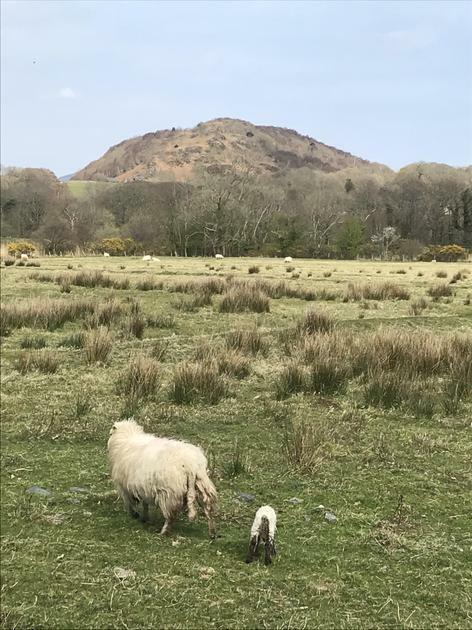 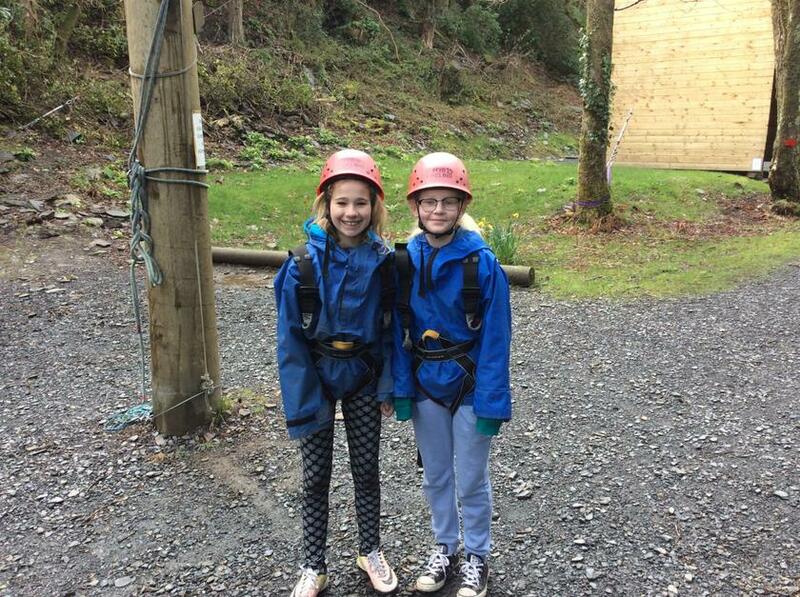 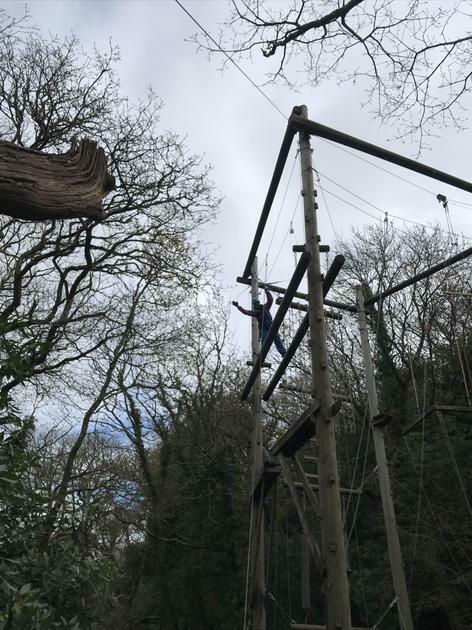 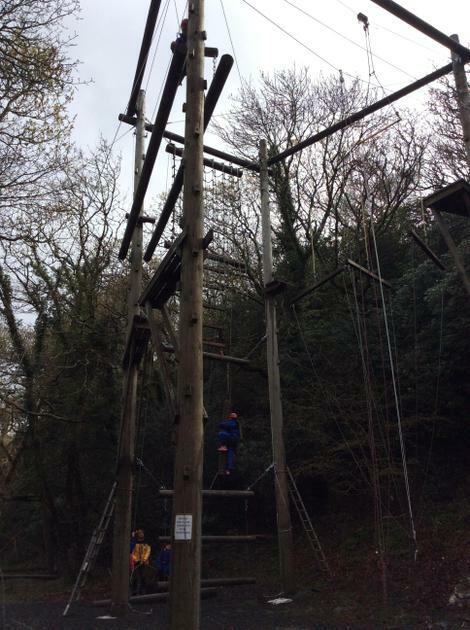 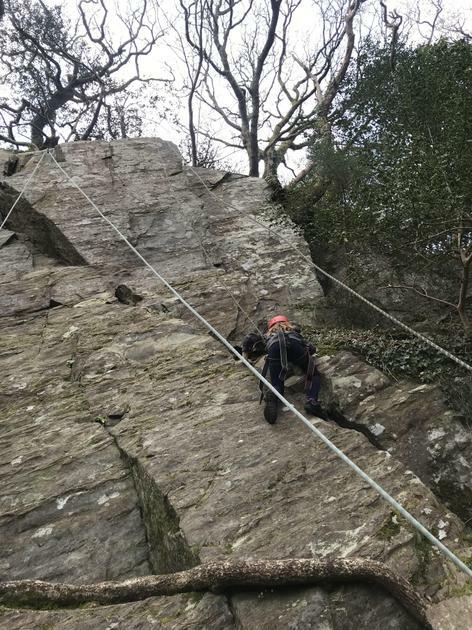 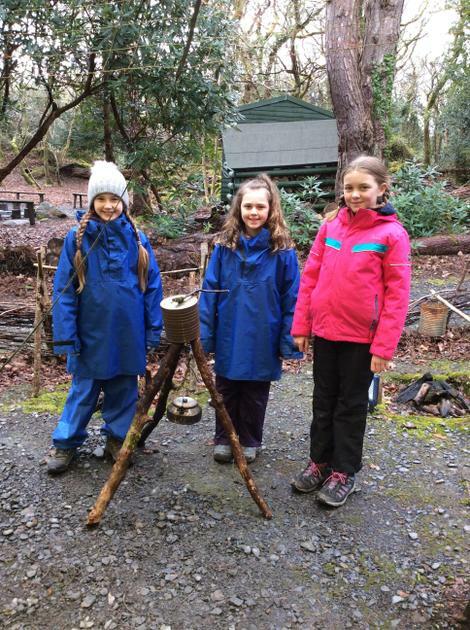 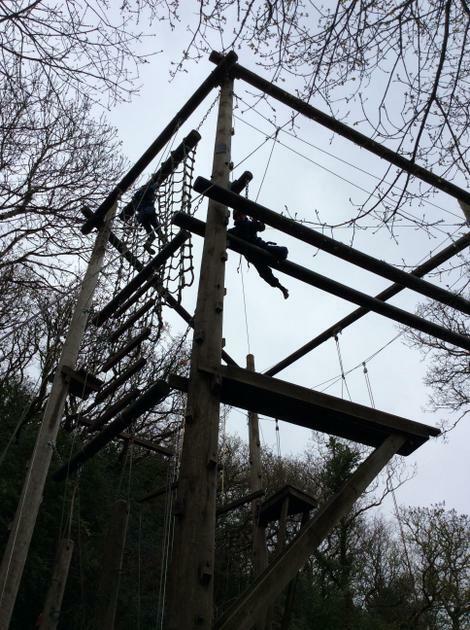 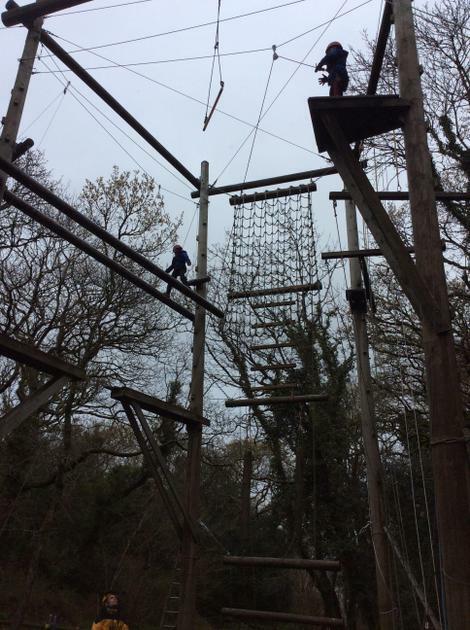 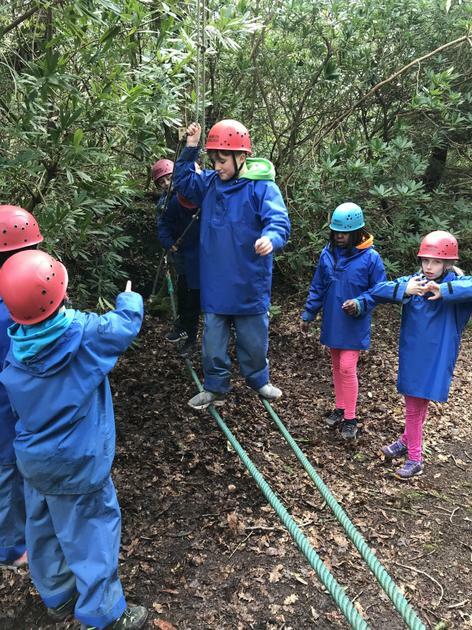 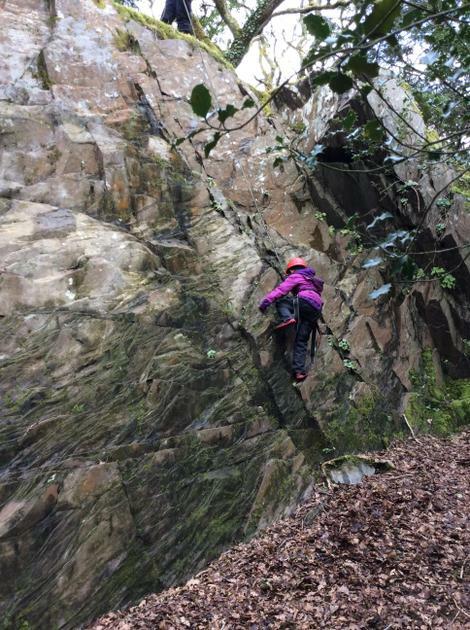 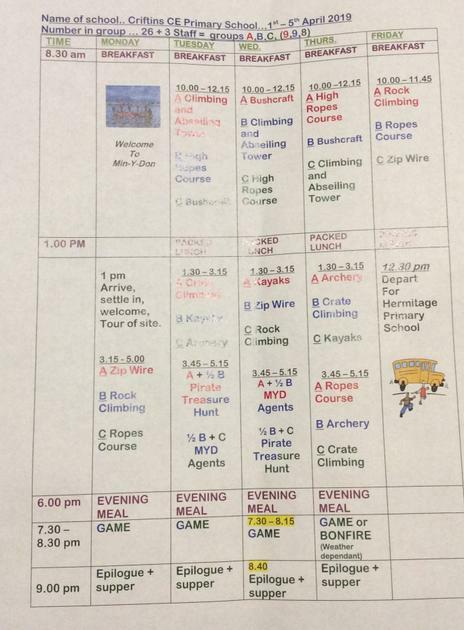 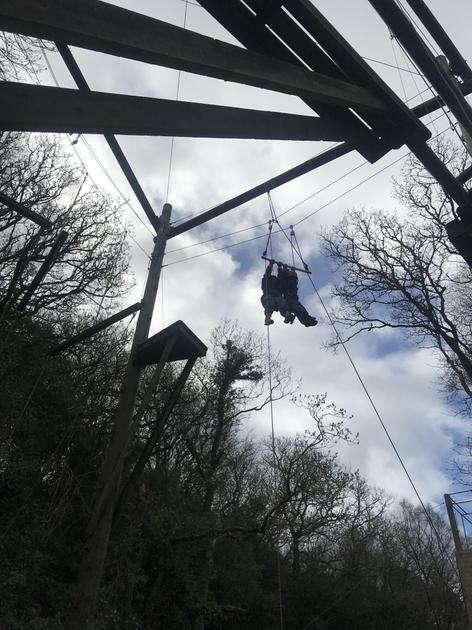 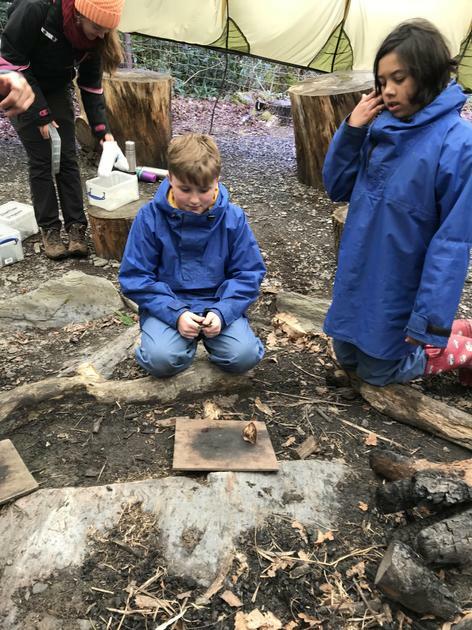 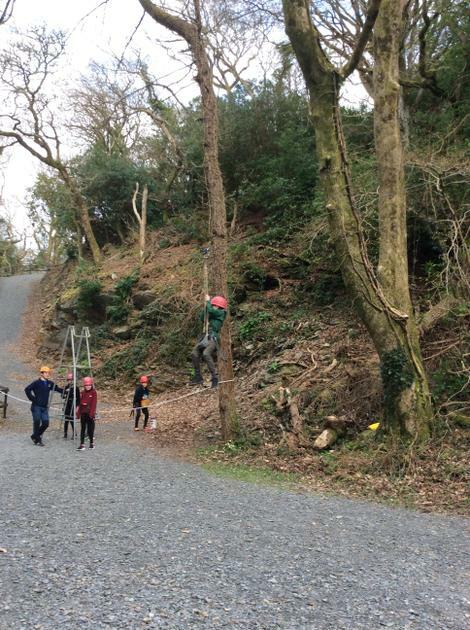 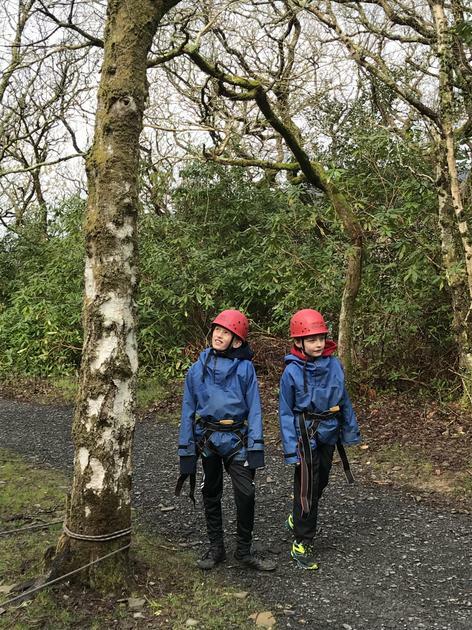 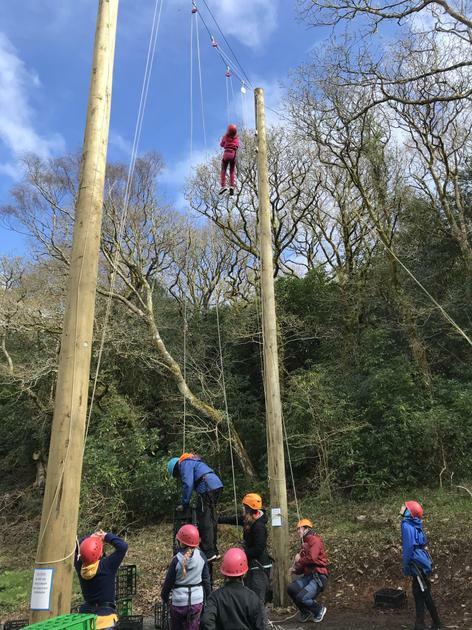 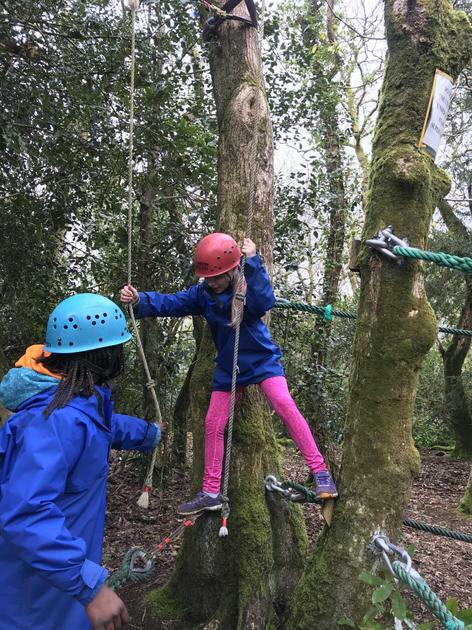 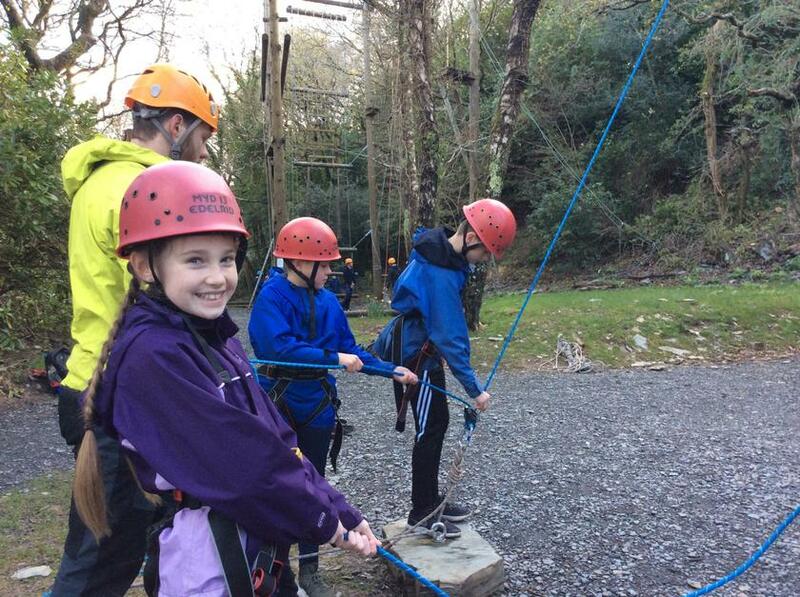 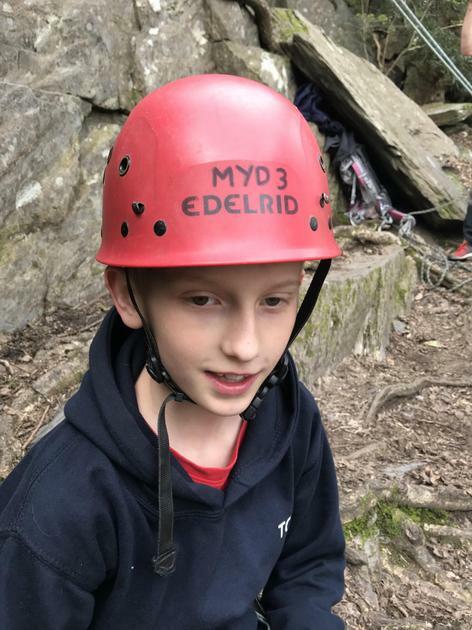 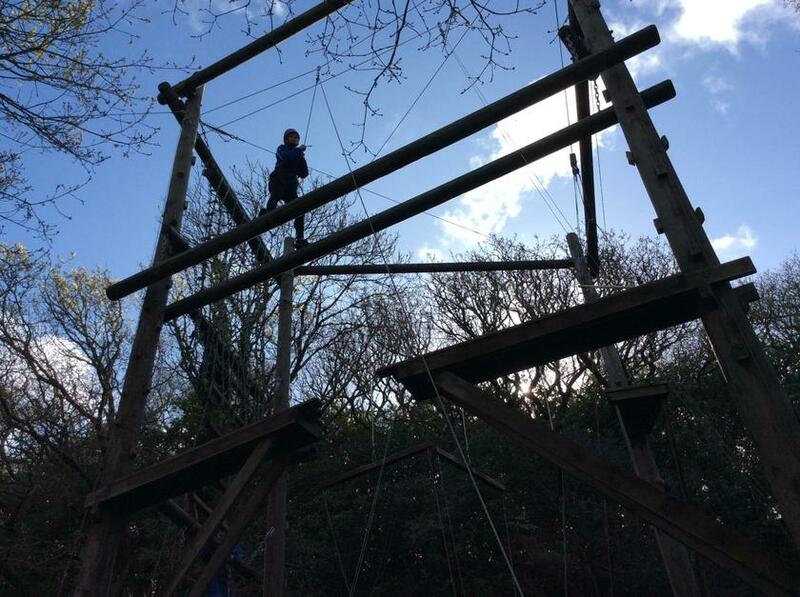 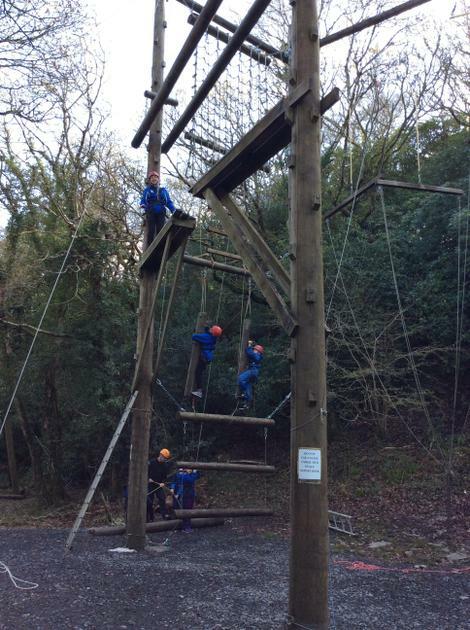 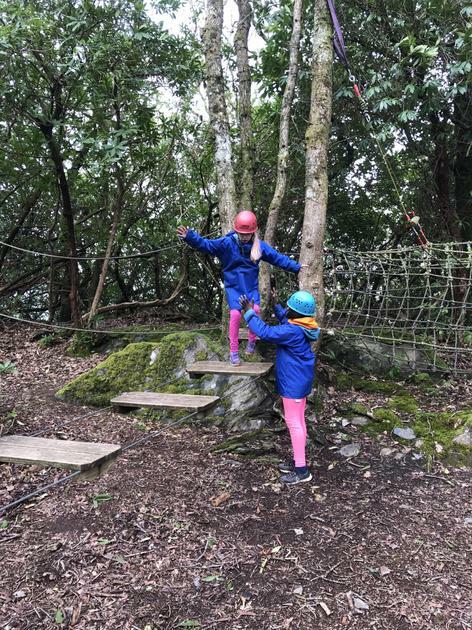 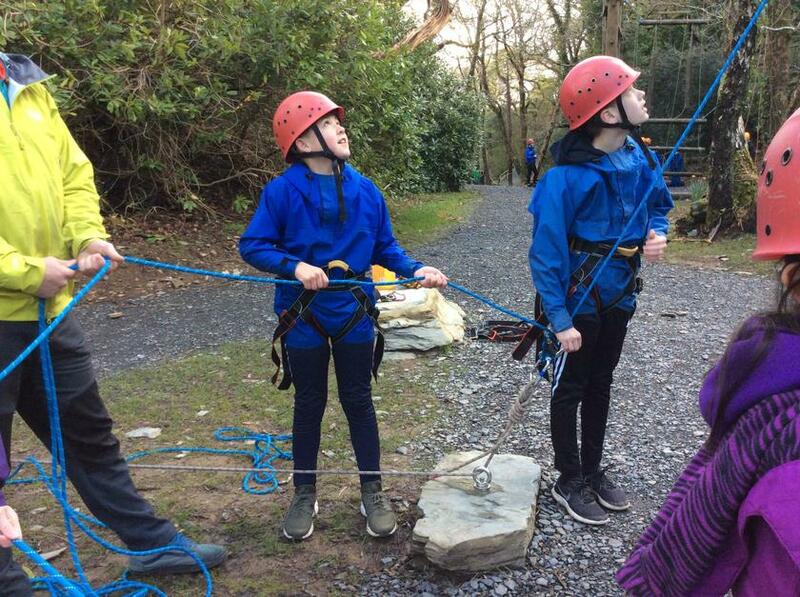 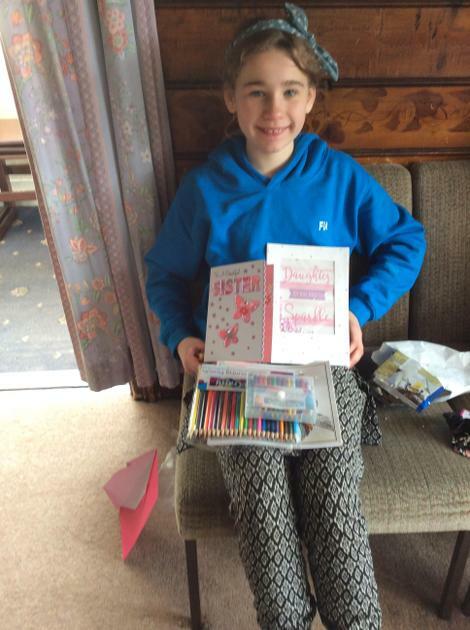 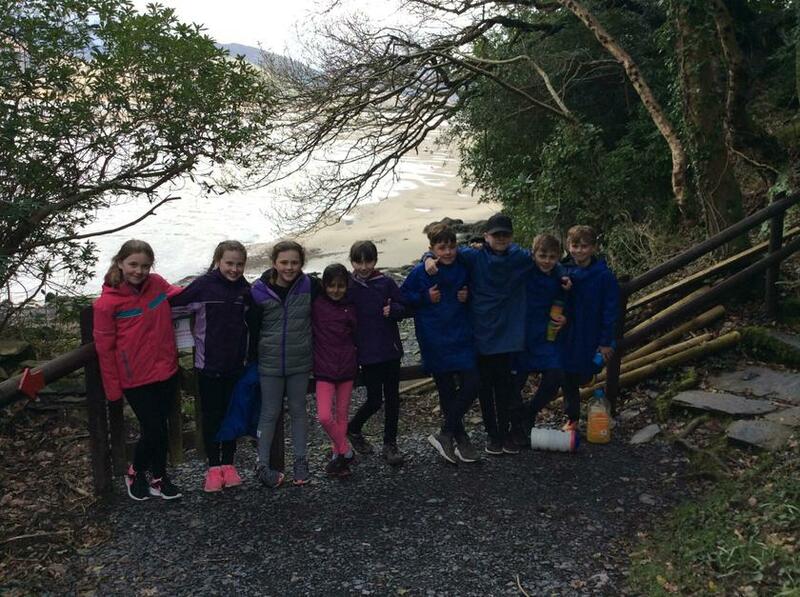 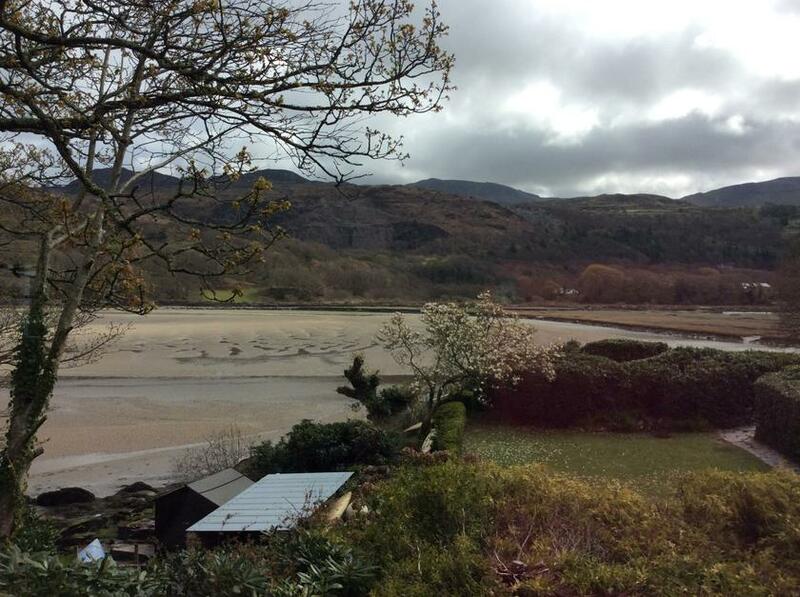 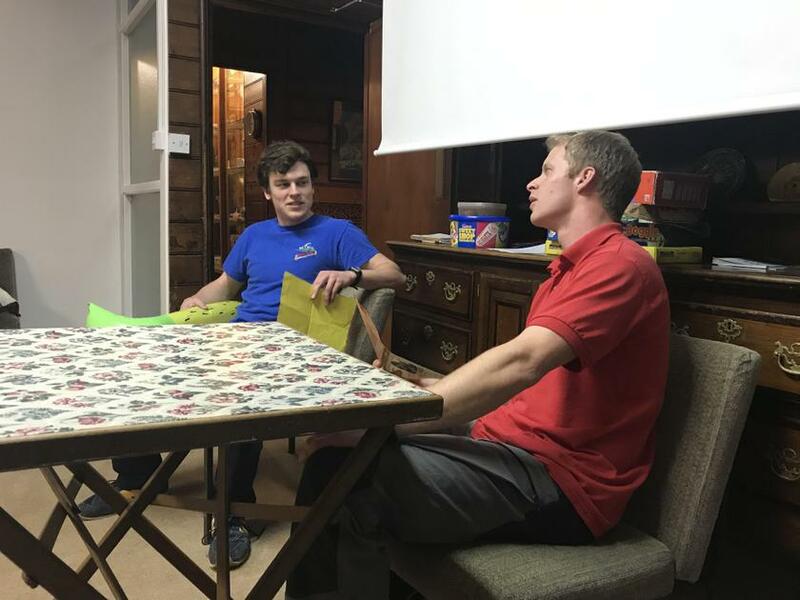 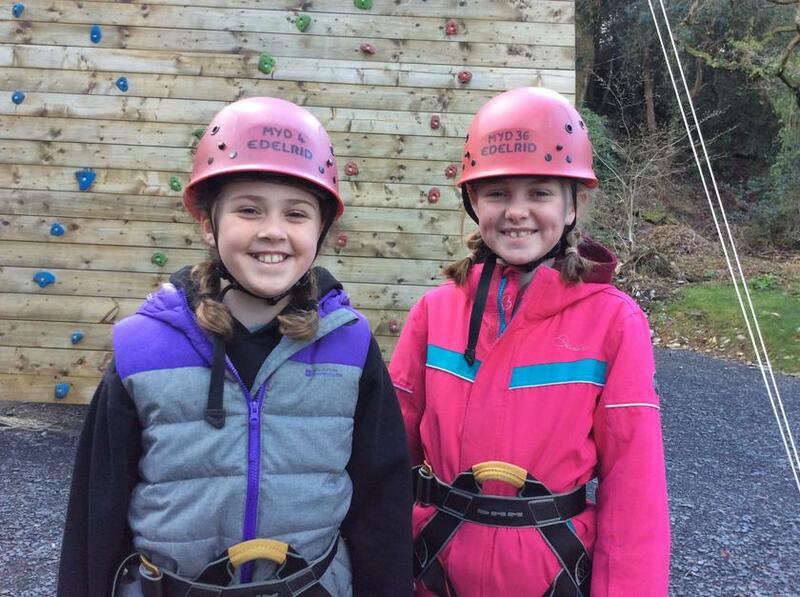 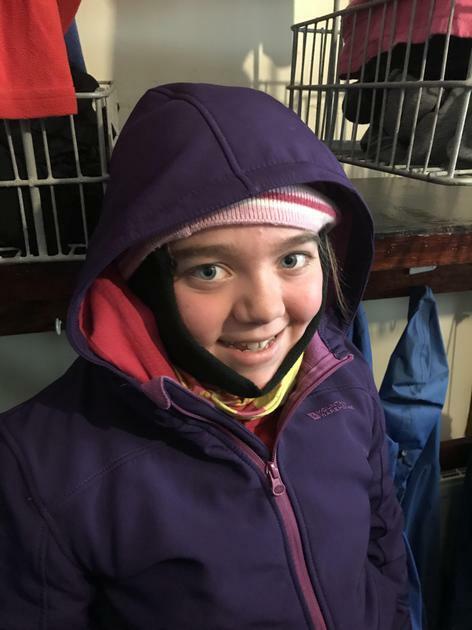 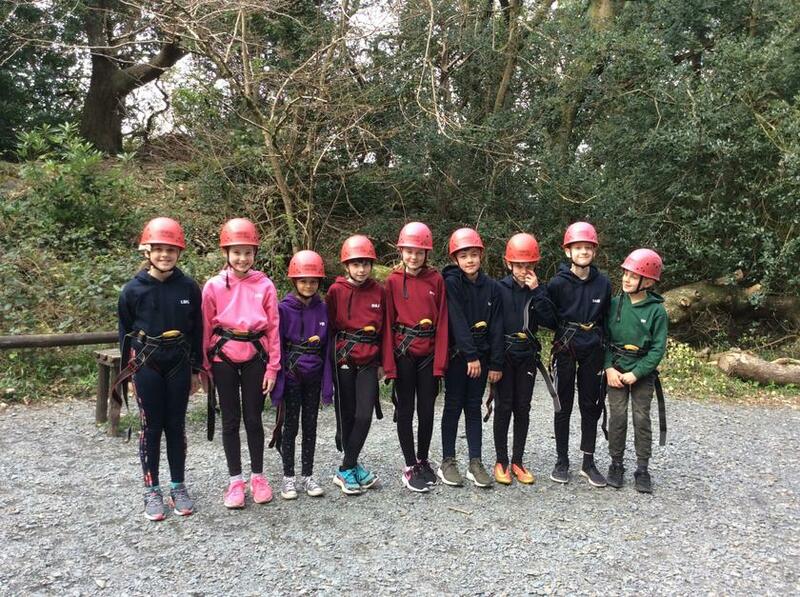 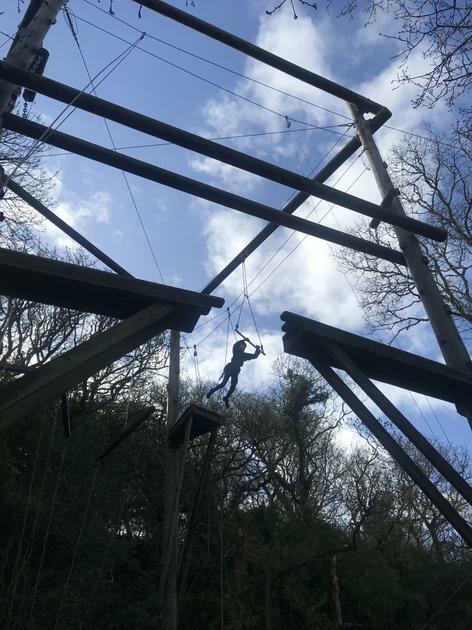 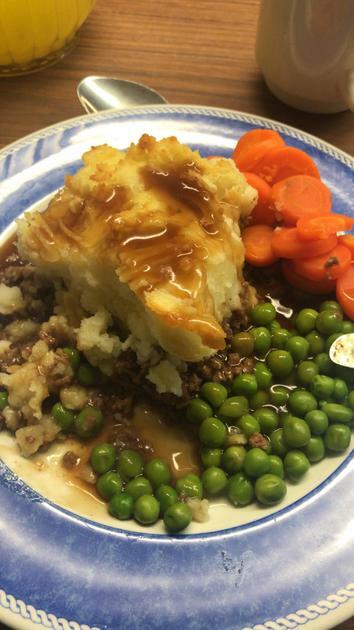 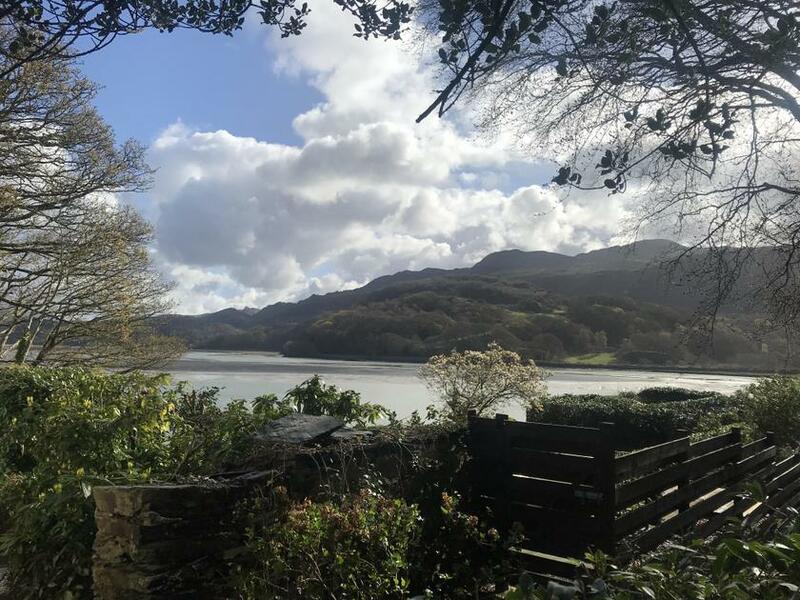 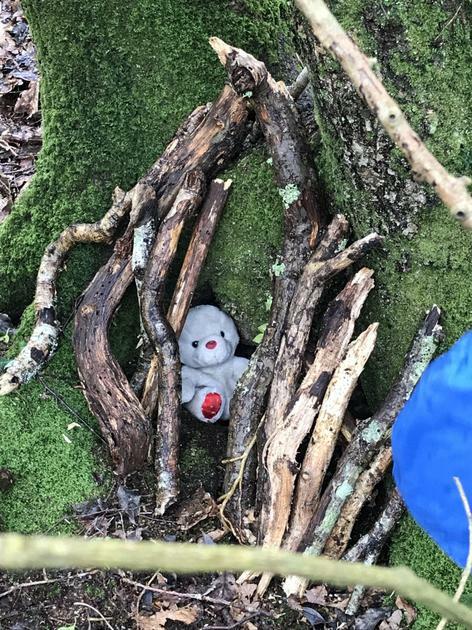 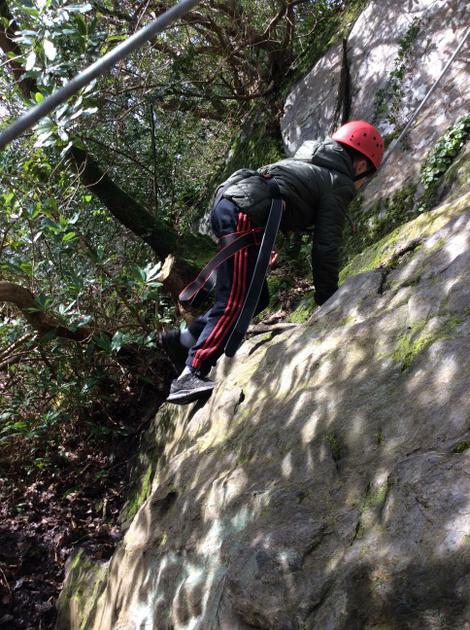 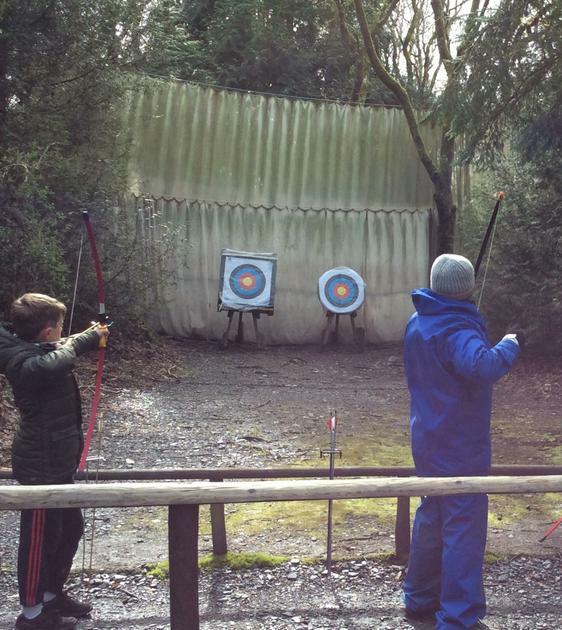 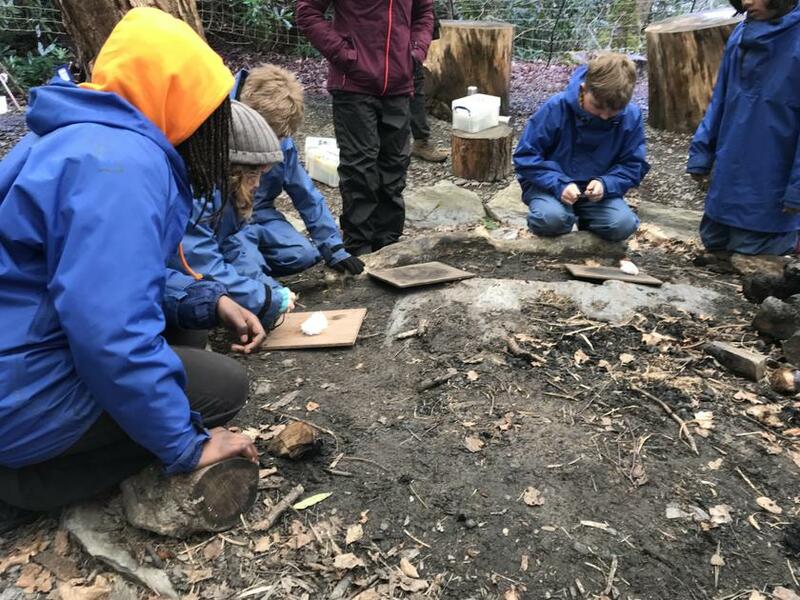 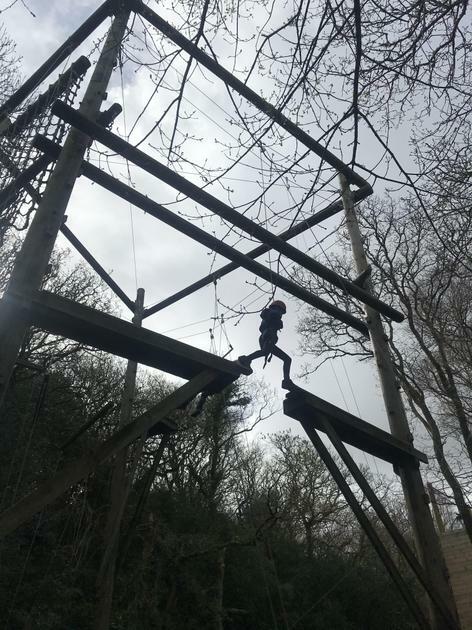 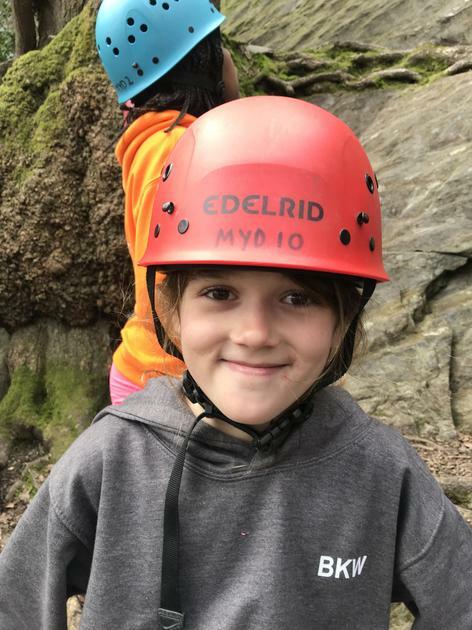 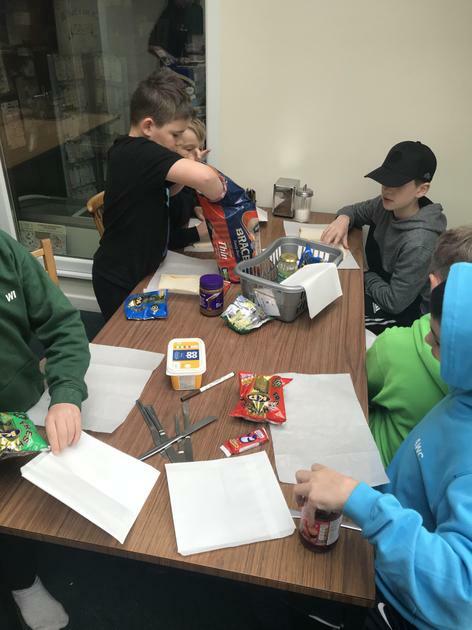 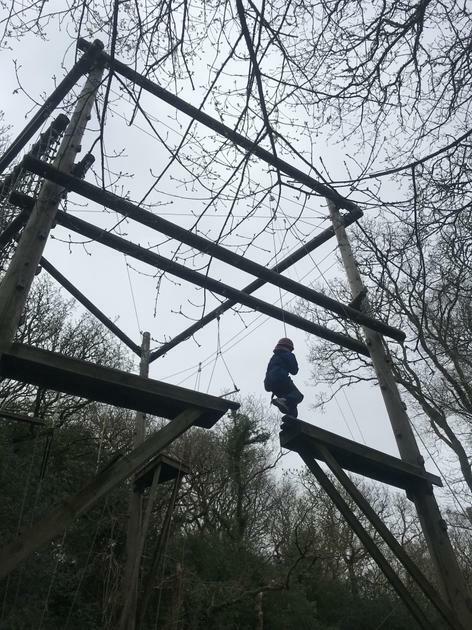 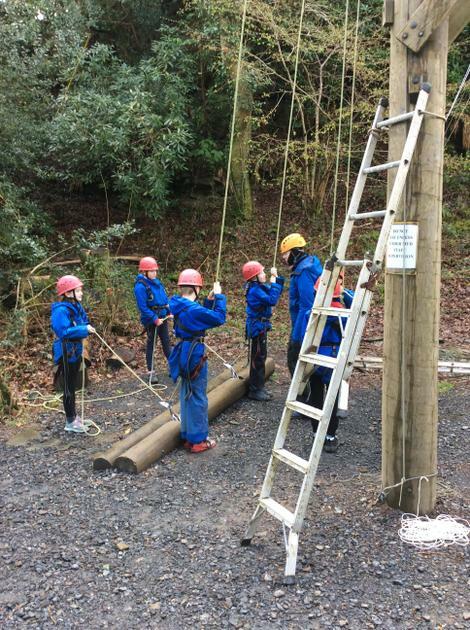 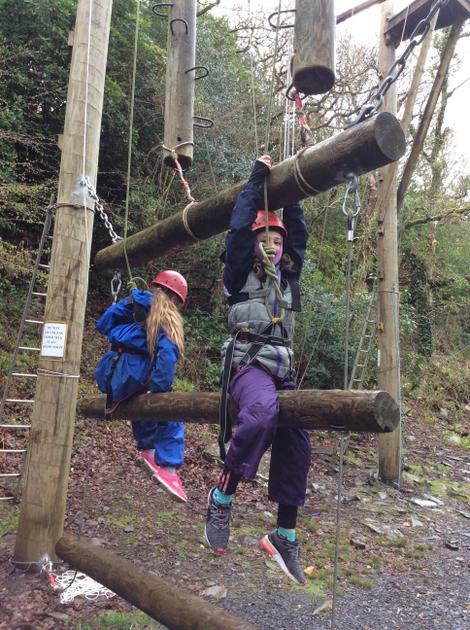 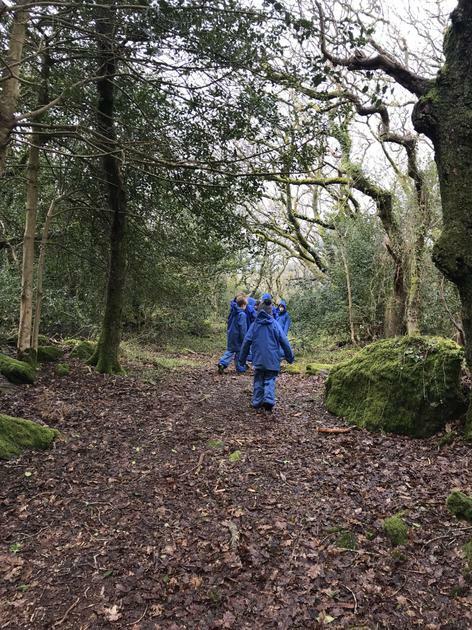 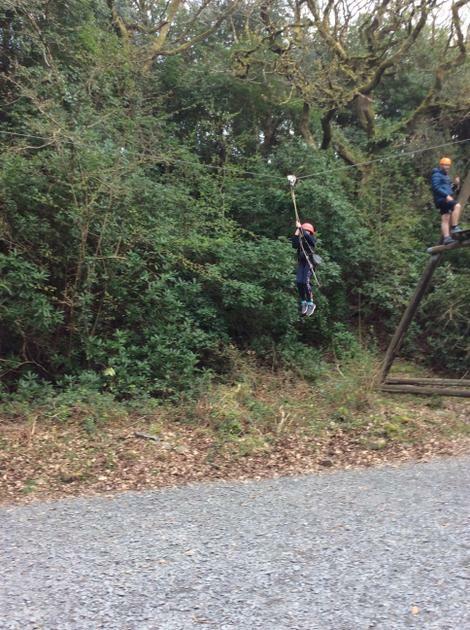 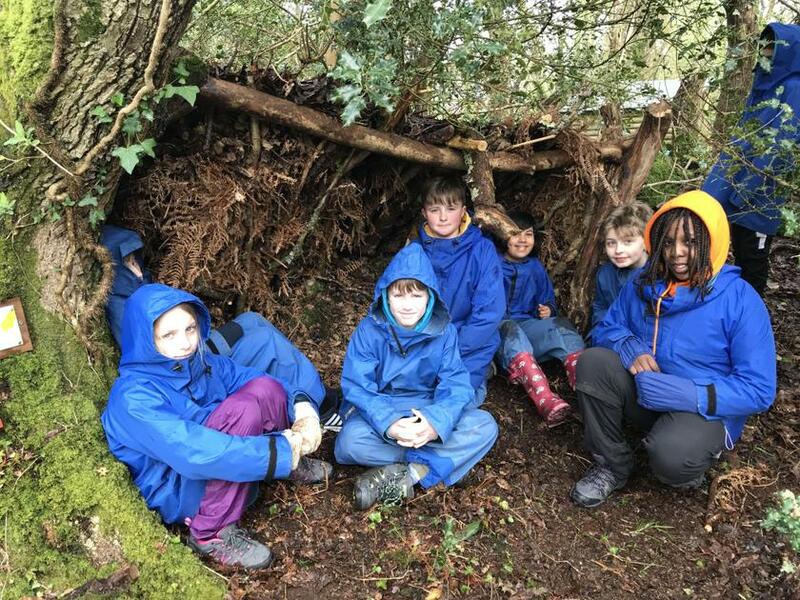 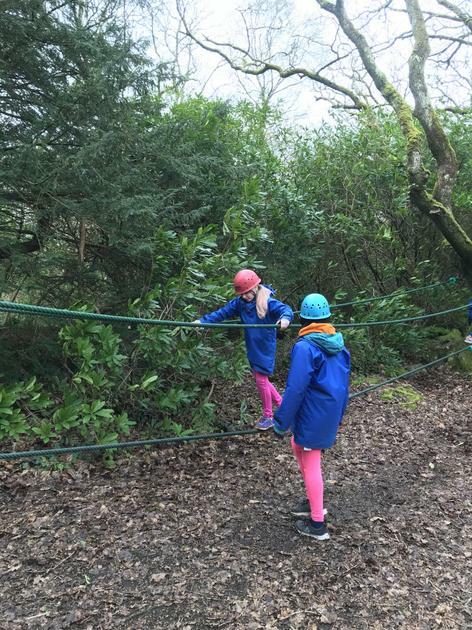 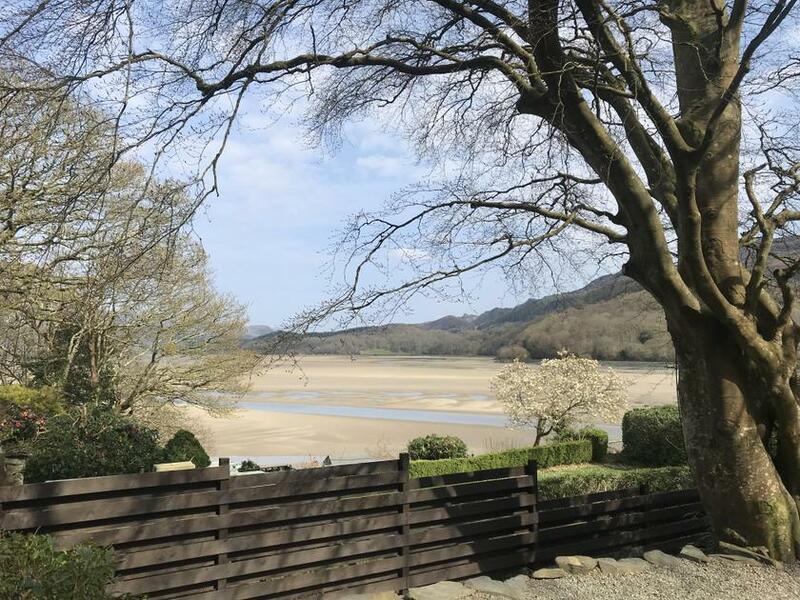 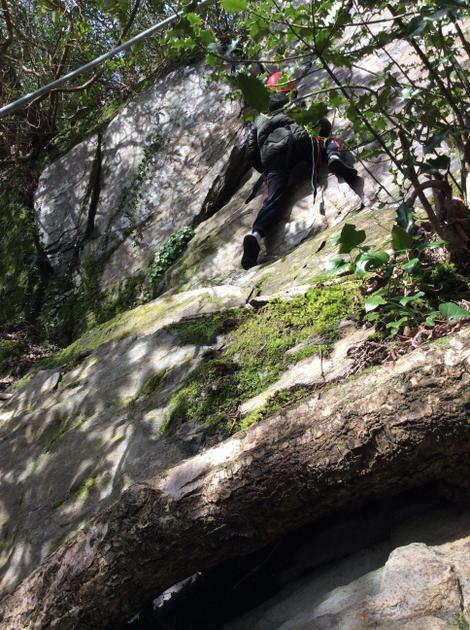 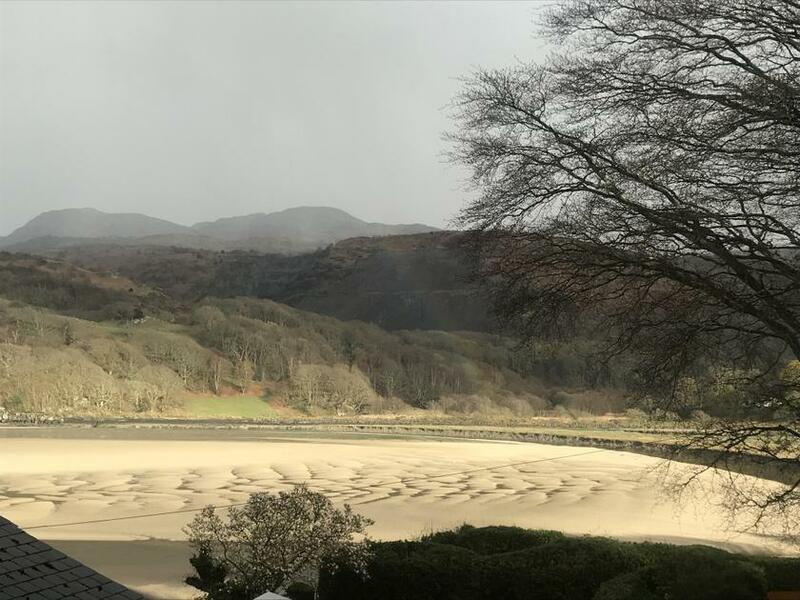 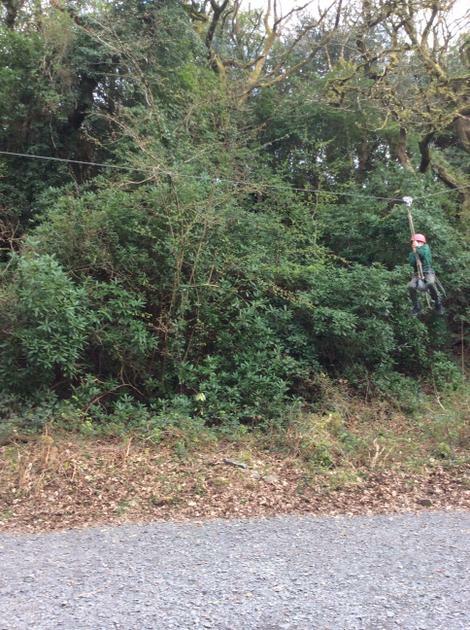 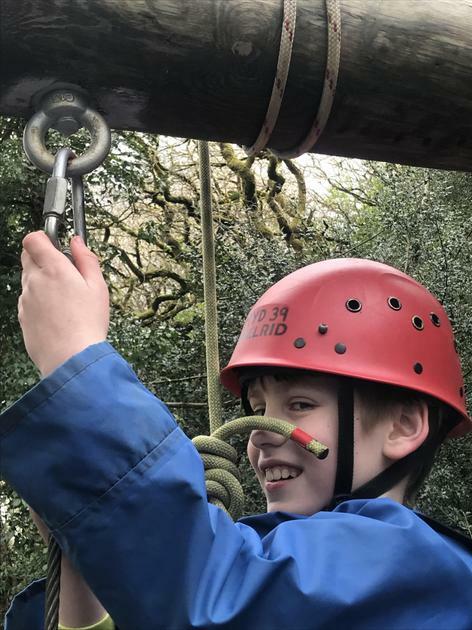 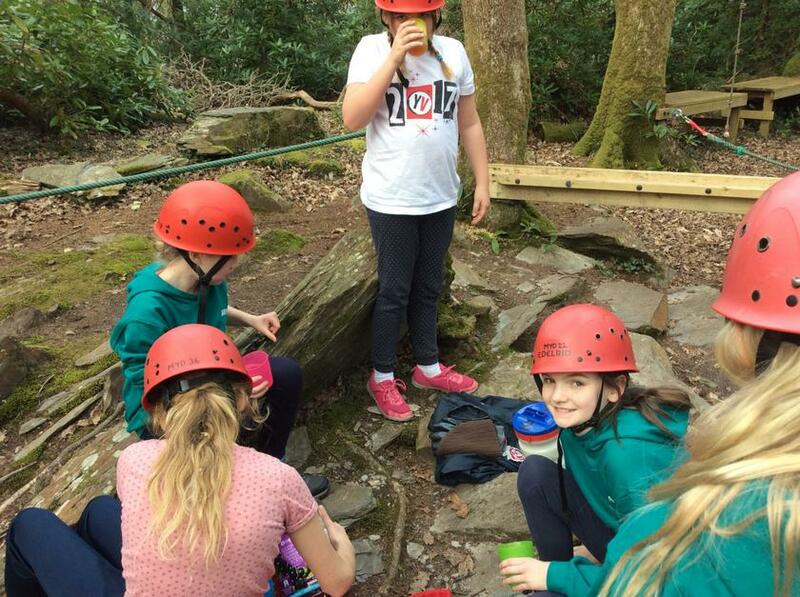 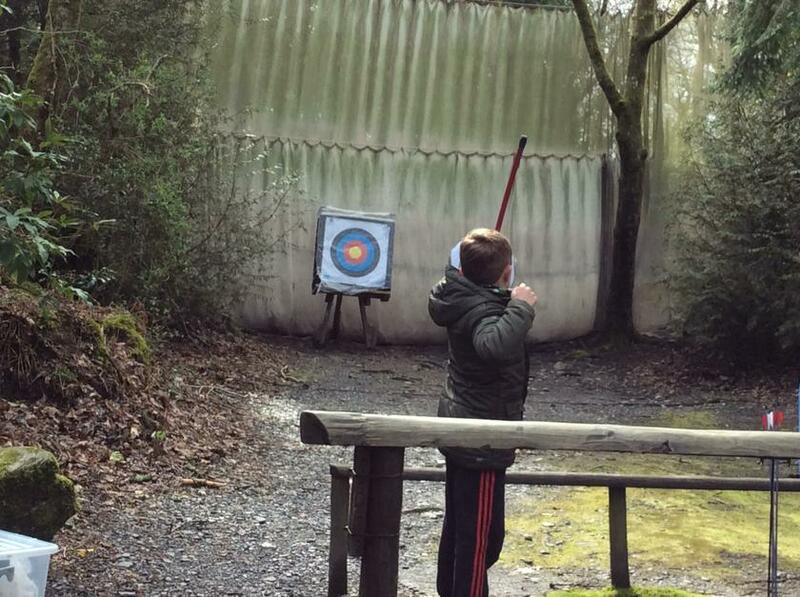 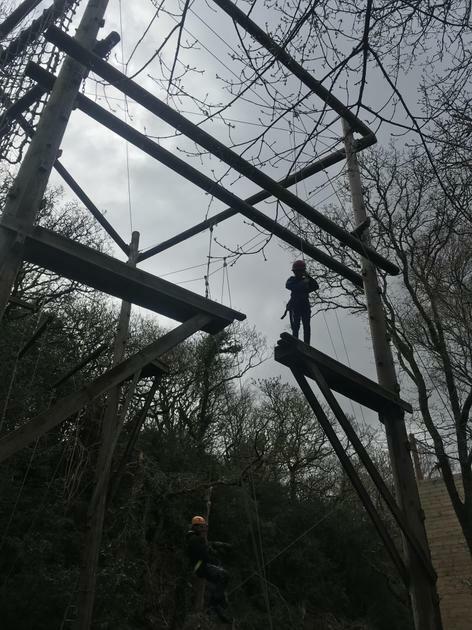 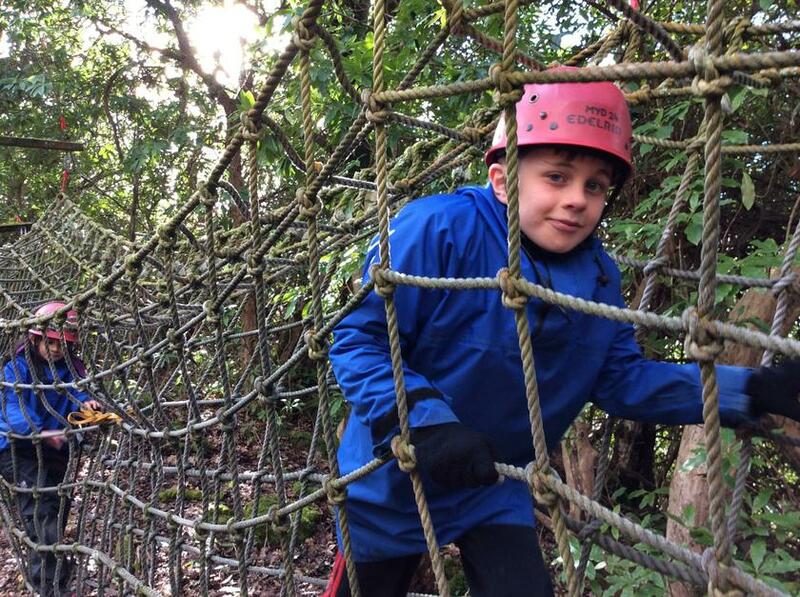 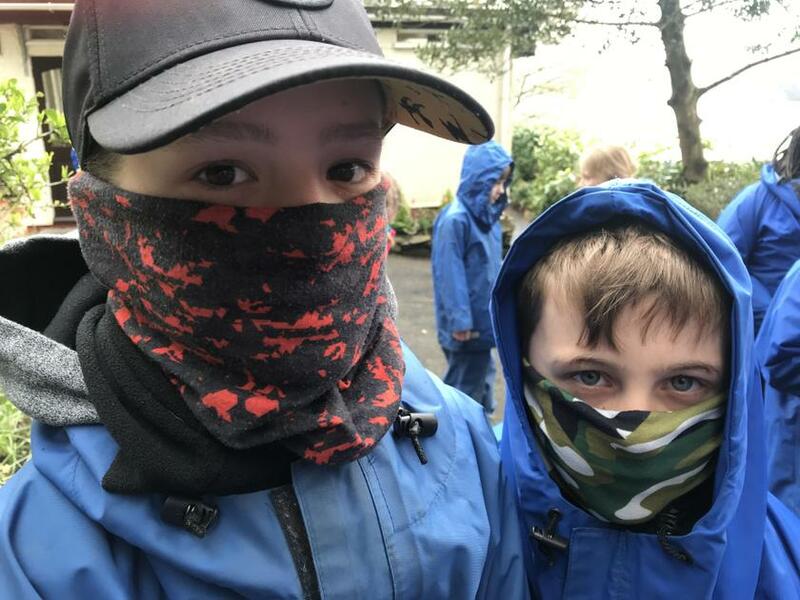 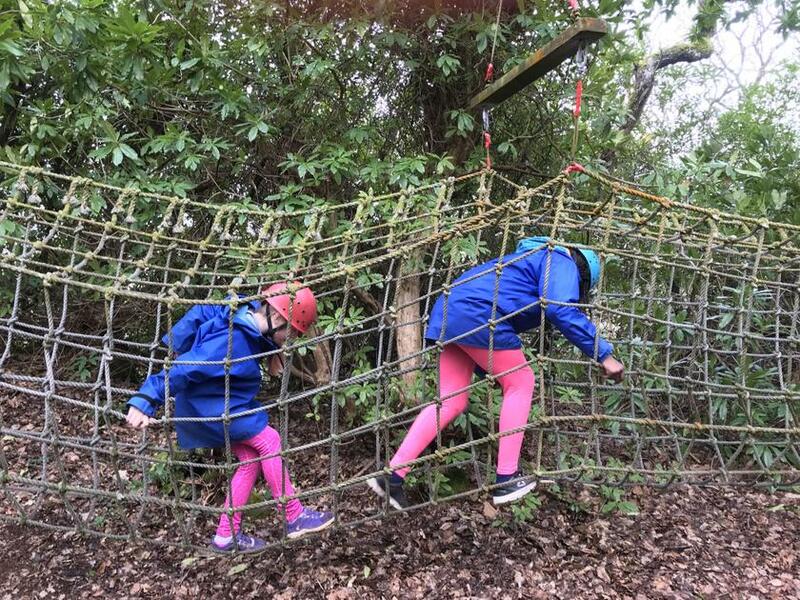 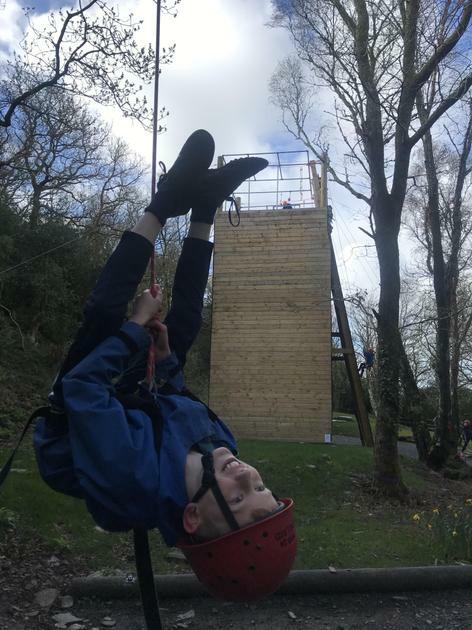 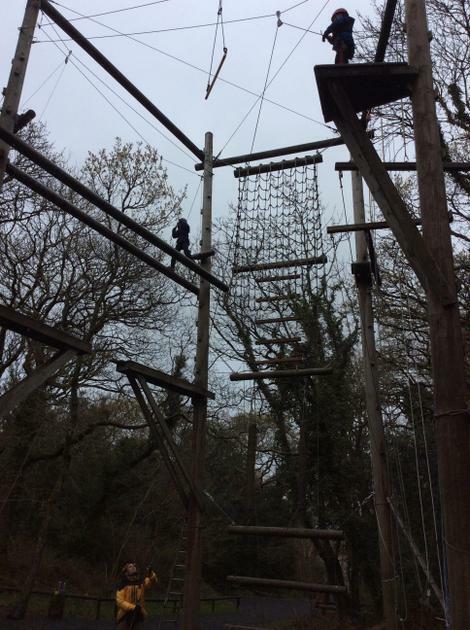 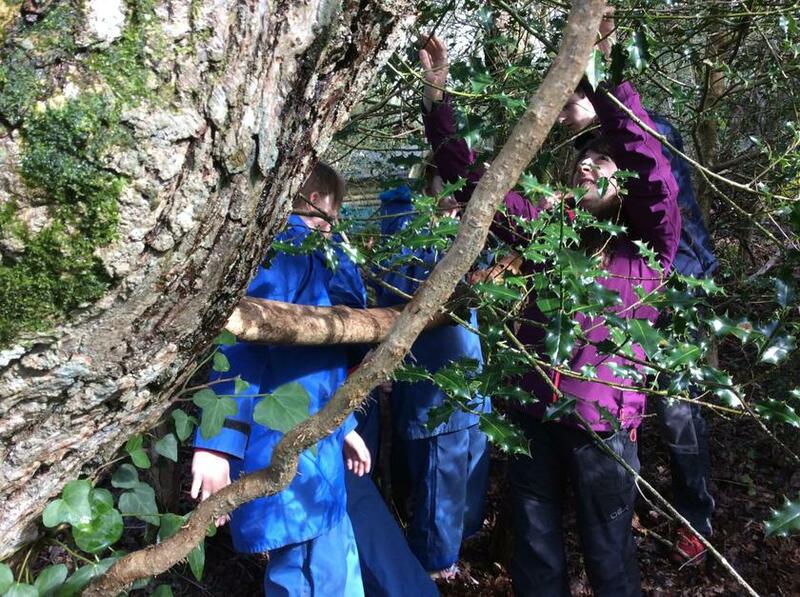 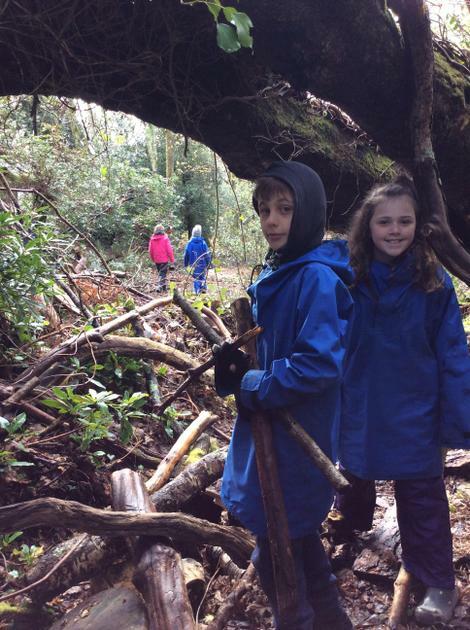 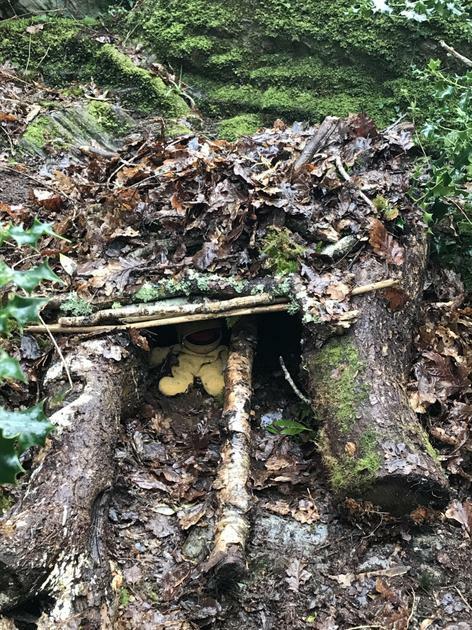 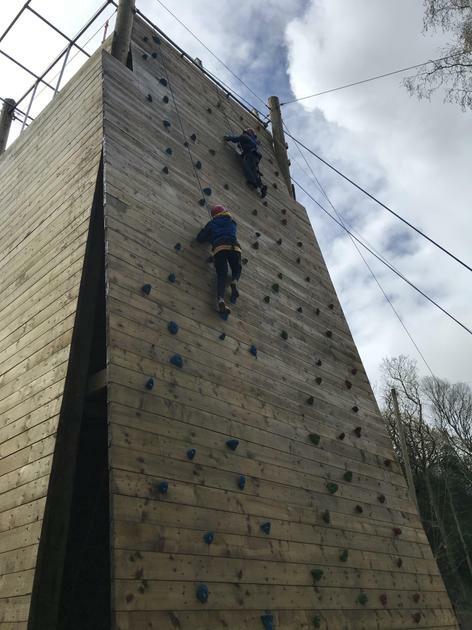 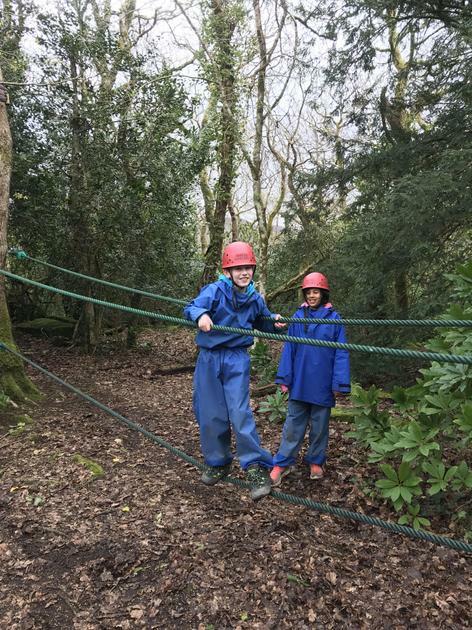 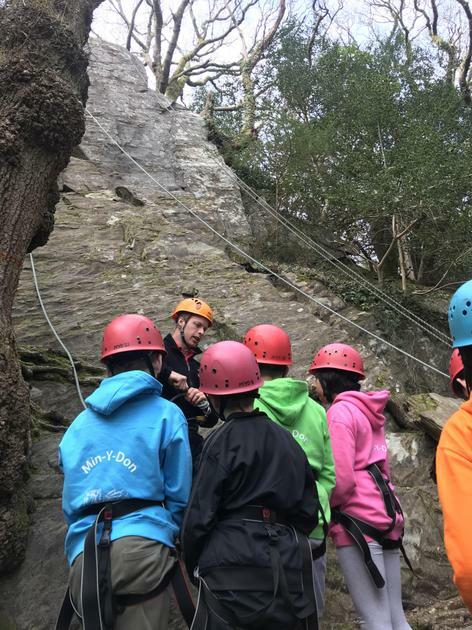 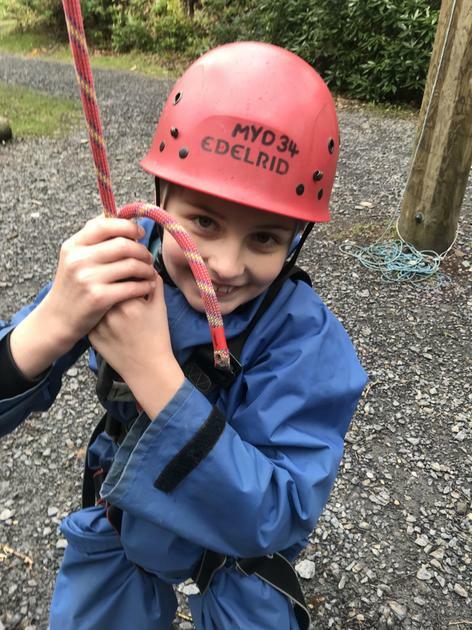 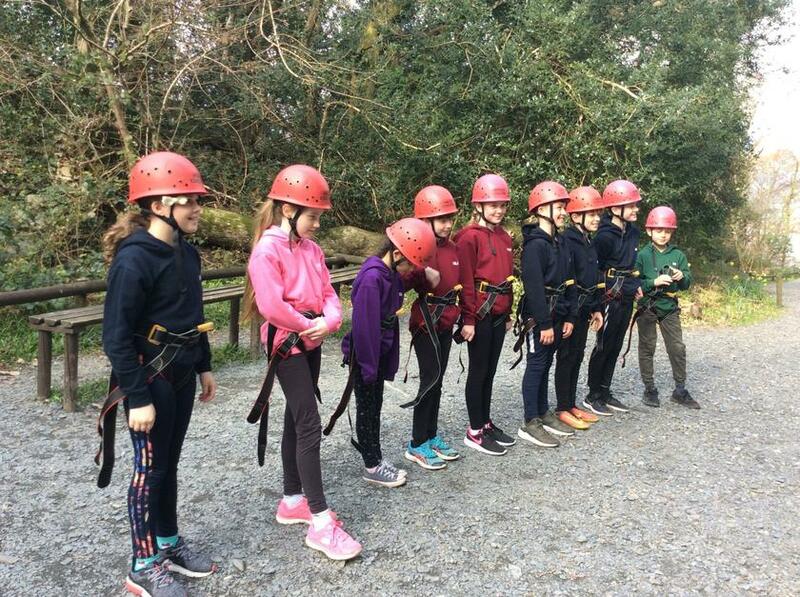 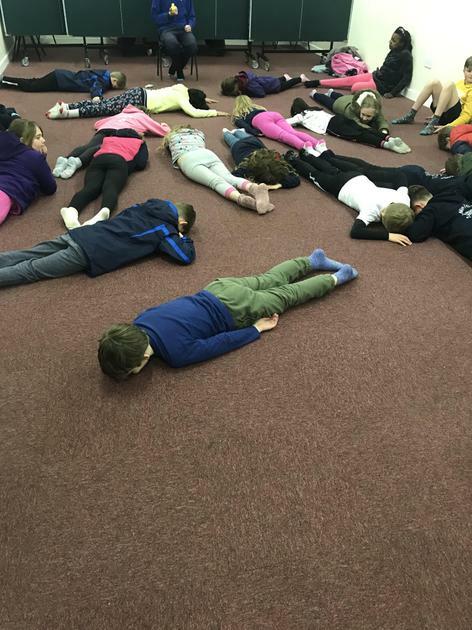 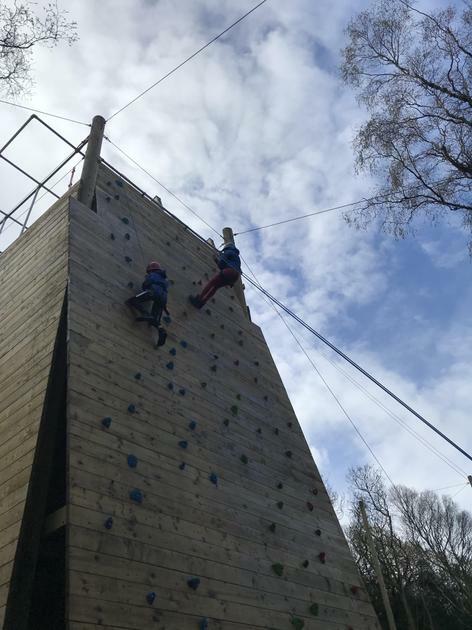 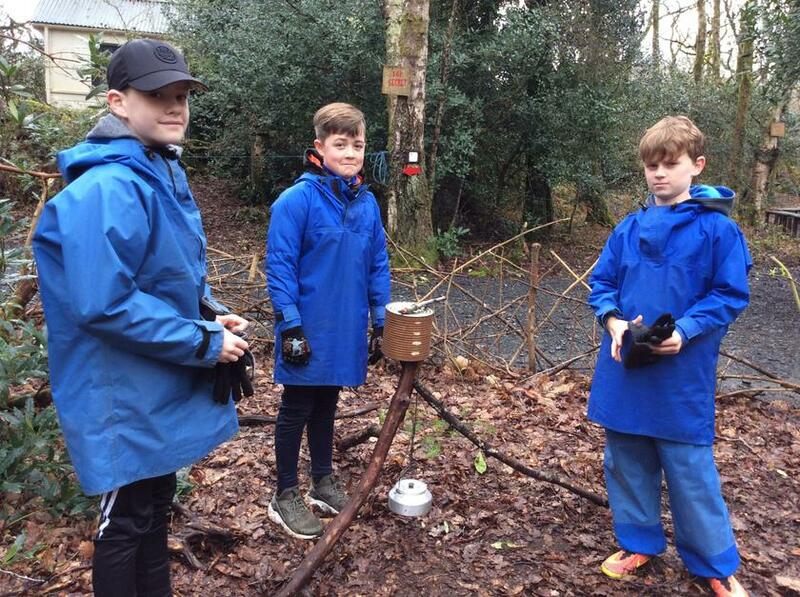 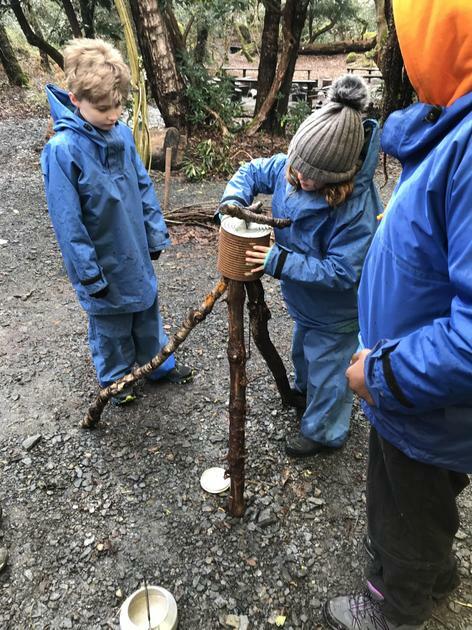 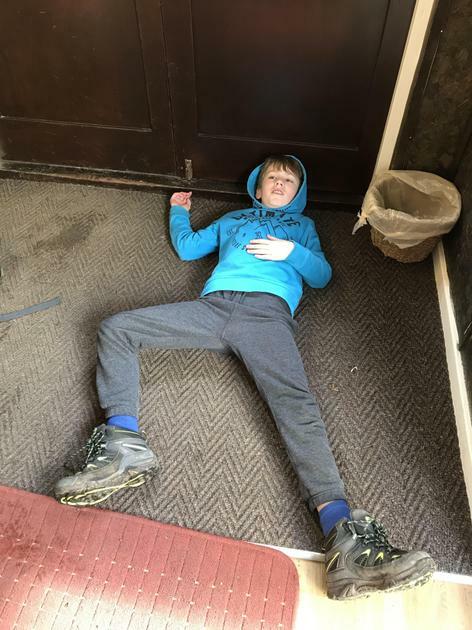 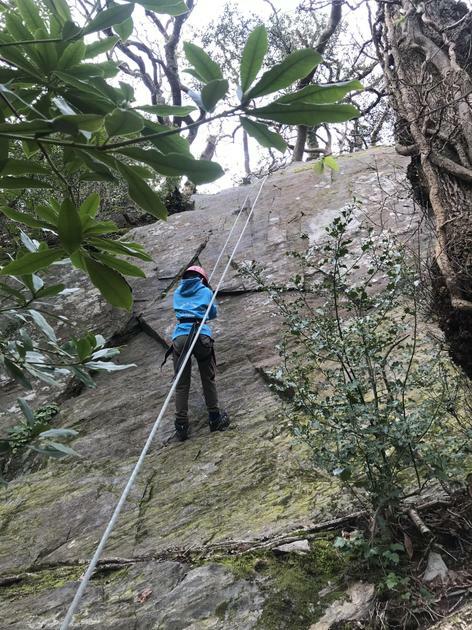 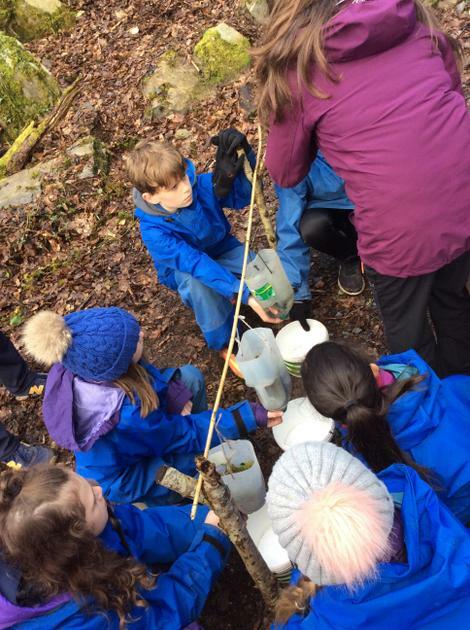 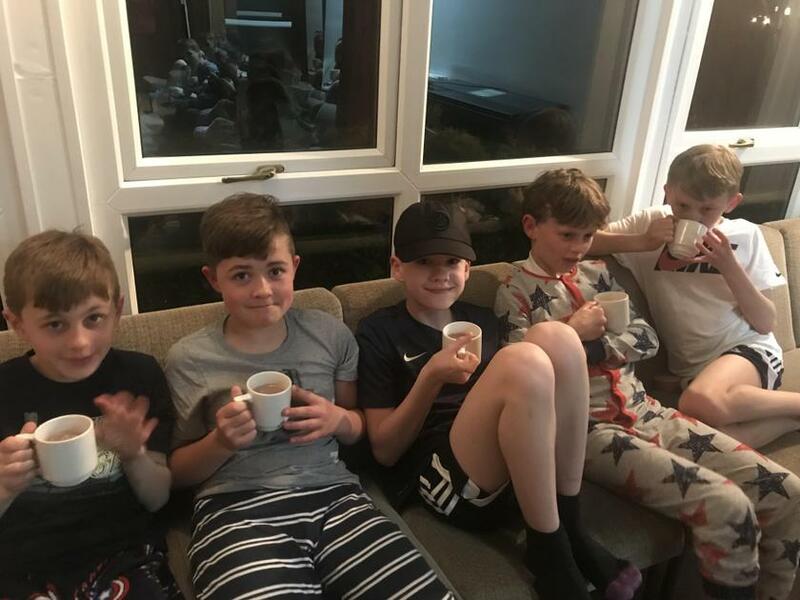 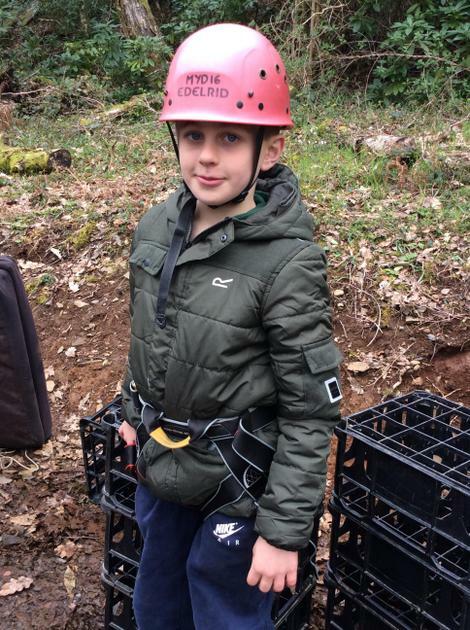 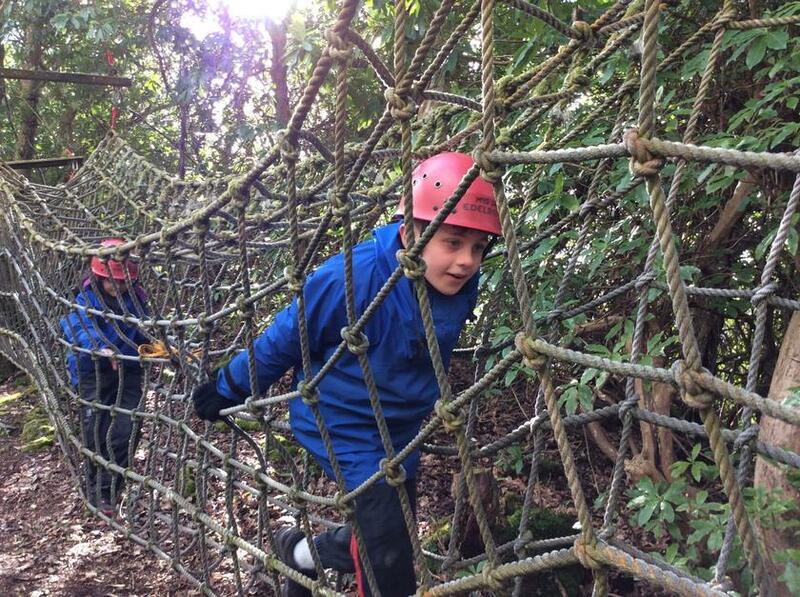 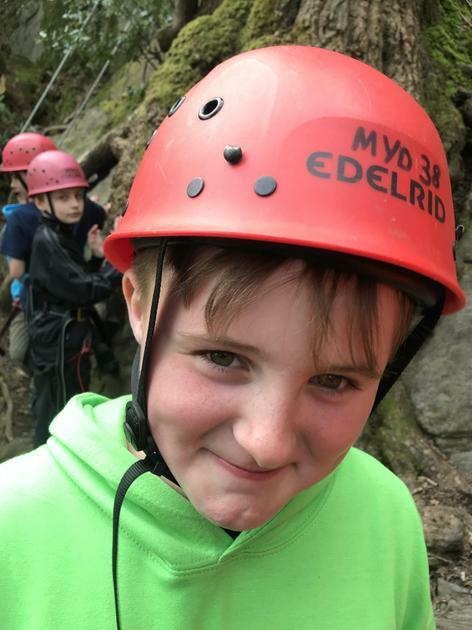 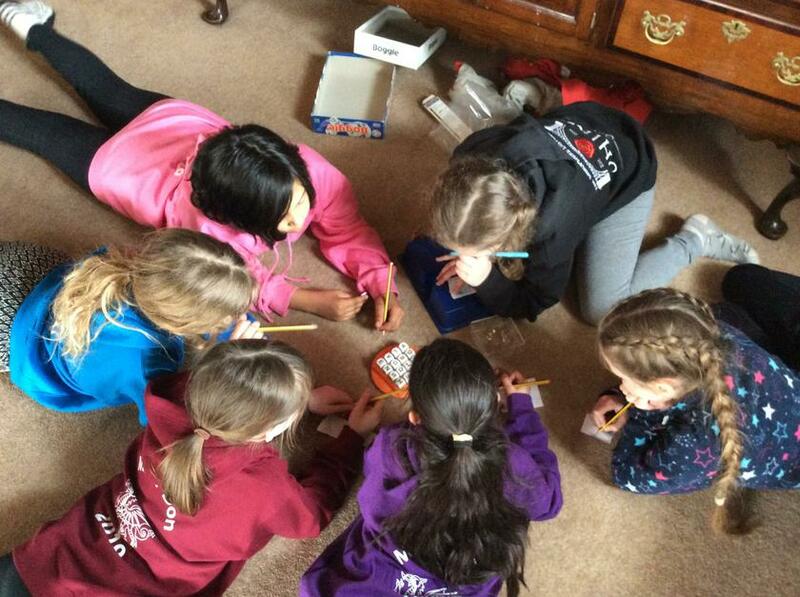 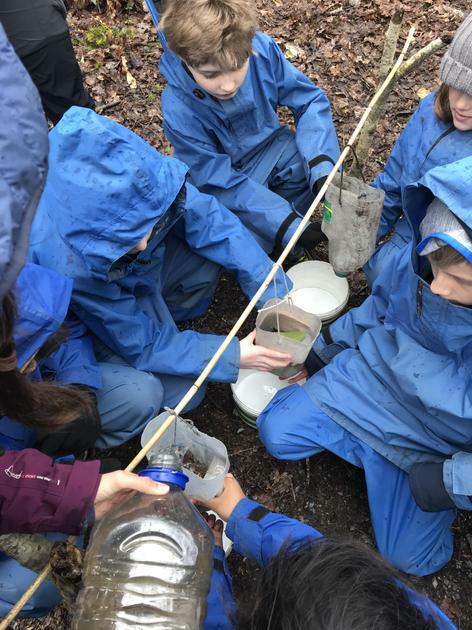 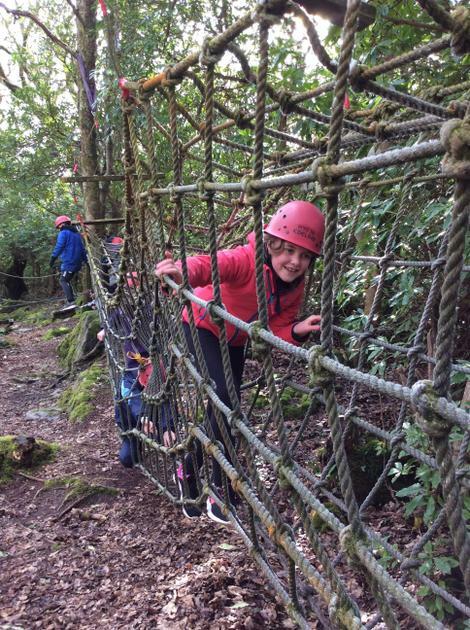 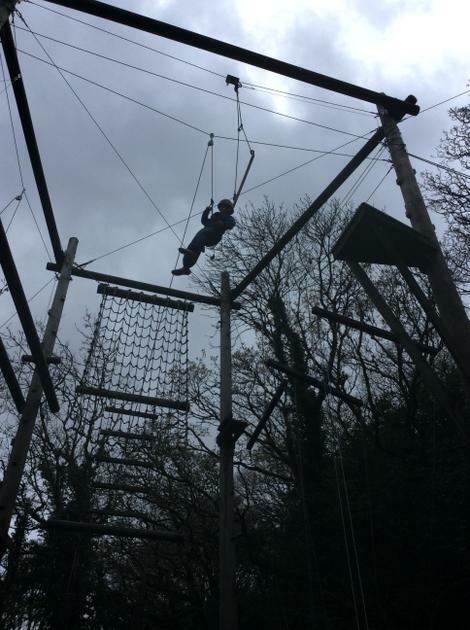 Being away from home is a challenge in itself and it is wonderful to see how pupils have embraced this excitement and also how organised they have been for each activity. 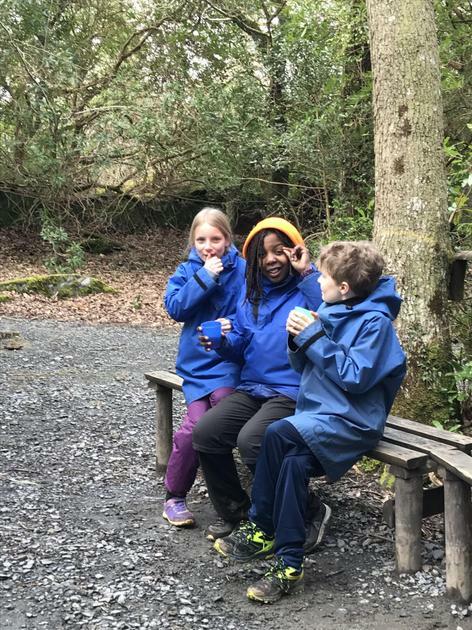 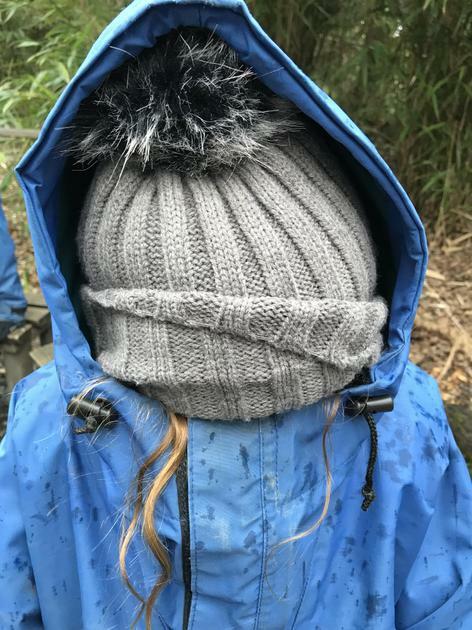 After a tasty breakfast we all wrapped ourselves up in layers and waterproofs and set off for our morning challenges. 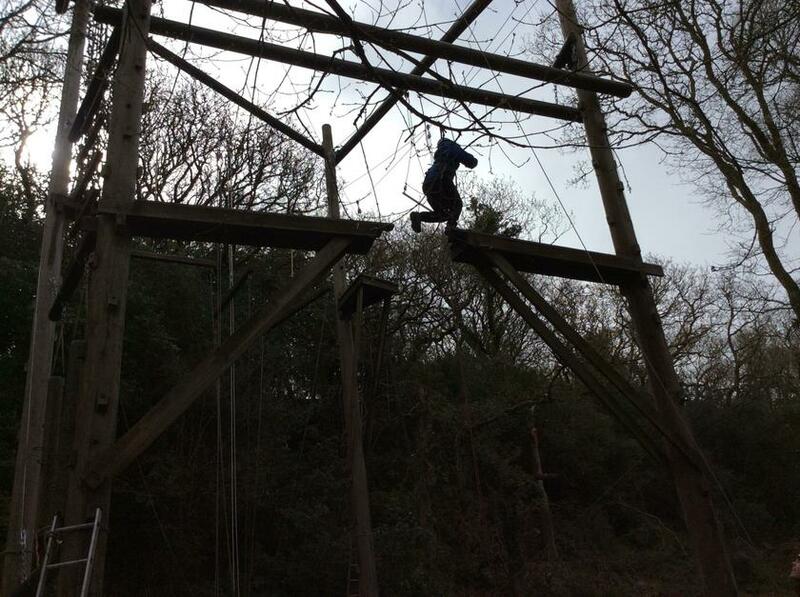 As our day progressed each group has continued to persevere with challenges. 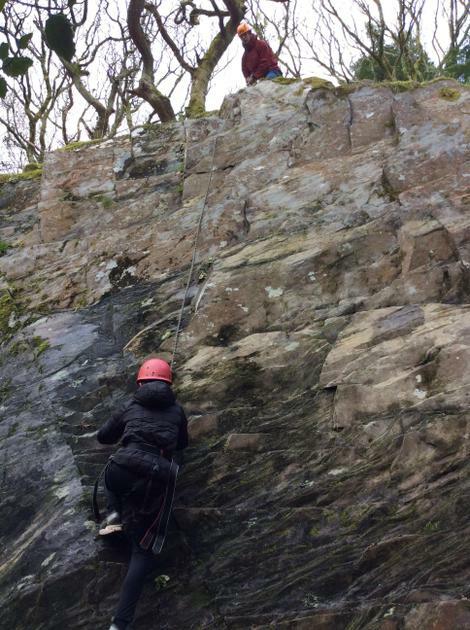 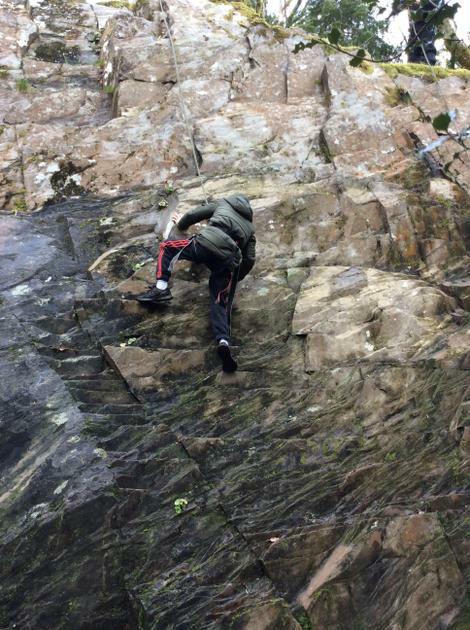 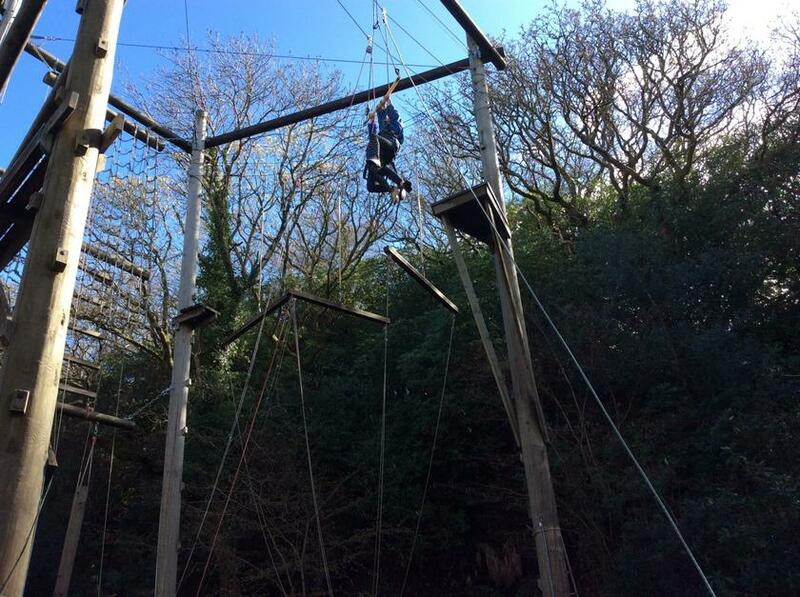 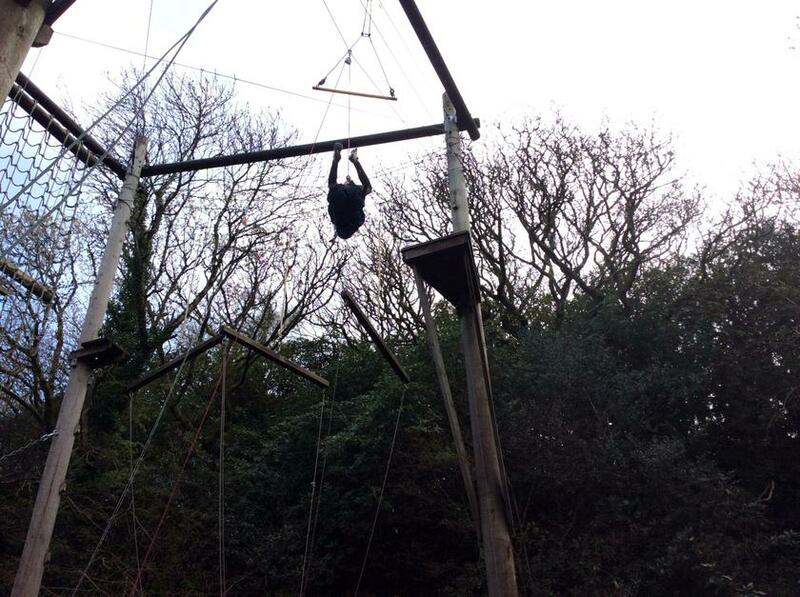 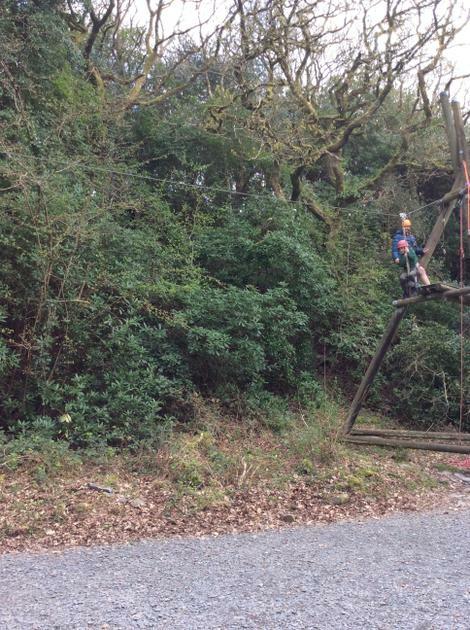 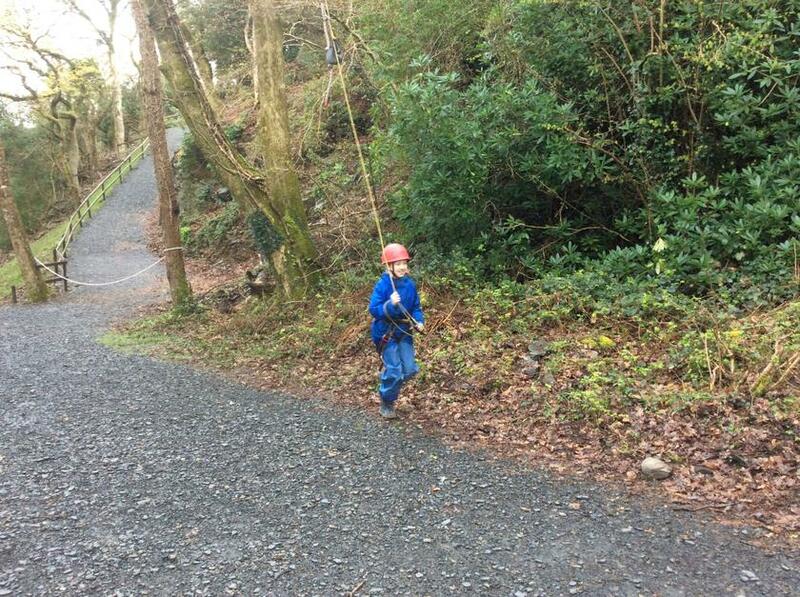 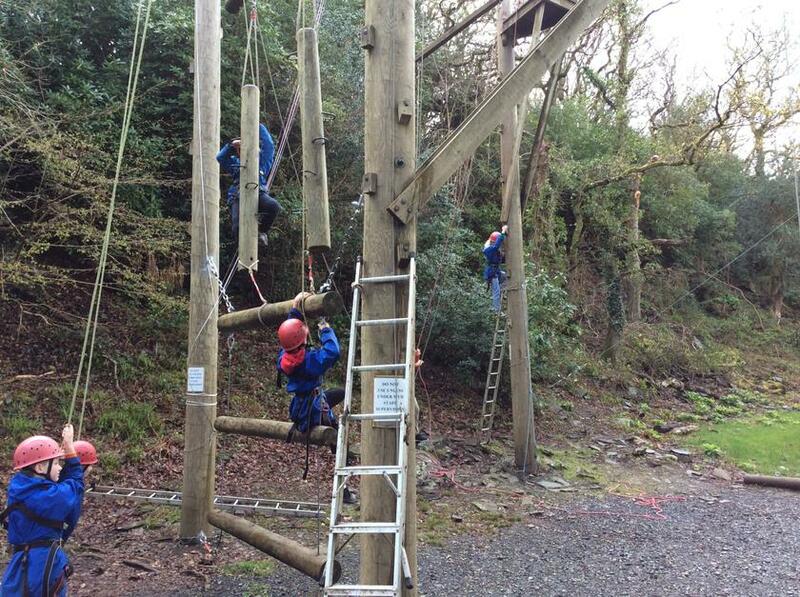 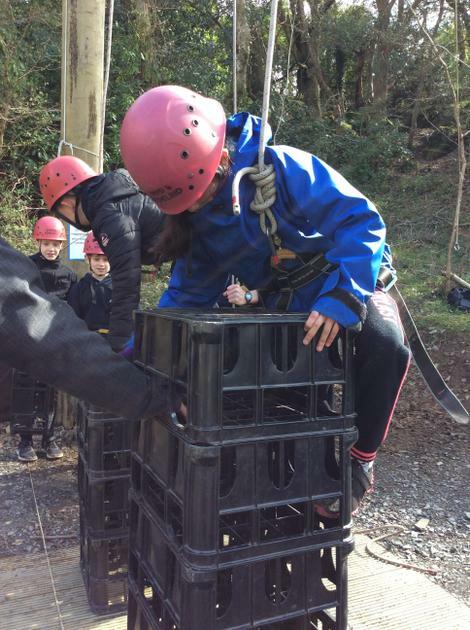 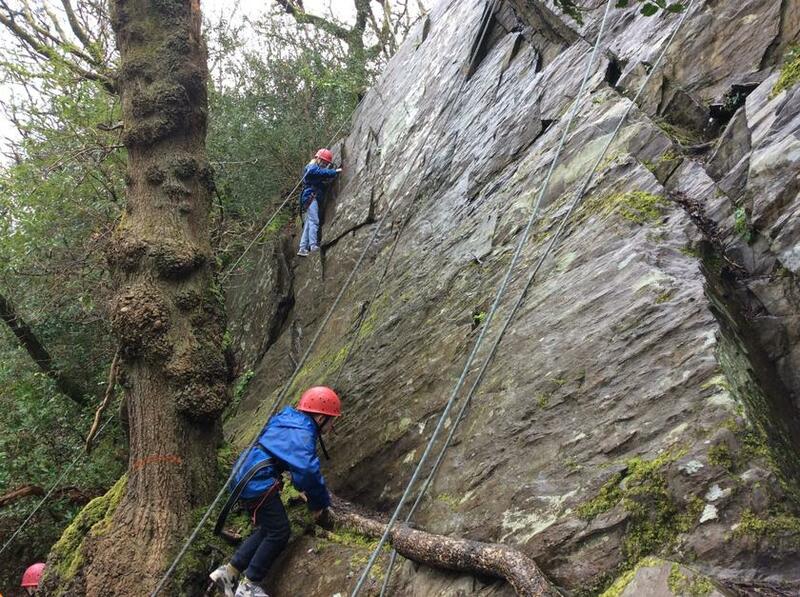 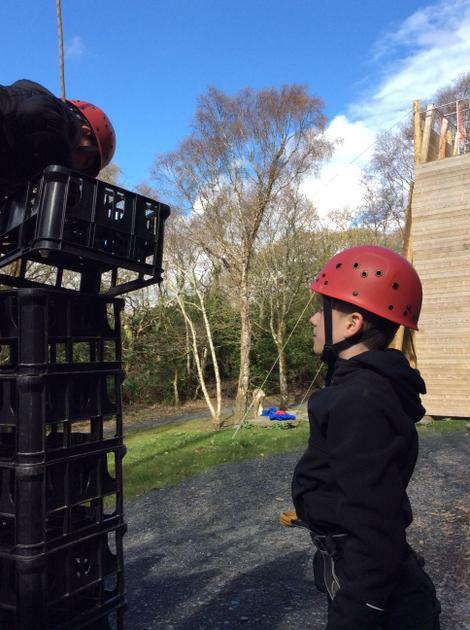 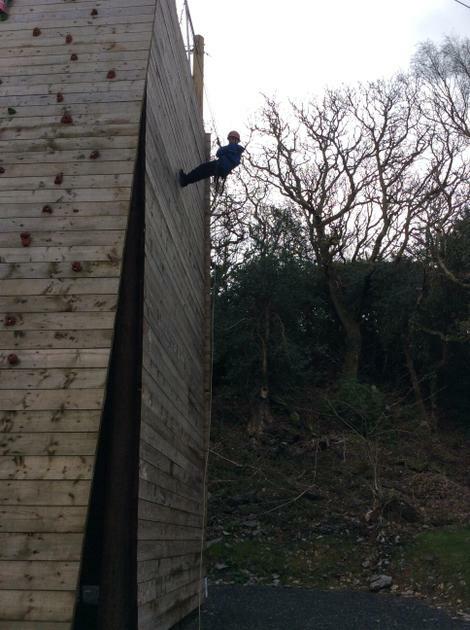 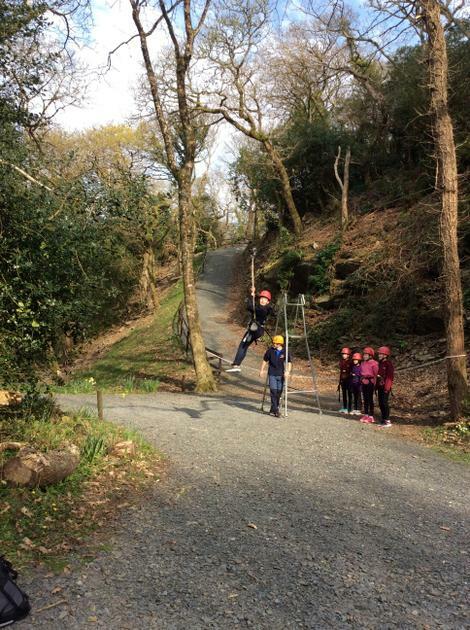 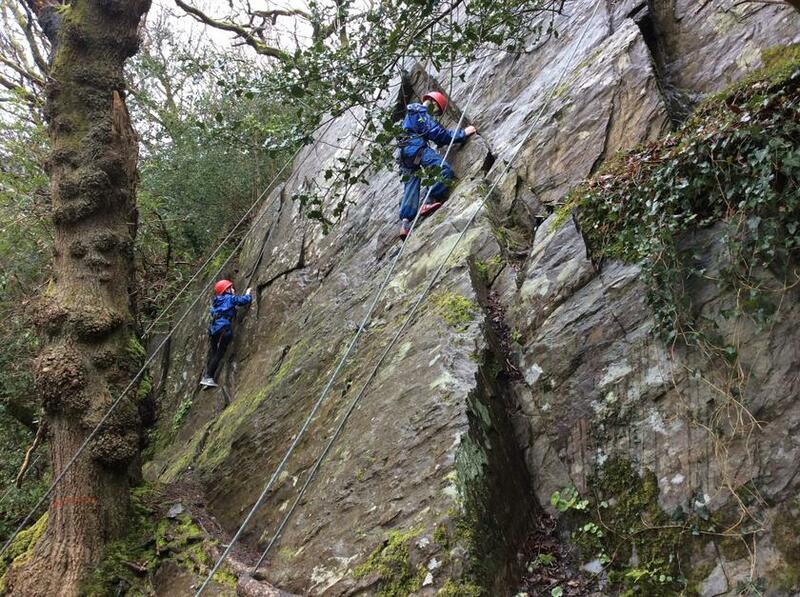 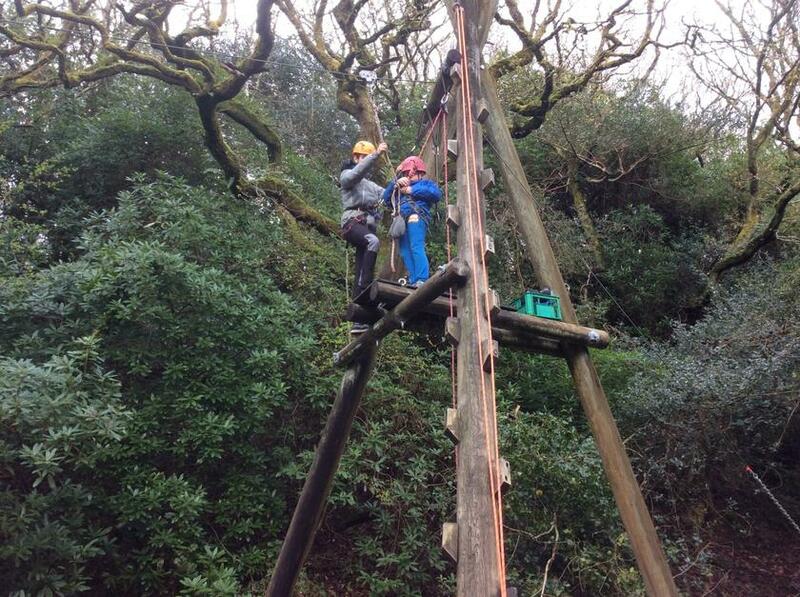 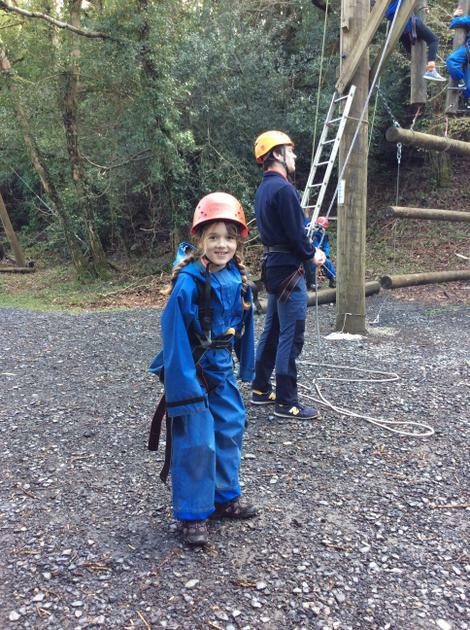 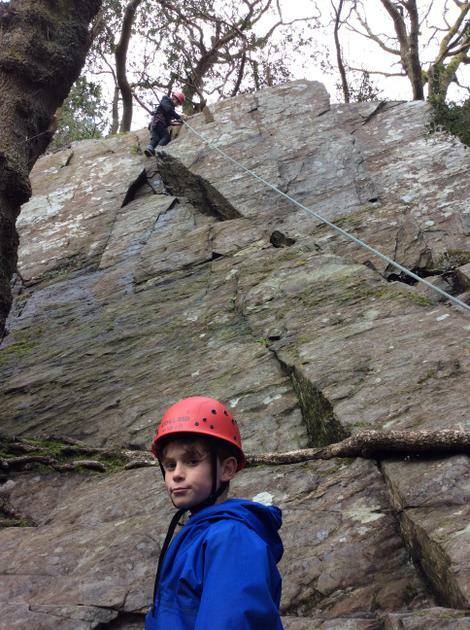 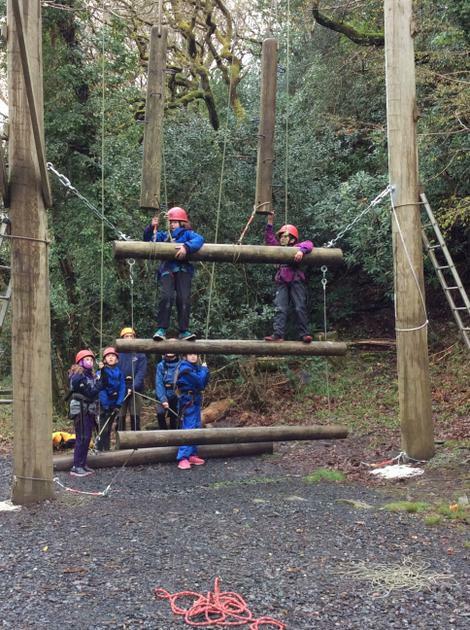 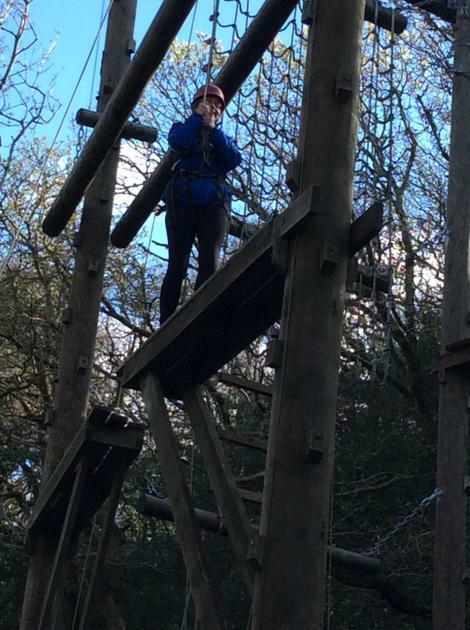 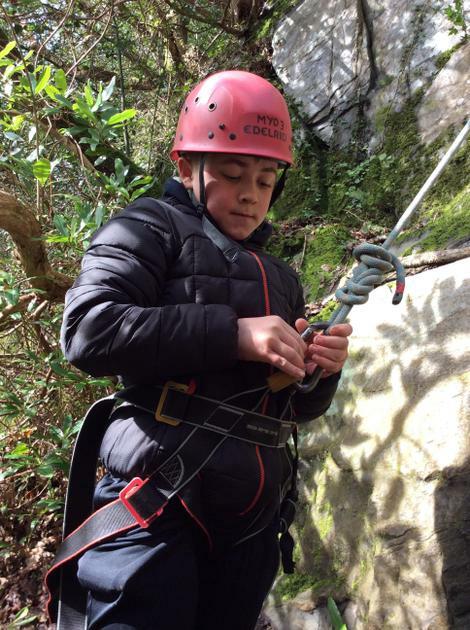 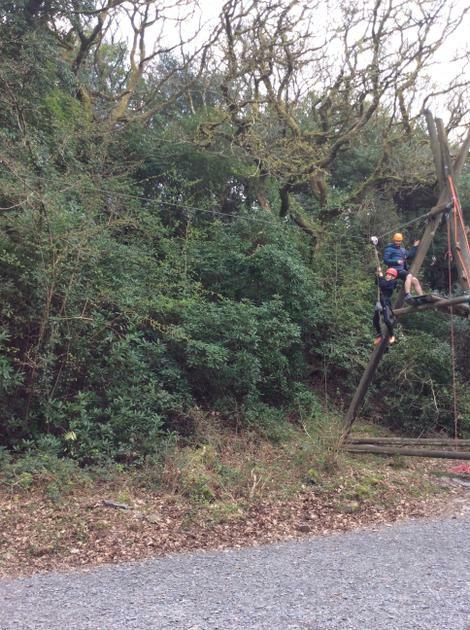 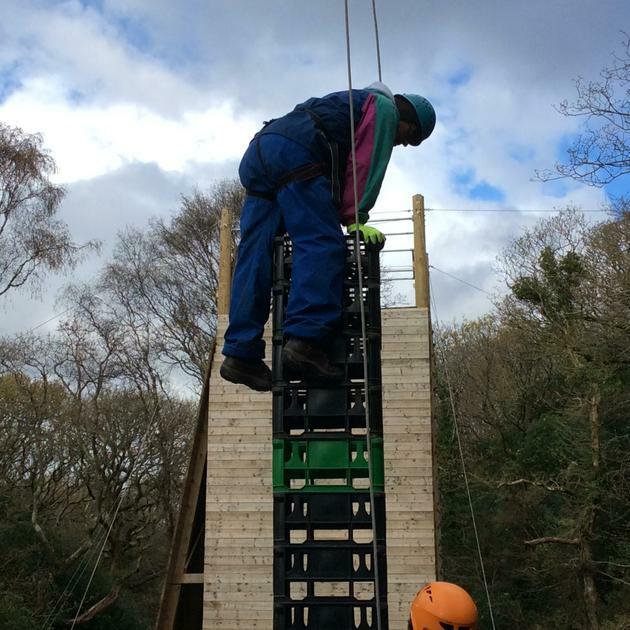 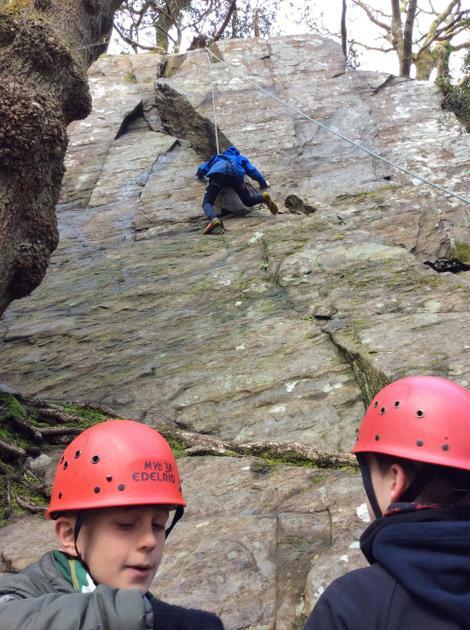 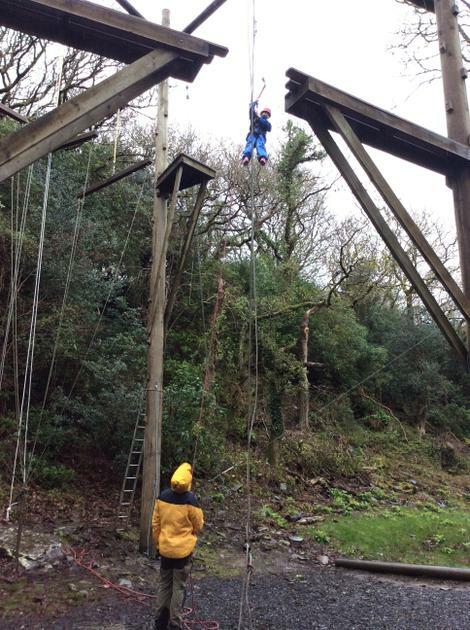 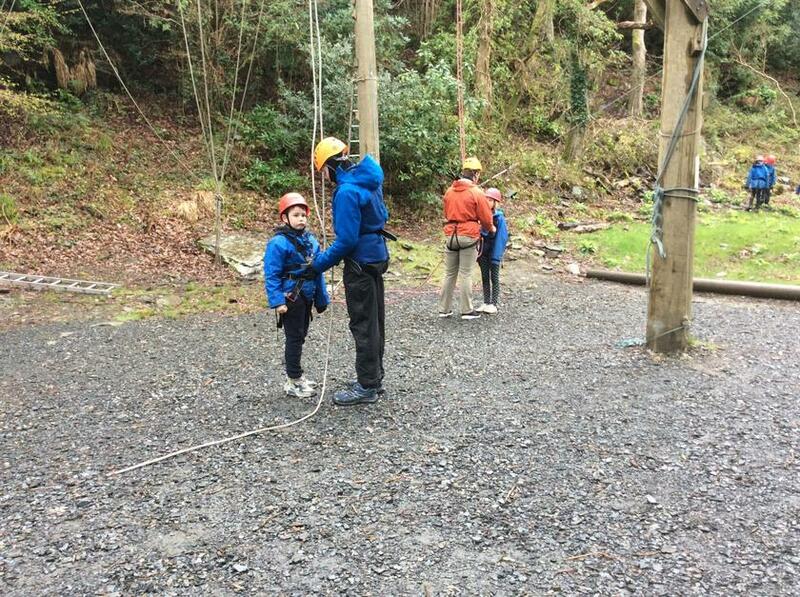 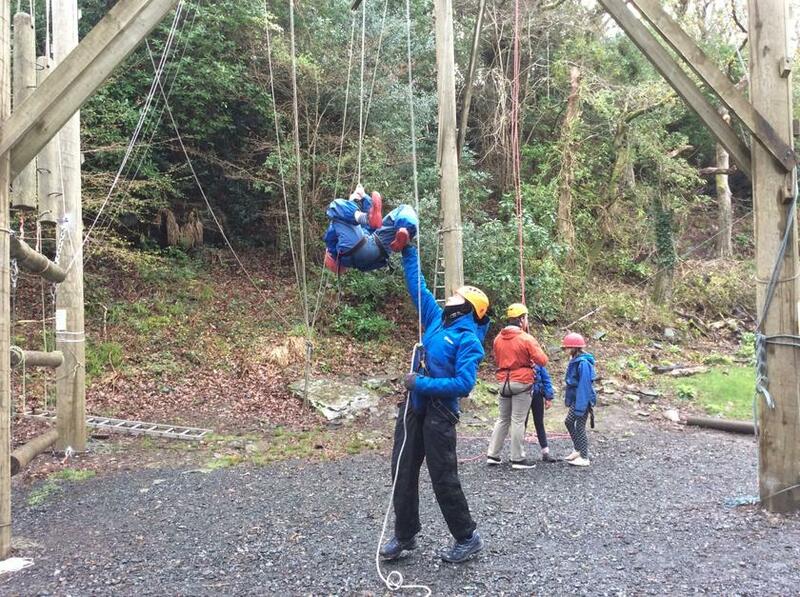 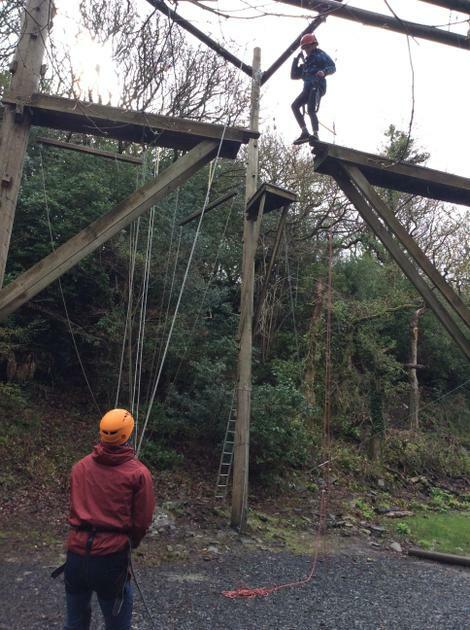 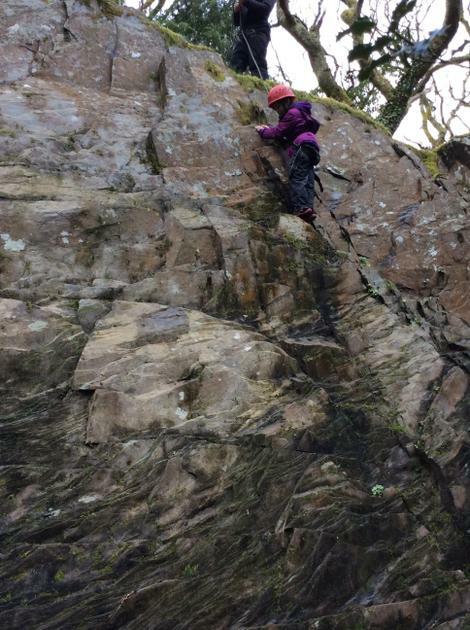 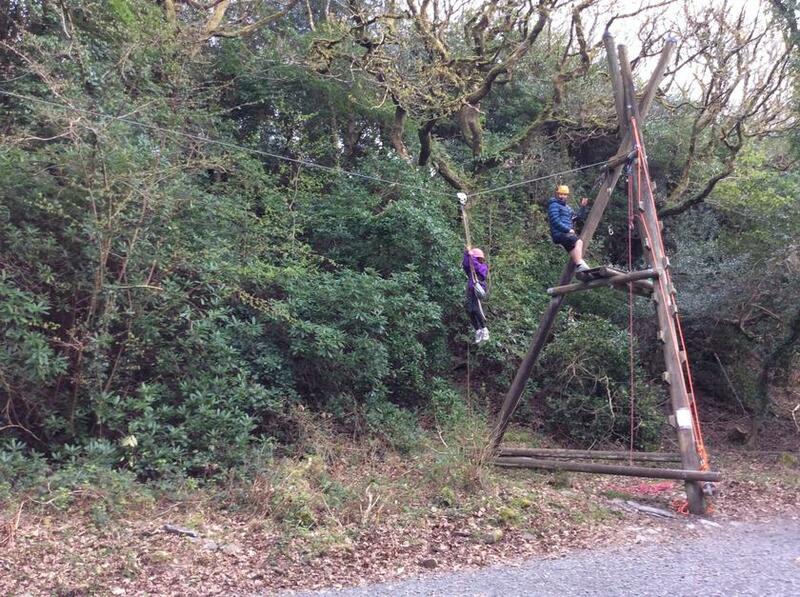 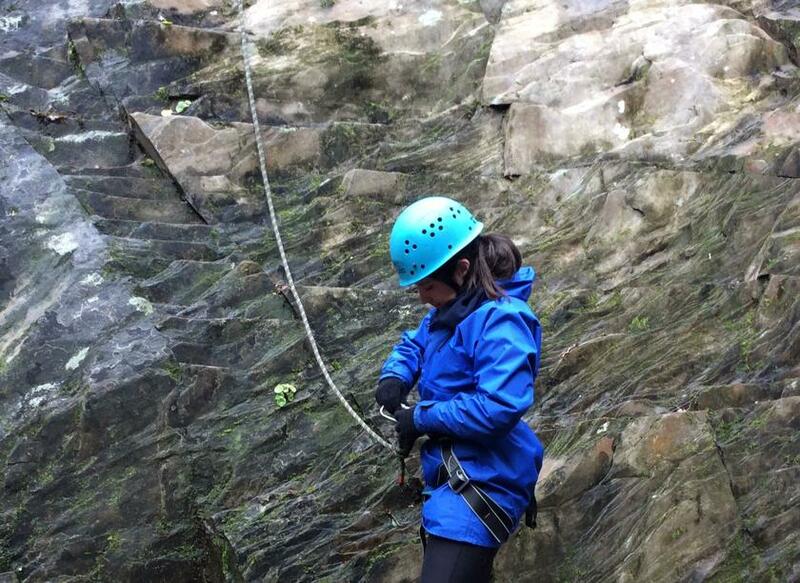 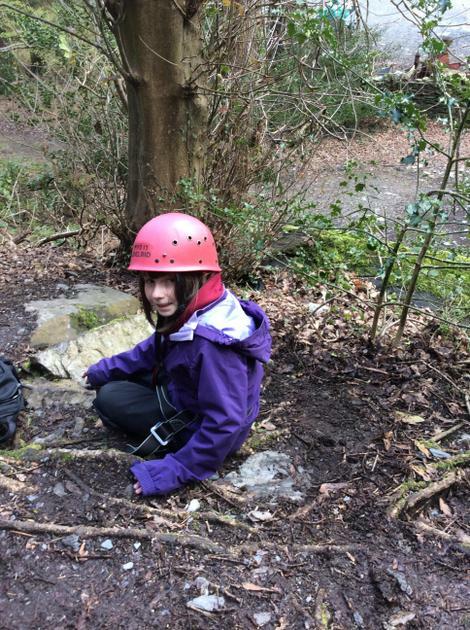 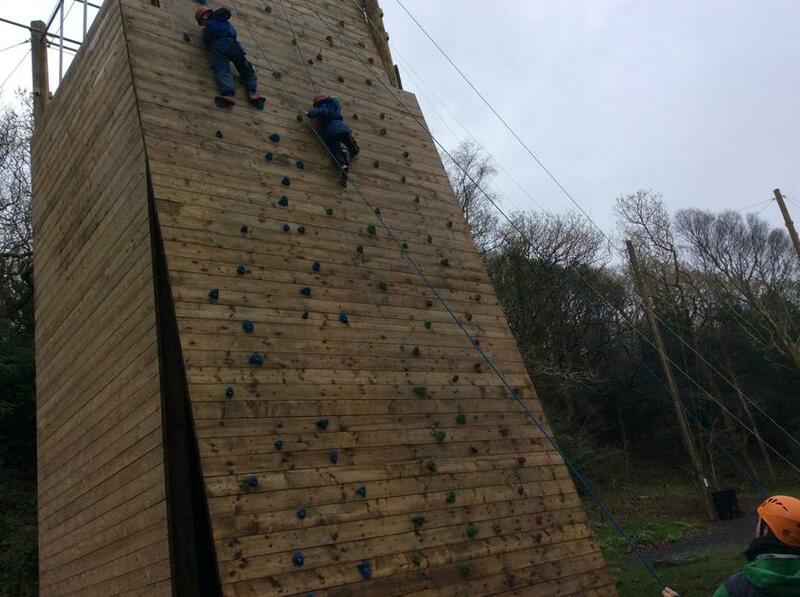 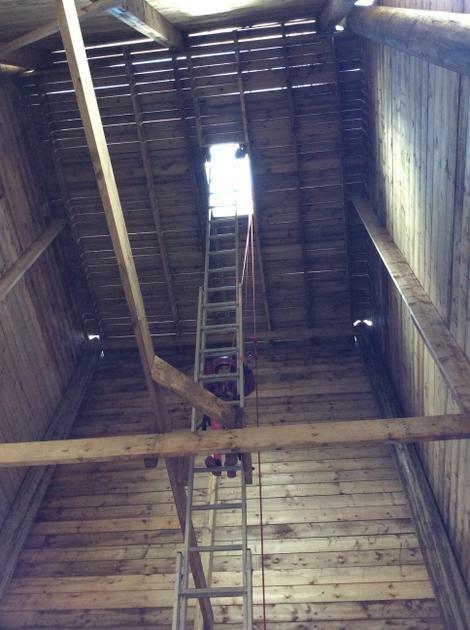 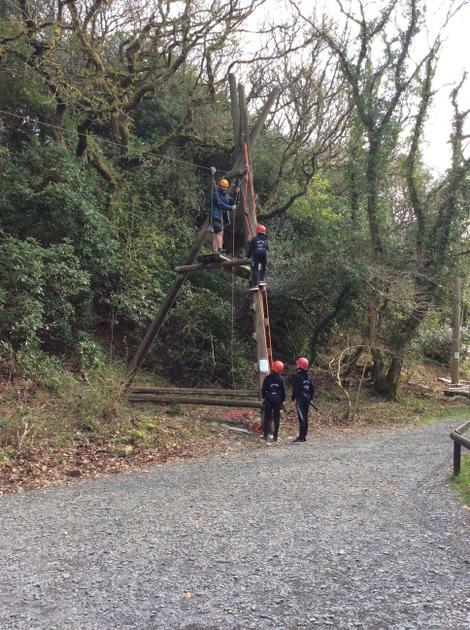 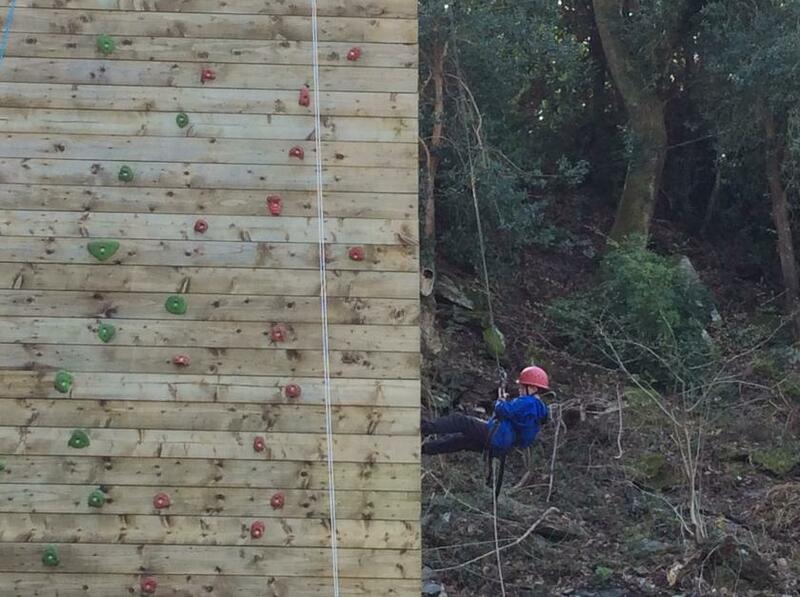 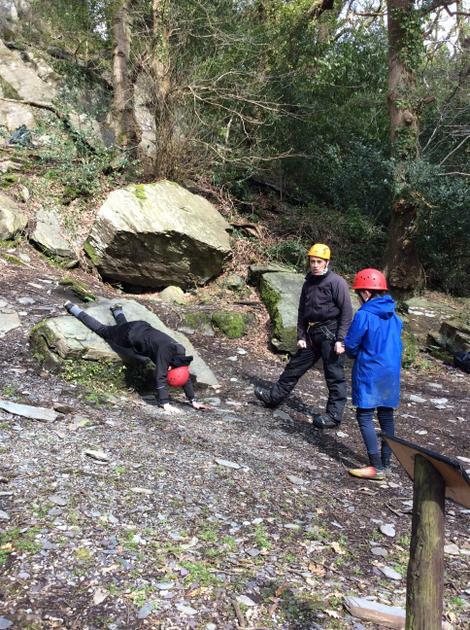 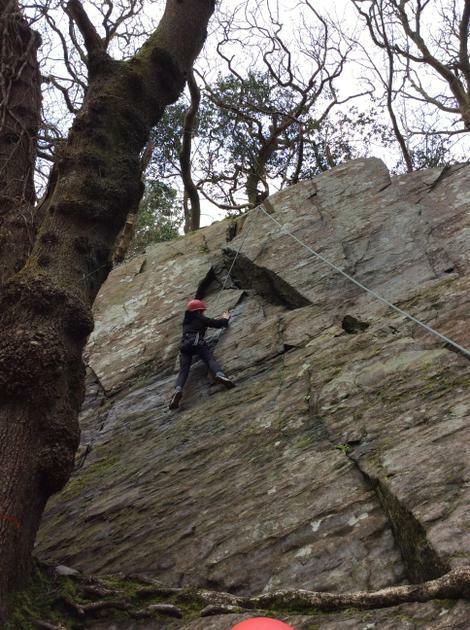 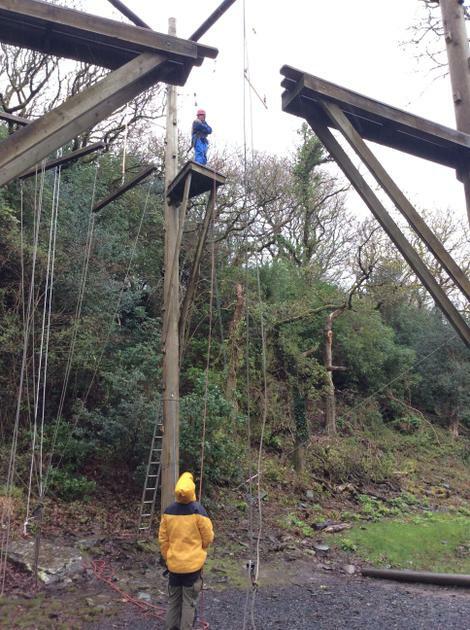 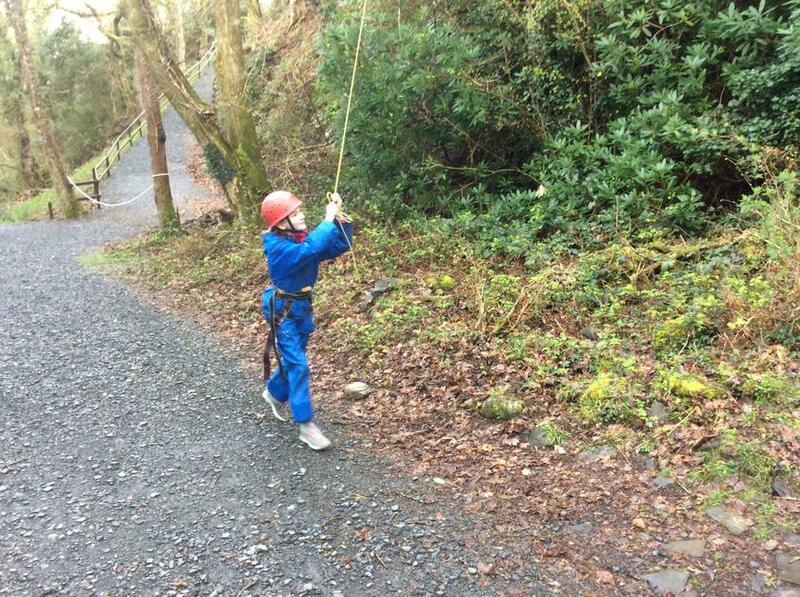 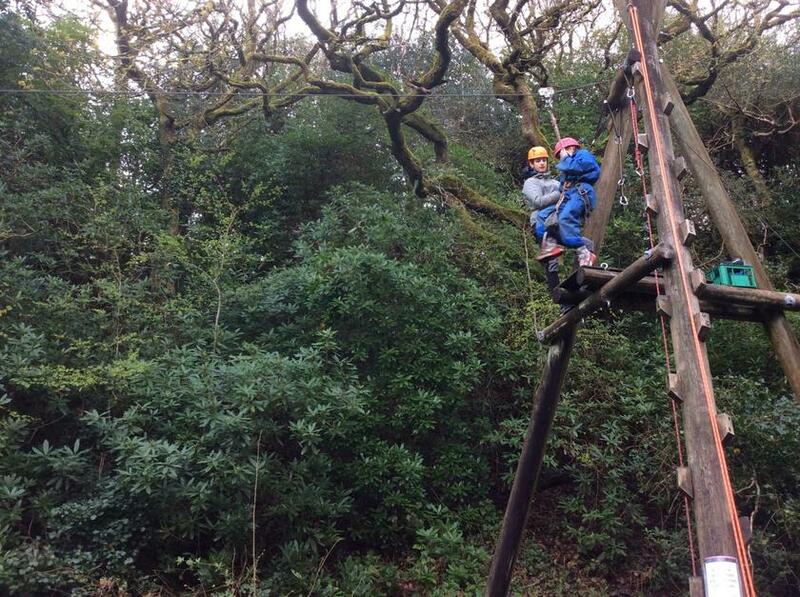 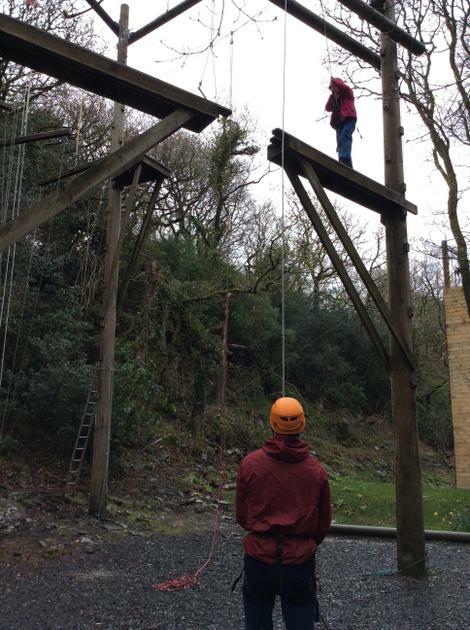 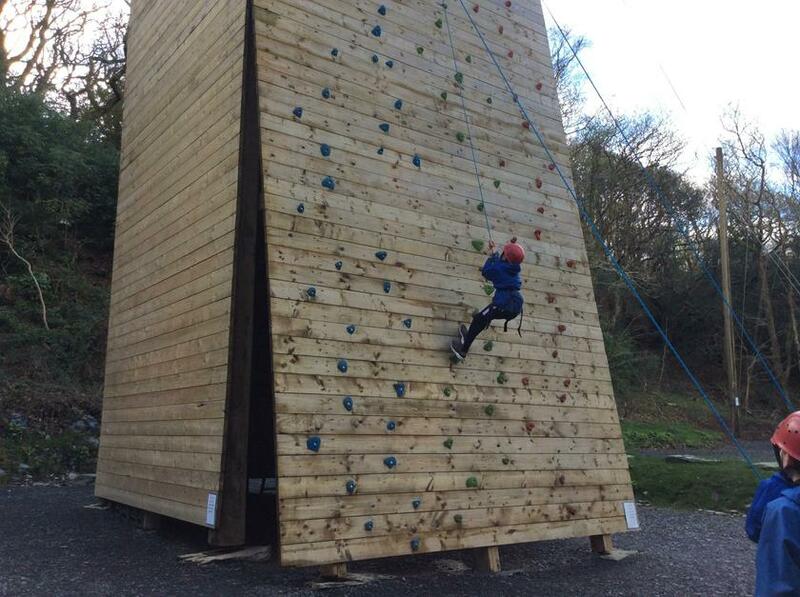 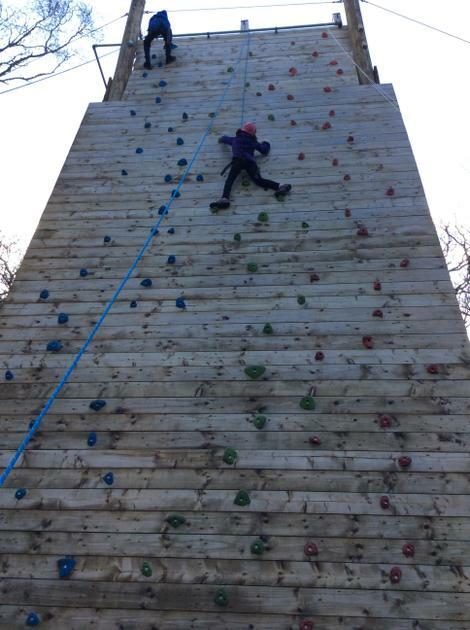 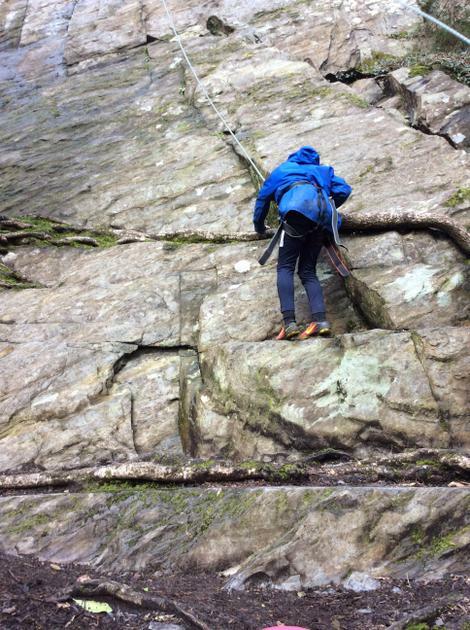 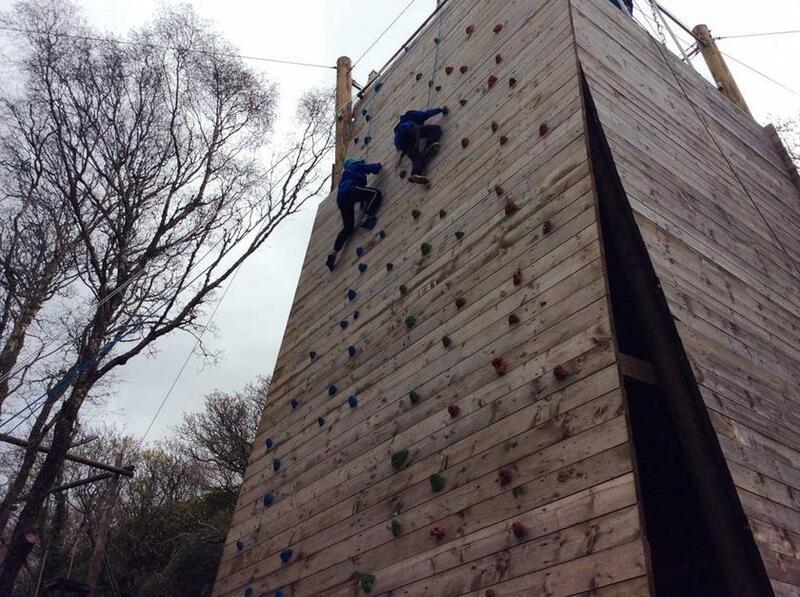 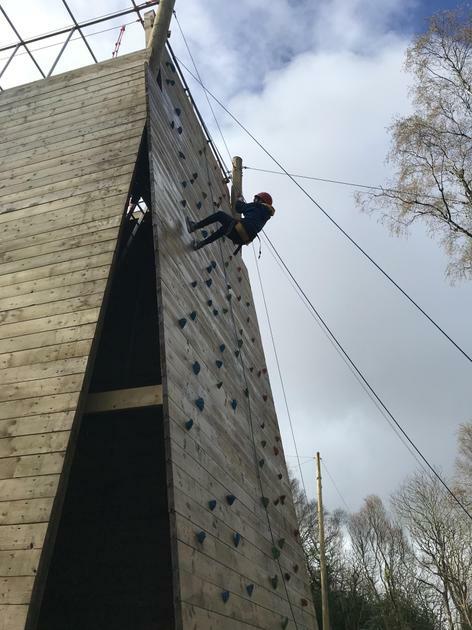 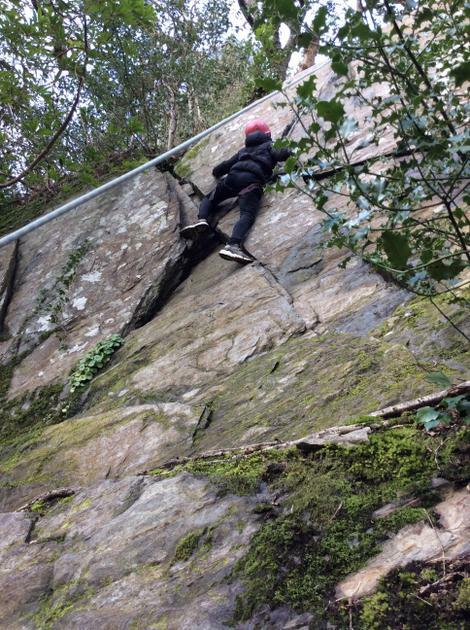 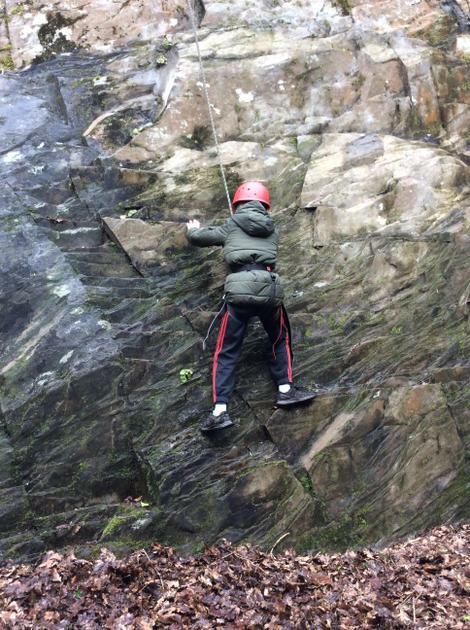 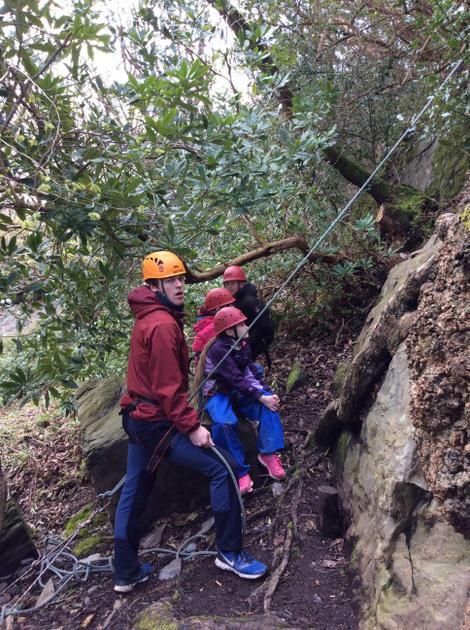 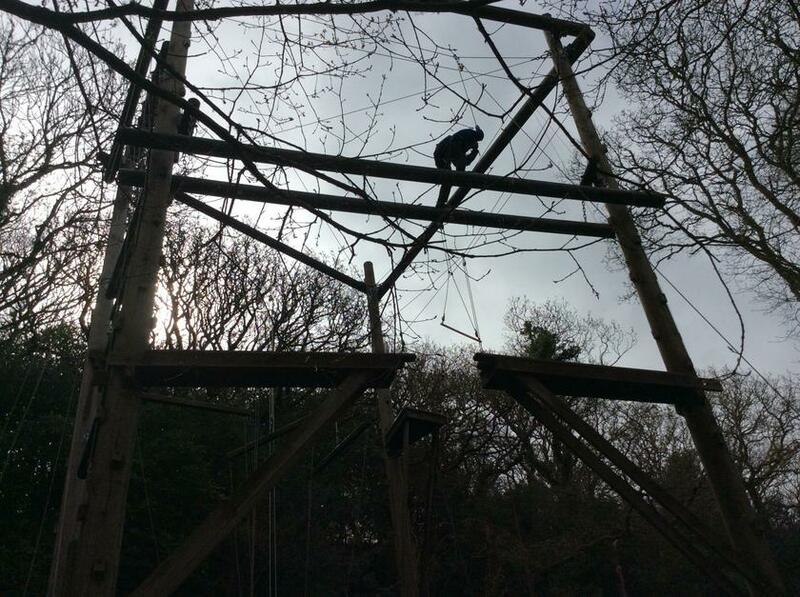 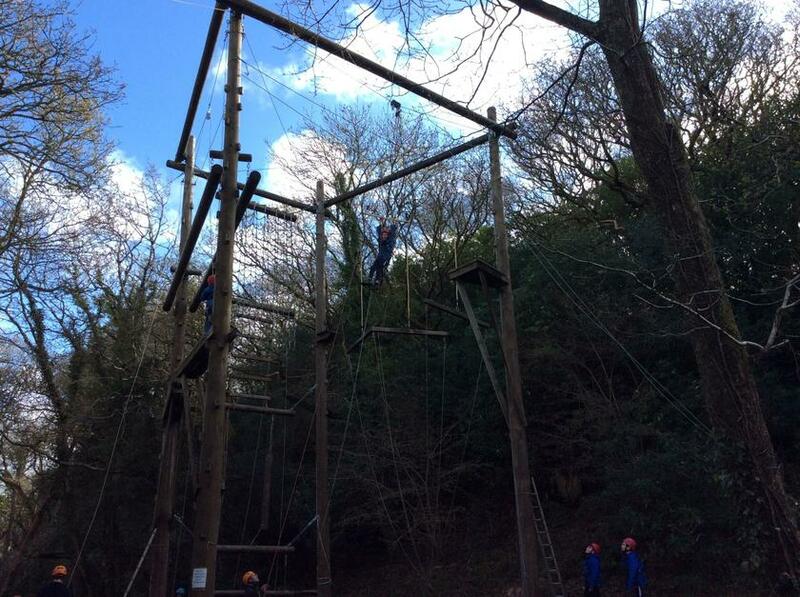 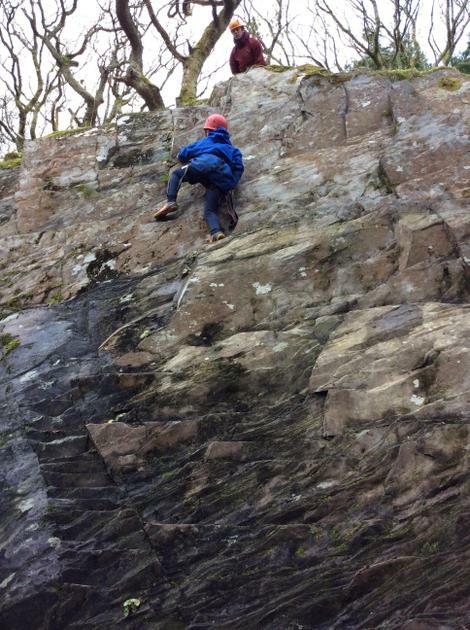 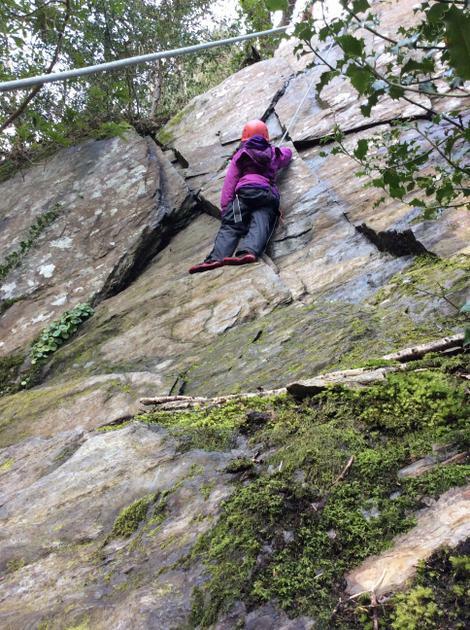 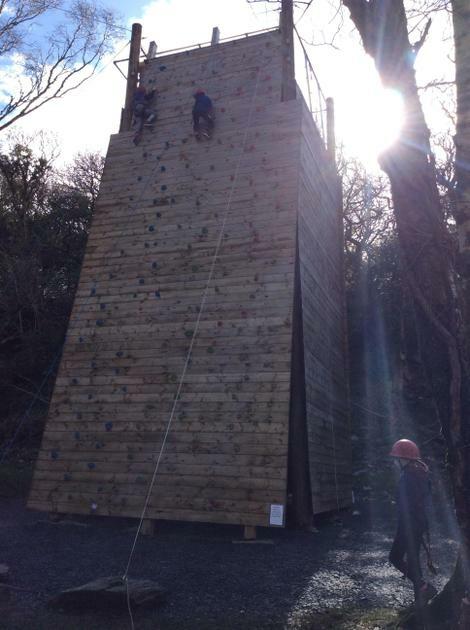 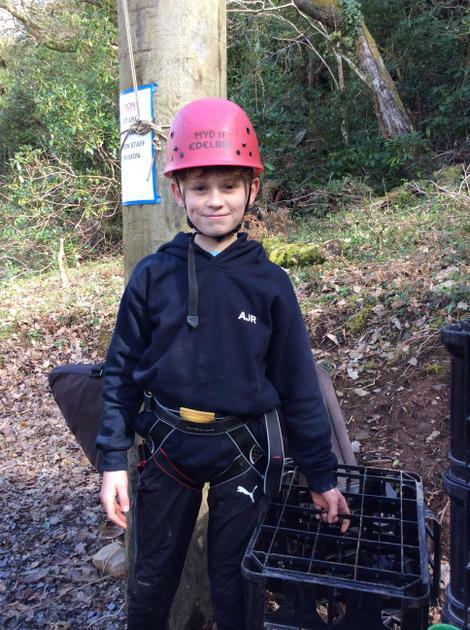 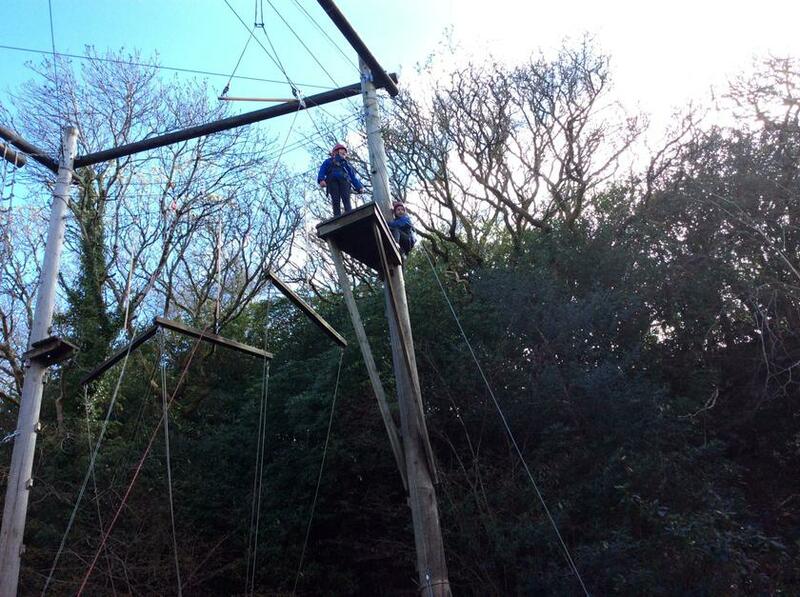 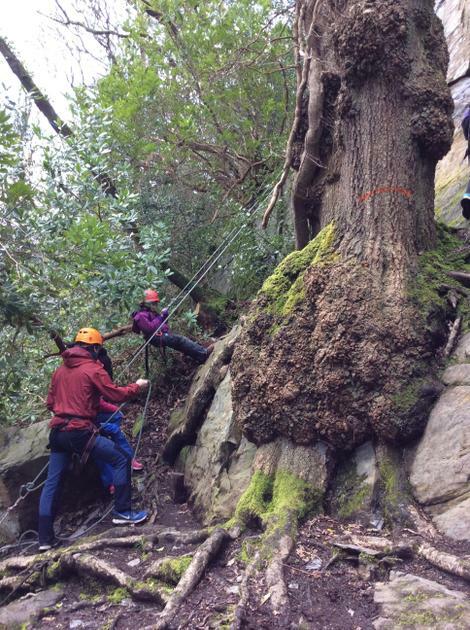 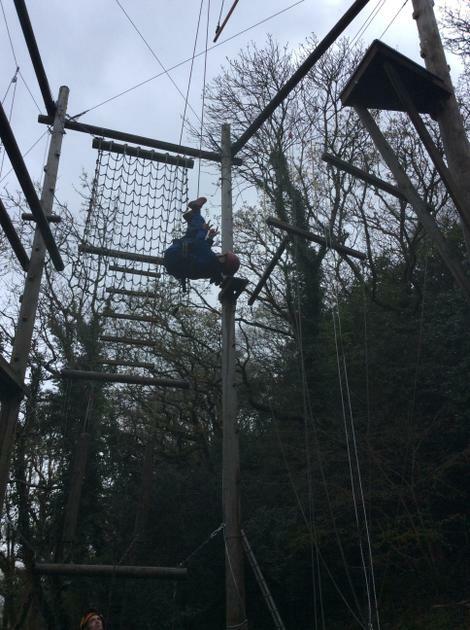 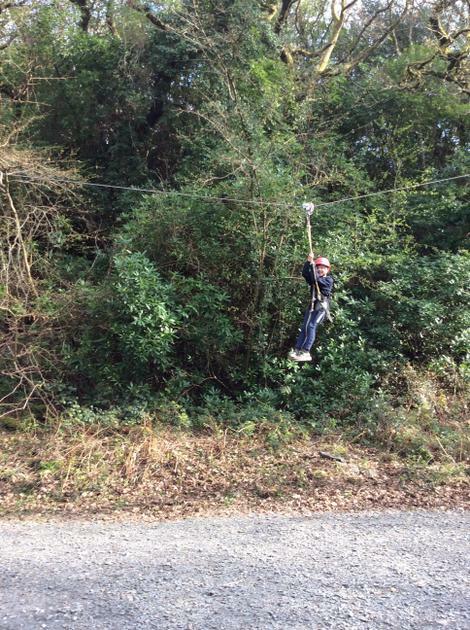 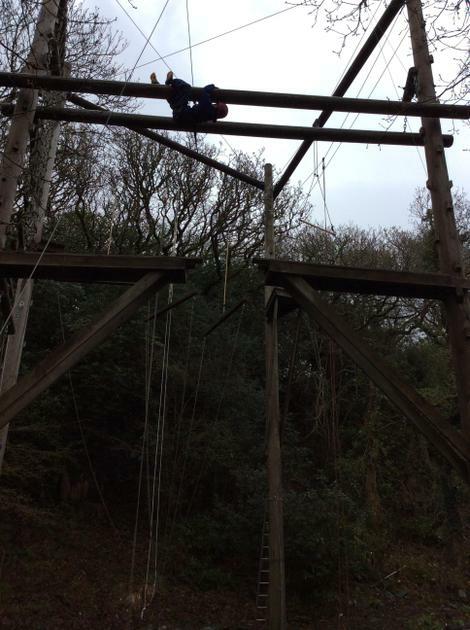 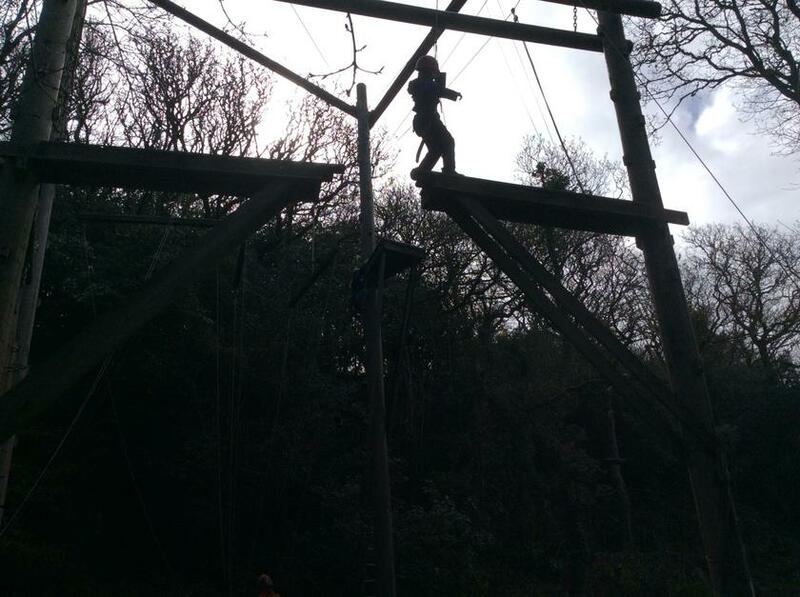 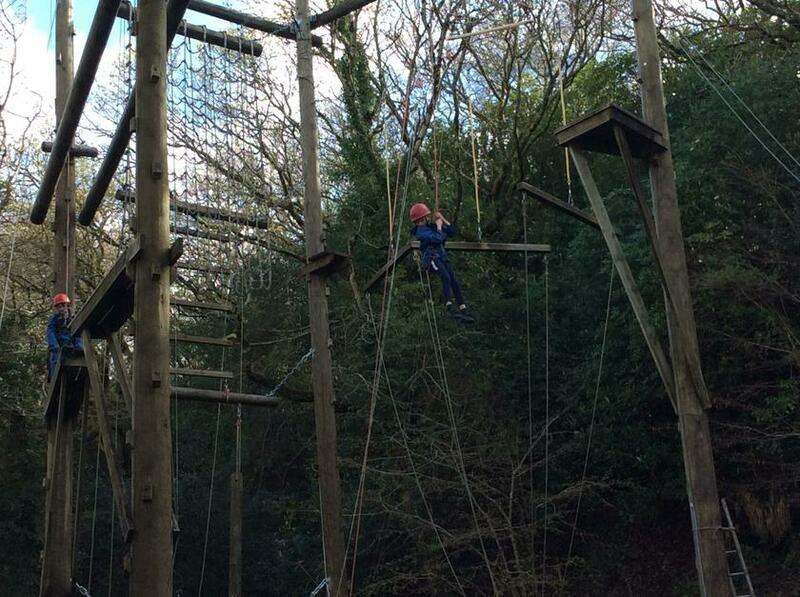 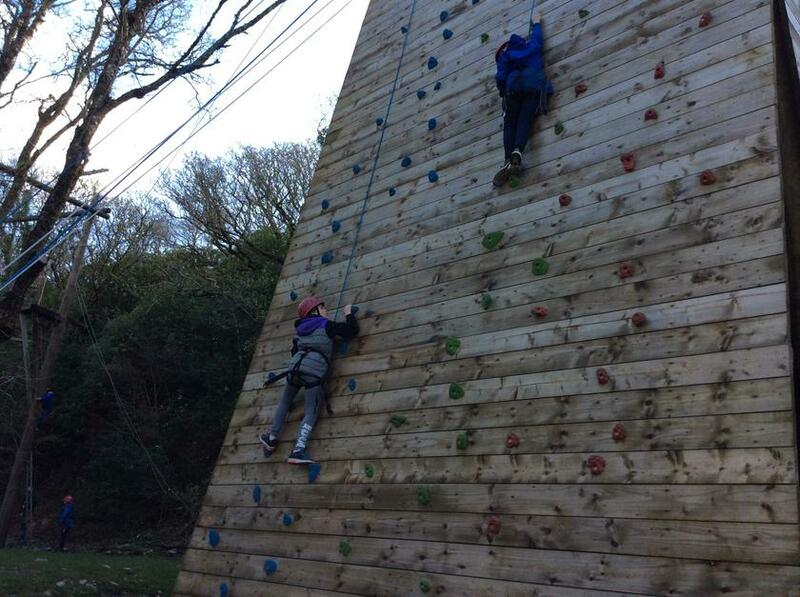 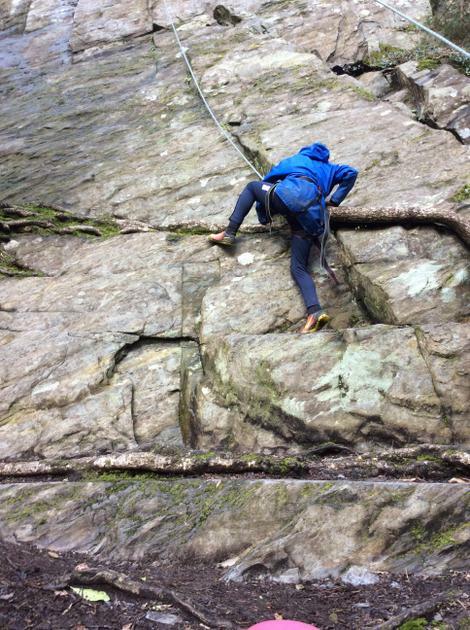 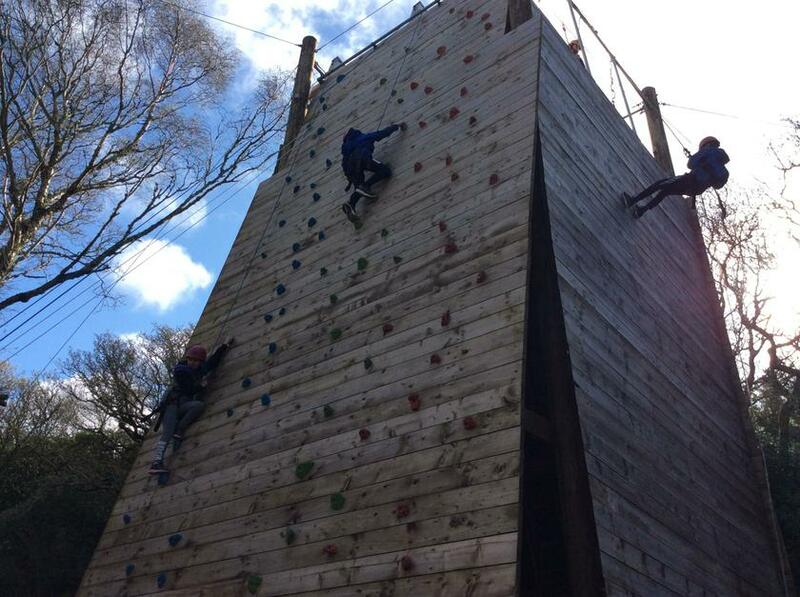 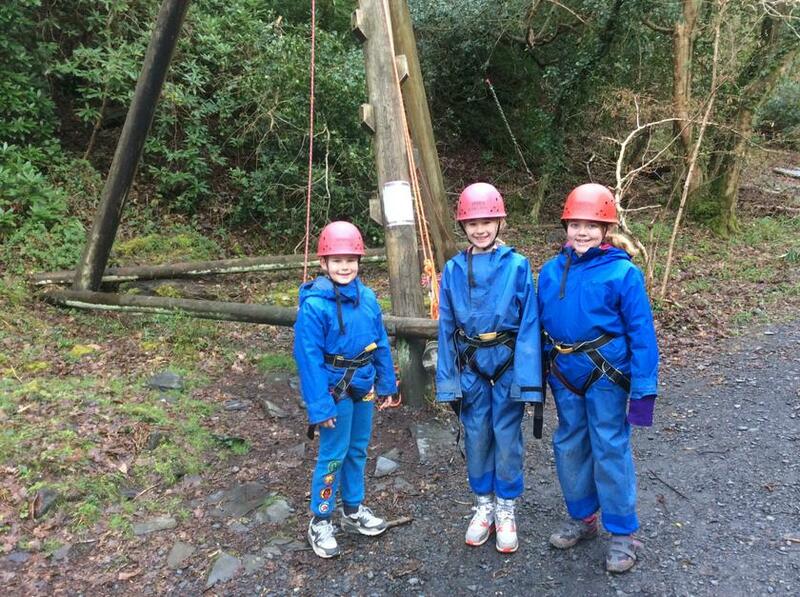 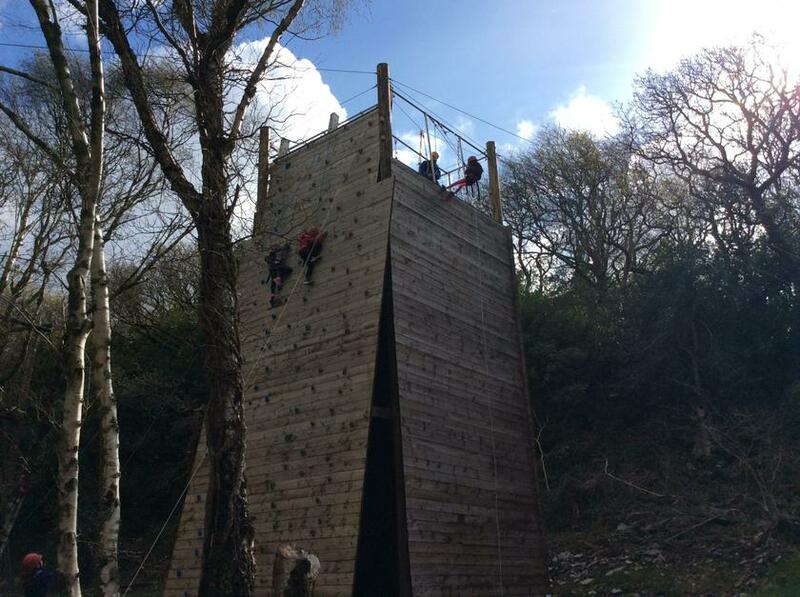 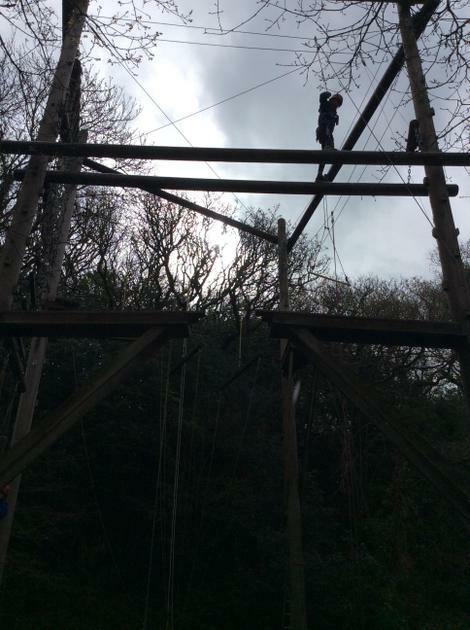 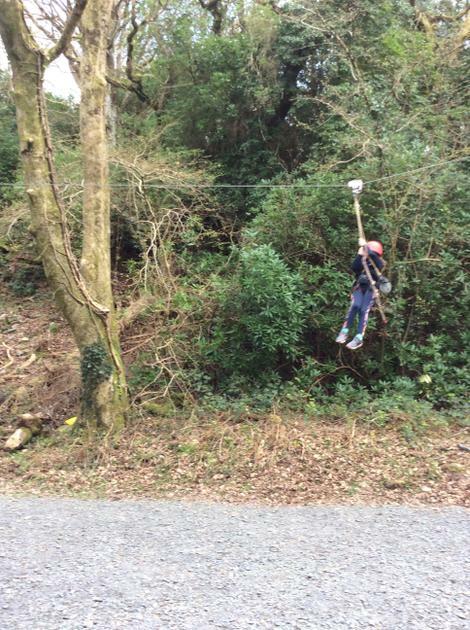 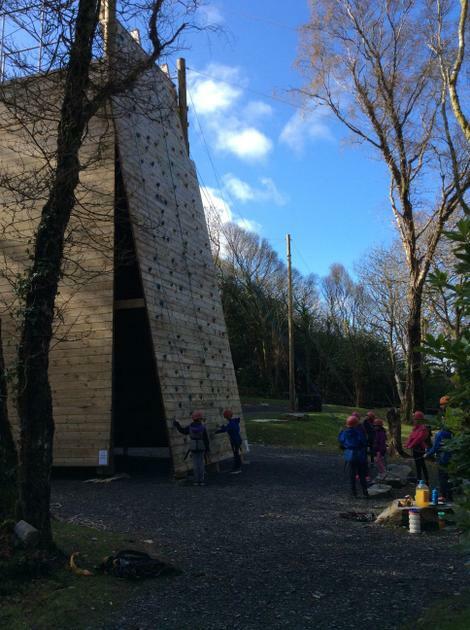 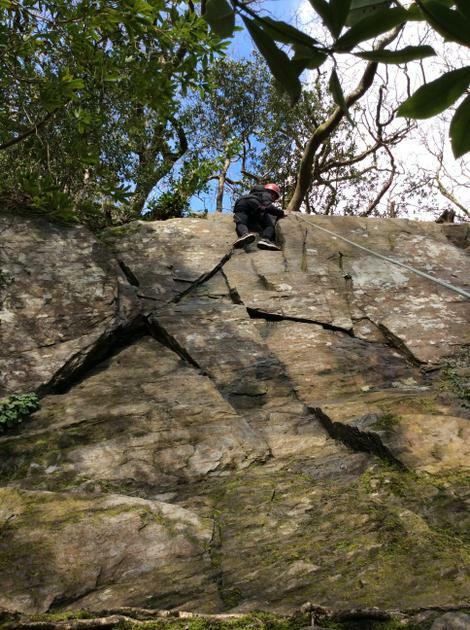 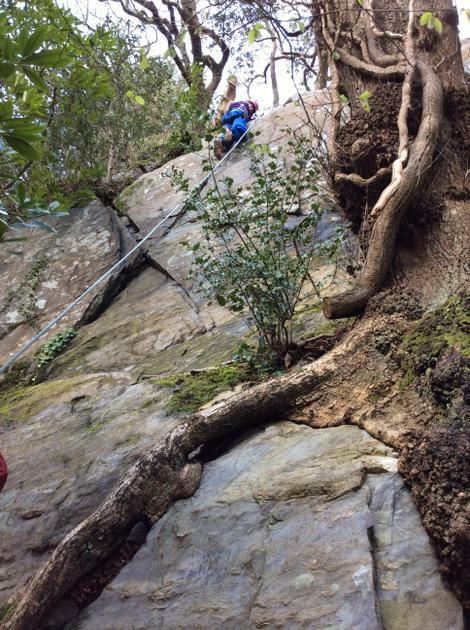 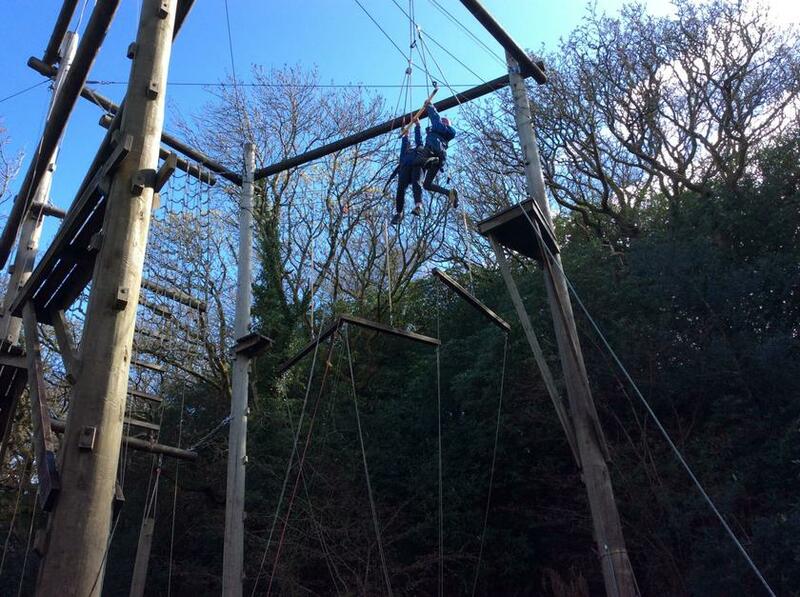 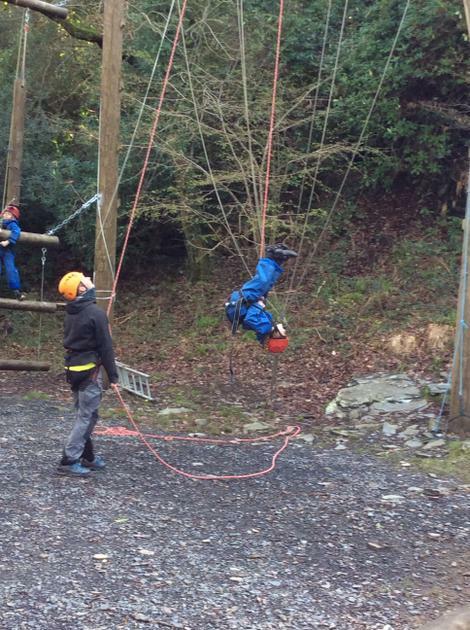 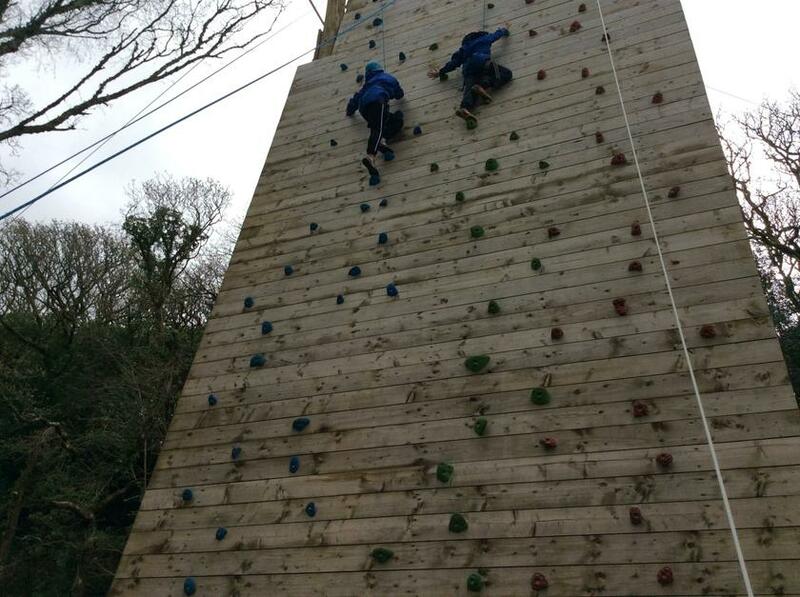 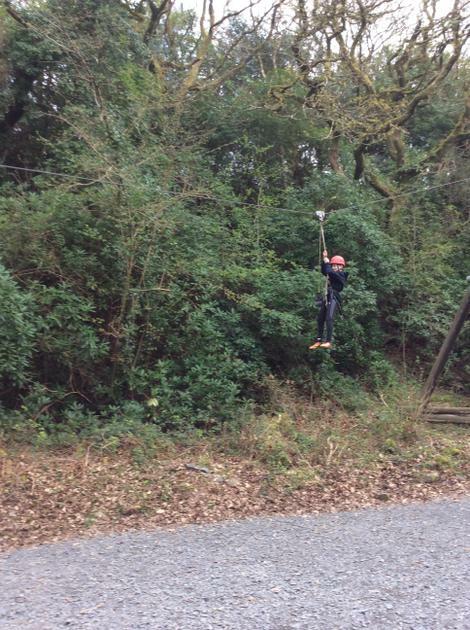 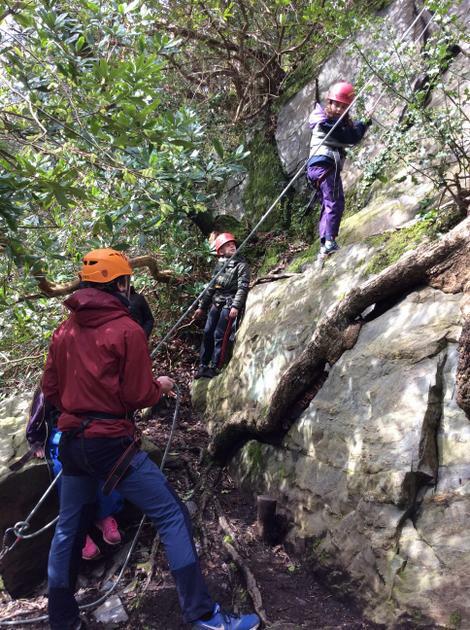 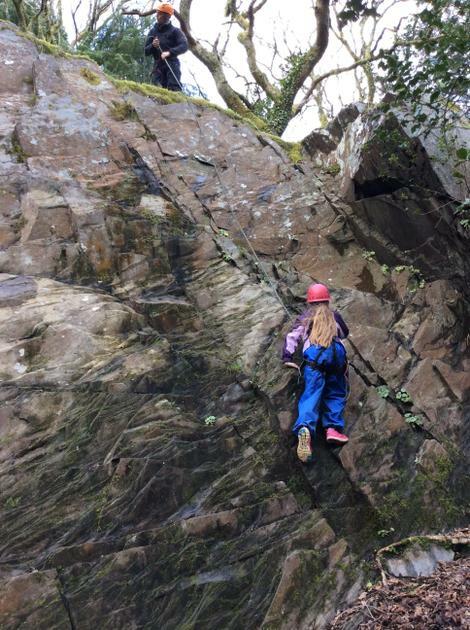 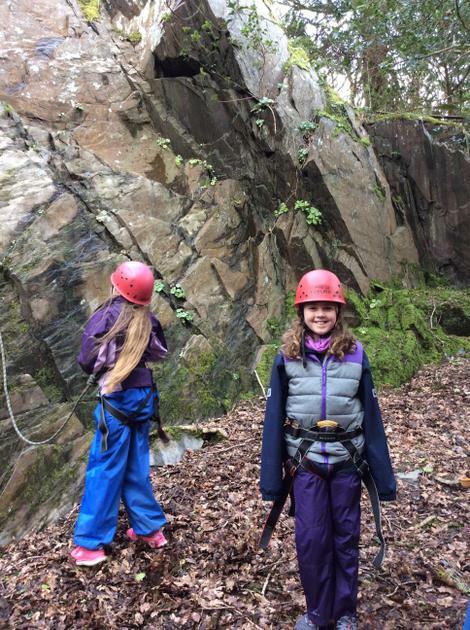 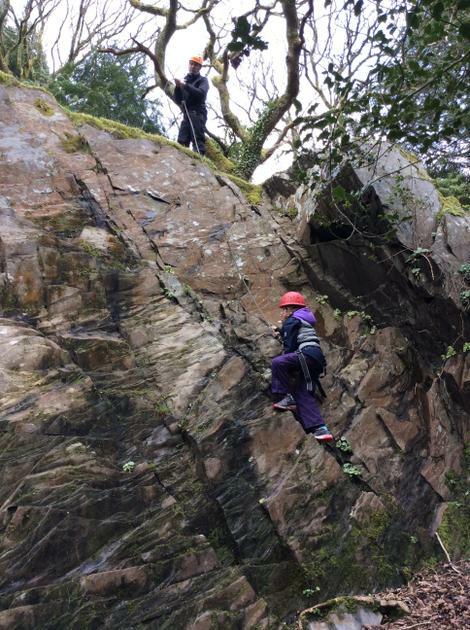 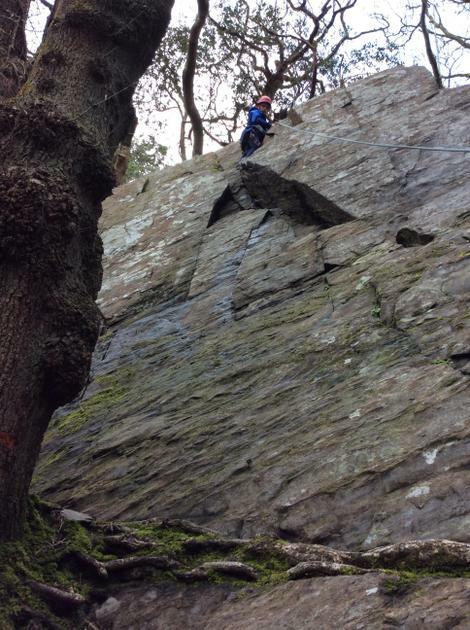 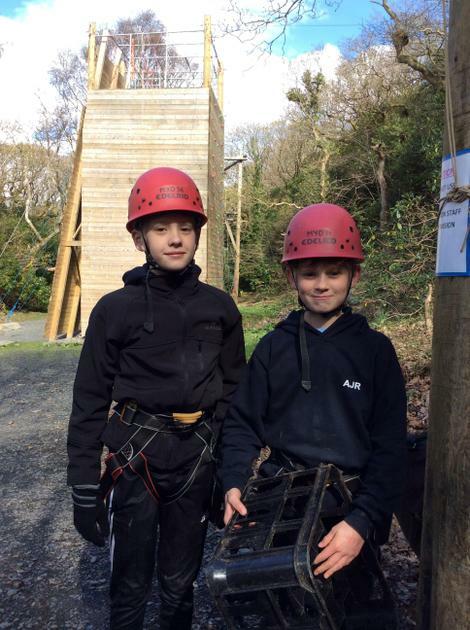 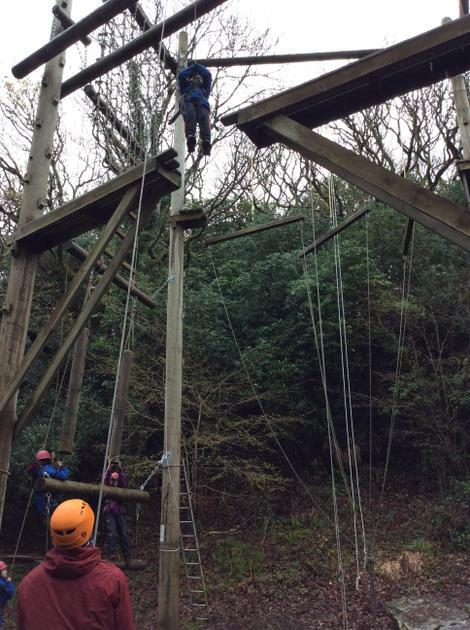 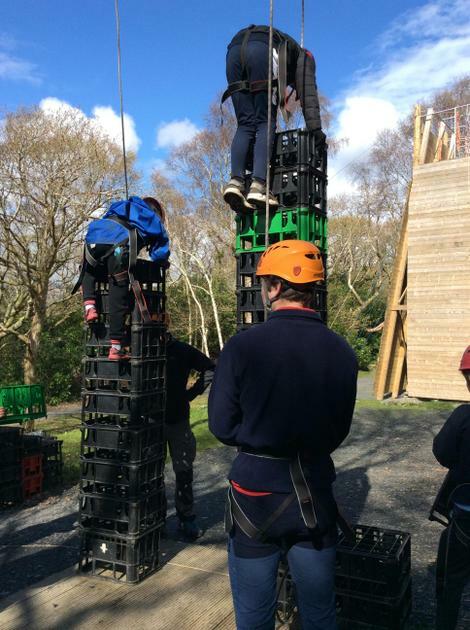 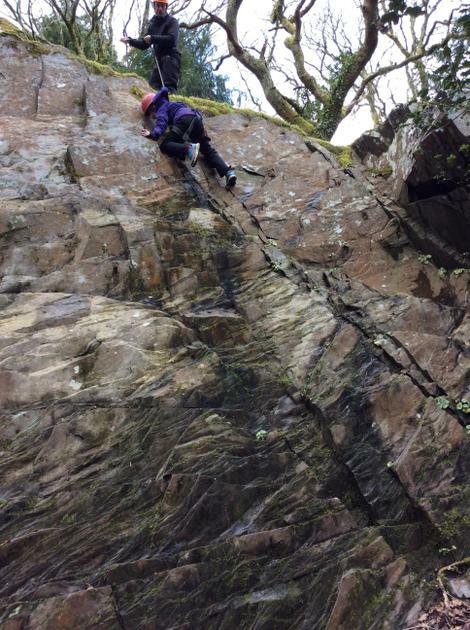 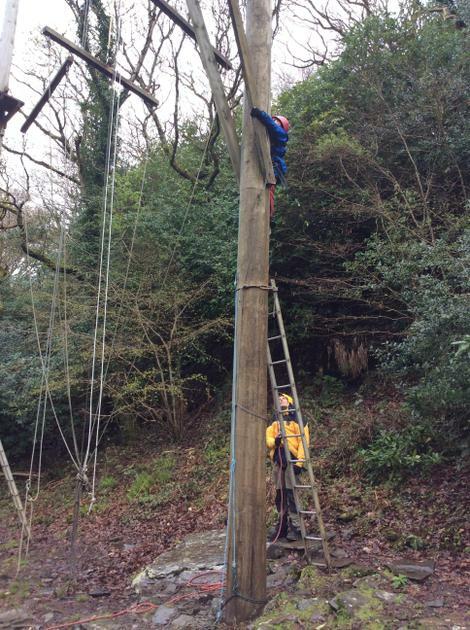 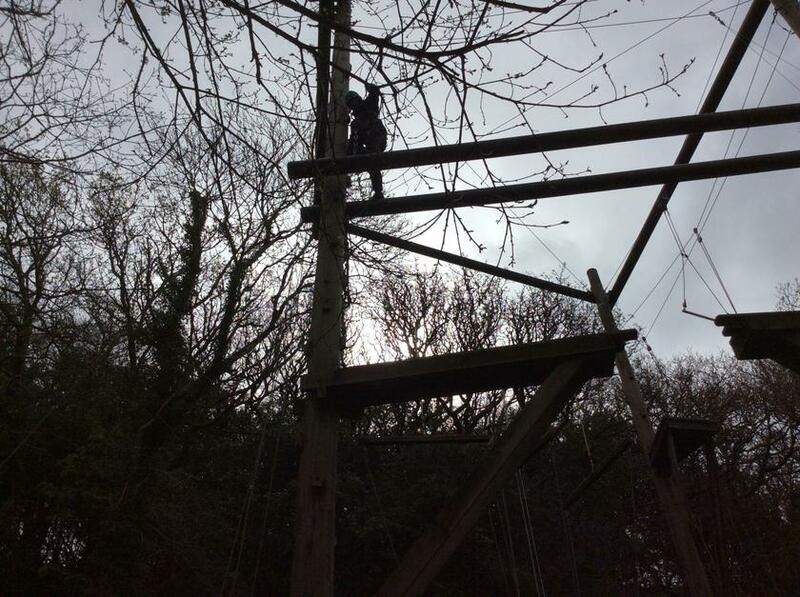 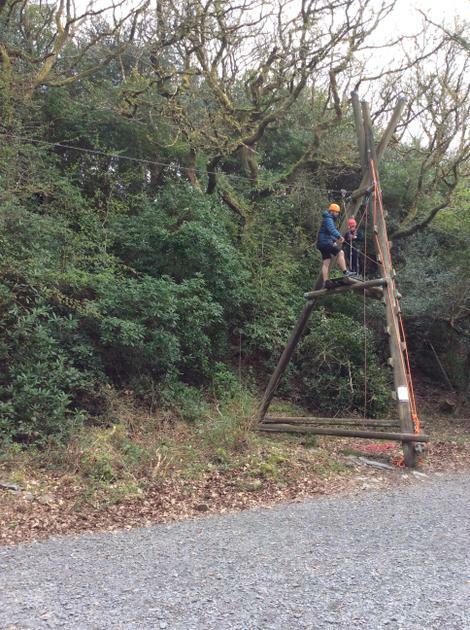 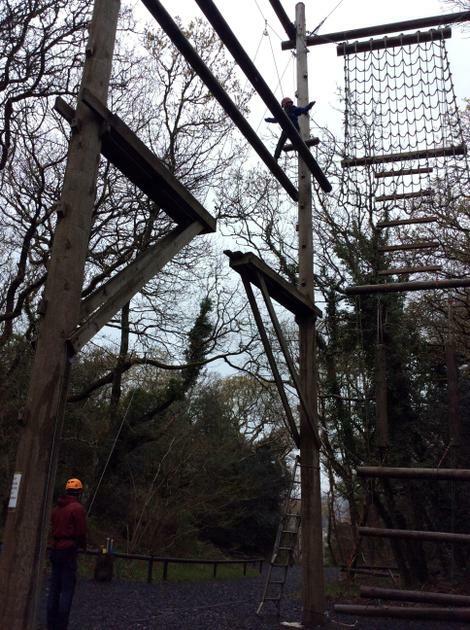 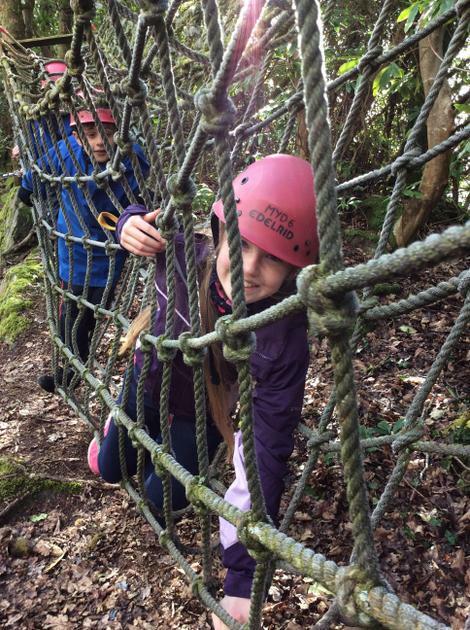 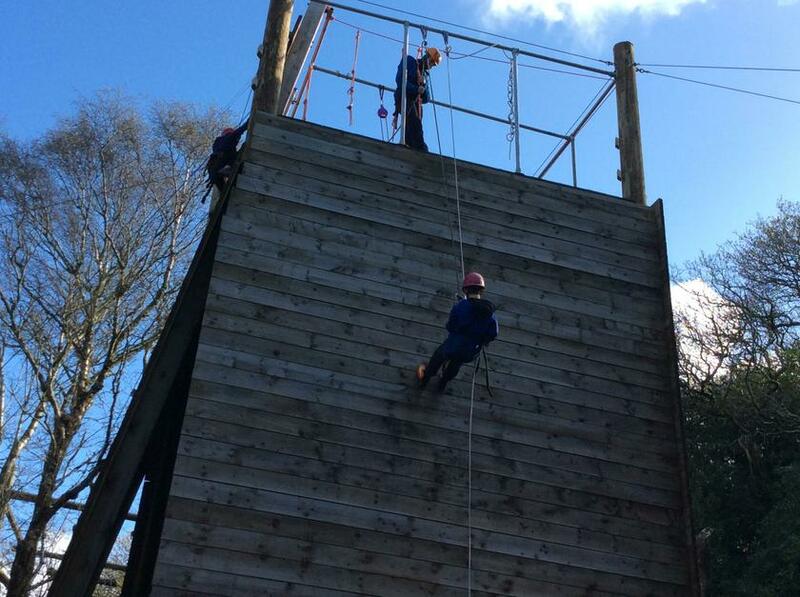 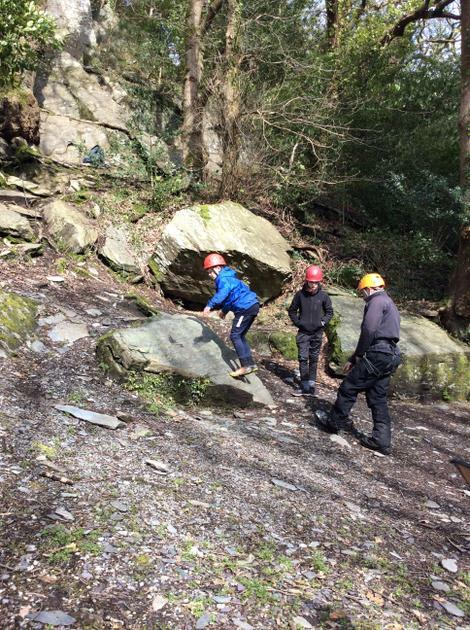 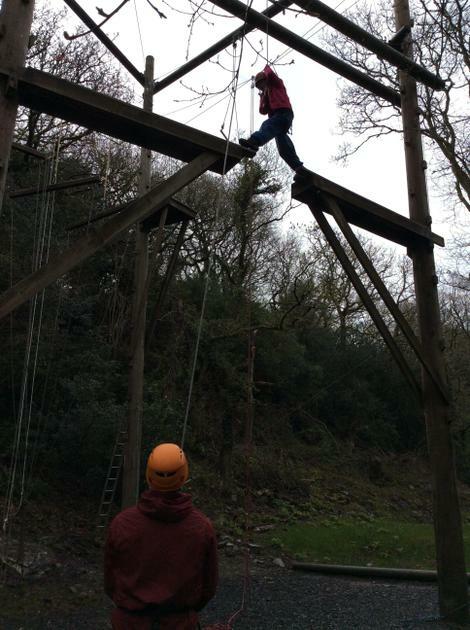 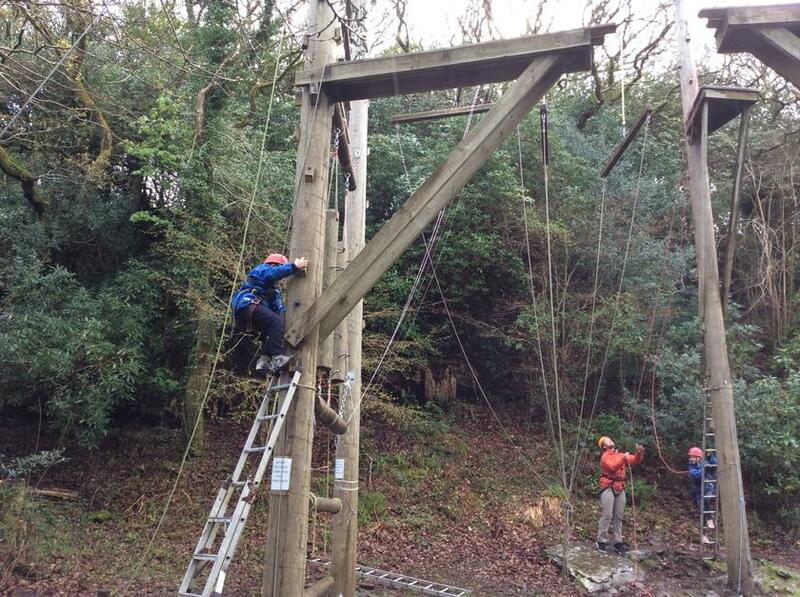 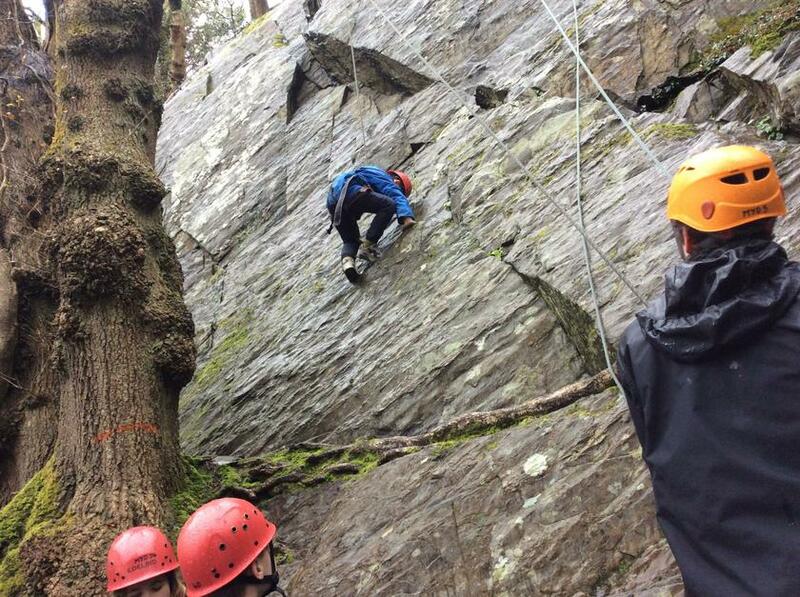 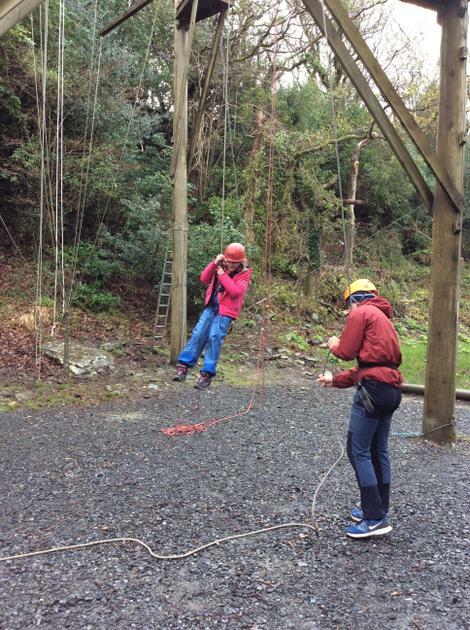 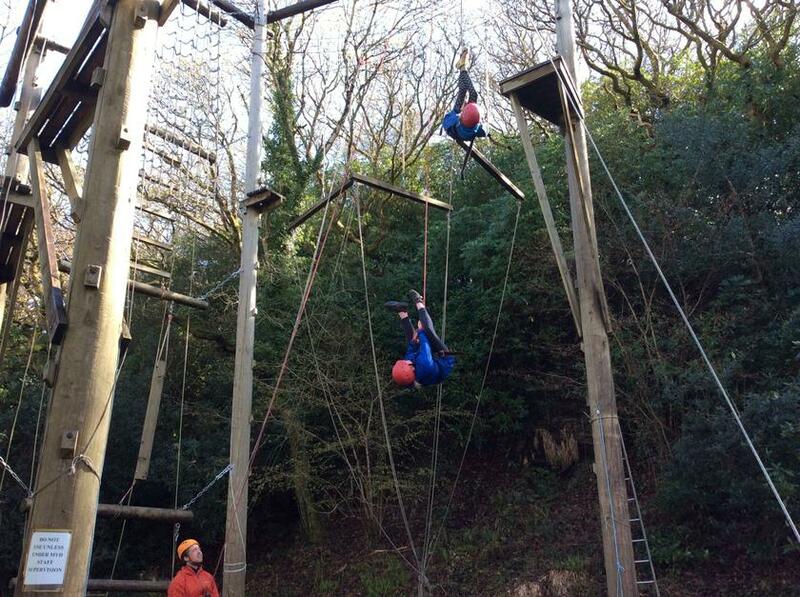 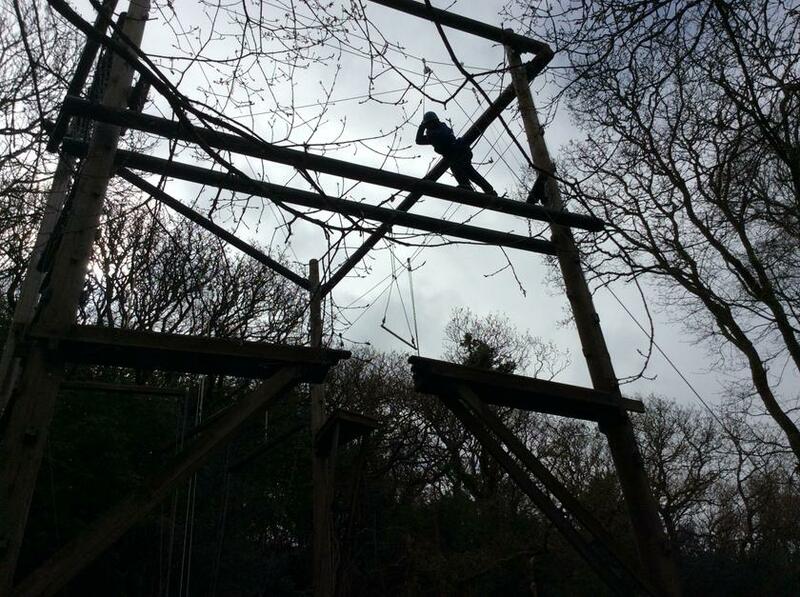 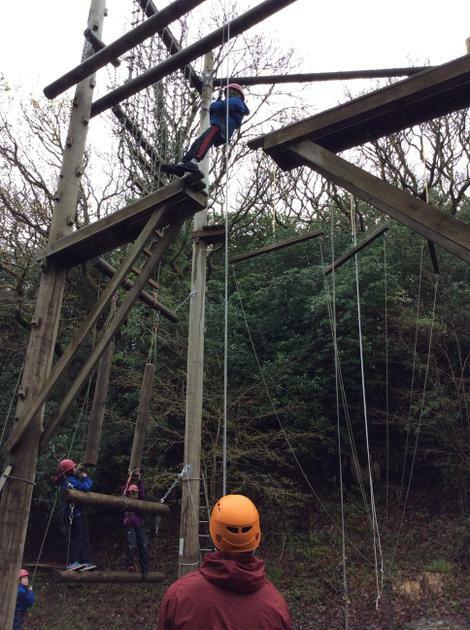 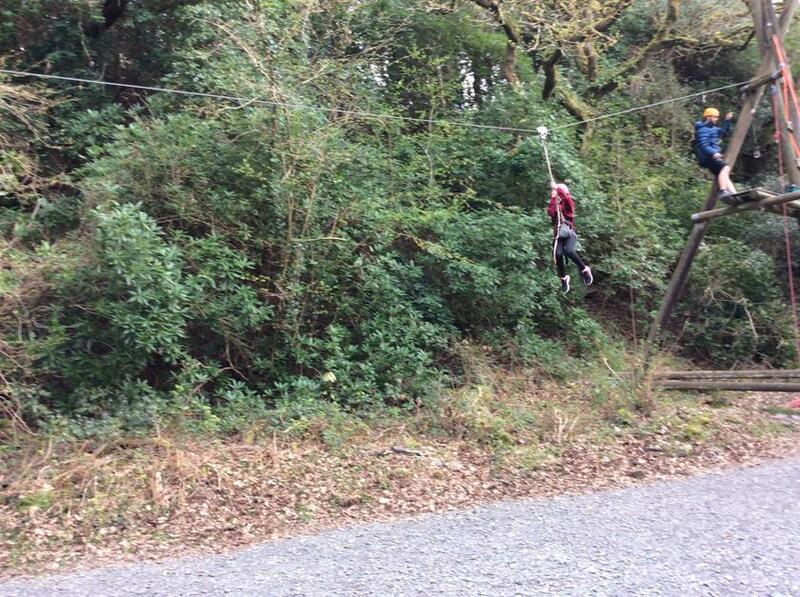 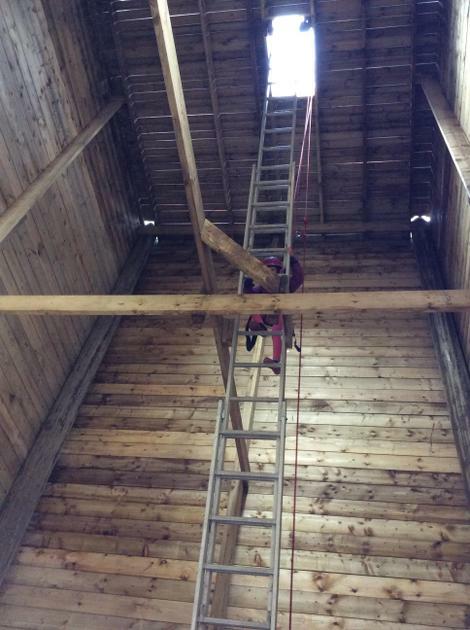 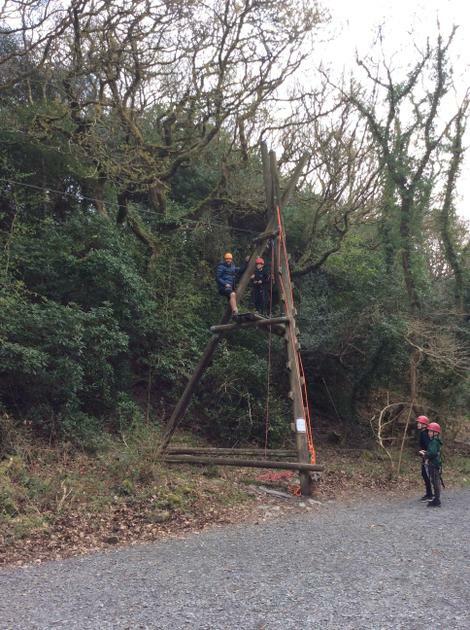 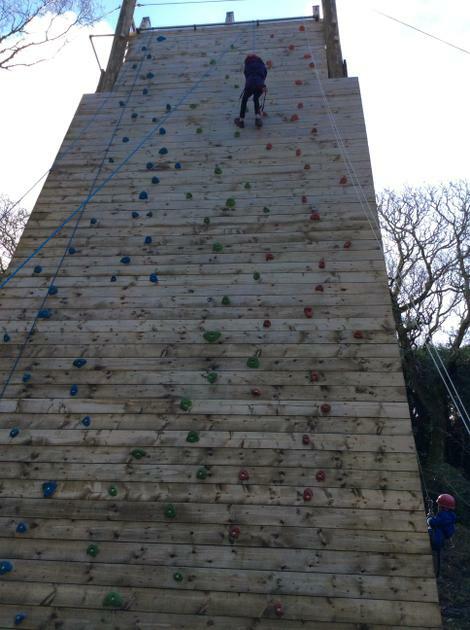 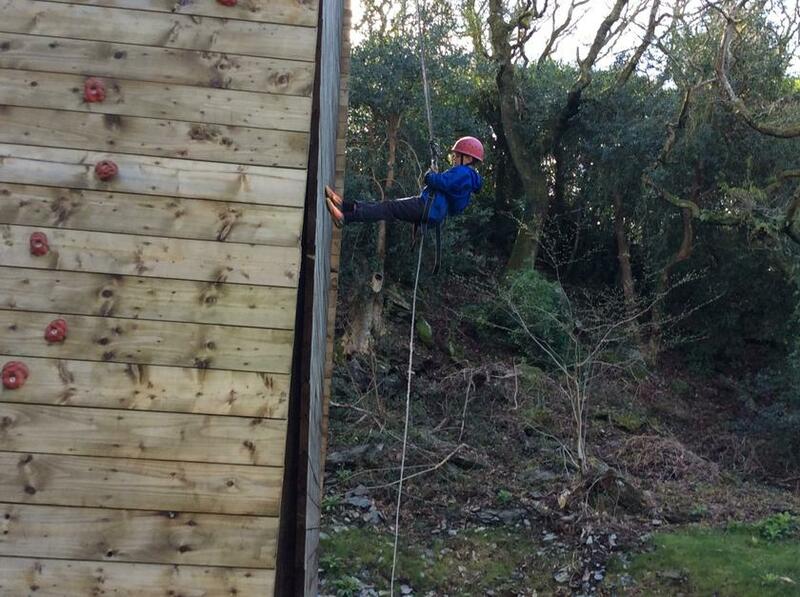 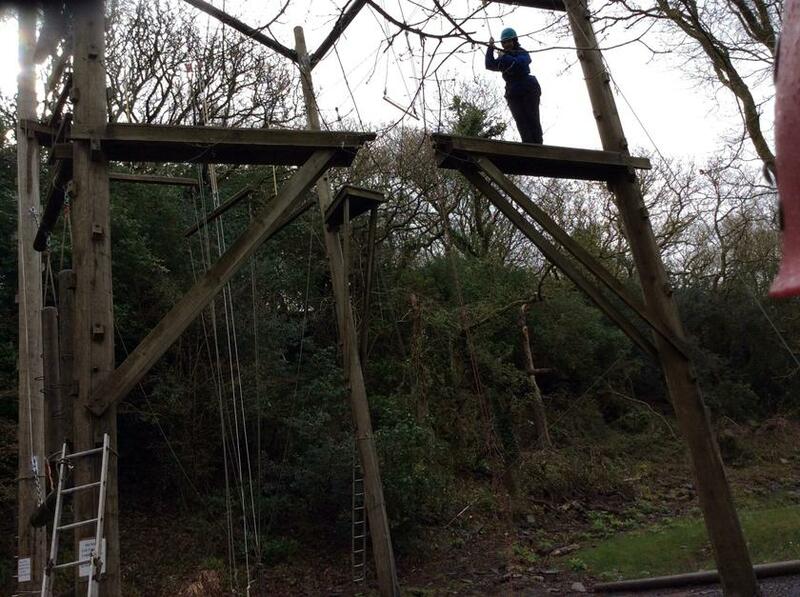 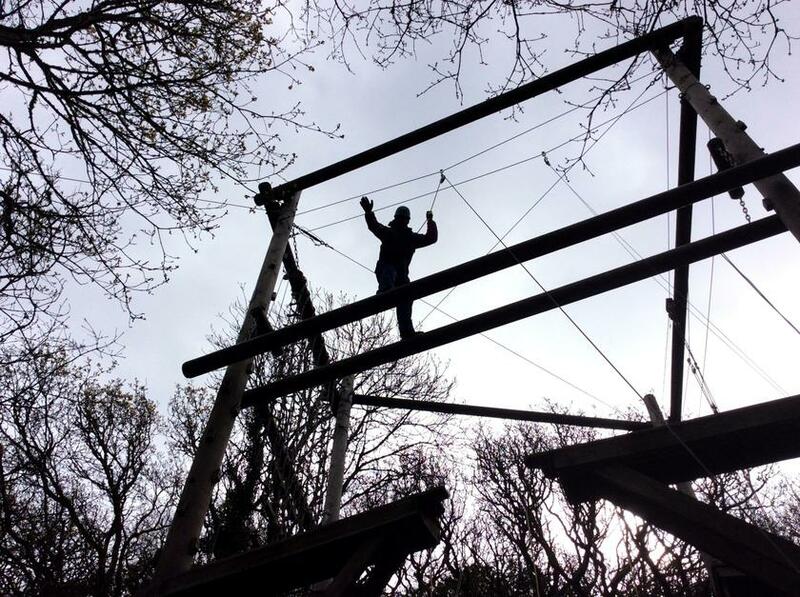 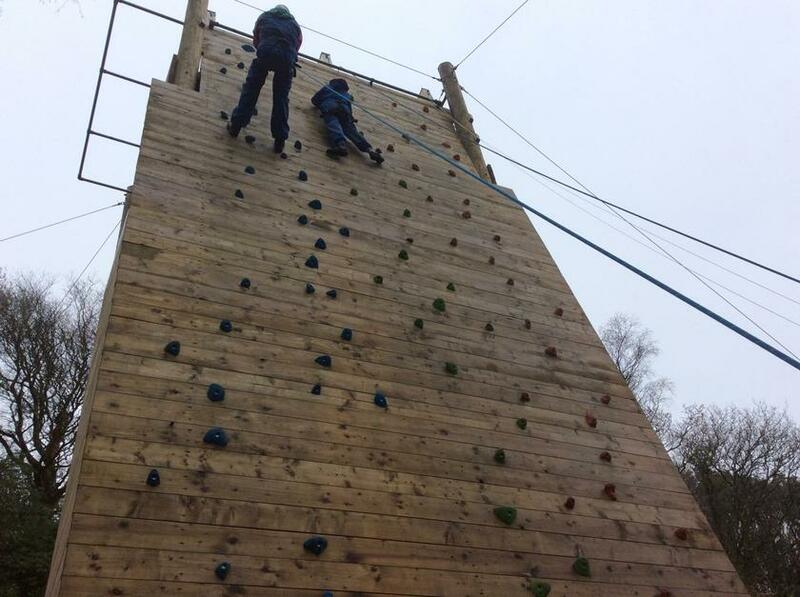 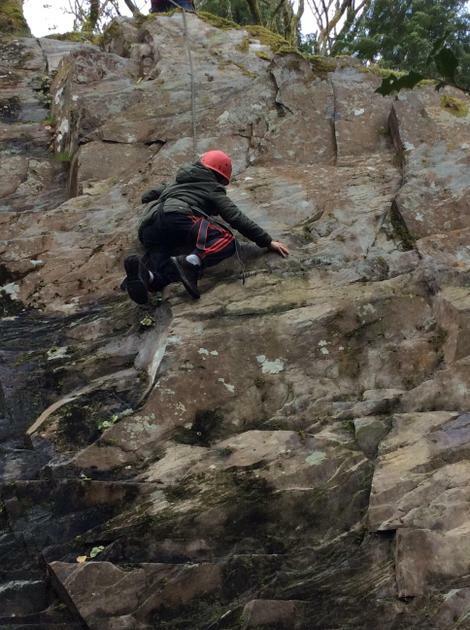 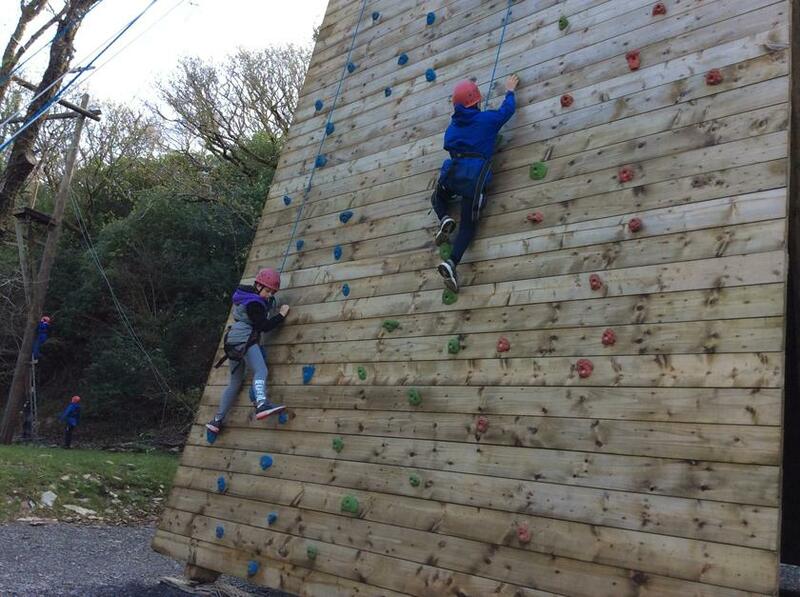 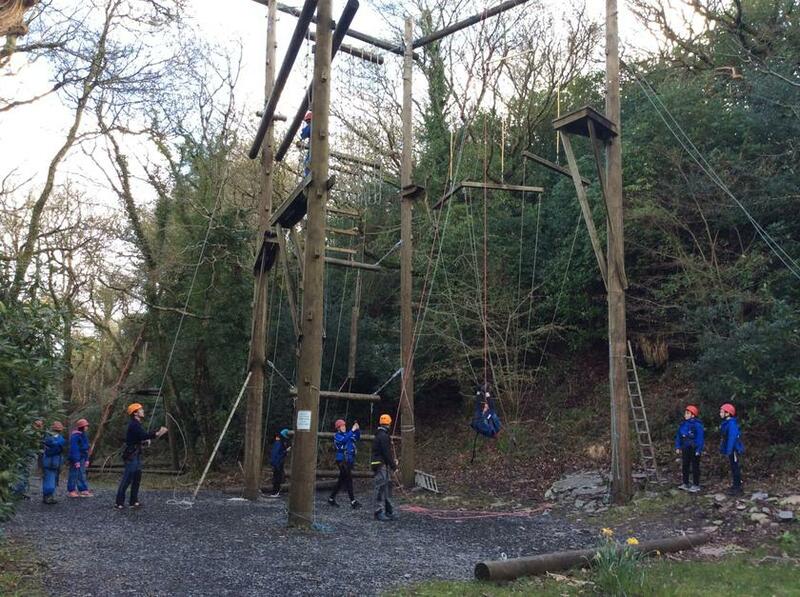 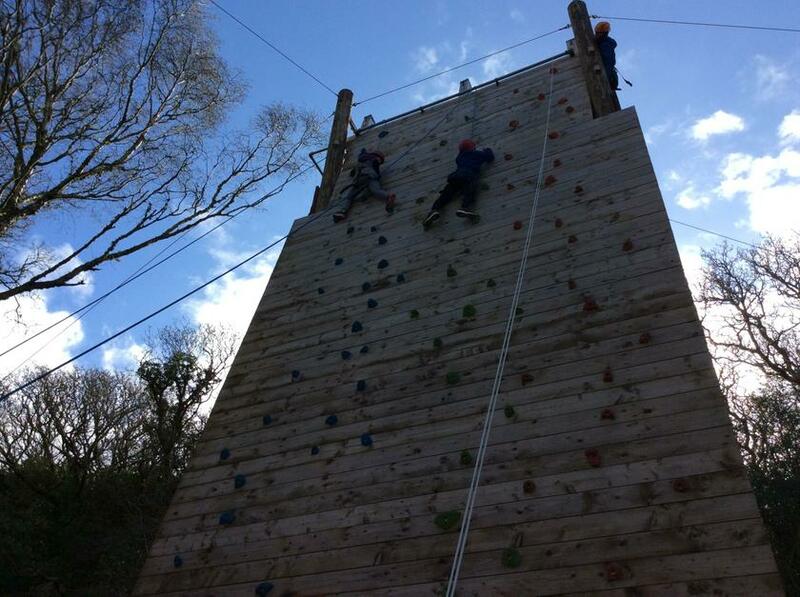 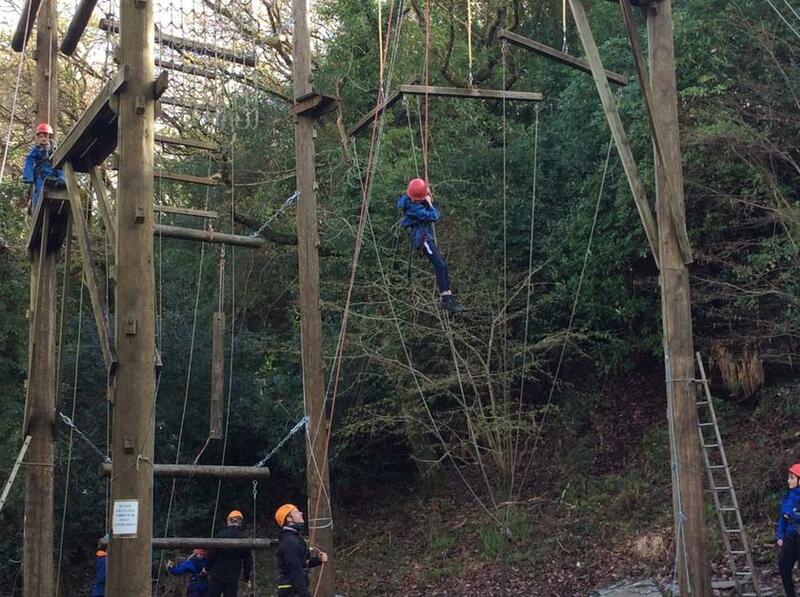 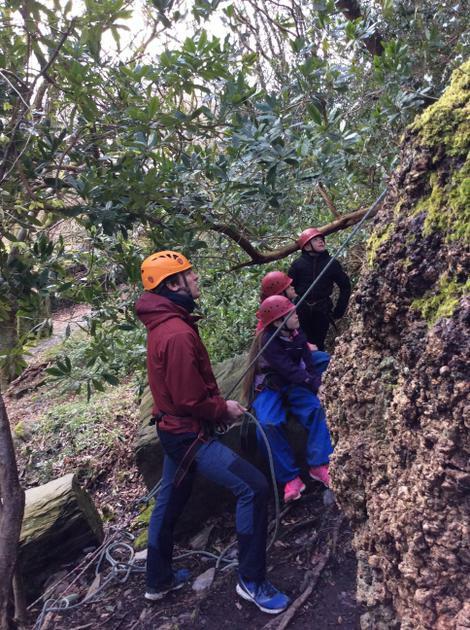 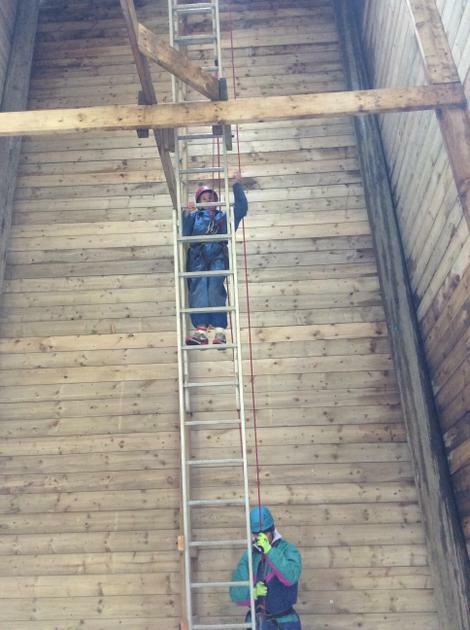 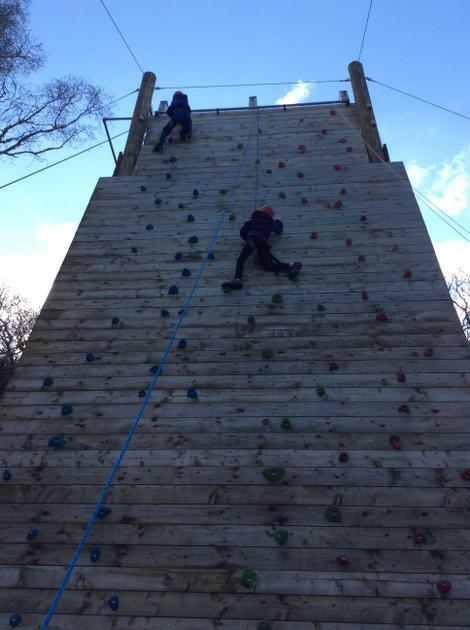 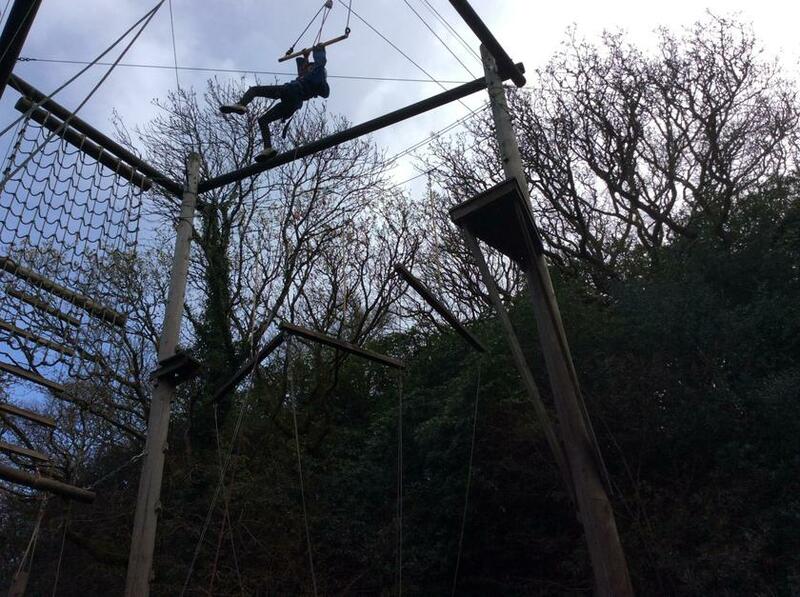 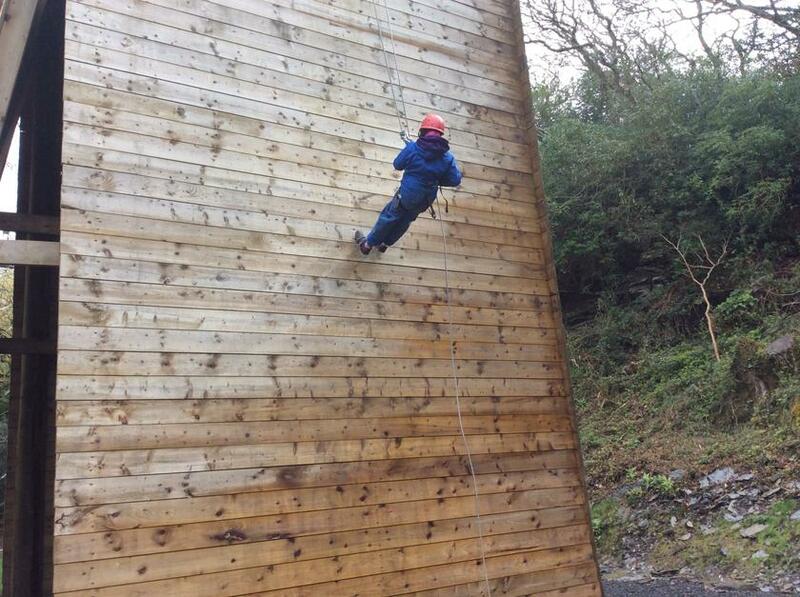 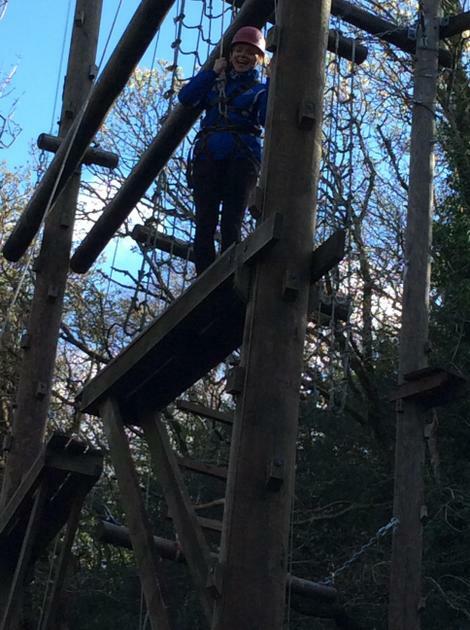 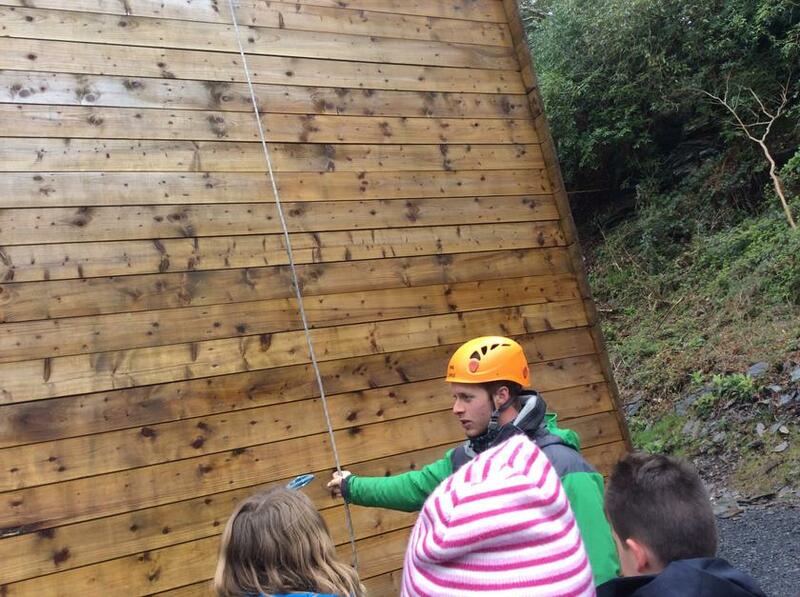 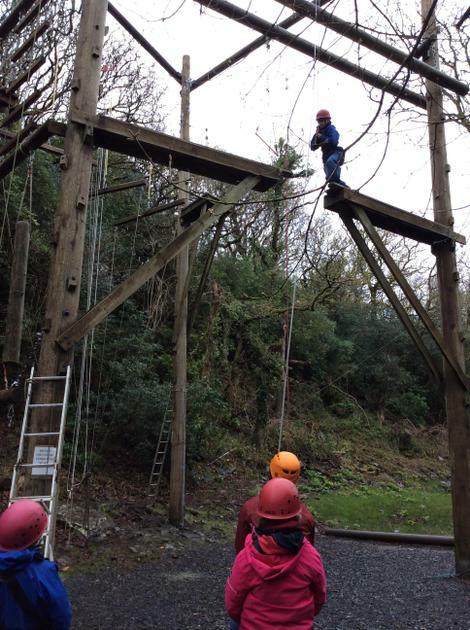 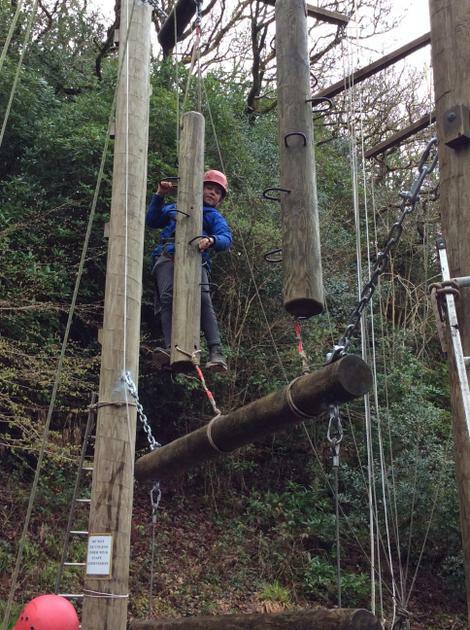 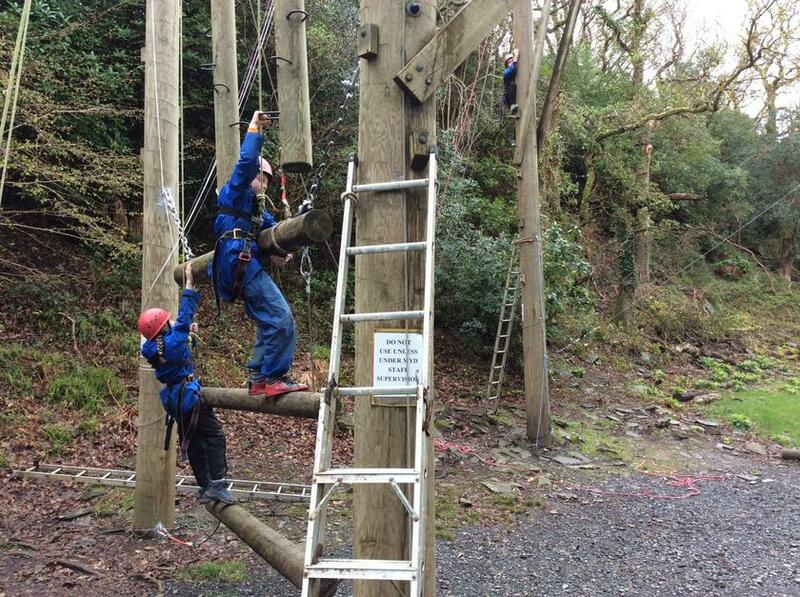 It is wonderful to see pupils trying their best to overcome their fears and push through difficult times. 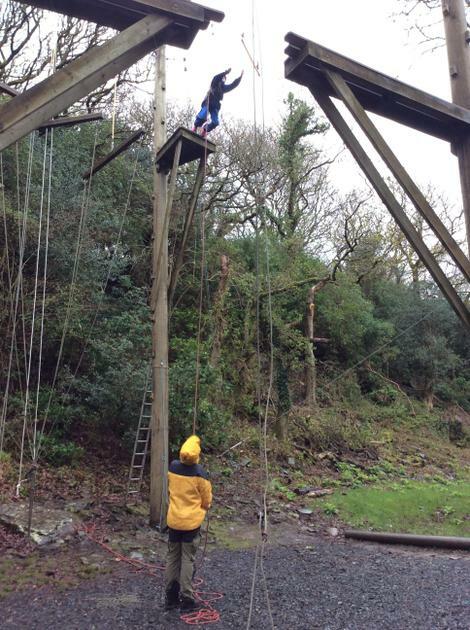 It was cold and wet today which added to the challenges faced. 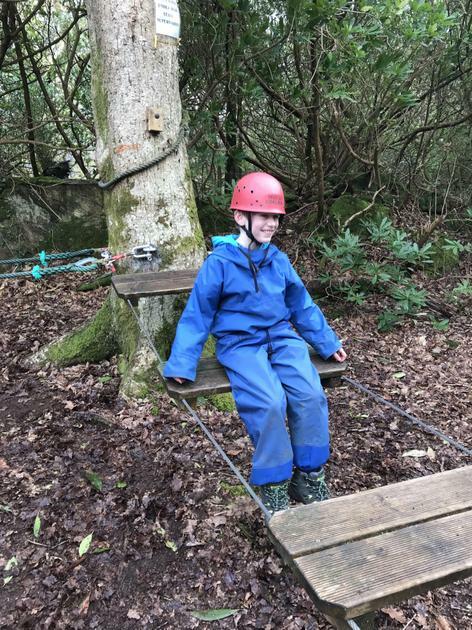 An incredible experience for all. 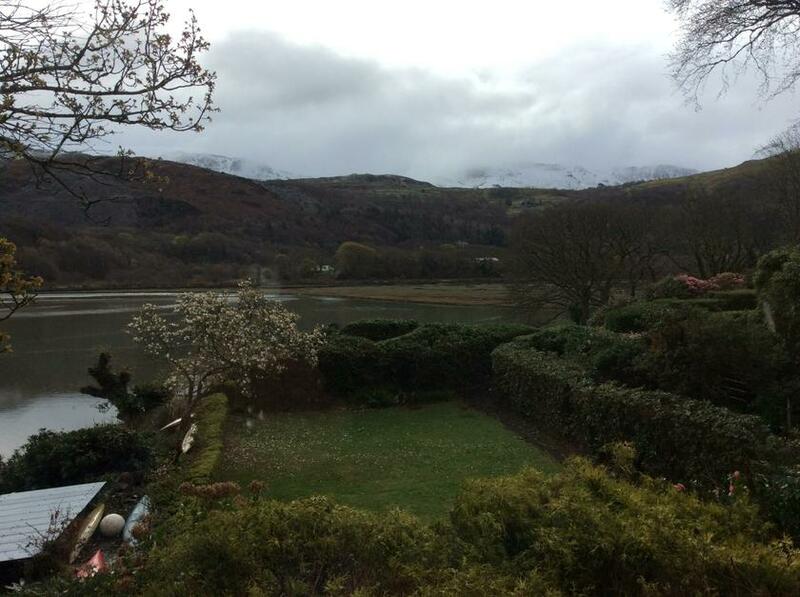 Snow on them thar hills ! 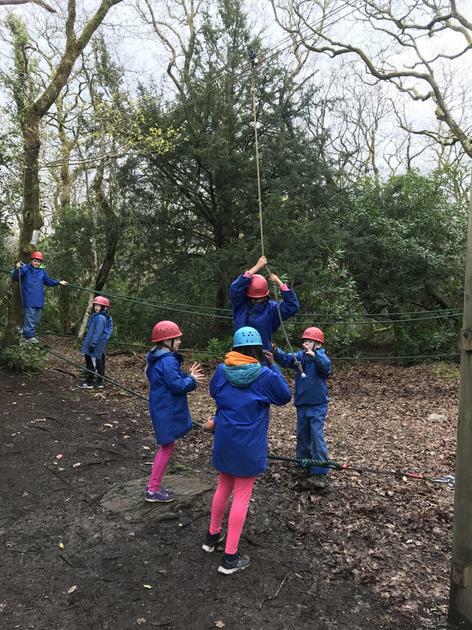 Rested, rooms tidied, tummies full and off we set for another action packed day. 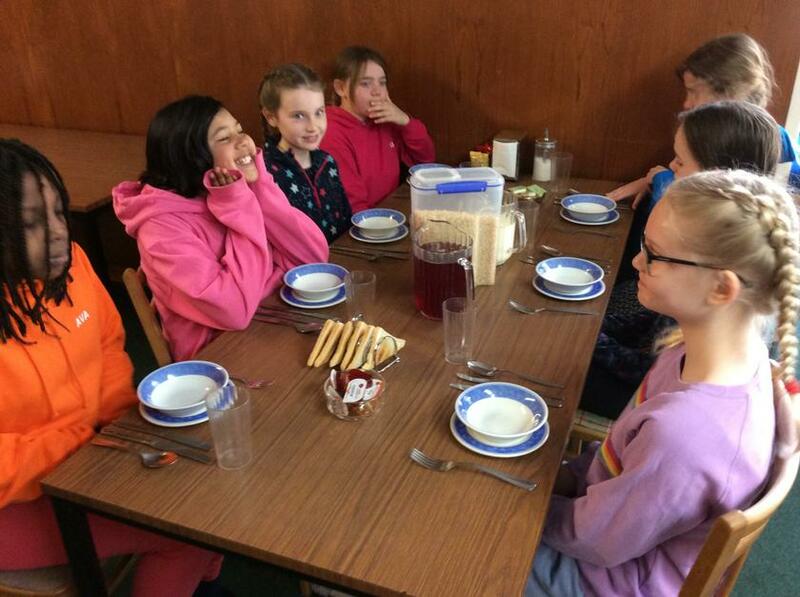 As we gather together at lunch we share our stories of the challenges we have each faced. 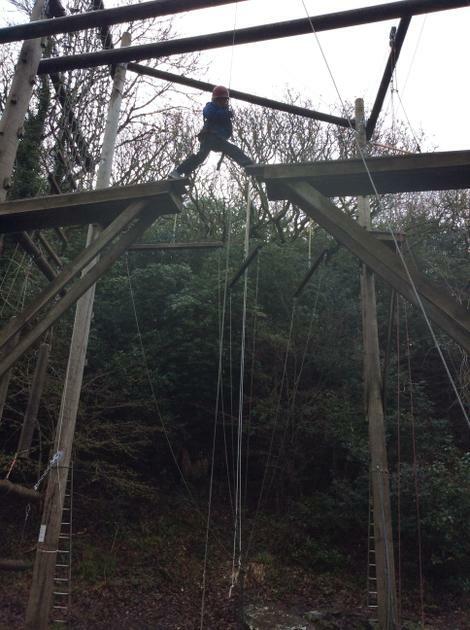 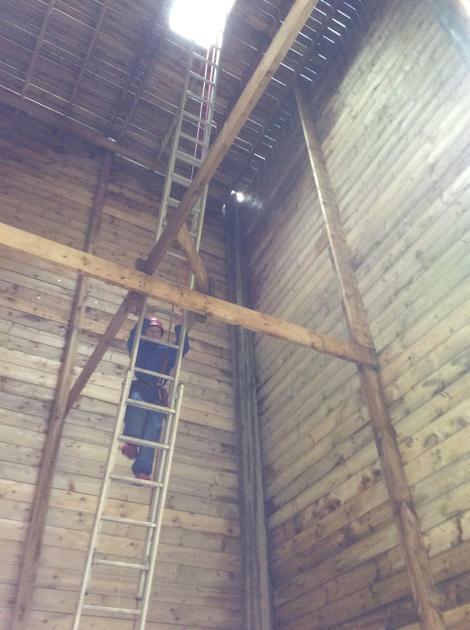 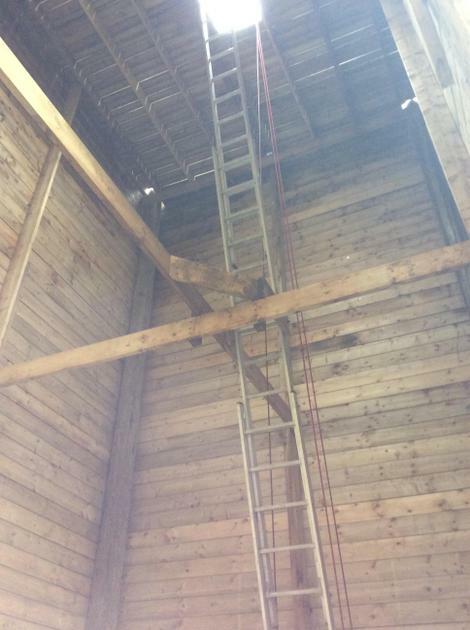 It’s hard to explain but these are big activities, scary activities often involving huge heights and determination. 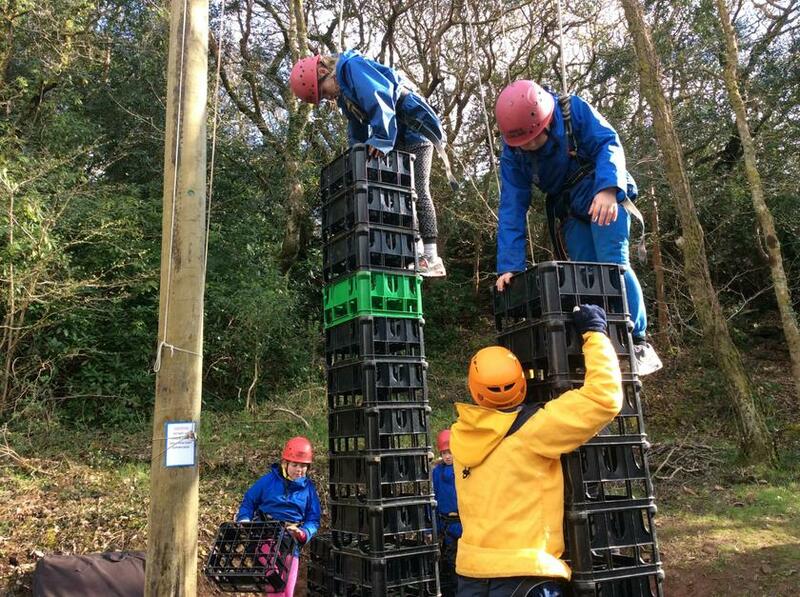 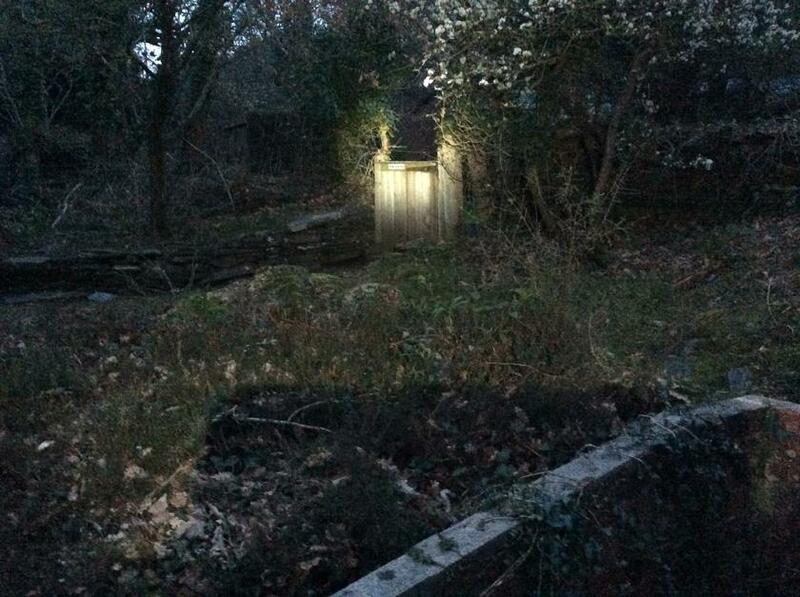 The photographs only capture the essence not the true scale and enormity of what the children have participated in. 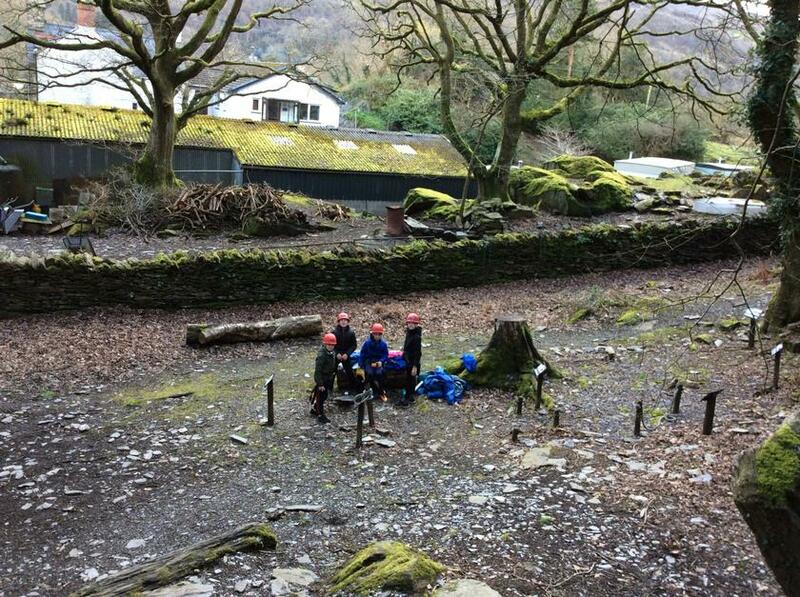 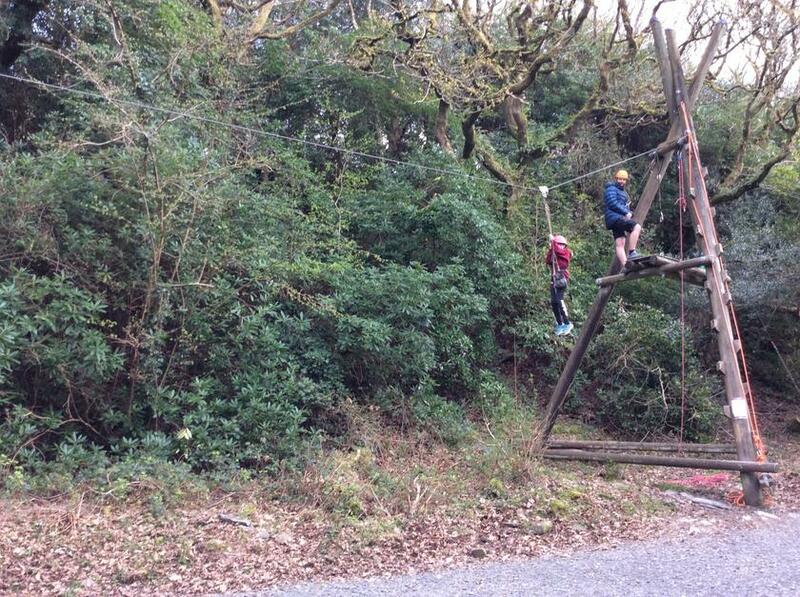 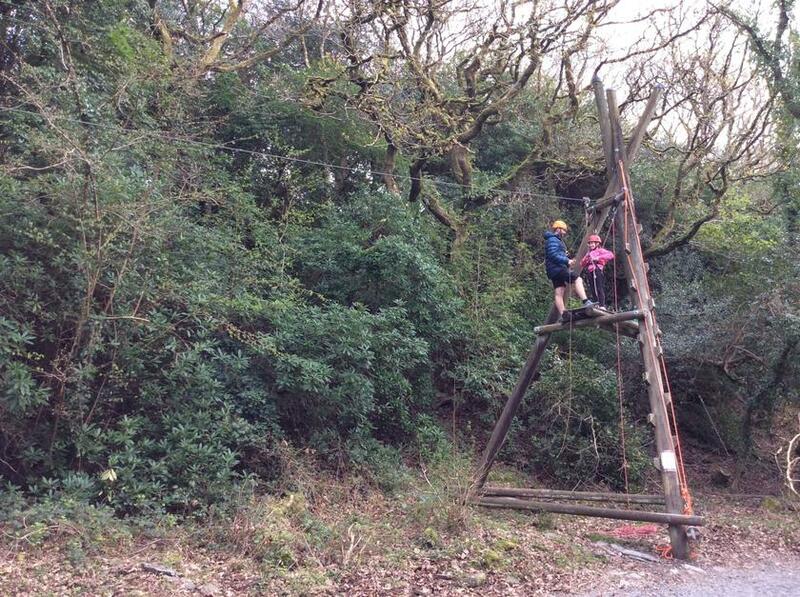 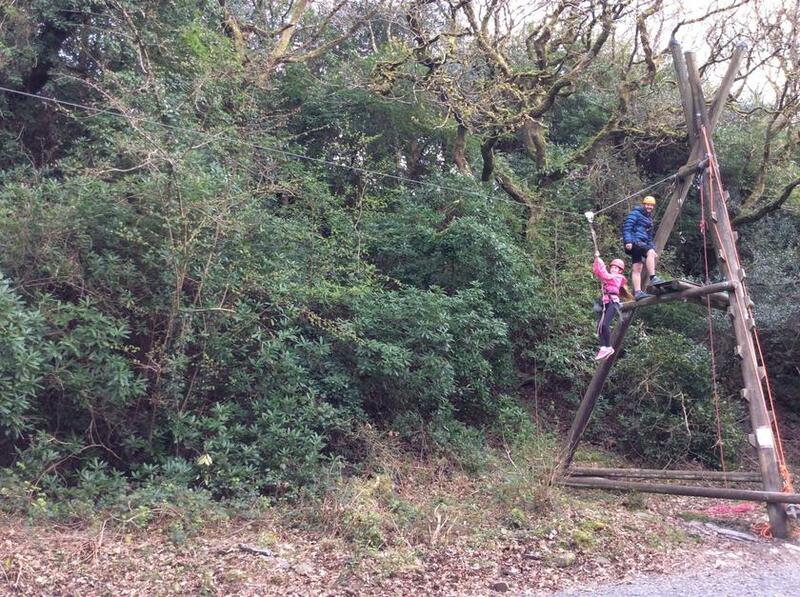 As the afternoon progresses there is a realisation of just how much activity the children have been involved in. 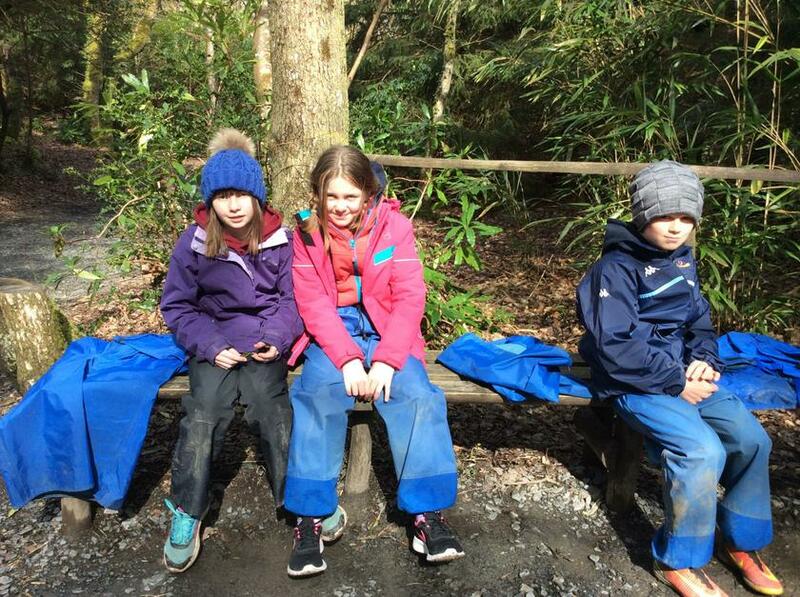 Very little sitting around, no phones or mobile technology, norT.V. 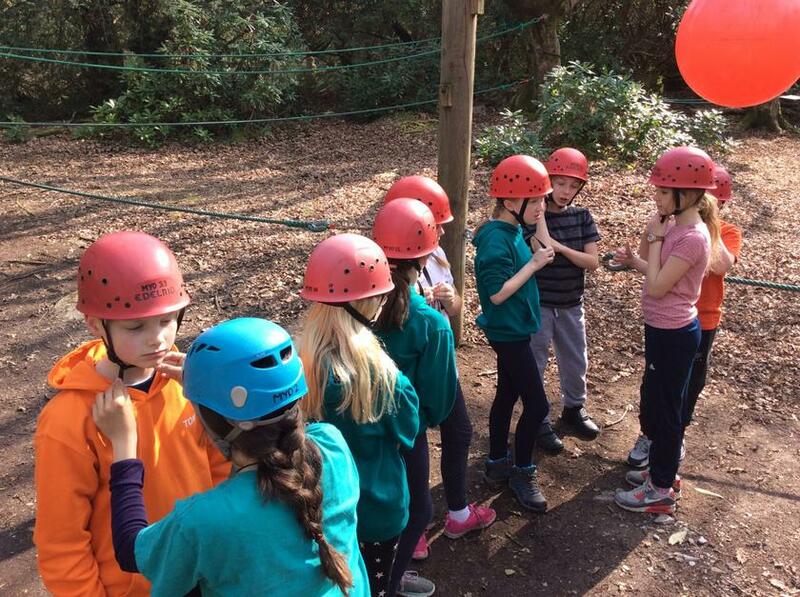 But instead moving and organising themselves to be involved and prepared for their next challenge. 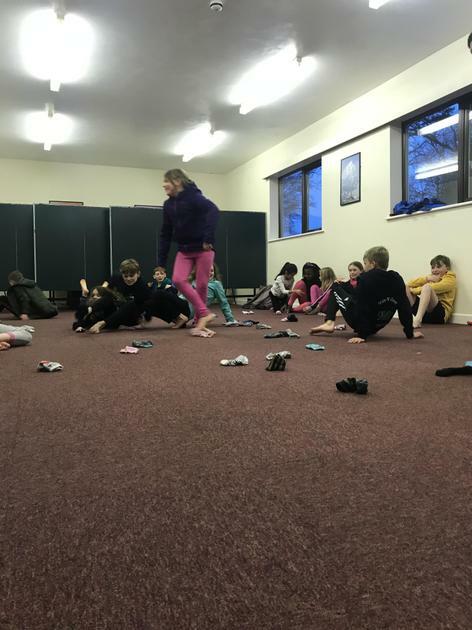 After our evening game we began the process of gathering our belongings. 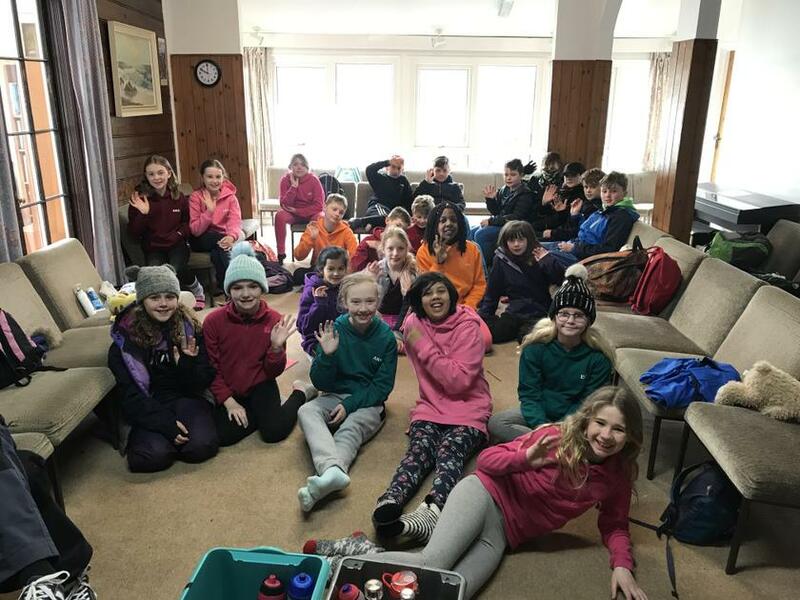 From the dirty socks, to the wet hoodies it all had to be sorted in readiness for our final morning and departure tomorrow. 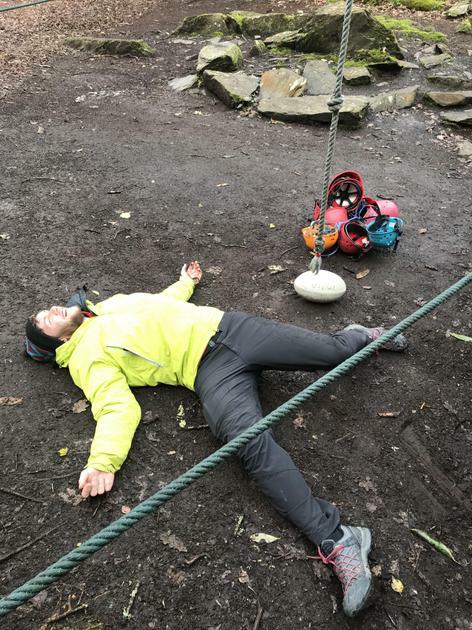 All good things come to an end. 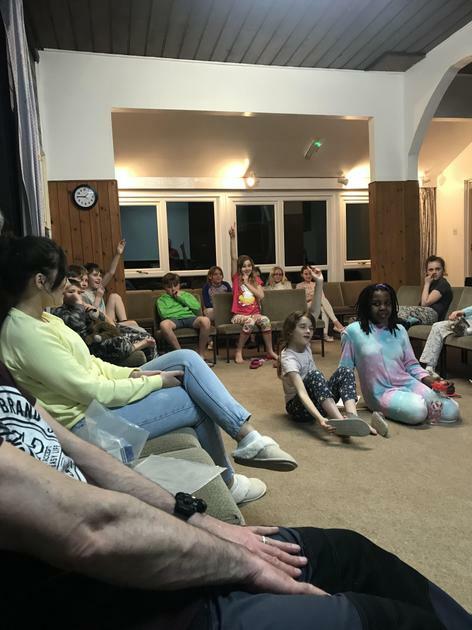 This week as been an incredible journey of organisation, physical and mental challenges, time away from family and also time in close proximity with others having to share space and time with others. 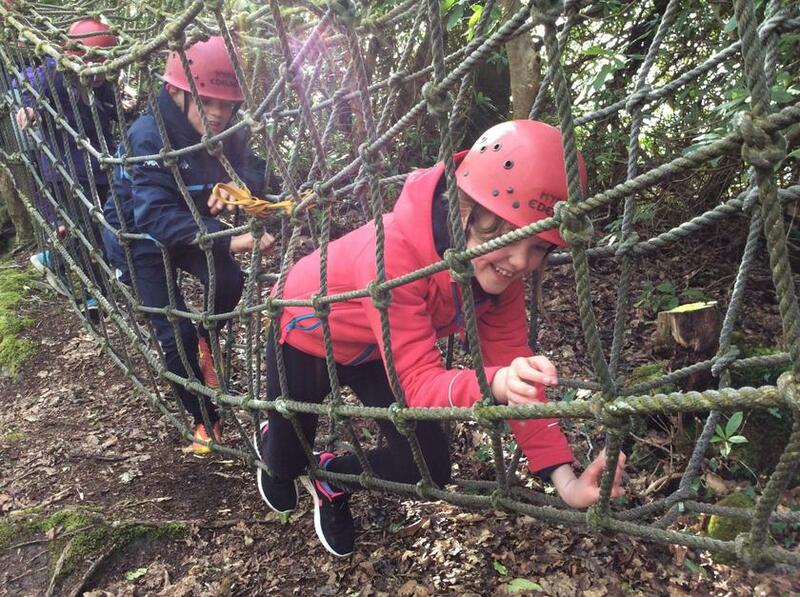 Each and every child has grown immensely in confidence, resilience and determination. 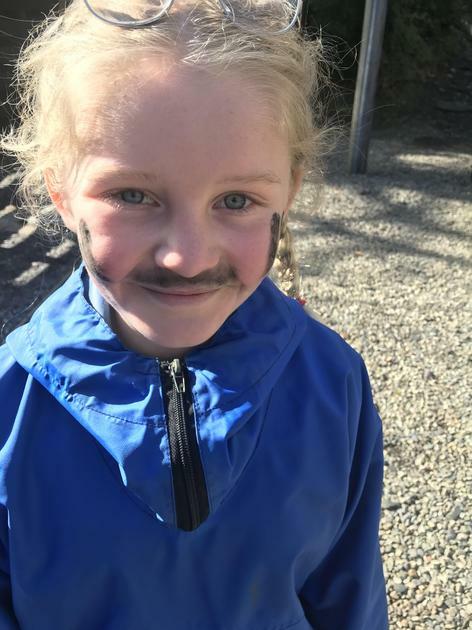 We are all so proud of you and who you have become. 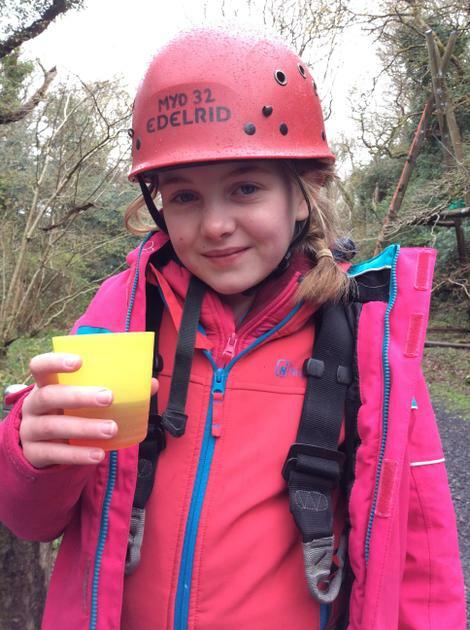 Thank you for making our week so memorable and such fun. 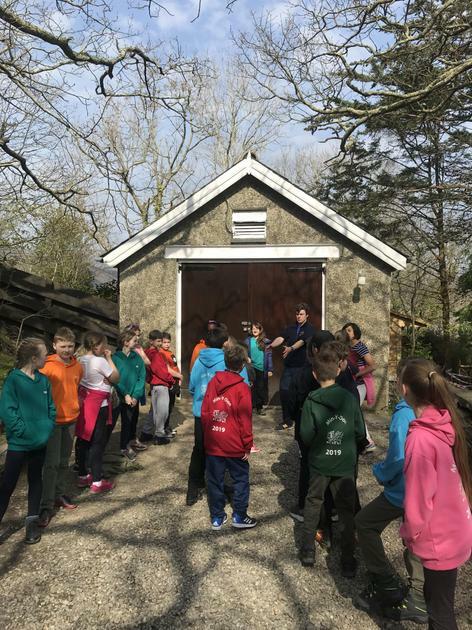 Time for our final activity, pack up and departure. 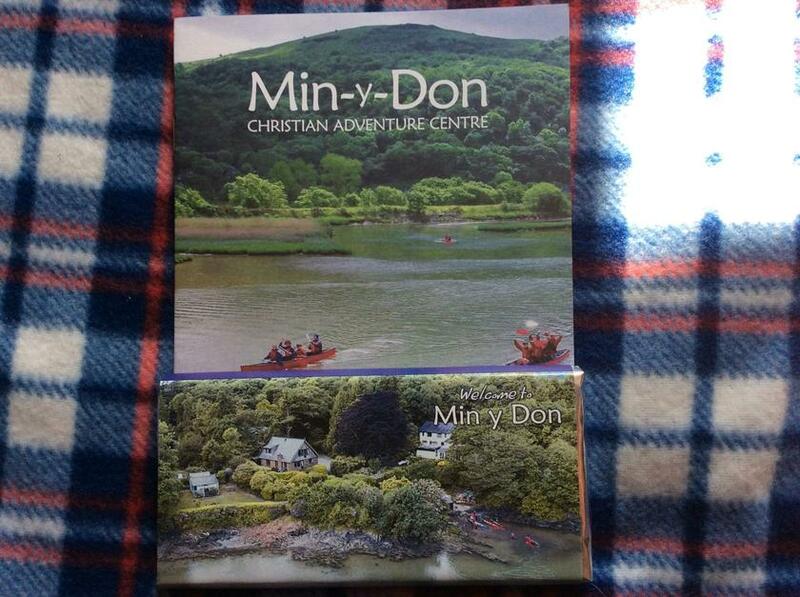 Not sure what to expect at Min-Y-Don - Watch this! 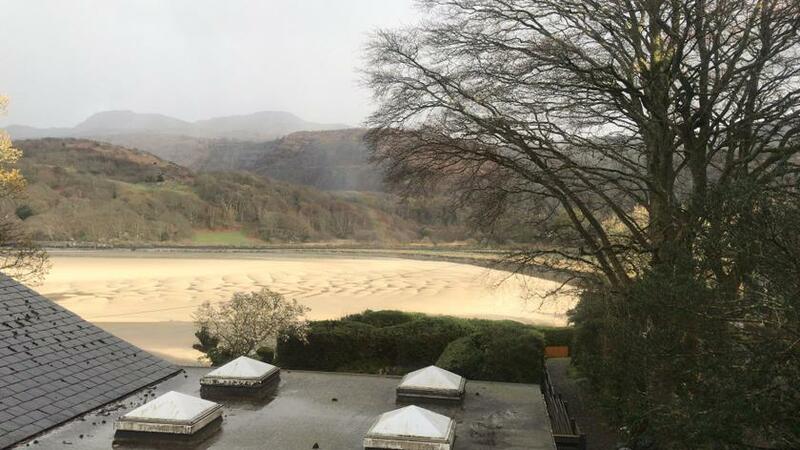 Min-Y-Don Website Please visit the Min-Y-Don website to see just how great this place is!